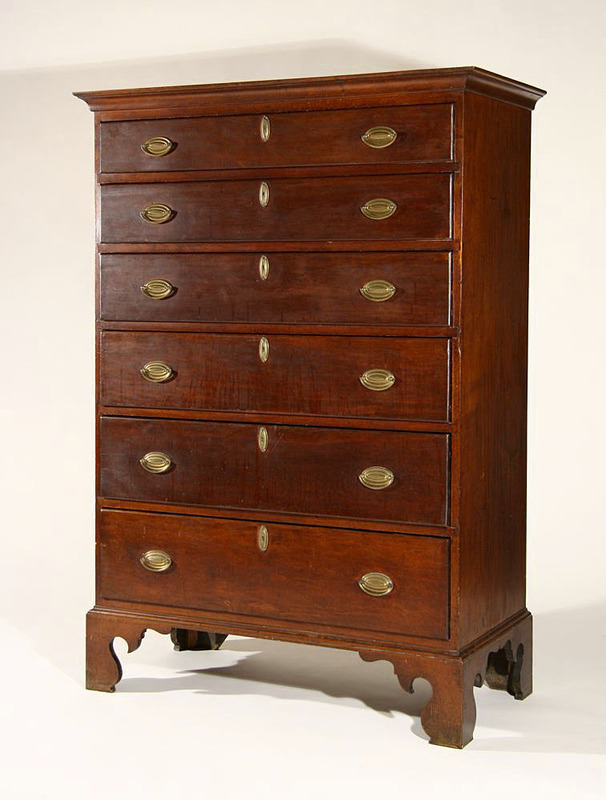 A very fine Hudson Valley kast, probably Ulster or Albany Counties, made of gumwood, wih pine secondary, c.1740-50. 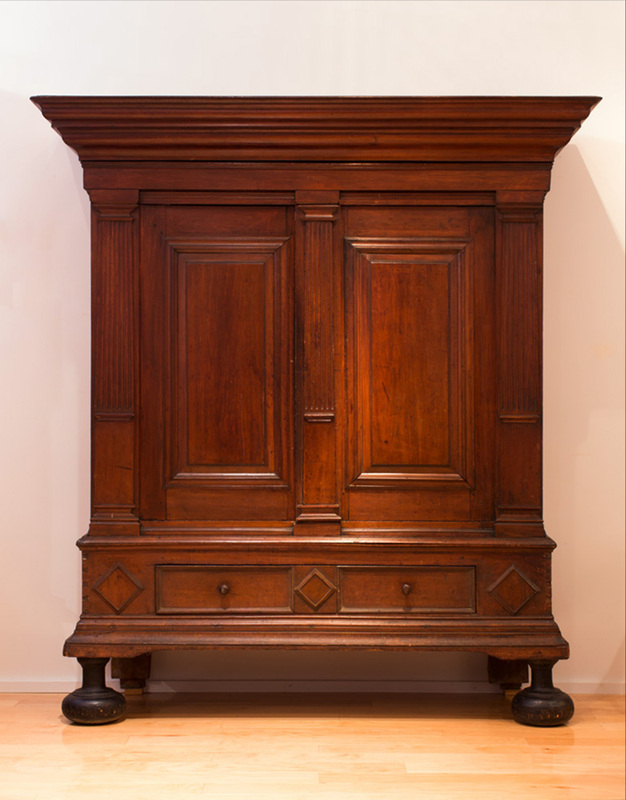 With widely-projecting cornice, paneled doors, fluted columns (the center one sliding to reveal the lock), a side-hung drawer with original wooden knobs, and large flattened ball feet, this well-proportioned kast even appears to retain its original finish. 69" wide, 77" in ht., the case depth is 18", and the cornice depth 24". 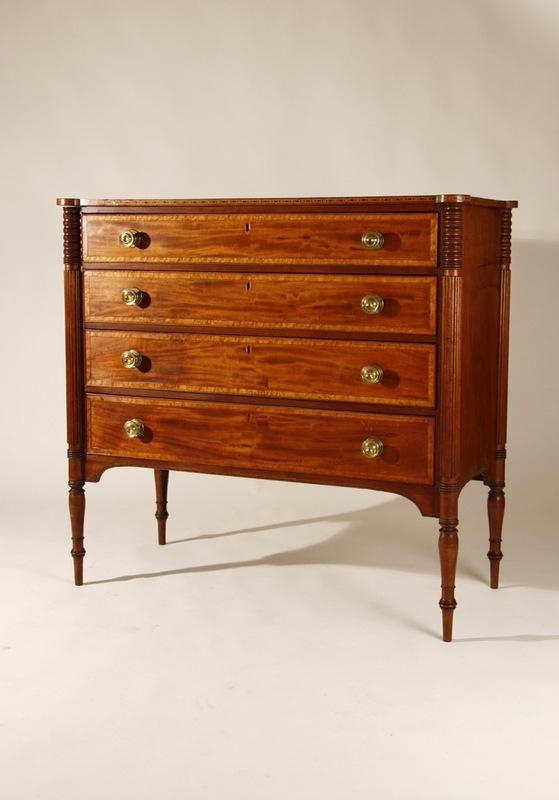 A country Queen Anne chest on frame with crisply carved and molded cabriole legs ending in 'hocked' ankles and pad feet. 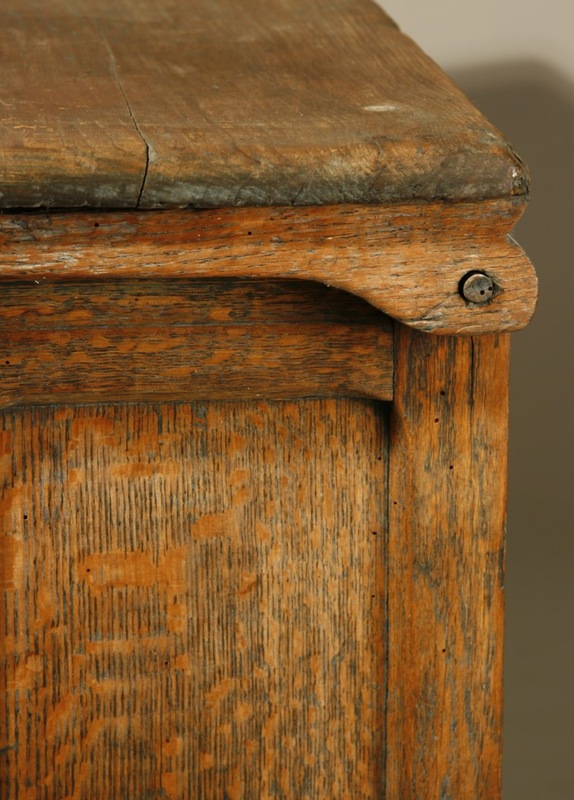 Maple, in remains of its original stain surface and retaining its original brasses. Maple and pine, southern NH origin, c.1760-70. 38 1/2" case width, 53 1/2" ht. Descended in the Hunneman family of Boston and in their summer home on Little Deer Isle, ME for generations. Despite its nearly flawless condition-surface and brasses—the backboards were replaced at some point with plywood. 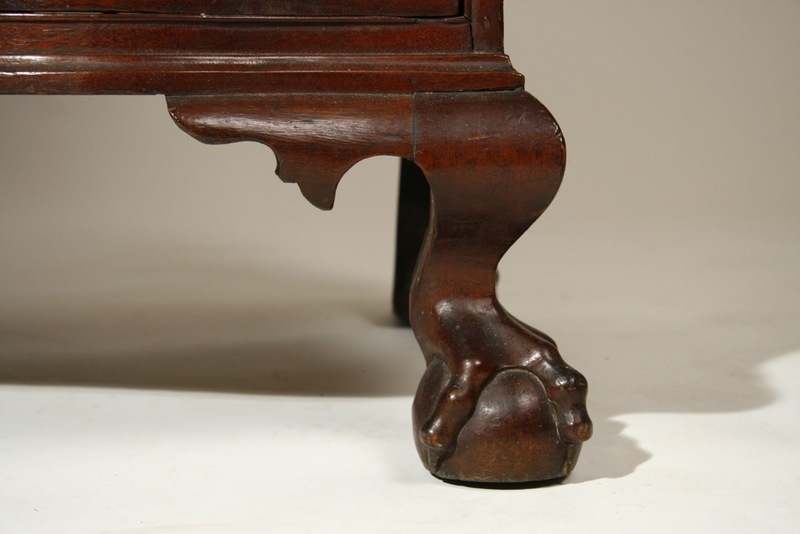 A remarkable William and Mary chest on frame with huge, collared Spanish feet. 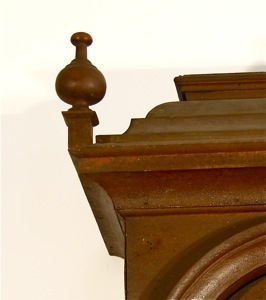 With applied molding under the top and double-arch molding on the case, and with a scrolled skirt, this rural piece is probably unique. 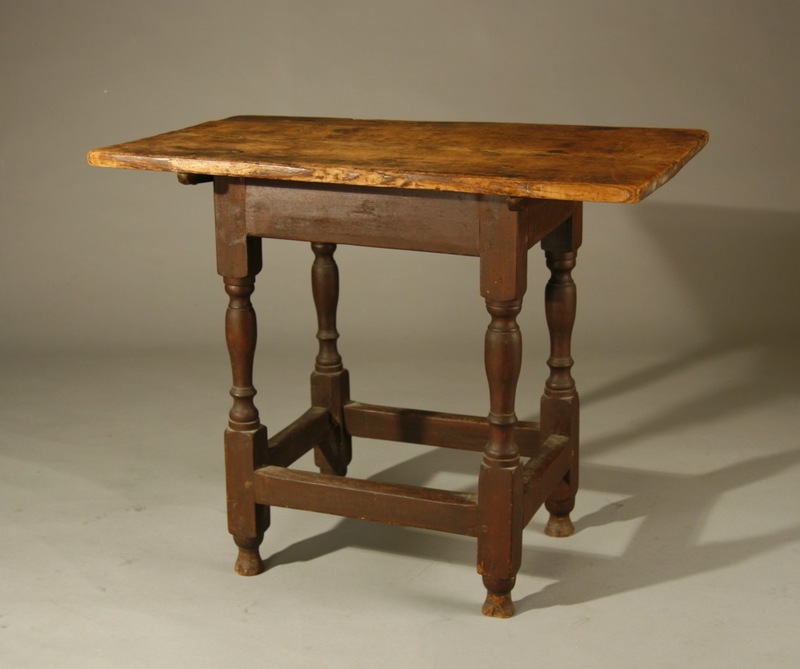 Made of hard and soft pine, with chestnut rear legs and maple front legs, it retains a dark old crackled shellac finish showing traces of its deep original red paint. Its unusual form is matched by its interior construction, with unusual framing and drawer construction. Probably central or eastern CT, c.1730-40. 36 1/2" case width. 45" tall. 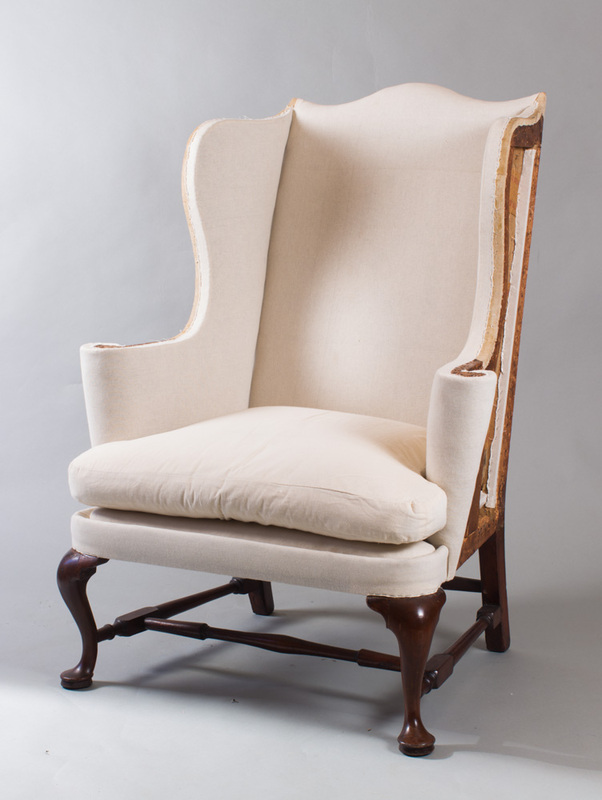 A very fine Queen Anne wing chair with scrolled crest and wings, flaring 'cone-shaped' arm supports, block, vase and ring turned stretchers, and with beautifully modeled cabriole legs on full pad feet. Mahogany, with maple secondary wood. Boston, c.1750-60. The left (facing) front foot was broken at the ankle and has been properly repaired. 47 1/2" ht, 18" seat ht. 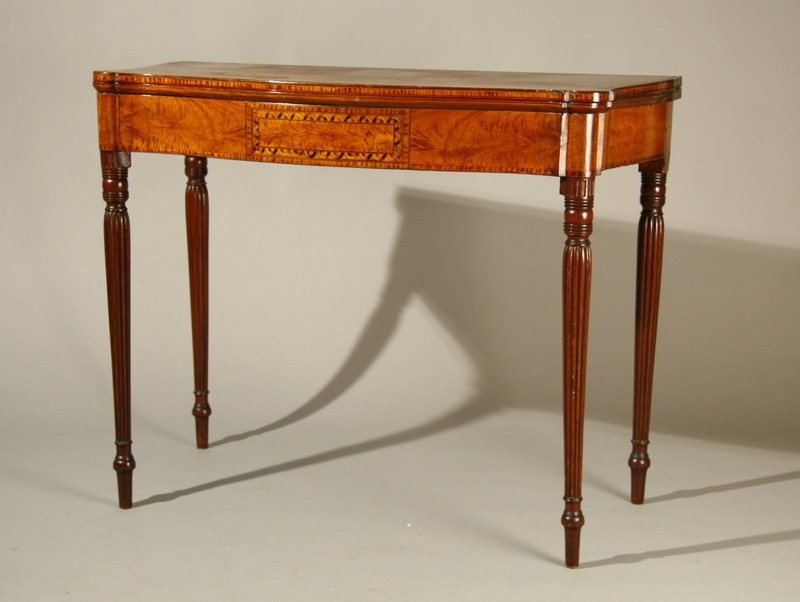 An exceptional Queen Anne dressing table made of walnut, in a small size, perfectly proportioned, and with rare mariner's star inlay centering the top. 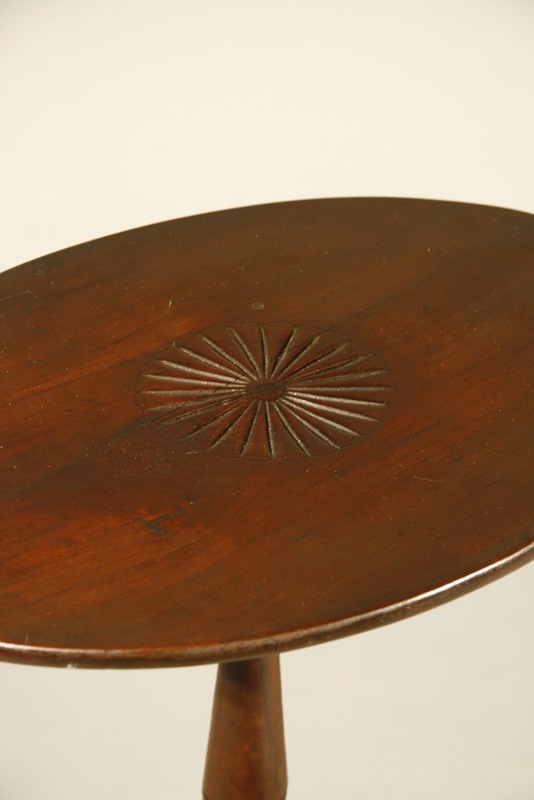 There are inlaid compass points at the corners and the top is banded with a triple inlay around the edge. The three drawers are banded with veneer and the case is centered by a deeply-scooped, inlaid fan. 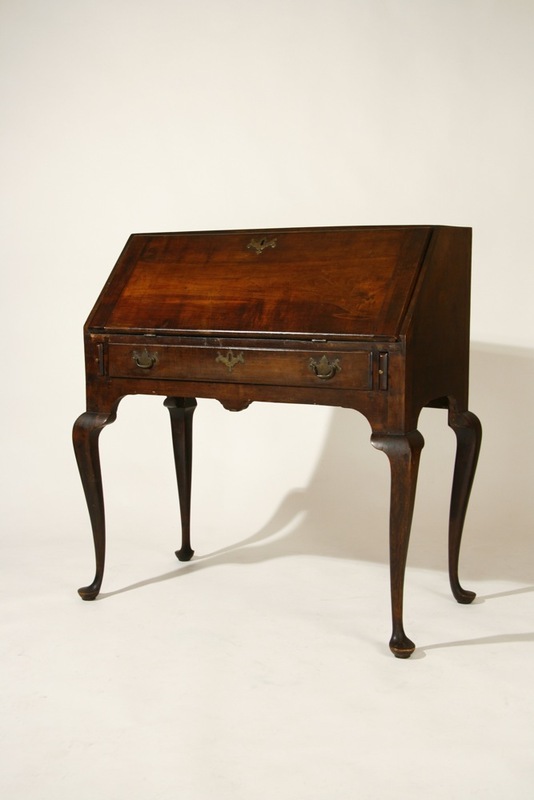 There are perhaps a half dozen of these dressing tables known, thought to have been made around Boston, c.1735. Examples are in the Museum of Fine Arts, Boston, Winterthur, the Metropolitan Museum in New York City, and Bayou Bend in Houston. Case 28" x 17 1/2", top 33" x 21", 30" ht. 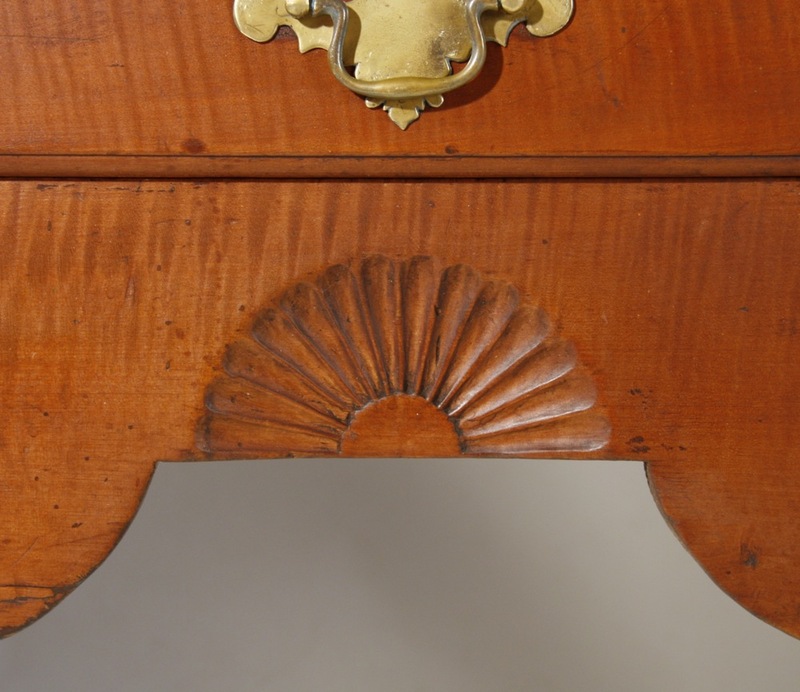 This dressing table descended in the Milliken family of Duxbury, MA. 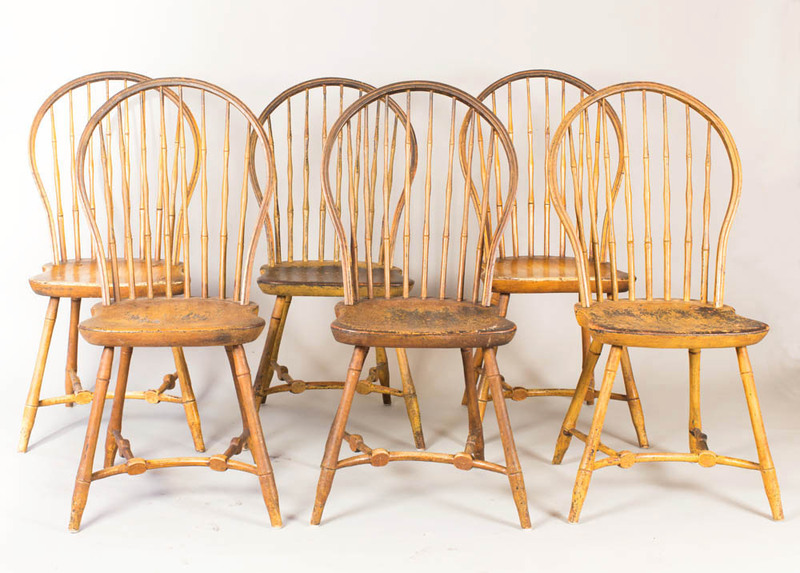 A rare set of six bowback windsors with sharply-creased bows, turned and swelled spindles, and with complex side and medial 'yoke' stretcher arrangement. In original, 'as descended' condition with a discolored old varnish over old yellow over black and red paint. Attributed to Seaver and Frost, Boston, 1790-1810. 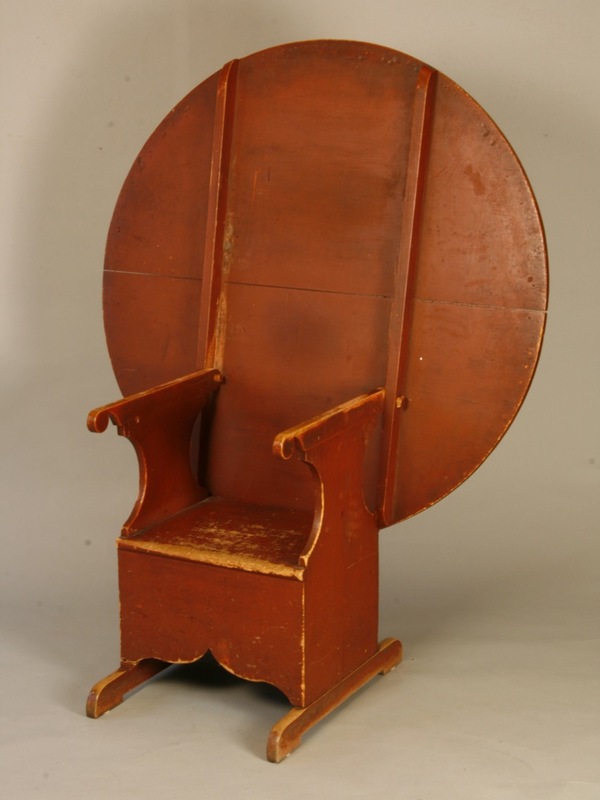 A similar chair is pictured in Santore, Vol I & II, p.137. 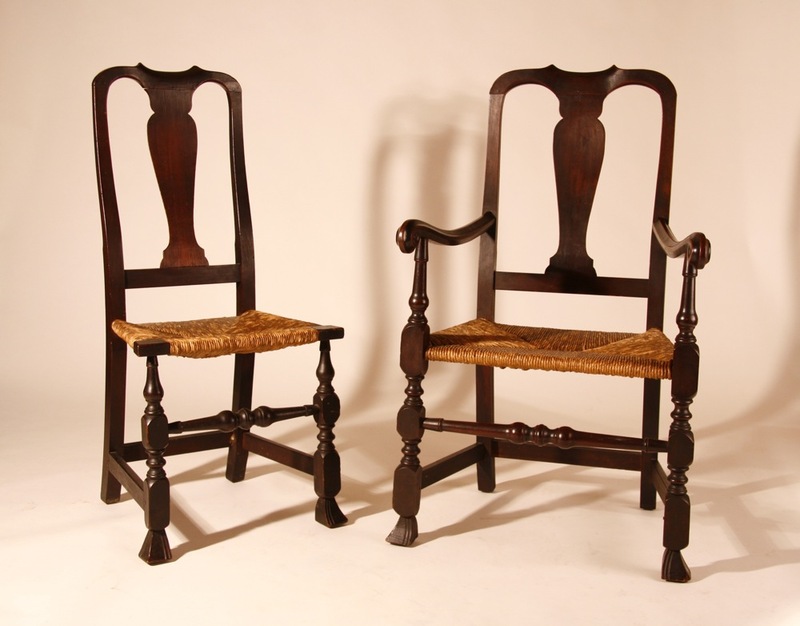 This set of chairs descended directly in the Channing Howe family of Duxbury, MA. 39 1/2" ht, 18 1/2" seat ht. 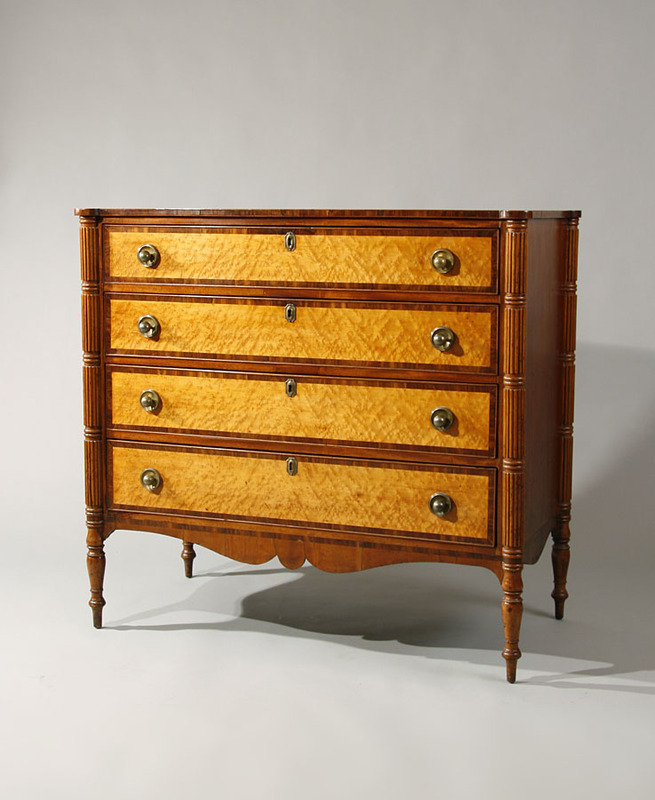 A very fine Federal bowfront chest made of mahogany, with mahogany veneers and pine secondary wood. 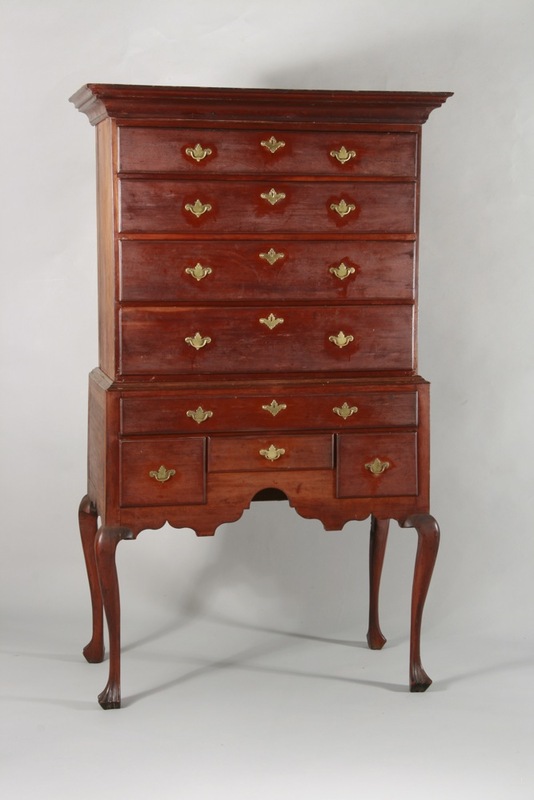 The front of the top is inlaid with rosewood and the four graduated drawers are line inlaid with invected corners. The coved base molding supports four oversized ball and claw feet. Exceptional, 'as descended' surface and retaining its original fire-gilt brasses. 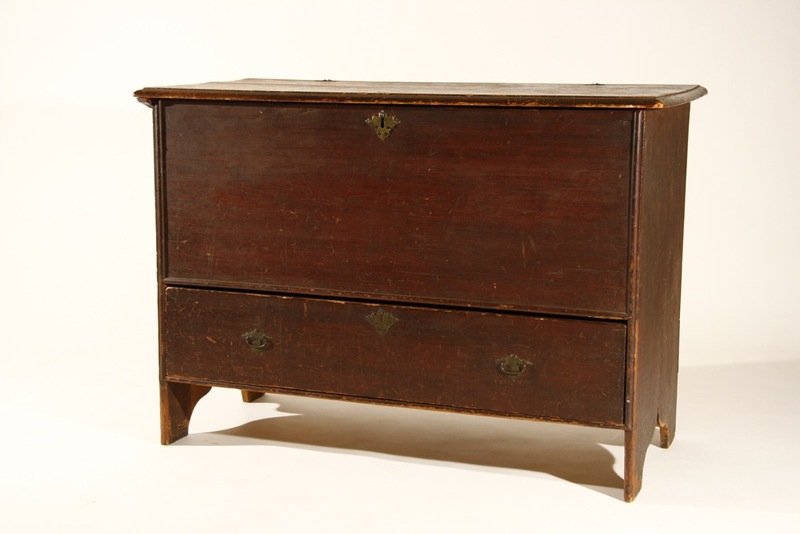 Other than turning over the drawer runners, the chest is in completely original condition. Salem or Boston, c.1785. 39 1/2" case, 34" ht, 17" case depth. 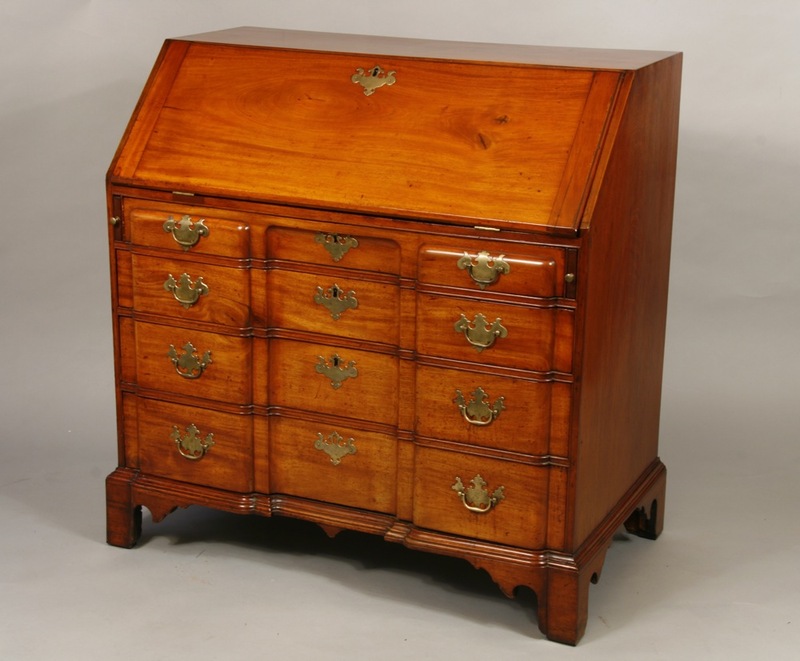 An exceptional Sheraton Period desk and bookcase made for the Penniman family of New Braintree, MA. Mahogany, with mahogany veneers and pine secondary wood. Probably made in Salem, c.1815-20. In an old dry surface retaining its original red wash throughout the interior. 72" long, 96" to tip of central finial. A very fine example of one of the schools of decoration found on works from the northeastern corner of Schoharie County and Albany County in New York State, c.1810-35. These chests feature a central urn filled with flowers, sometimes initialed- as this example is "AMH"-and with handles, which allow the urn to hold a larger bouquet of flowers. The front panel is also decorated with a vine and floral border and has large flowers painted at each corner. The paint is vibrant and multi-colored, and the decoration is exceptional. Made of pine throughout, it measures 43" x 18 1/2", and is 21" in height. 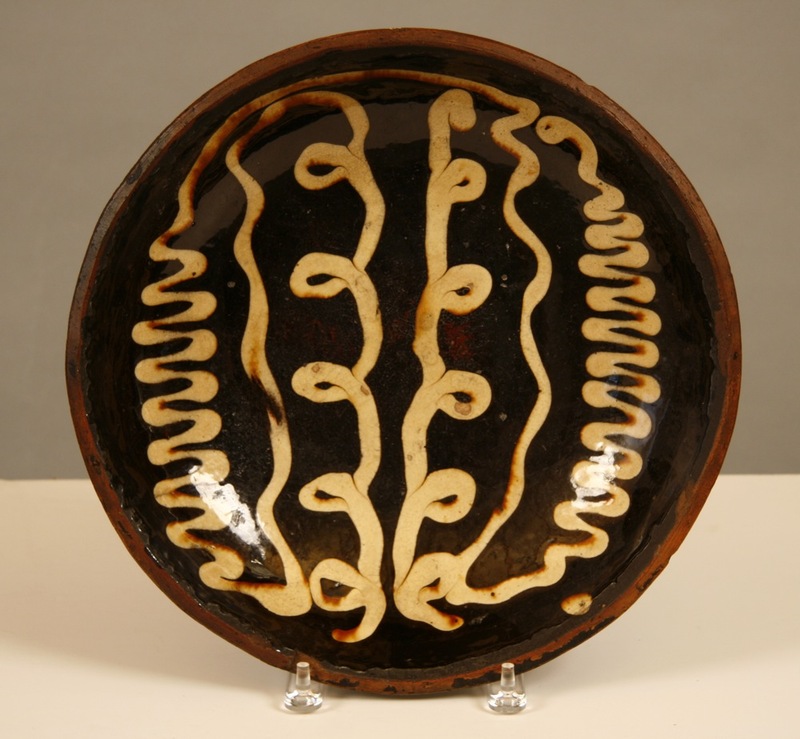 Provenance includes the New York State family in which it descended, Richard Rasso, Courcier and Wilkins, and David Schorsch and Eileen Smiles. A conservation report is also available. 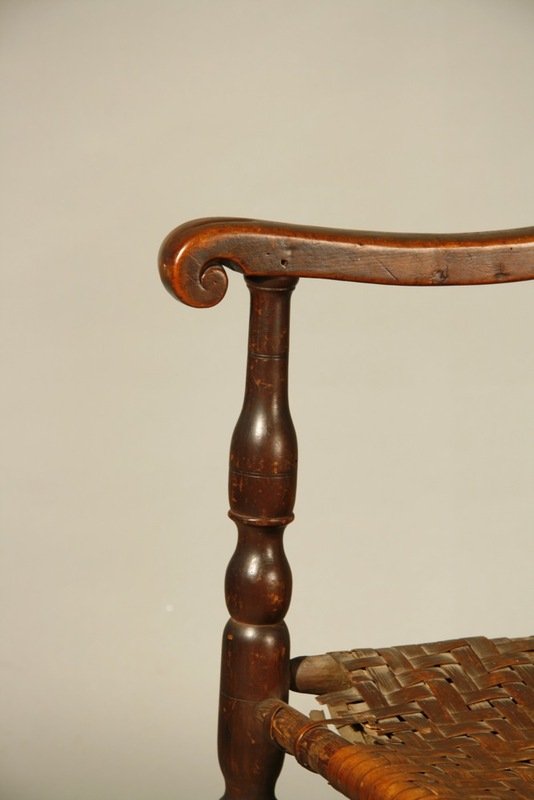 A very fine William and Mary banister-backed armchair with particularly fine crest and turnings, rolled arms, a great original deep red/brown surface-and retaining its original splint seat. Maple throughout, probably CT, mid 18th century. 49" tall, with a 17" seat ht. There is a small old repair to the inside of one arm at the front post. 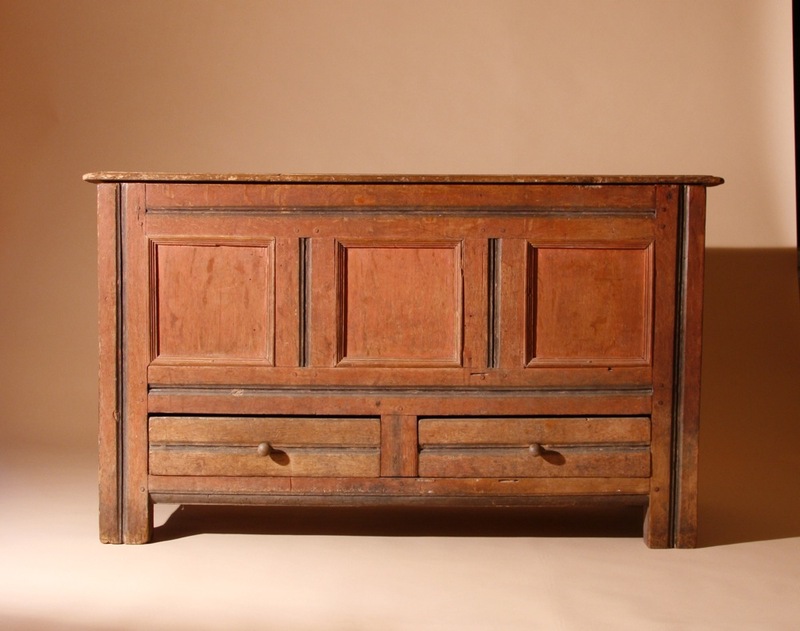 A rare and unusual two drawer blanket chest on frame. 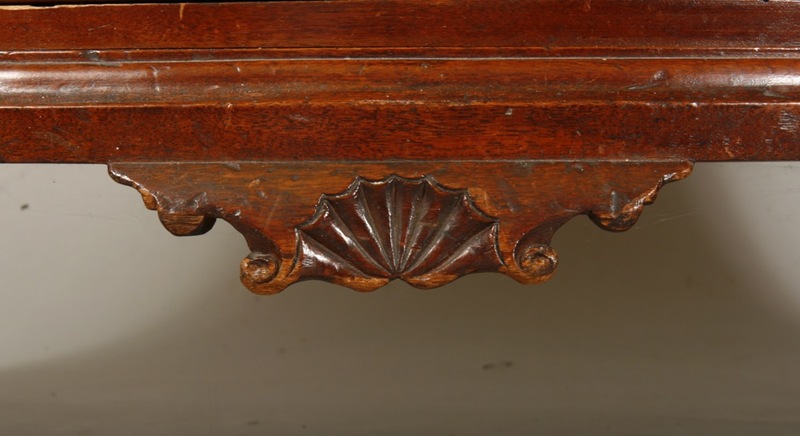 The base moldings and four turned feet are made as a separate piece, the side moldings are deeply channeled and and the sides are set into those channels and toe-nailed with roseheaded nails. Maple and yellow pine, with original moldings and cotter pin hinges, and with period brasses set in the original (and only) holes. Probably CT, c.1730-40. 34 1/2" case width, 42 1/4" ht. A very rare Hepplewhite style 'harvest' table with one board top and one board leaf-each with mortised and tenoned breadboard ends, and with tapered legs with a beaded edge. The two legs on the leaf side swing out to support it when open. The base is grain-painted over an original gray, and the top is in an old brown paint showing much use. 83 3/4" long, 28 3/4" in ht. The top board is 24" wide and the leaf is 20" wide. It sits eight comfortably. 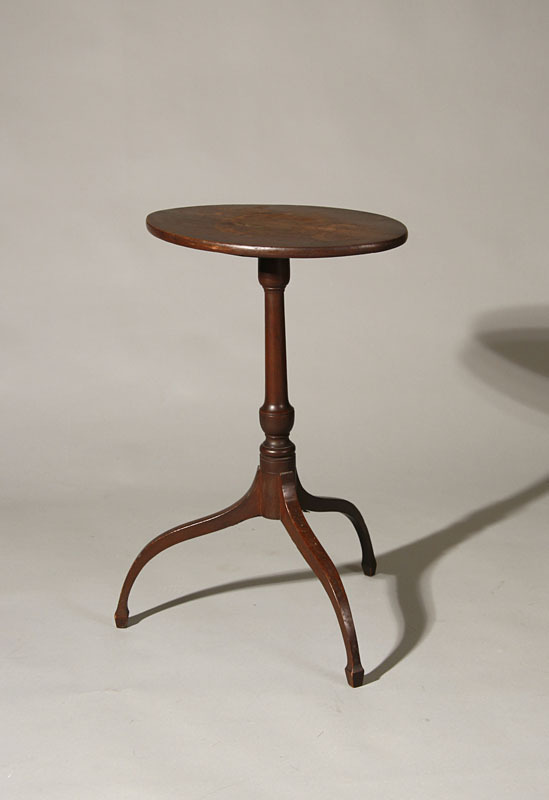 Pine top and leaf, with birch or maple frame and legs. Probably Maine or NH, c.1800-1810. 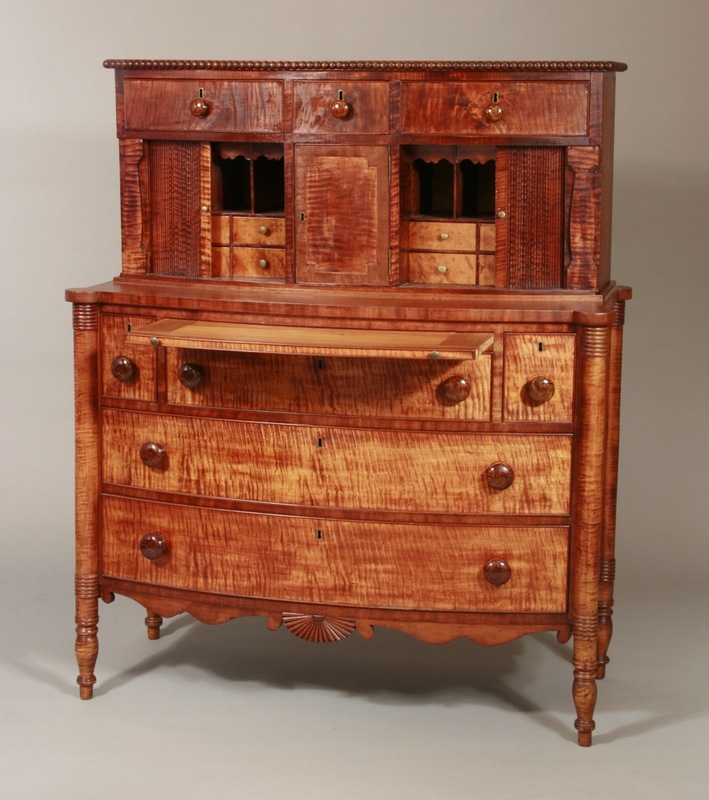 A very fine country Queen Anne slant front desk in strong tiger maple, with delicate cabriole legs, center drop and shell-carved central drawers — in an unusual tapering pattern. Fine old color and retaining most of its original large brasses. Well-used and showing various signs of age, but with no repair except hinges and lower edge to drawer sides. Only 36" wide with a 31" writing ht. Southeastern NH or northcoastal MA, c.1760. 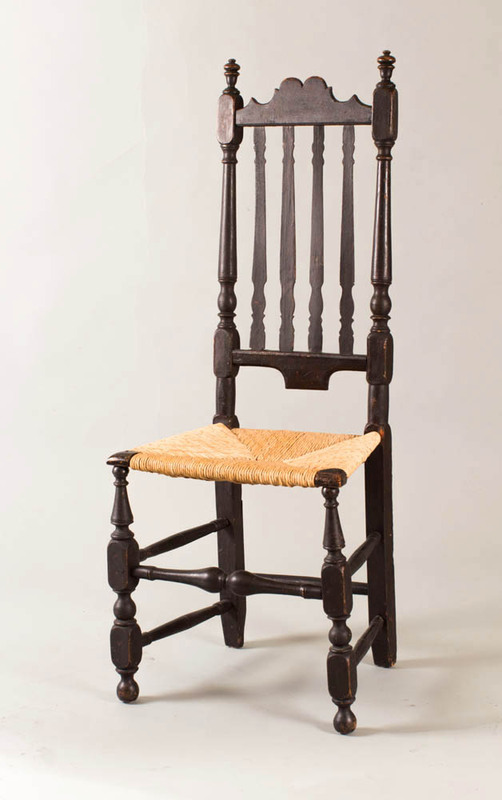 A William and Mary banister back sidechair with double tombstone crest, turned banisters and fine trumpet-turned front legs. 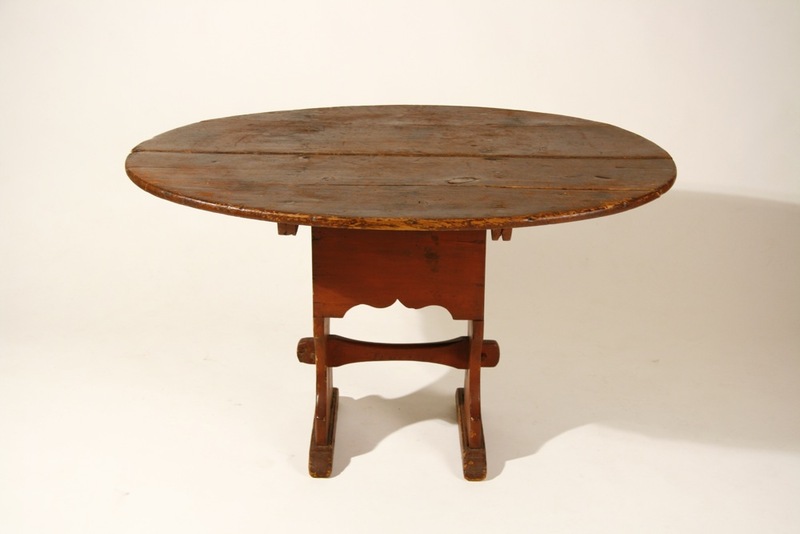 Maple, in a grain painted (last quarter 18th c.) finish over an original thin red wash. Eastern MA, c.1730-45. 46 1/4" ht. One banister is cracked. Acquired from the estate of the collector to whom I had sold it in 1984. 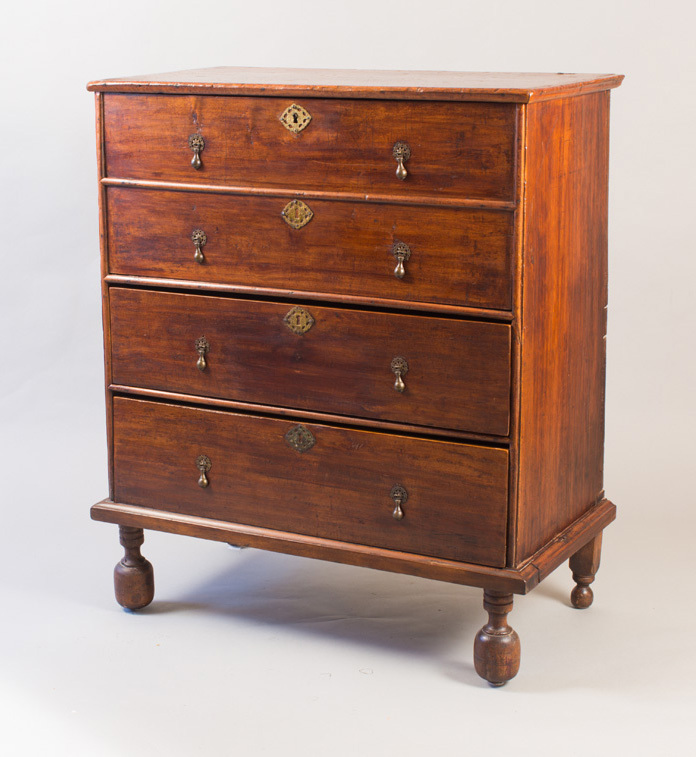 A very fine ball-footed blanket chest with two real and two simulated drawers. 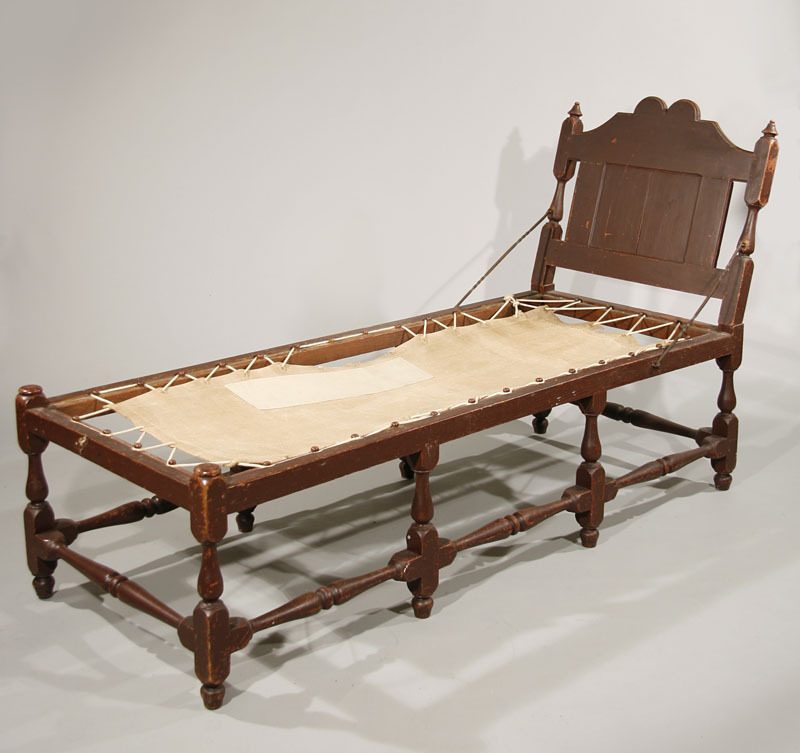 Made of poplar and pine with maple feet, it retains its original hinges, double-arch moldings, well-turned feet, and its original dry red wash-with original 'ebonized' base molding and feet. 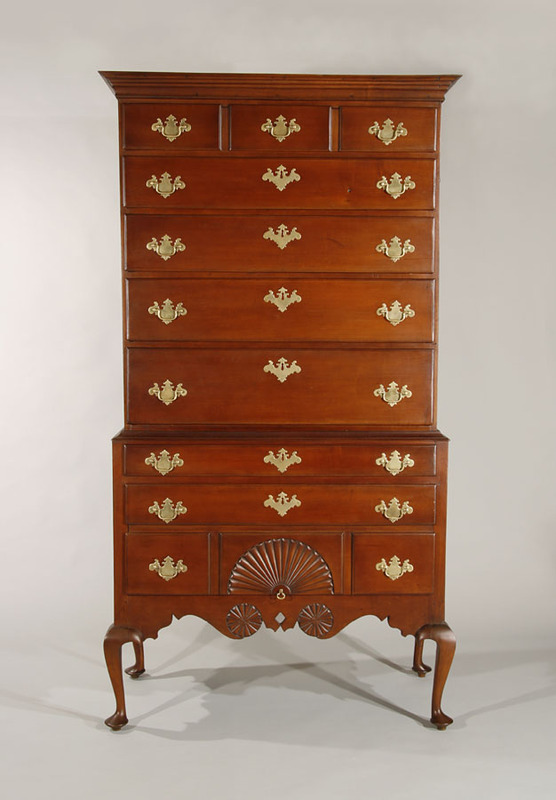 Great proportions-CASE WIDTH 32", 44" tall and 20" deep. Probably NY state, c.1740-50. 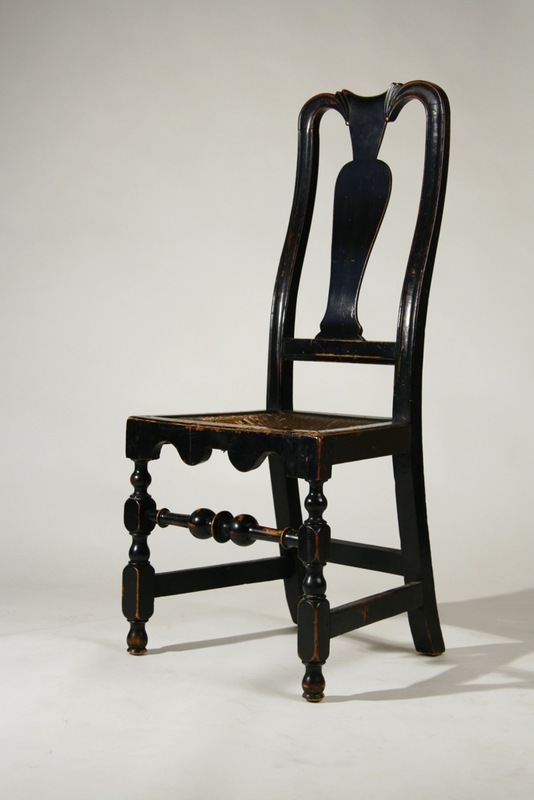 A very fine turned 'Carver' chair with bold finials, beautifully-turned back posts, slanted arms, ball tops to front legs intact, as are the turned front feet. 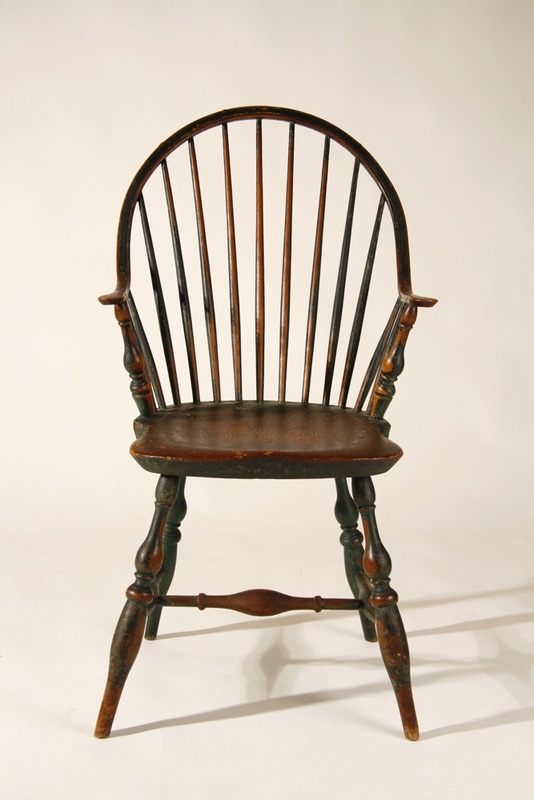 An exceptionally fine example of a central/coastal CT chair from the first quarter of the 18th century. Maple and ash, in good old color with an old splint seat. 2" of the rear feet have been rebuilt to compensate for insect damage. 45 1/2" tall with 15 1/2" seat ht. 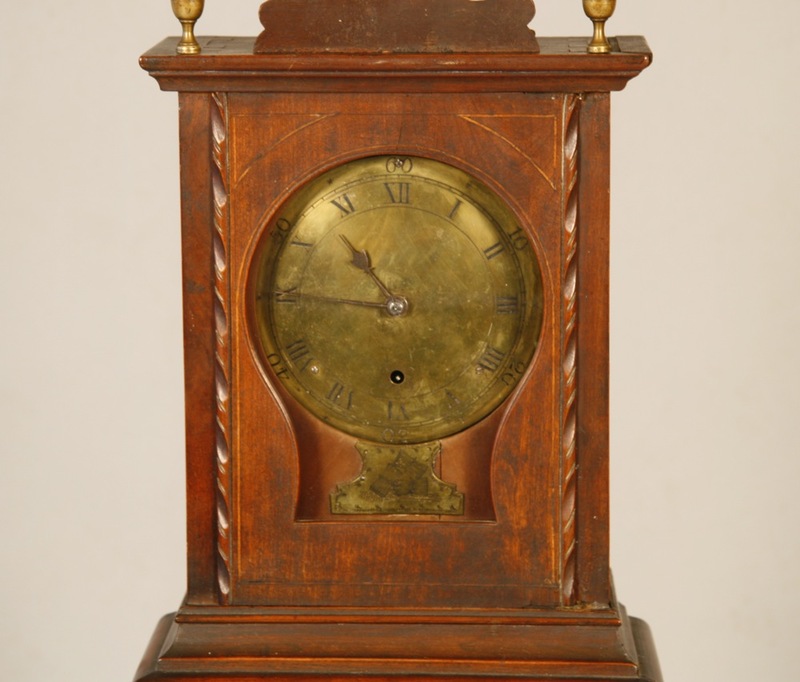 This very rare Gilmanton, NH clock by Noah Ranlet is pictured and described in Charles Parsons's, NH Clocks and Clockmakers, pp.162-164. 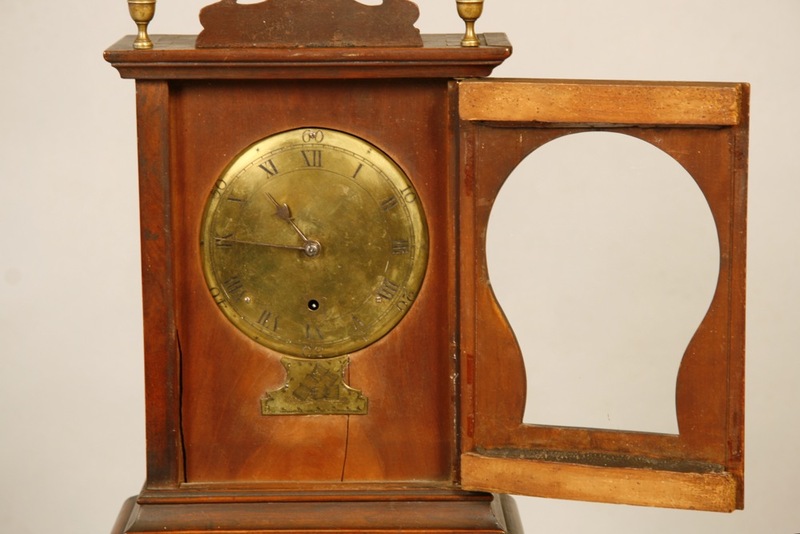 Parsons states that NH grandmother clocks are very rare-he cites only 6, four by Ranlet- and this is the only known NH clock with a sweep second hand. 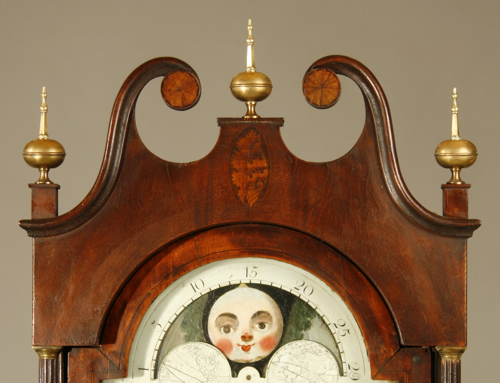 It is an eight day clock with time and strike movement. 11 3/4" wide, 40" tall to top of center finial, 5 1/2" deep. 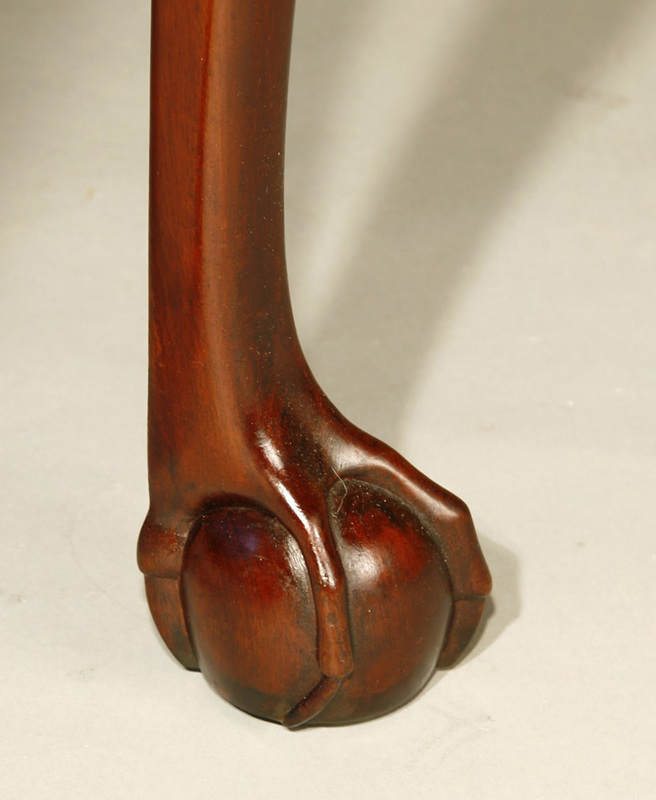 Mahogany, with flame birch panel, original brass paw feet, and pine secondary wood. 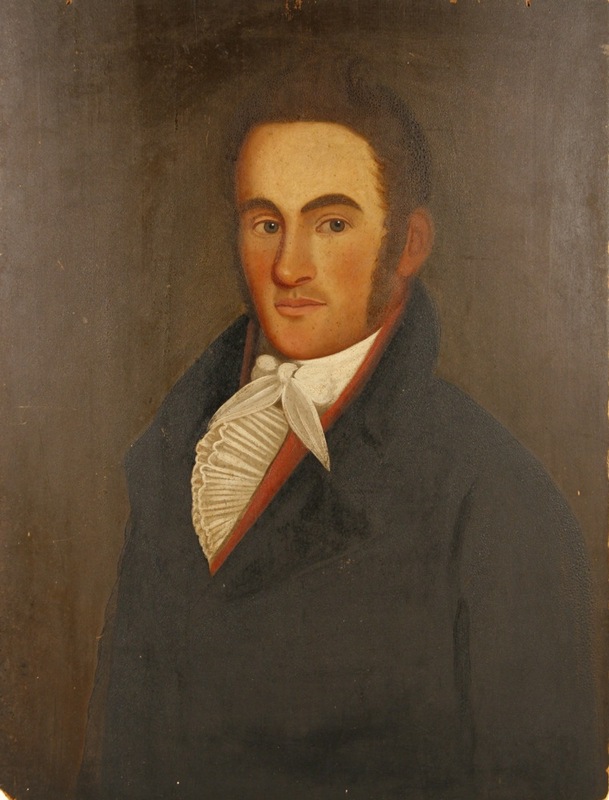 c.1800. 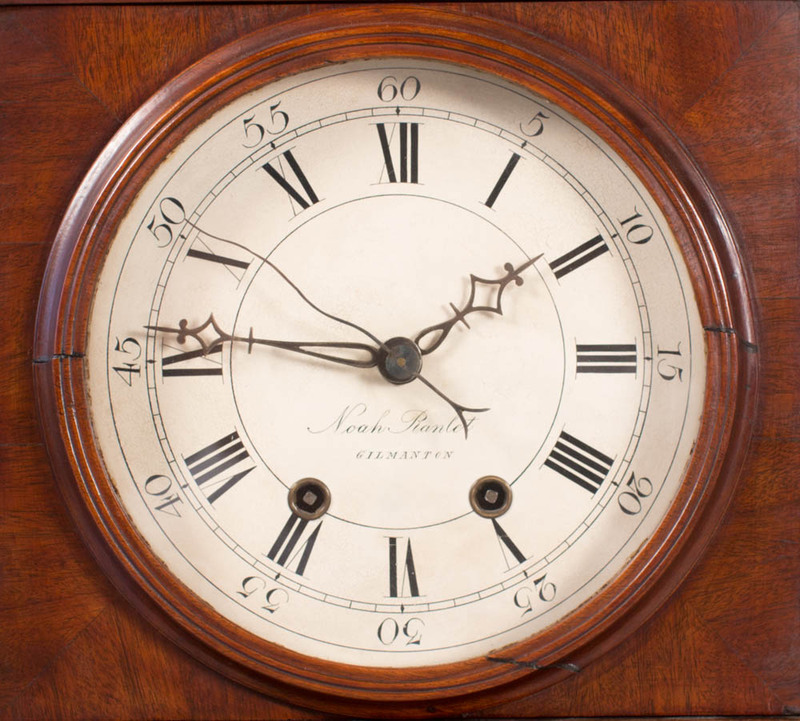 Sold by Hershel Burt, dean of NH clock dealers in 1967 to a private client, and just re-purchased from the collectors to whom I had sold it in 1991. 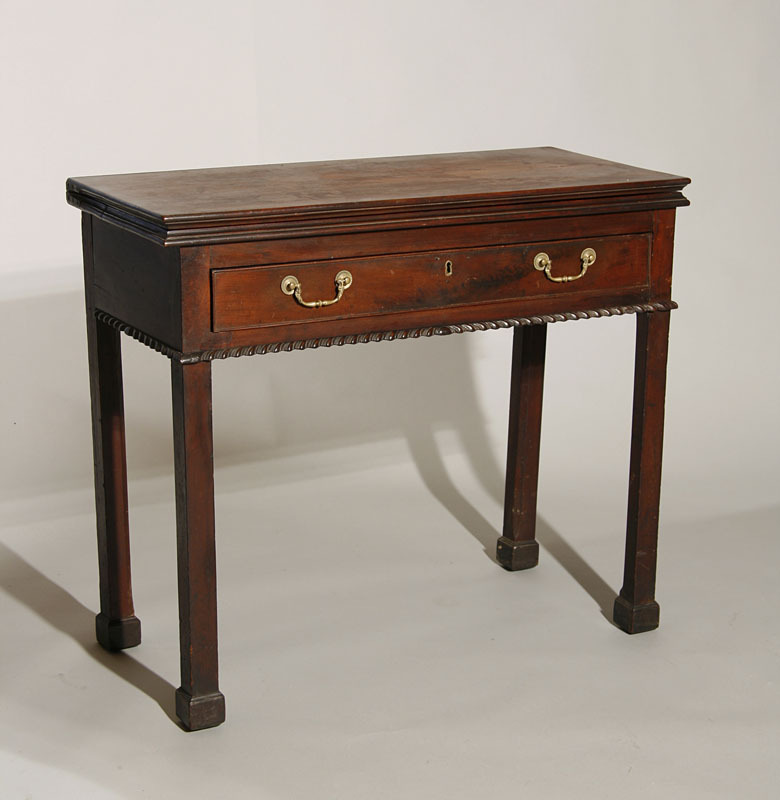 A rare pediment-topped Chippendale high chest with scrolled apron and fully-carved ball and claw feet. 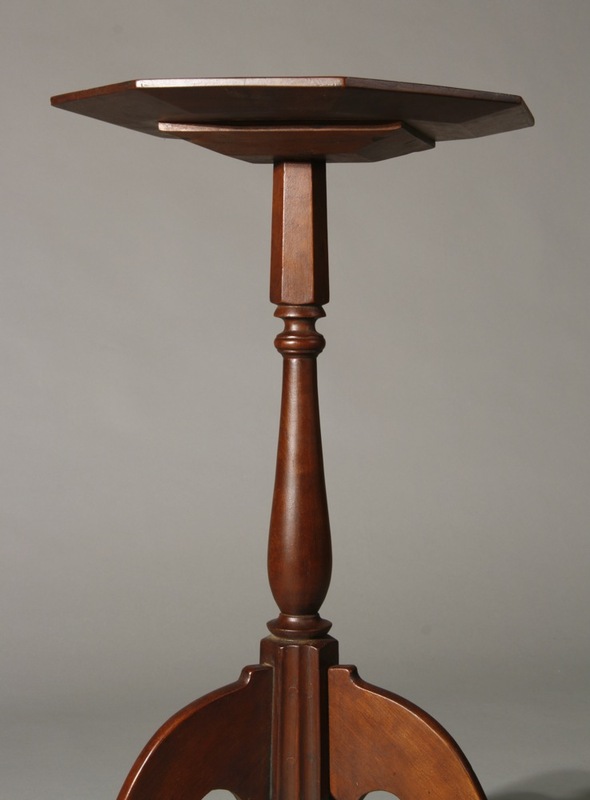 Made of choice mahogany with deeply-carved fans in both the top and bottom sections. Older finish and retaining its original finials. One of only three pediment-topped high chests that I have seen. The brasses are old and may be original. Boston area, c.1770-1780. Top case 39", lower case 41 1/2", 85" ht. 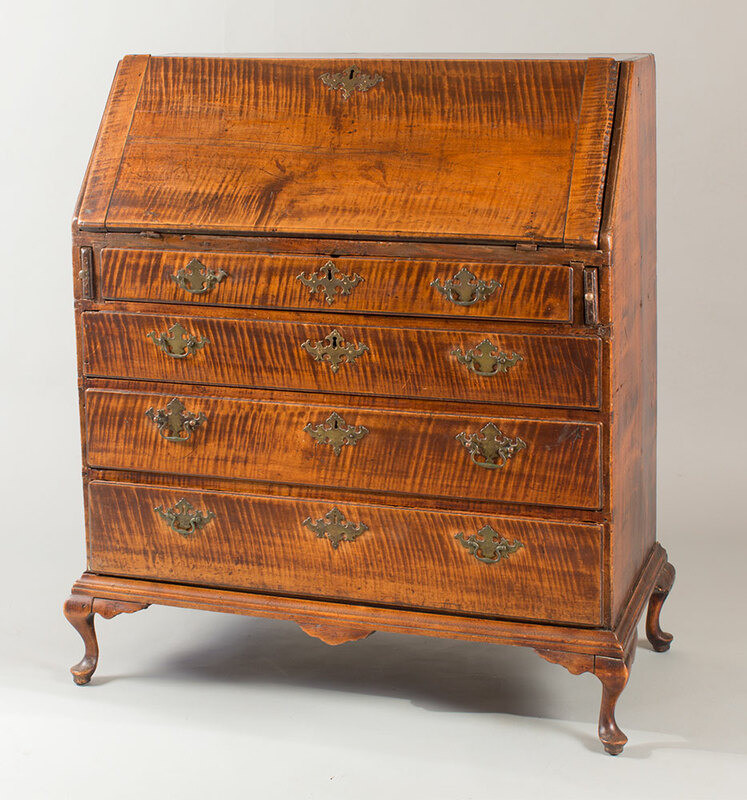 Originally from a Hingham, MA family, this high chest has had some conservation. 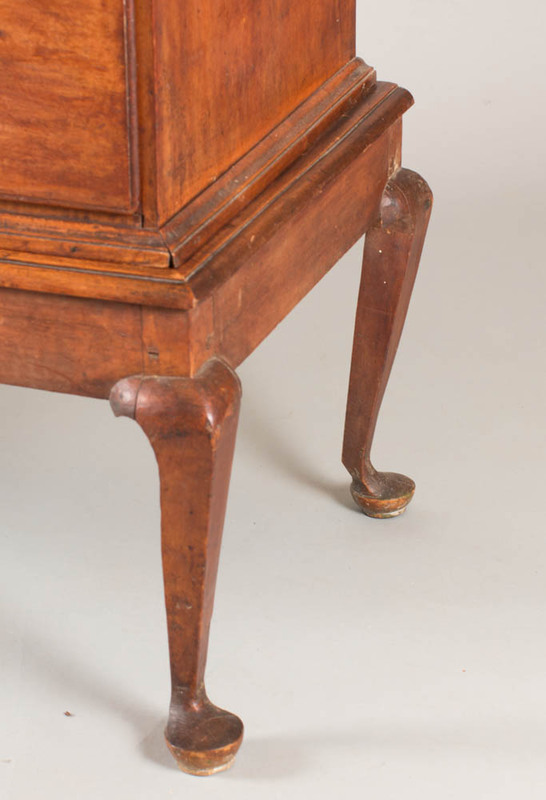 There is some lip repair, a drawer bottom in the lower case is restored, and the right (facing) rear leg is an old replacement. 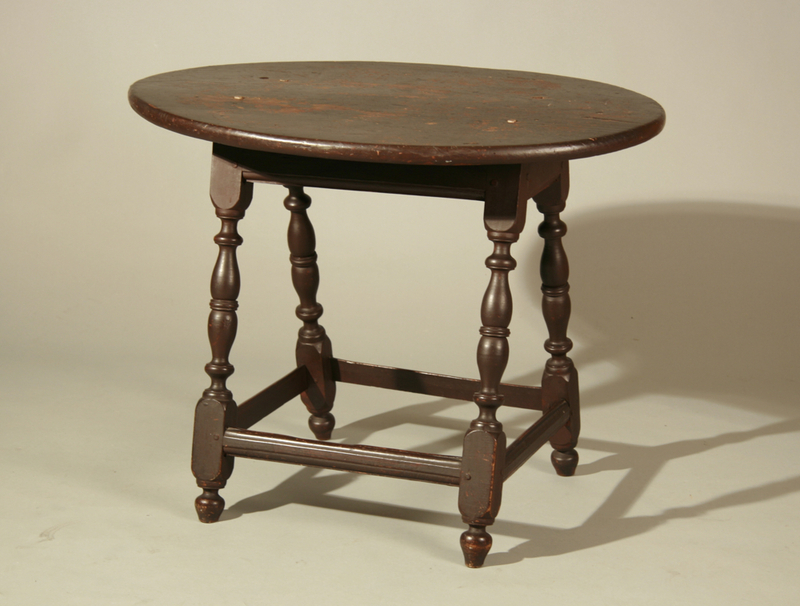 A fine Maine chair table with an exceptional scrubbed top-- and a rare or unique red and black daub-painted underside of top and base. With chamfered legs, original wire hinges on the lift seat, and original (now broken) wooden pivot rod. Wonderful overall surface quality-and a great piece of painted country furniture! 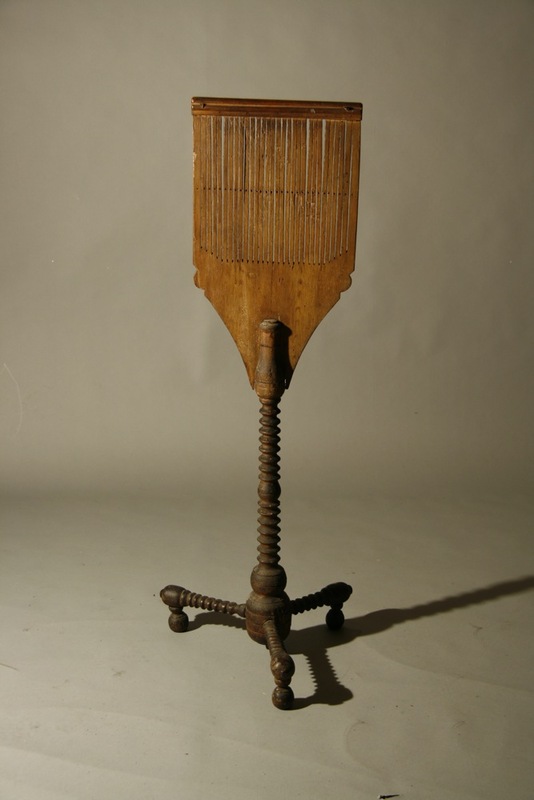 Made of pine, poplar, and birch, c. 1800-1830. Top 48 1/2" x 49", 27 1/2" ht. 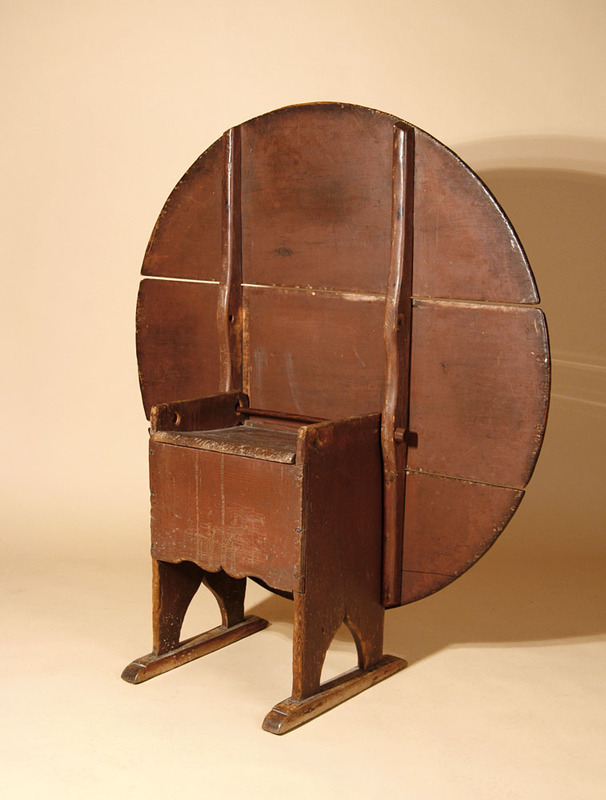 A rare transitional 'open armchair' with yoked crest, vase-shaped splat, scrolled arm supports, shaped front skirt to slip seat frame, bold front stretcher, and block and vase-turned legs. Maple, in original thin black paint. NH, probably Portsmouth, c.1740. 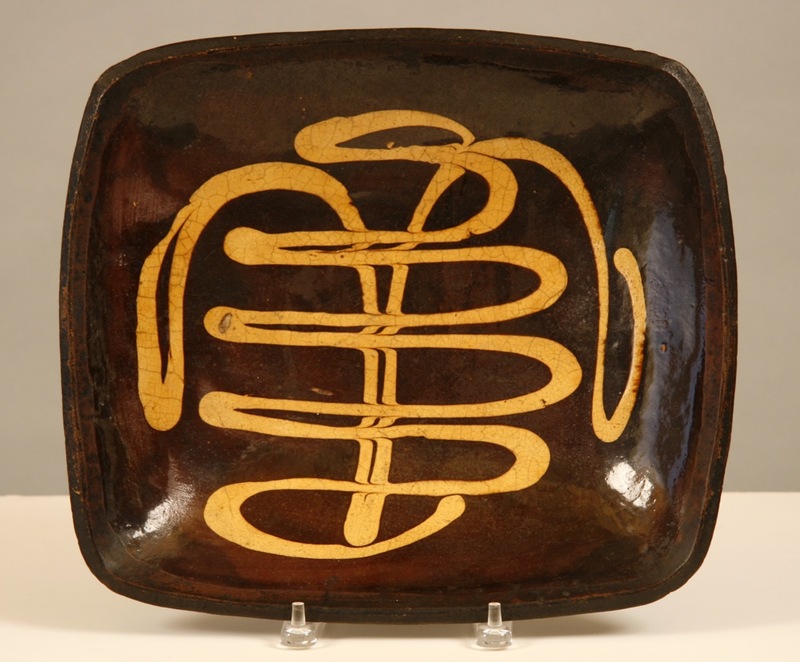 Very few examples of this form are known, and this example is remarkable for its quality, condition, and surface. 40" ht. 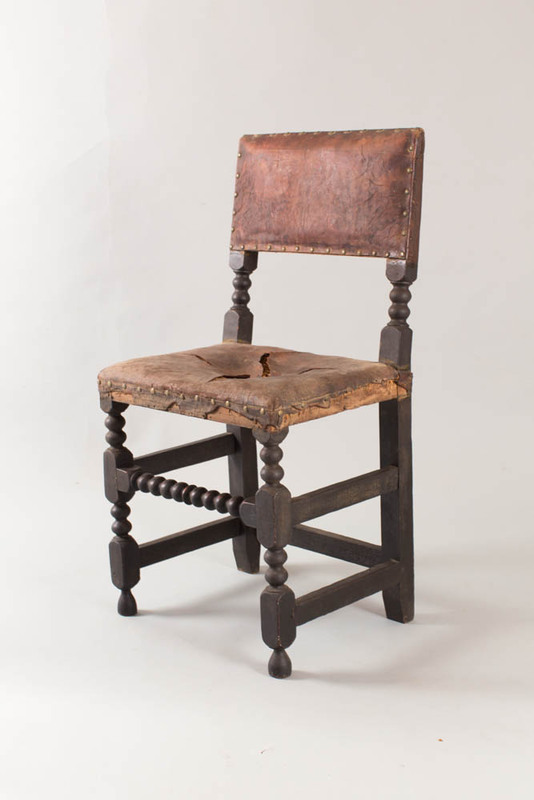 An exceptionally rare 17th century turned 'leather' chair in completely original structural condition--and retaining its original stuffing and leather. In a mid-19th century black paint over the original brown stain. Maple and oak, probably Boston, 1660-1690. Ht. 38", seat ht. 20". 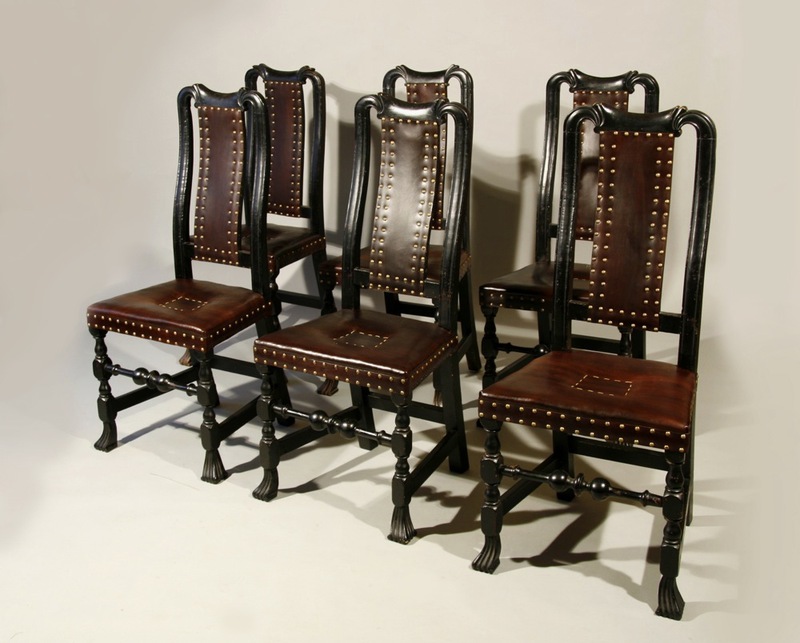 Only three or four of these chairs remain with their original leather intact. Just acquired from an old Newbury, MA family. 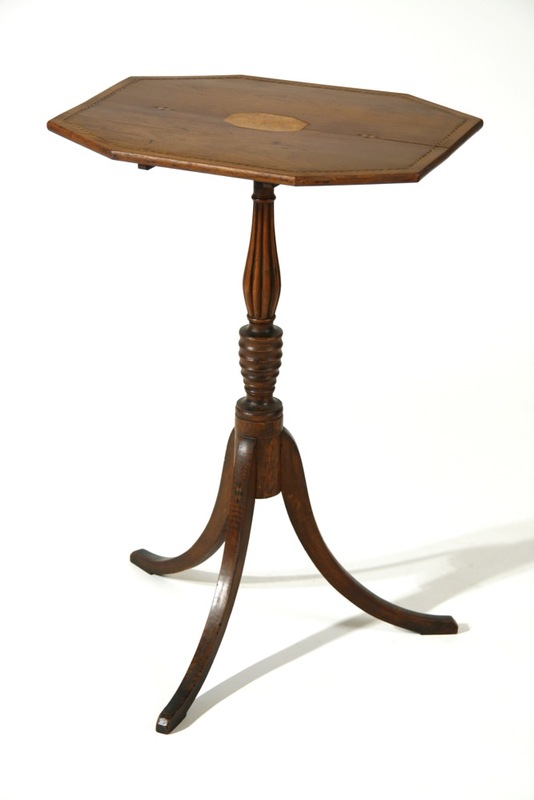 A country Queen Anne drop leaf table in a rare small size-only 30" in length-with a shaped skirt and cabriole legs ending in deeply-'hocked' ankles with shell-carved pad feet-a probably unique feature. Made of cherry or applewood, maple, birch and pine, this table turned up at a small house sale in Chester, NH in the late 1980s. I purchased it at that time and have just re-purchased it from the collector to whom I had sold it. A great example of rural New Hampshire quirkiness! Top 30" x 28 3/4", 11 1/2" closed, 25" ht. 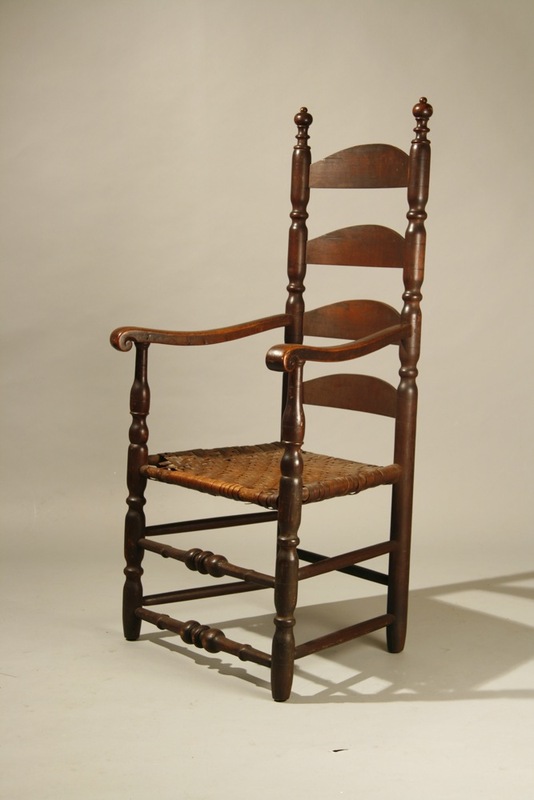 A rare New London County 'greate chaire'. 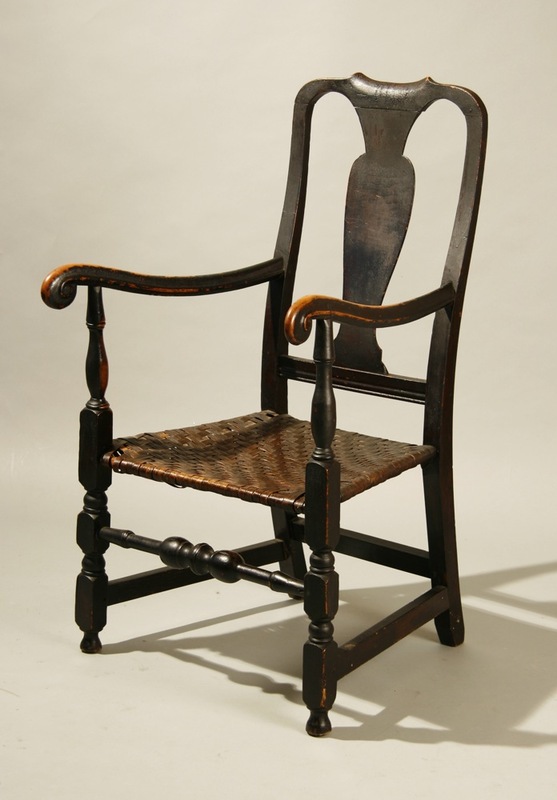 This is one of the earliest and boldest of the perhaps dozen of these chairs to have survived, c1730-40. Great finials, turned and slanted arms, 'mushroom' front posts-and in great old 'as descended' condition. I sold this chair in the 1980s and have recently re-purchased it from that collection. Maple and ash, in old brown paint. 44" ht, 16" seat ht. A classic 'heart and crown' armchair in the finest 'as descended' surface-original black paint with great wear characteristics. 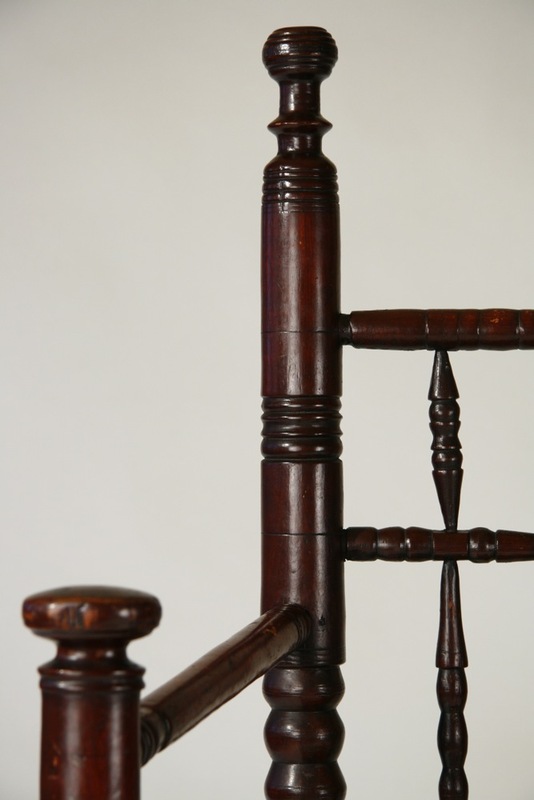 Shaped and pierced crest, molded banisters, turned under arm supports and with boldly-turned front stretchers. 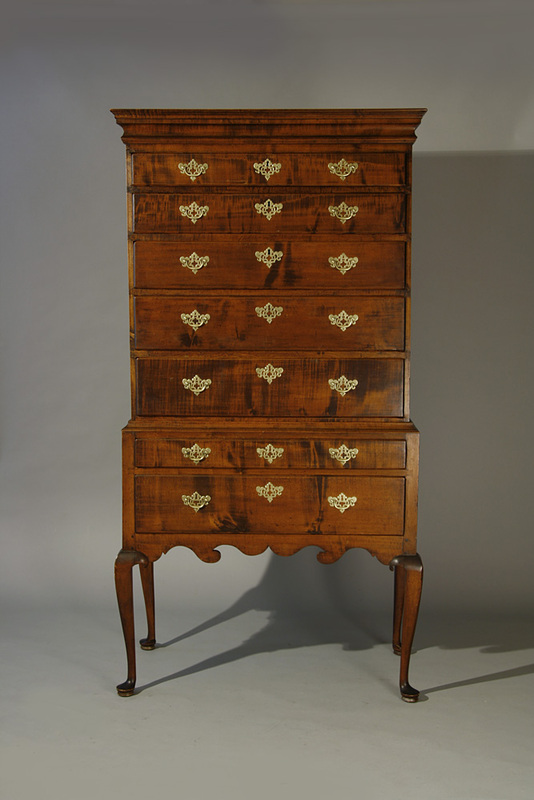 Maple, ash, and poplar, south-central CT, third quarter of the 18th century. 48" ht. 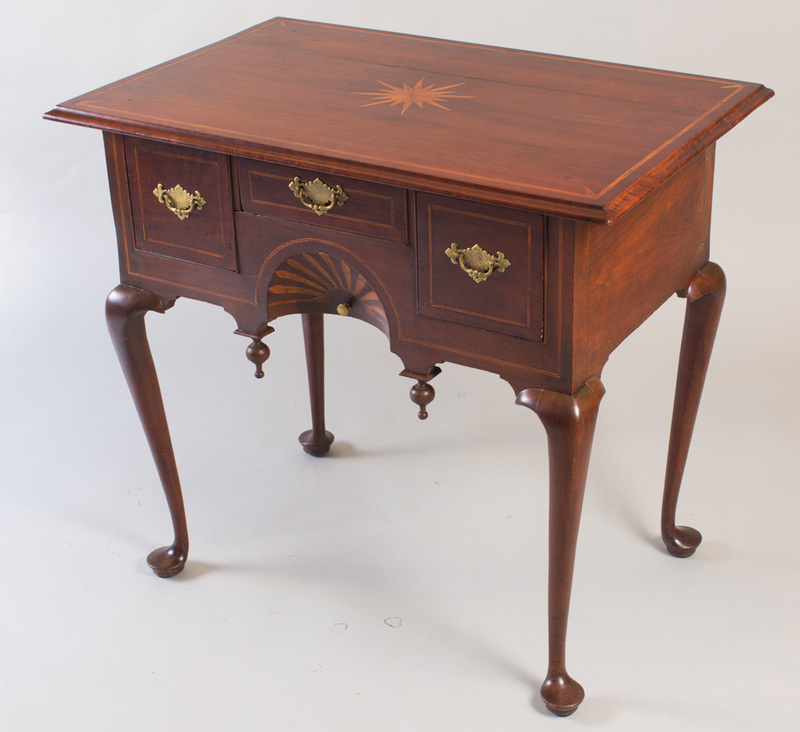 Bought privately from a Maine family with roots in Nantucket and coastal CT.
A rare William and Mary ball foot desk, having a double-stepped interior with a well, a split top drawer, two full width drawers--and retaining its original, classic ball-turned feet. Maple, with poplar secondary wood, in a fine older surface. Probably eastern CT or southeastern MA, c.1740. The brasses are replaced, but appear to be period, and the lower edges of several drawer sides have been built up to compensate for wear. Just re-purchased from the collectors to whom I sold it over thirty years ago. 35" case width, 28" writing ht., 41" overall ht. 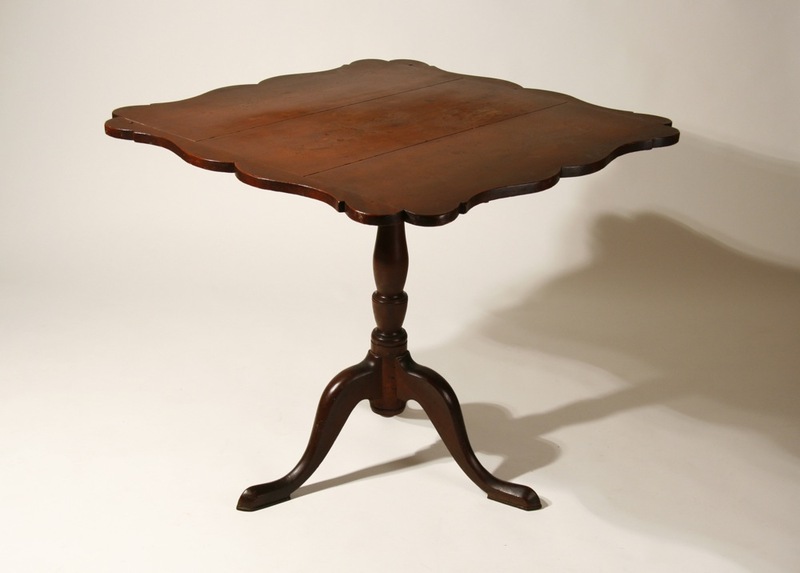 A rare and fine Queen Anne 'tray-top' tea table with applied molded edge, shaped skirt with drops on two sides, elegant cabriole legs ending in large pad feet. Maple, in a crackled old shellac finish. Southeastern NH, c.1760-85. Top 20 1/2" x 28 1/4", 25 " ht. There have been extra nails added at the corners over the years to secure the top. 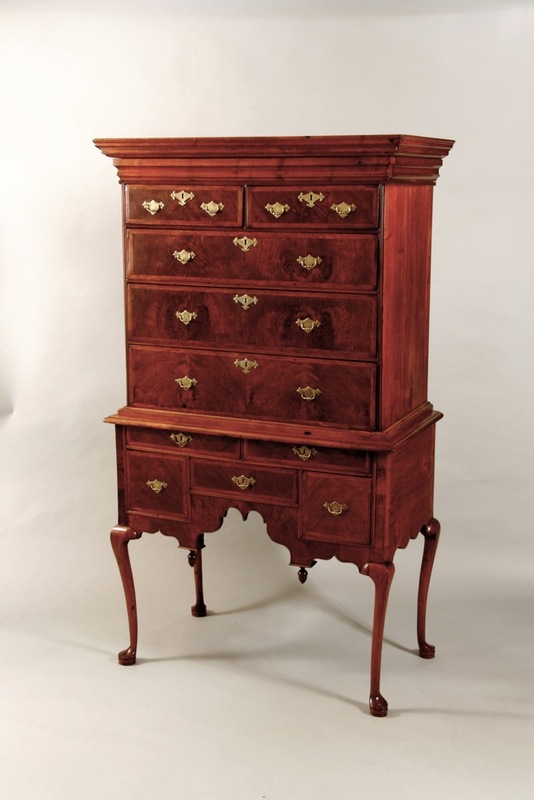 A very fine Queen Anne high chest with molding drawer, stepped waist moldings, scrolled skirt, and tall cabriole legs on platformed feet. 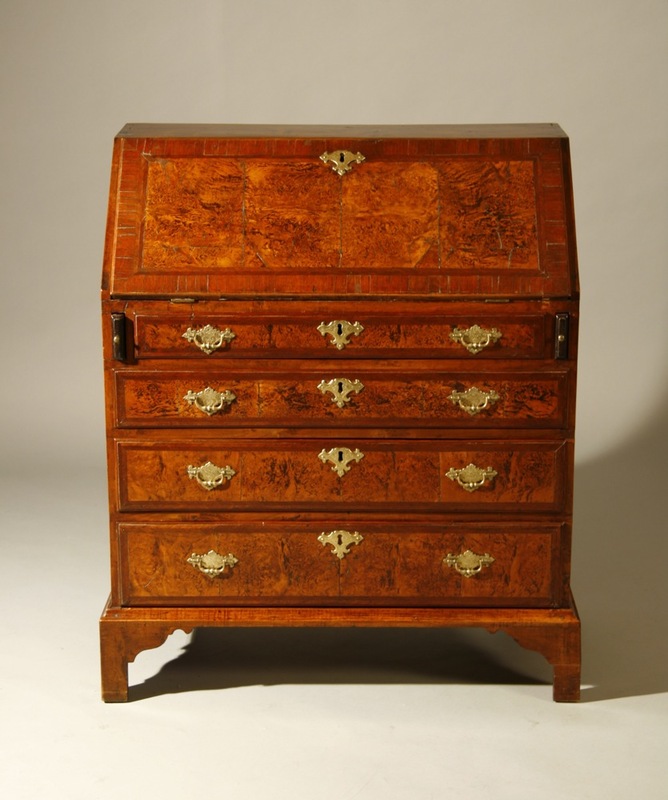 Walnut, with crotch walnut veneered and crossbanded drawers, and retaining a fine old finish and what appear to be its original brasses. Exceptional form and surface treatment. Boston or North Shore, MA, c.1735-45. Top case 36 1/4", lower case 38 1/4", 71 1/2" ht. 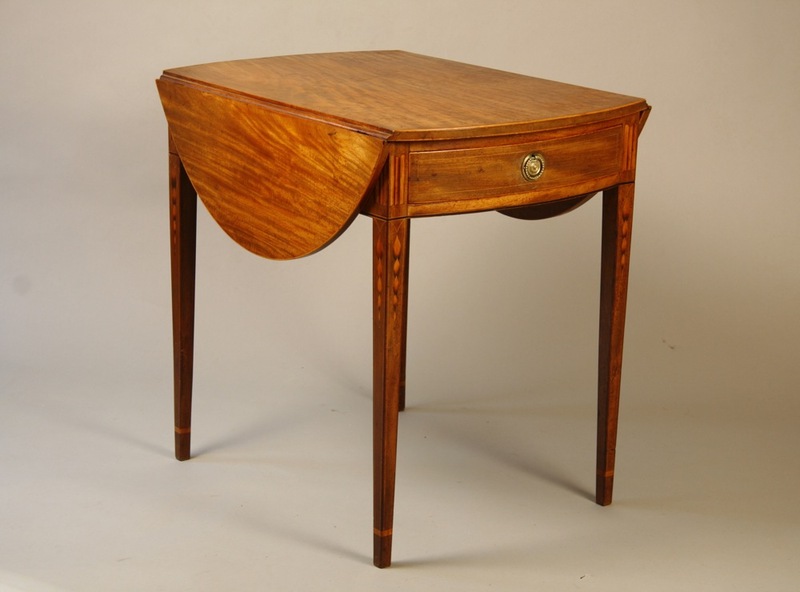 A very fine Hepplewhite Pembroke table with inlaid edge to oval top, line inlaid drawer, with what appears to be its original brass, book-end and descending husk inlay on frame and legs, which are also line inlaid down to the banded cuffs. 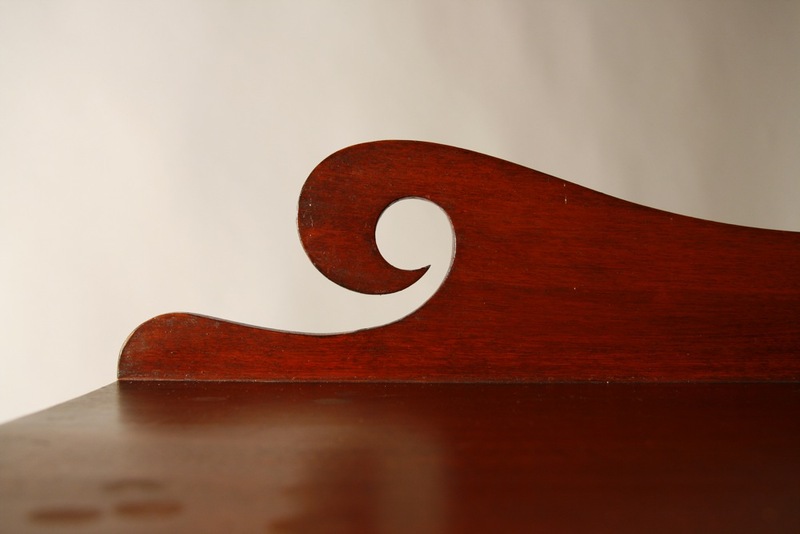 Made of mahogany-with great wood chosen for the top- and in a wonderful faded mahogany color. 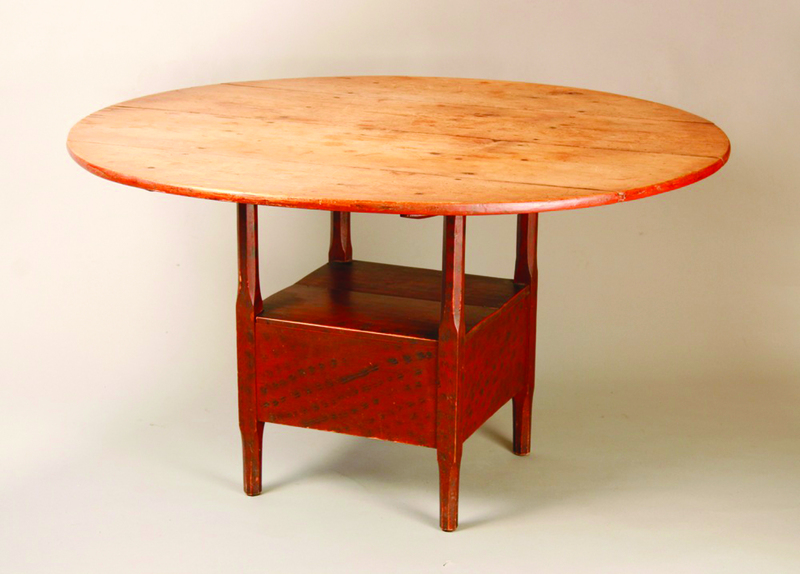 The secondary woods are pine, poplar, and gum- and the table can be attributed to John Dikeman of New York-based on the table shown and information provided on pages 348-349 of Montgomery's, American Furniture, The Federal Period. Top 22" x 30 3/4" (40" extended), 28" ht. 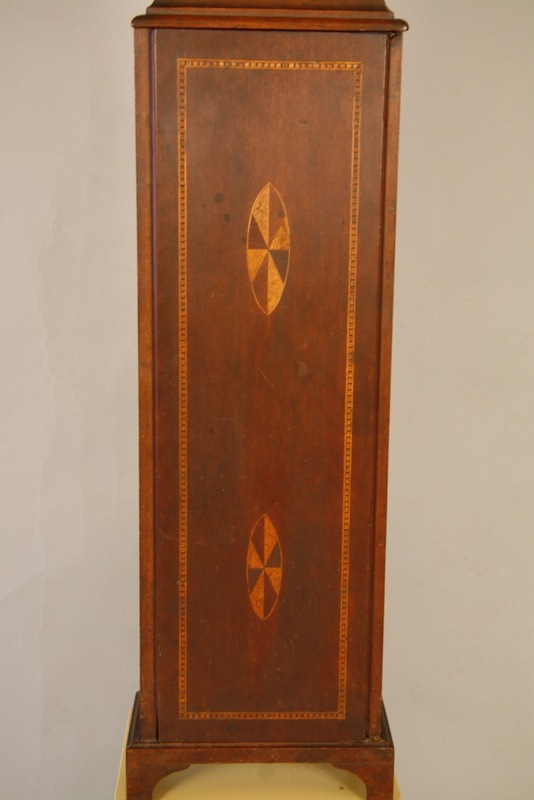 An exceptionally fine 'dwarf' or 'grandmother's' clock made of cherry, c.1800, and appearing to be in original surface. There are perhaps a half dozen of these clocks known, but the surface, inlay and rope-carving on the hood door, and inlaid ovals on the door set this example apart. A similar example is shown in Nutting's, The Clock Book (1924), #101, and the same clock is shown in Palmer's, The American Clock (1950) #93. Another example is in the collection of the Metropolitan Museum. Attributed to Samuel Mullikin, Jr. by Nutting, that attribution remains to the present day. However there does not appear to be any direct evidence for this attribution, and the clocks were probably made by someone who trained with the Willards in Grafton. 46 1/4" x 11" x 5 1/2 " deep. The (removable) fret is a restoration based on the original fret of a similar clock that I owned in 1986, and the finials, while period, are replacements. The right side (facing) molding on the hood is an old restoration, and there is a small repair to the right(facing) side of the base. The bell and clapper were missing and they have been restored with period examples. 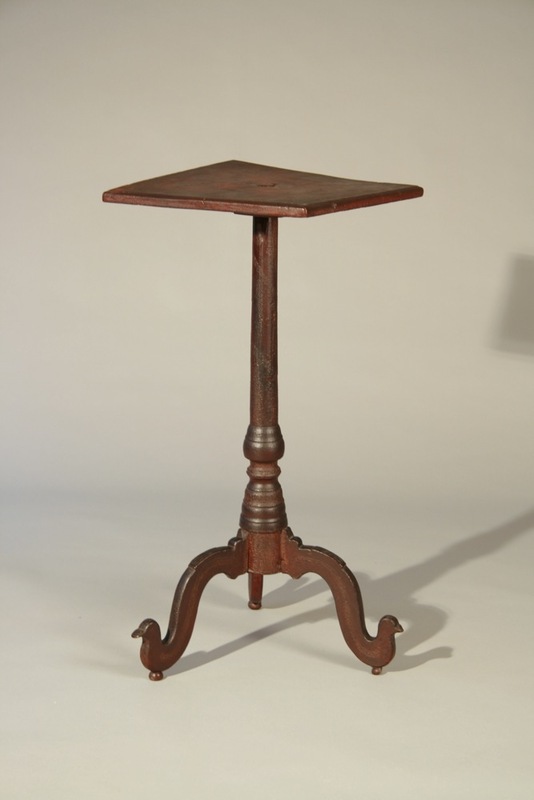 A rare Chester County cross-base stand from the first quarter of the 18th century. A 'best' in terms of form and surface. 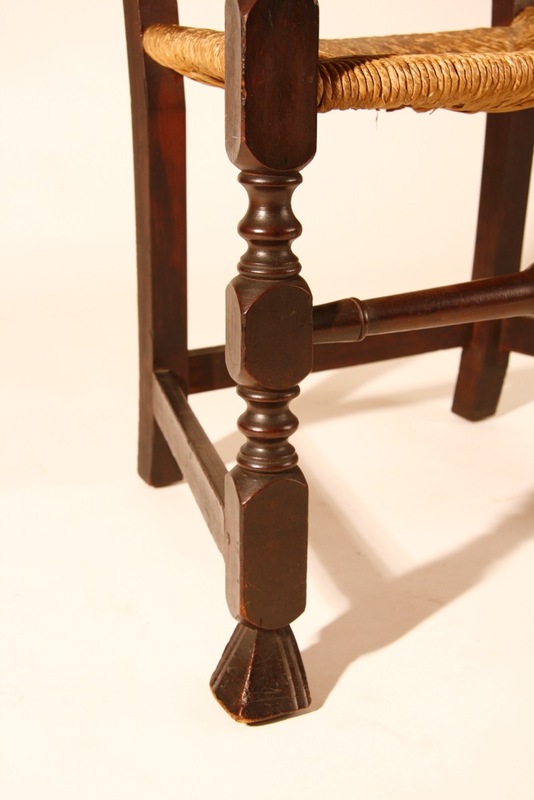 With a chamfered top over a baluster-turned post, and with raised, scrolled feet. Walnut, with oak cleats. Gutsy proportions and the finest 'as descended' surface quality. The top had been rotated 3", probably because the screws had pulled out, and numerous nails had been driven into the top of the shaft to secure cracks. I have had the top re-set to its original location and removed the later nails in the shaft--pictures before repairs are available. Top 18" x 18 1/4", 28 3/4" ht. 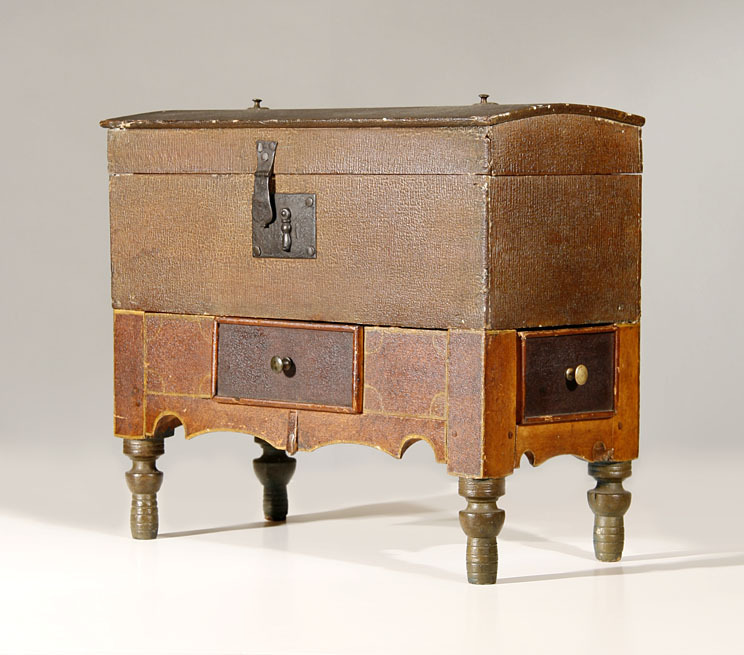 A rare William and Mary two drawer blanket chest with double-arch molded case and large, inset, ball feet. Made of poplar, with oak cleats supporting the feet--in a great old crusty surface, with original hinges and feet. From the Bentz family of Orient, Long Island. Made there or across the Sound in CT, c.1730-40. Found with a combination of 18th and 20th century brasses, now with a set of period brasses in the original location. Holes from the later brasses have been filled. 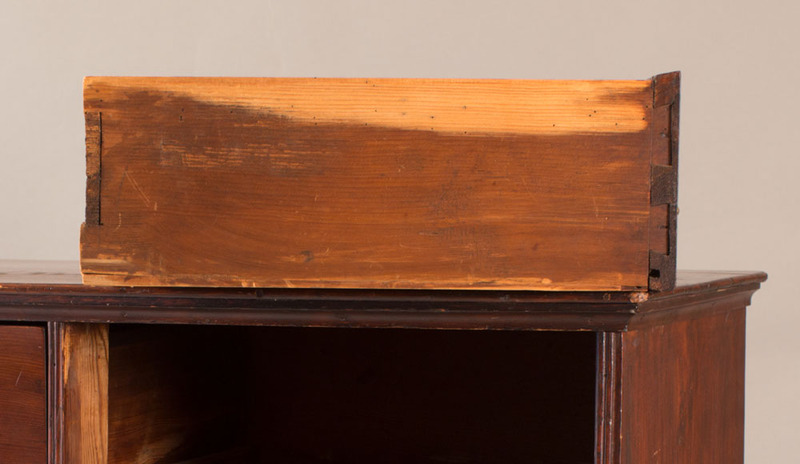 The left (facing) base molding is an old replacement, and there is modern repair to the lower edges of the sides of one drawer. The Baxter/ Sanborn Family stretcher table. Used by Gregory Baxter, born in Braintree, MA, 1706 , while a student at Harvard College, 1723-1725. 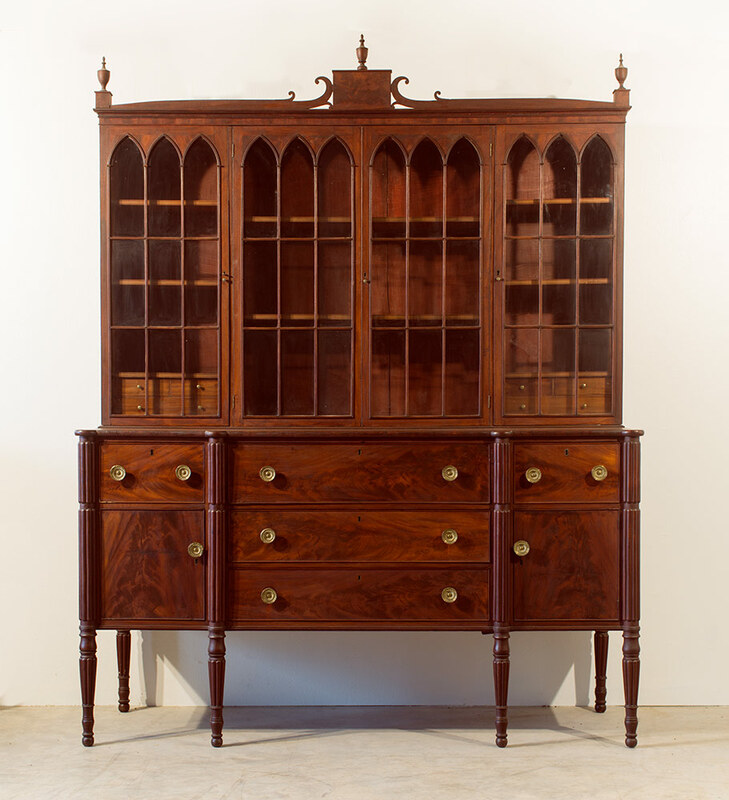 Exceptional proportions, turnings, and condition. Made in Norfolk County, MA. c.1715-20. Maple and pine, with no structural repair or restoration. Purchased directly from the family. Top 35" xz 22", 27 1'4" ht. This is the finest formal Sheraton chest that I have owned. Choice woods- 'horseflesh' mahogany top, exotic inlaid half-round banding around the top, matched crotch-grained drawer fronts, mahogany drawer sides--and superbly carved front legs and rope-carved lower edge molding. Original brasses and a rich old surface. Formerly in the famed Maxim Karolik Collection. 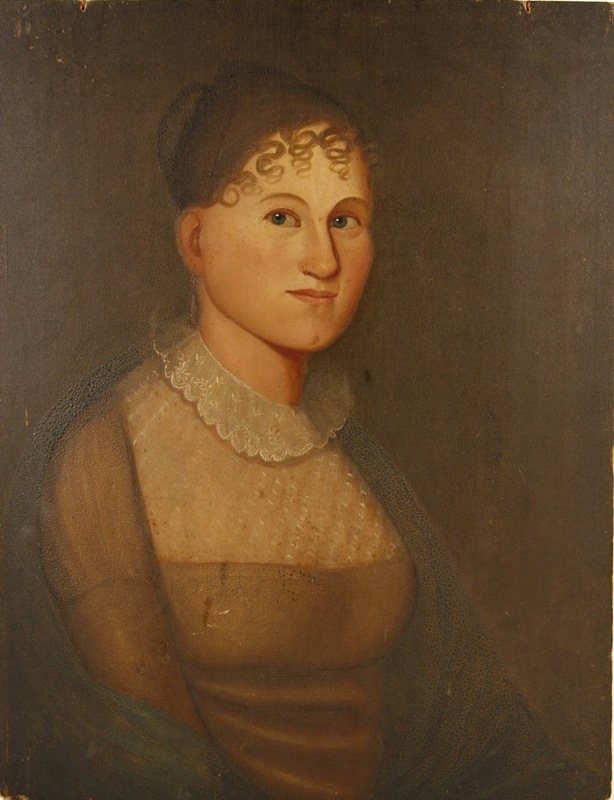 Probably Salem, c.1805-15. Case width 41 1/2", ht. 41 1/2". 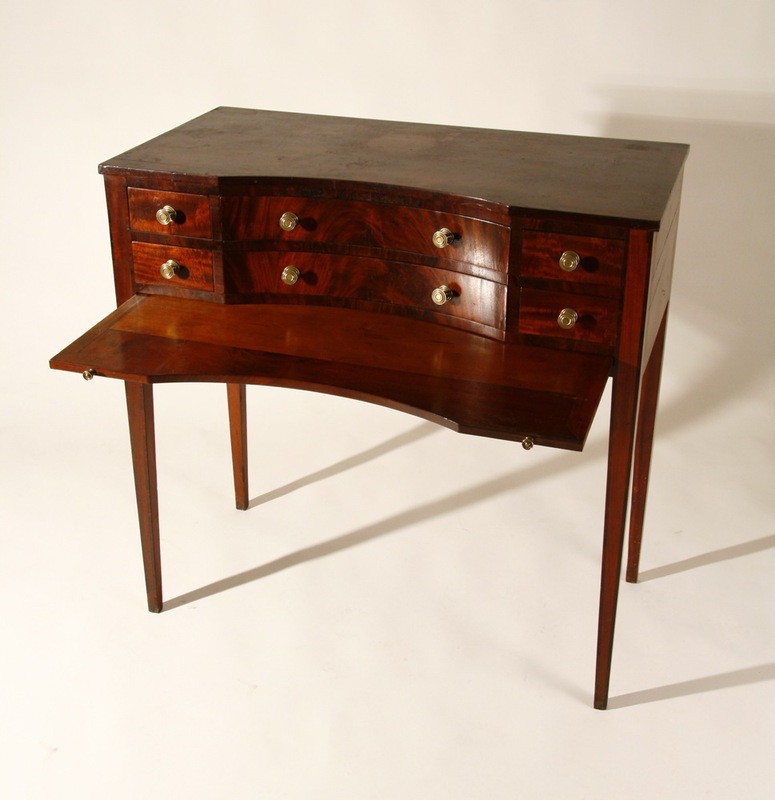 A very fine Chippendale block front desk with blocked bracket base. Triple block and shell carved interior, rich old color, and retaining its original brasses. 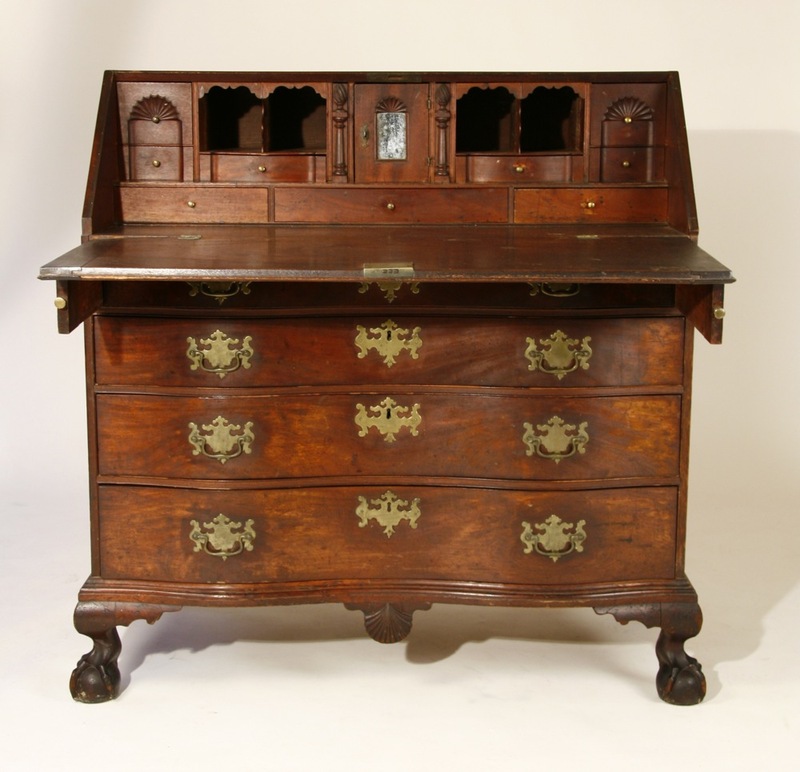 This important desk descended in the family of Nathanial Bowditch, author of The American Practical Navigator, 1801, includes a first edition of that book, and the Bowditch family silver-engraved ledger book. As shown in The Magazine Antiques, April, 1996, p.515. Hinges and center drop restored. 42" wide, 32 1/4" writing ht. 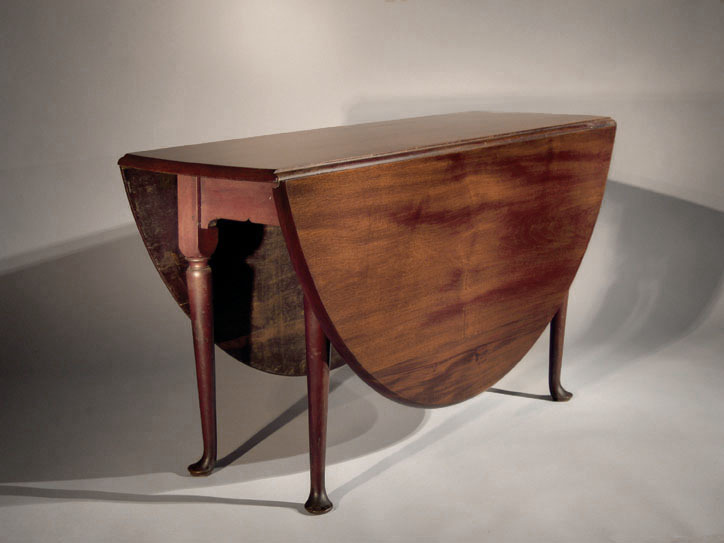 A very fine shoe-foot hutch table with platformed shoe feet, the lower box with cyma-curved cutouts on both front and back, beautifully shaped and carved arms, and a two board round top. Pine and maple or birch , in original dry red paint. NH origin, c.1800. In terms of design, scale, proportion, and surface quality, this is the finest New England hutch table that I have owned. I sold it in 1982-over thirty years ago- and it was advertised in The Magazine Antiques at that time. 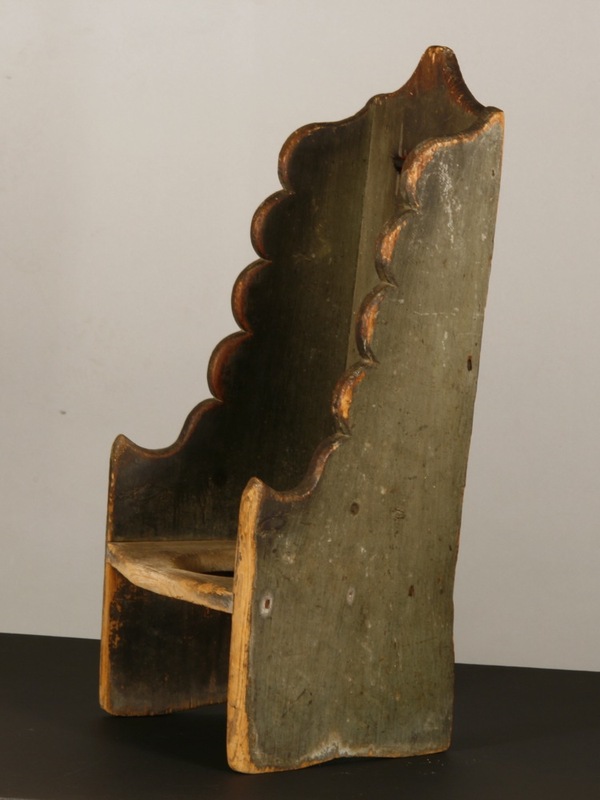 A mid-18th century child's 'necessary' chair with scrolled sides and in dry original blue/green paint. A great survivor-probably unique-and a clear expression of 'family values' in colonial New England. 27" tall, 11" deep, 12 1/2" wide. A very rare 'butterfly' table in undisturbed original surface and 'as descended' condition- the only one in this state that I have owned in over 40 years. 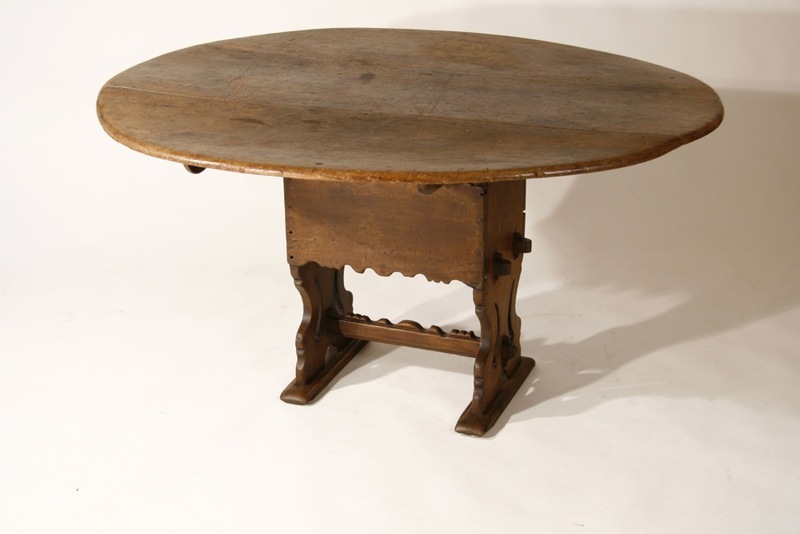 Perfectly proportioned and crisply-turned, the table is made of cherry, with chestnut leaf supports. Rhode Island origin, c.1735-50. Top 37 3/4" x 40", 26 1/2" ht. 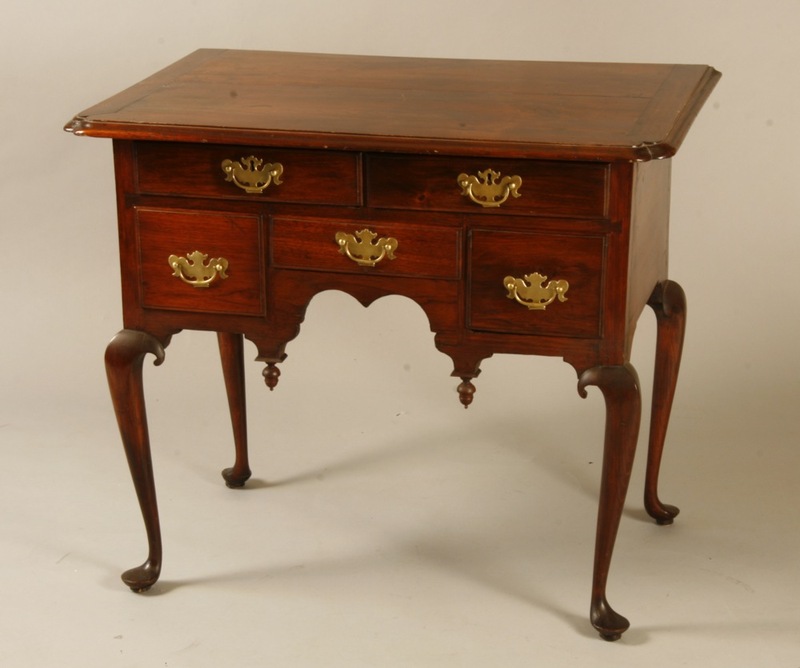 A fine Queen Anne lowboy, or dressing table; the fully-molded top with invected front corners and cleated ends, triple-arcaded skirt, and with exceptionally well-designed and executed cabriole legs and pad feet. Walnut, maple, and pine in an older dark surface with replaced brass. Southeastern NH or northern Essex County origin, c.1750-60. 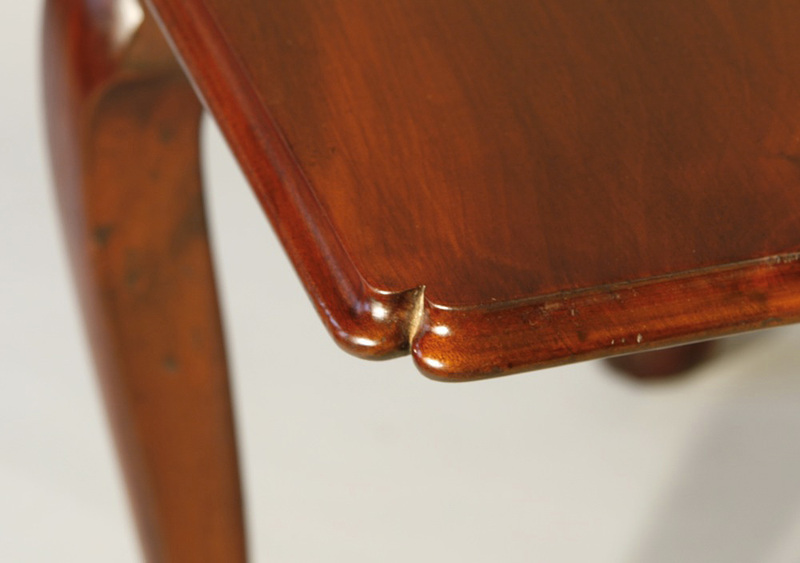 The cleated ends to the top and the fully-molded back edge are unusual, as is the shape of the small knee returns. Small in scale, with a more pronounced overhang than usual, the graceful legs and feet elevate this example from the norm. Case 29 1/2" wide, top 24" x 34 1/2", 30" ht. 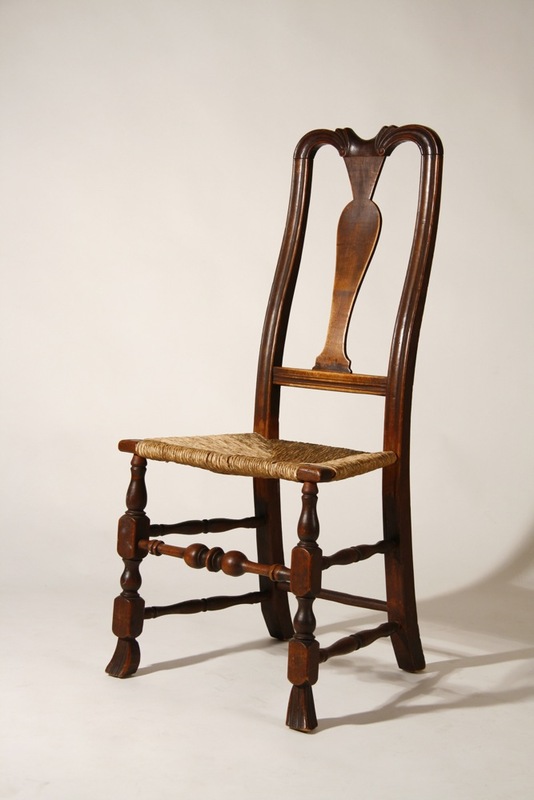 A very rare 'stoelendraaier's' (turned-chair maker) conceit. 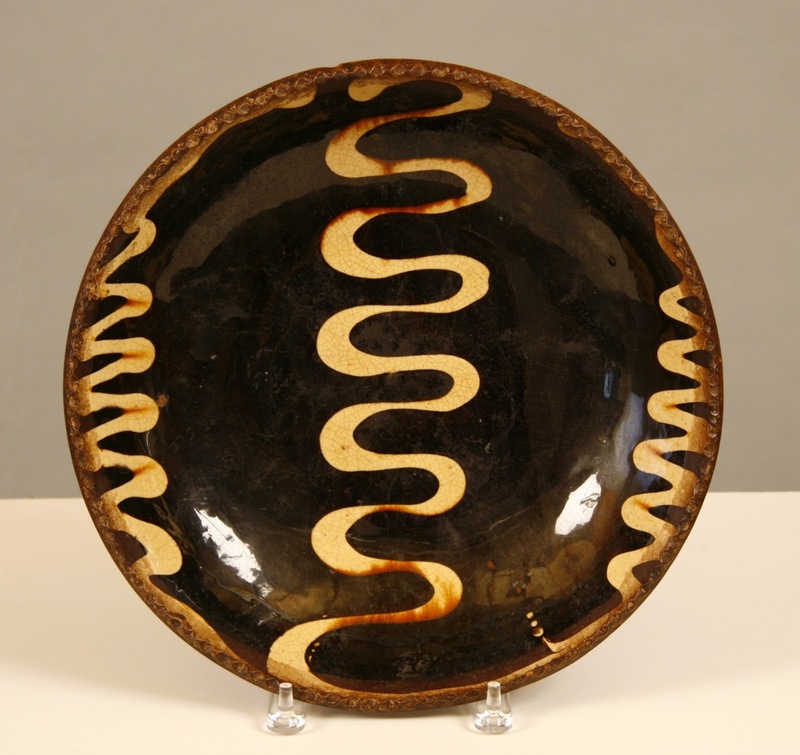 Made to show the skills of the maker, and perhaps as a gift for a wealthy client. Exceptional turnings, perfectly proportioned in a reduced size, it is only 18 3/4" tall, with an 8" seat height. 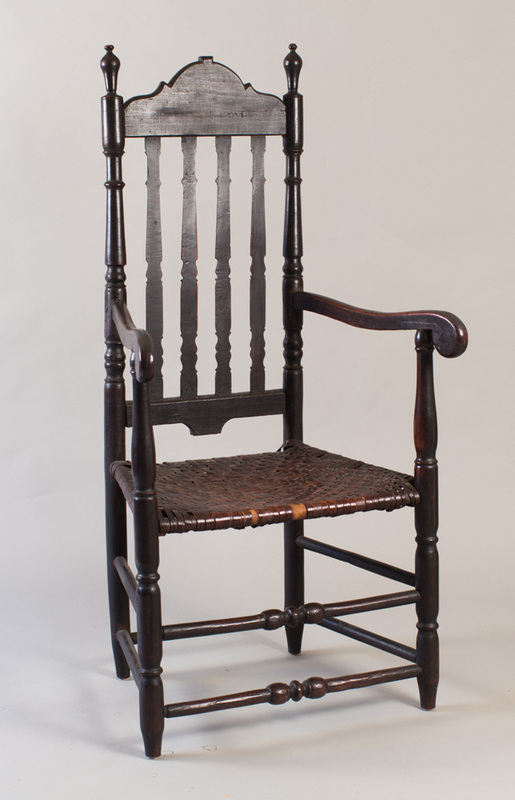 This cherry and hickory chair, made c.1720-40 in New York, and in original surface, has a continuous history in a Long Island family. 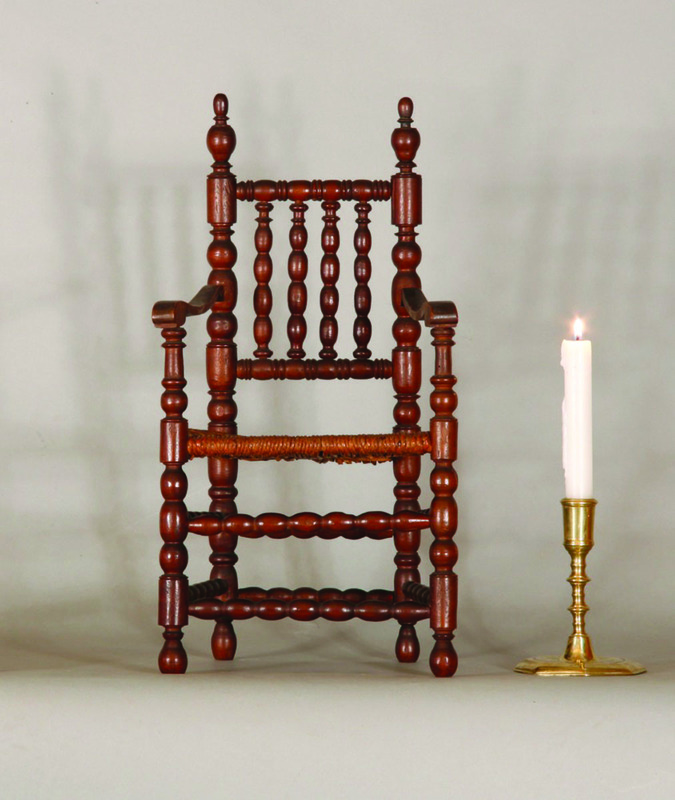 A lengthy article on similarly-turned chairs, by Eric Gronning, appears in Luke Beckerdite's, American Furniture, 2001. 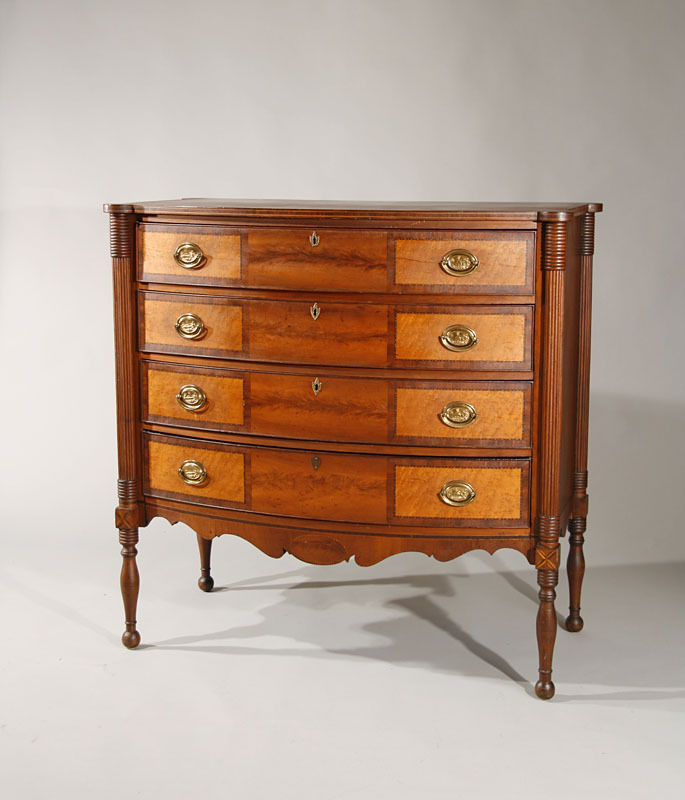 A fine and rare Chippendale mahogany serpentine front chest with molded-edge top, beaded edges to the drawers, canted corners, a dramatic ogee-footed base centered by a scrolled and deeply molded shell. 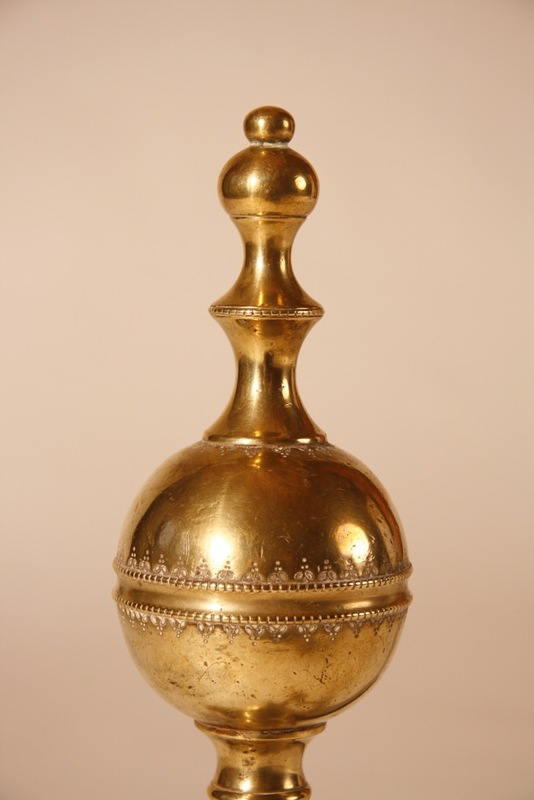 It is in 'as descended' condition, with an old, possibly original finish and appears to retain its original brasses. Salem, MA 1775-1795. 37 3/4" case width, 34 1/4" ht. 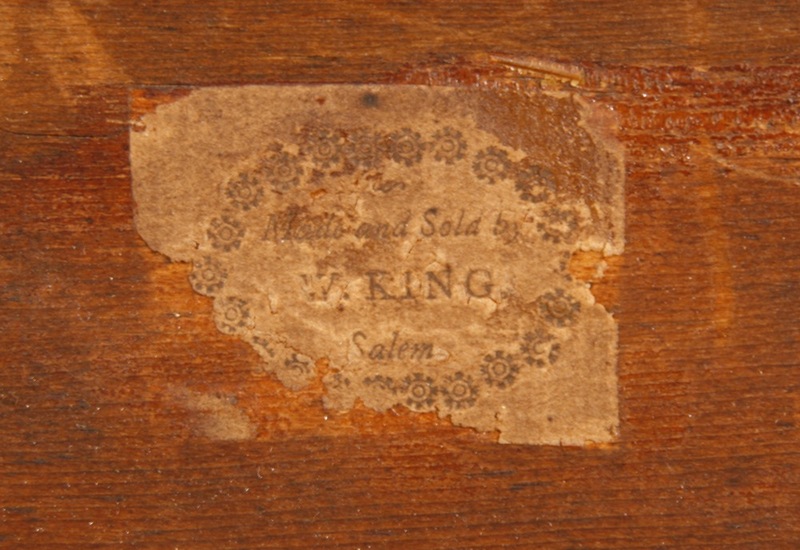 This chest retains the label "Made and Sold by/ W. King/ Salem" on the back (one of three such pieces known) and is pictured as the frontispiece in The Magazine Antiques, September,1927-where it is discussed in a three page article. At that time, it was in the collection of Mrs. J. Insley Blair, one of the most important collectors of American furniture in the 20th century. 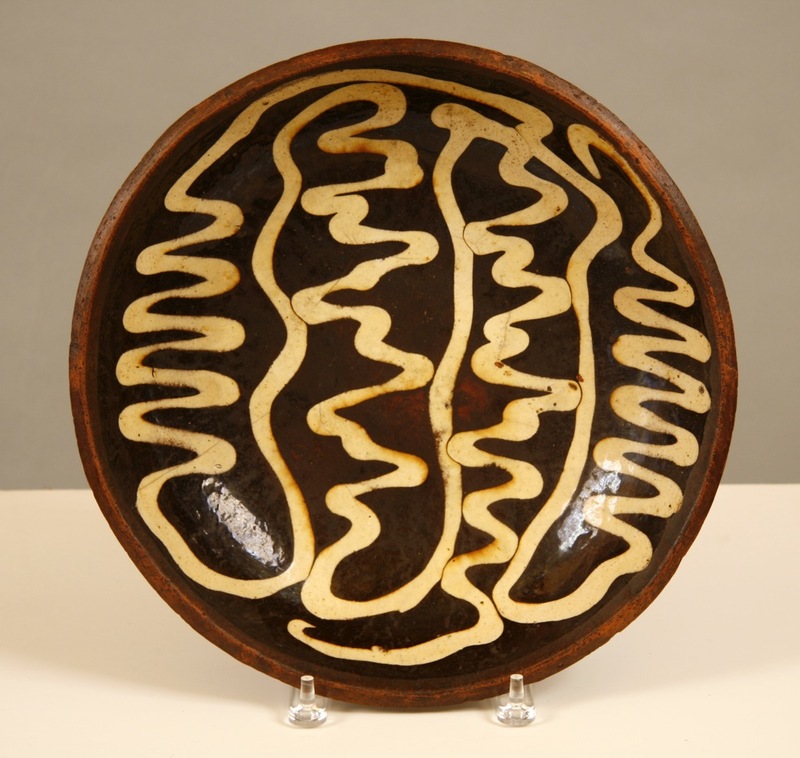 A 15 year collection of English slipware chargers. Ranging in size from 13" to 17", none of the pieces are repaired or restored. England, c.1750-1820. 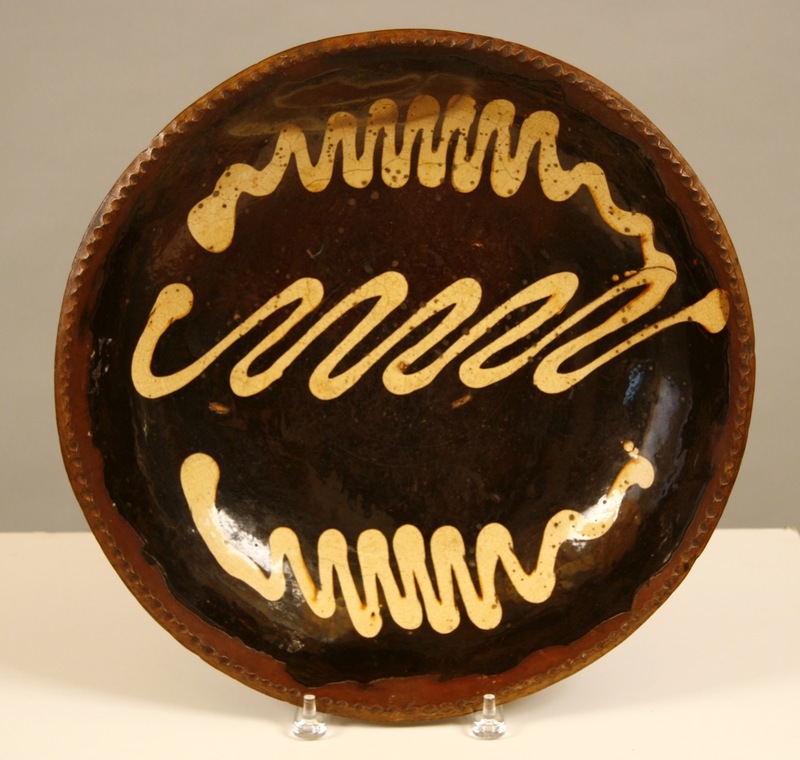 See Slipware in the Collection of The Potteries Museum and Art Galleries, by Barker and Crompton, pp.147-151 for comparable examples and detailed information on origin, design, and construction. 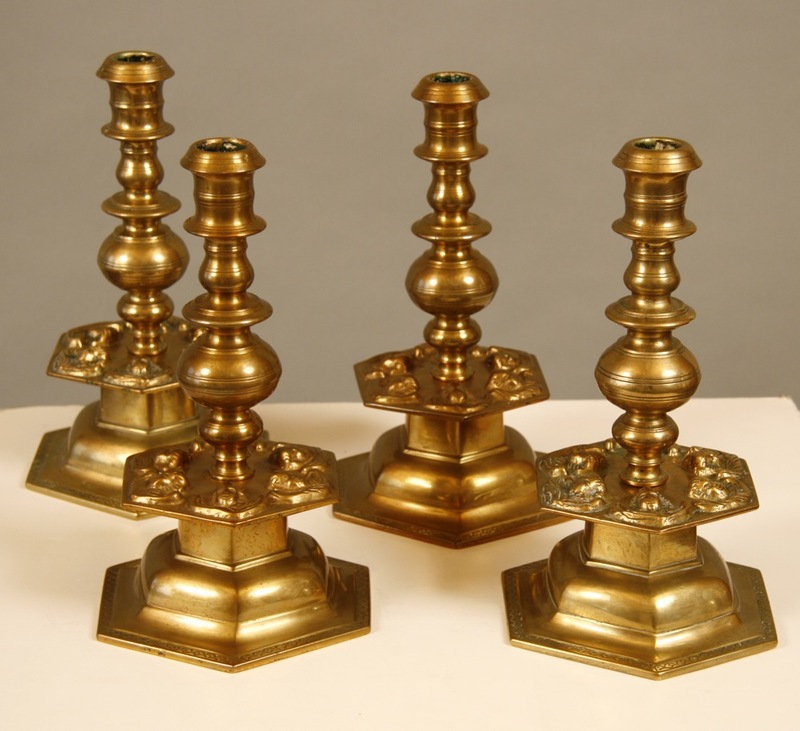 A matched set of four massive--12" tall, weighing 8 1/2 pounds each-- Scandinavian candlesticks with hexagonal bell bases and matching drip pans, with cherubs at each corner, and with exceptionally bold and crisply-turned shafts. Denmark or Sweden, c.1675-1700. Because of an unusual characteristic to the casting of the base, the four sticks are clearly from the same mold. Similar sticks are pictured and described in The Lear Collection, by Christopher Bangs, pp.161-2, 356. 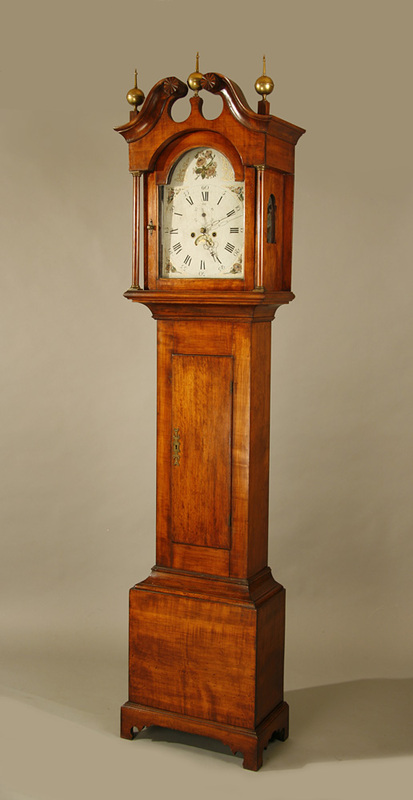 A rare Federal period tall clock with a cherry case: the hood with wave-shaped crest, fluted columns, and carved dentil molding, the case with fluted quarter columns, the doors crossbanded with mahogany veneer, the center door and lower section of the case dramatically inlaid with segmented mahogany ovals, the lower case with applied scrolled decoration, all above an ogee bracket base. 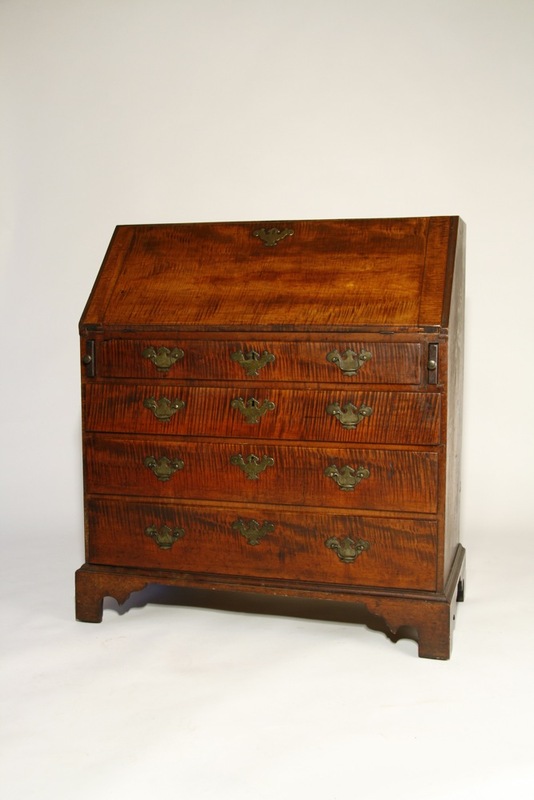 Exceptional proportions and design, and retaining what appears to be its original thin shellac or oil finish. 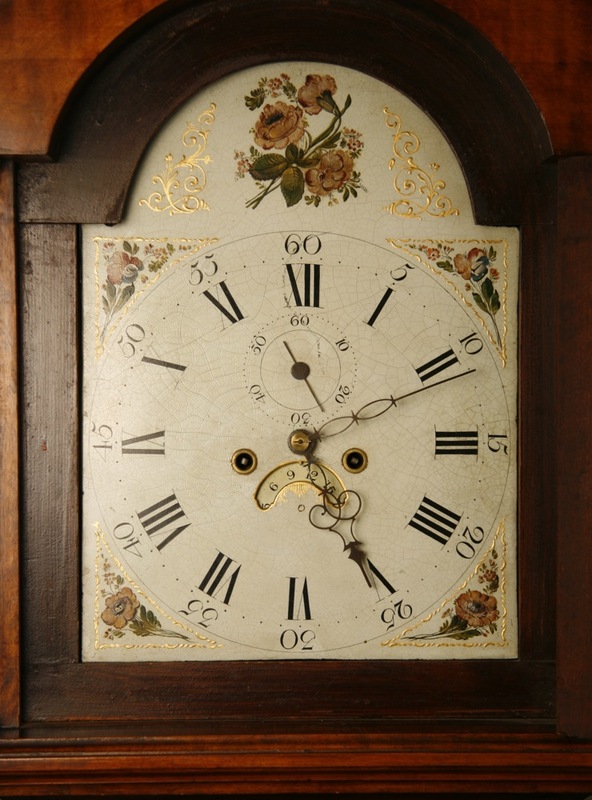 There is no restoration to the floral painted dial and the weights and pendulum are also original. Central or western MA., c1810-15. From the William Hubbard collection. 96" to top of center finial. 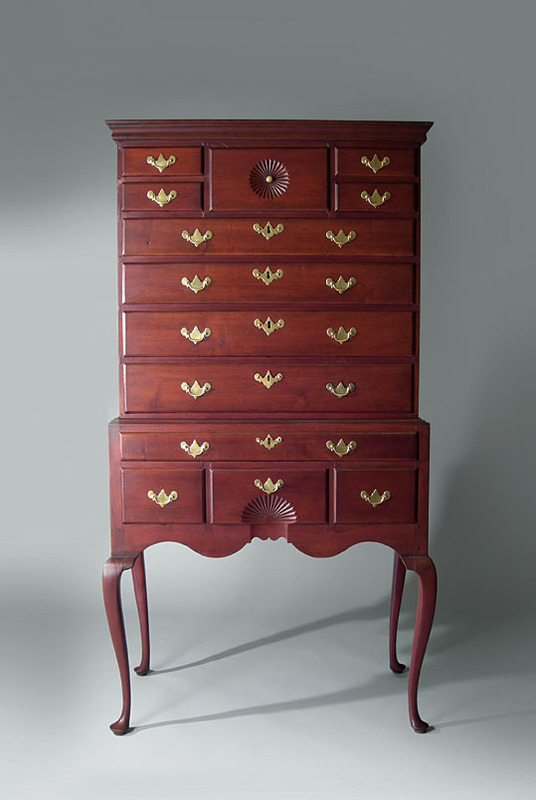 A rare and perhaps unique Sheraton bowed front secretary with decorative top molding, applied columns on case, paneled center door and tambour doors in top section, pull-out writing slide in lower section above cockbeaded drawers, and a shaped skirt centered by an oval drop panel. Tiger maple fronts, cherry case, with poplar secondary wood--now with an old set of Bennnington pottery pulls. Probably western Vermont, c.1815-20. Width 44 1/2", ht. 53 1/2". Minor repiar to right rear section of side skirt and old replacement of one small drawer bottom. 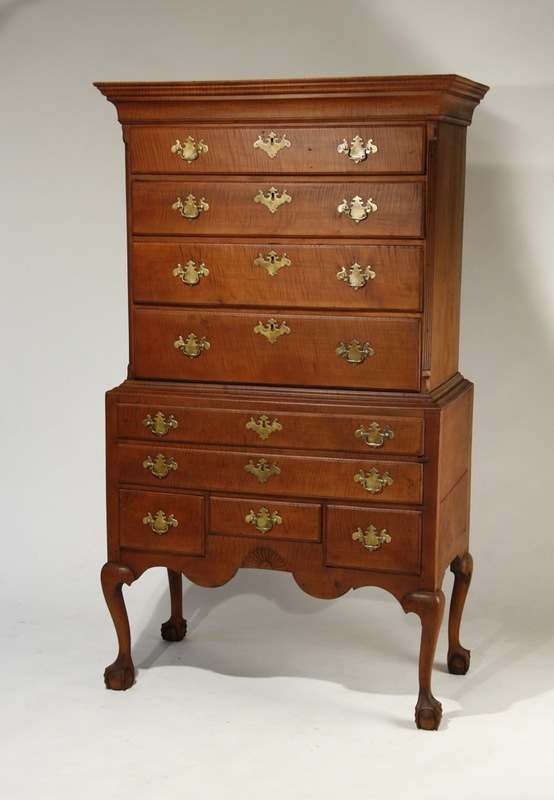 Queen Anne High Chest. Cherry in original surface with original brasses. 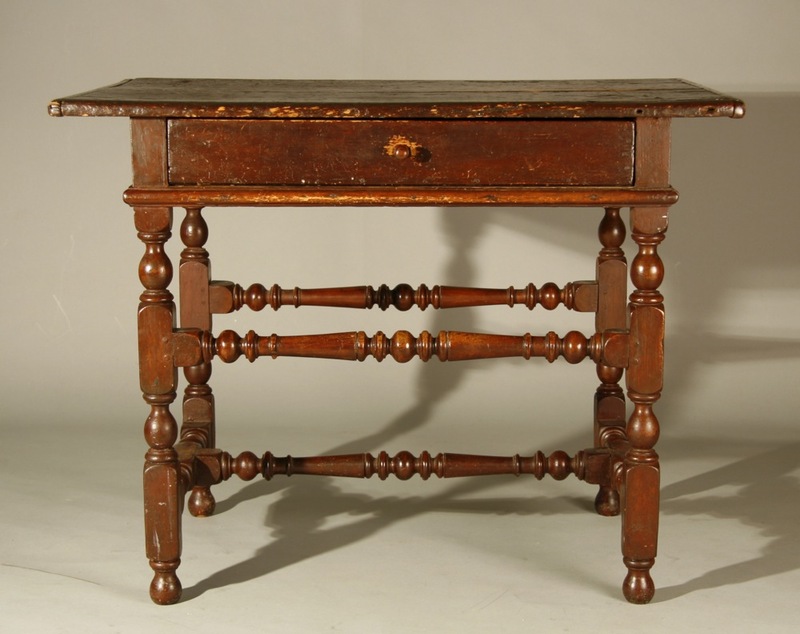 Extremely rare New England example with trifid feet. 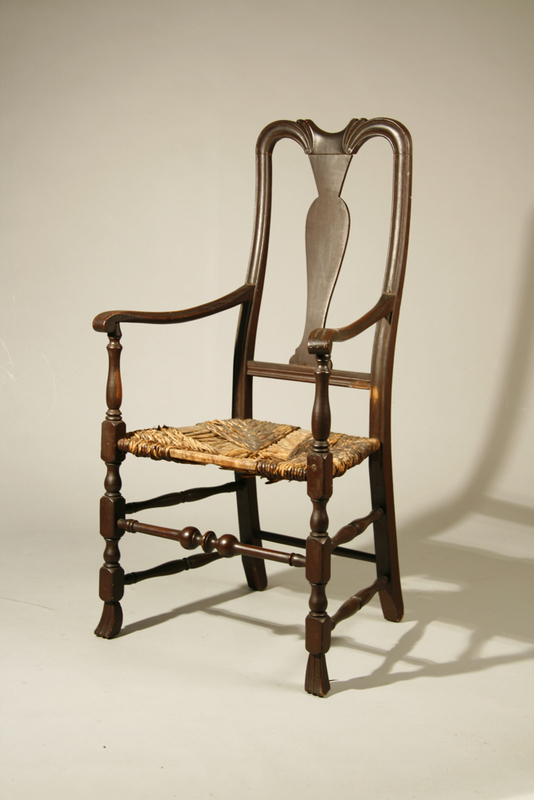 A very fine comb-backed windsor armchair with shaped ears and seat, and with bulbous, vase and ring turned legs. Perfectly proportined, with no repair or restoration. Probably MA, possibly CT, c.1785. Originally painted a grayish black, then red, now in a crackled old black surface. 46" ht, with 18 1/2" seat ht. 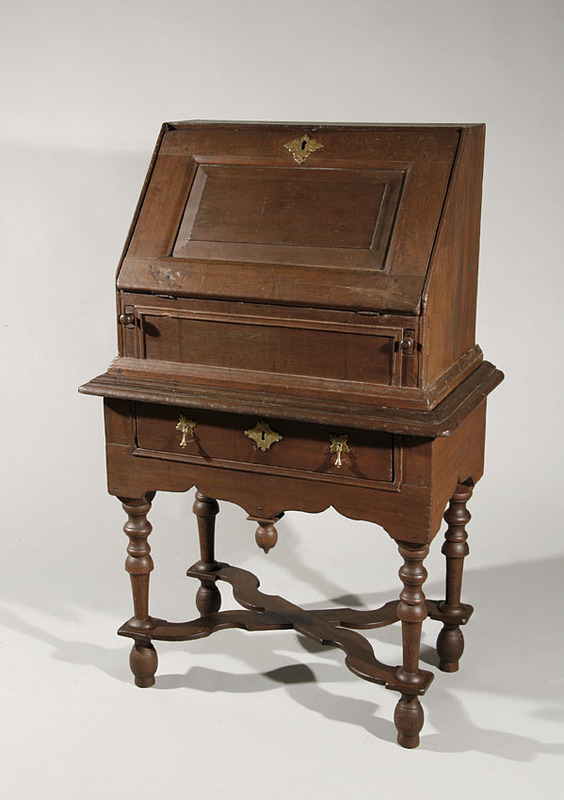 A reverse-serpentined Chippendale desk made of the finest mahogany--with oversized ball and claw feet, perfectly-carved scallop shell center drop, oversized original brasses, blocked and shell-carved interior with three fans, carved flame-topped document drawers, and rare mirrored prospect door. 'As descended' condition, with original surface and great presence. North Shore, MA, probably Salem, c.1775. A rare combination of form, condition, and surface, and the finest of its type that I have owned in over 40 years. 41 3/4" width, 44" ht. There is an obvious crack in the lid at one hinge. 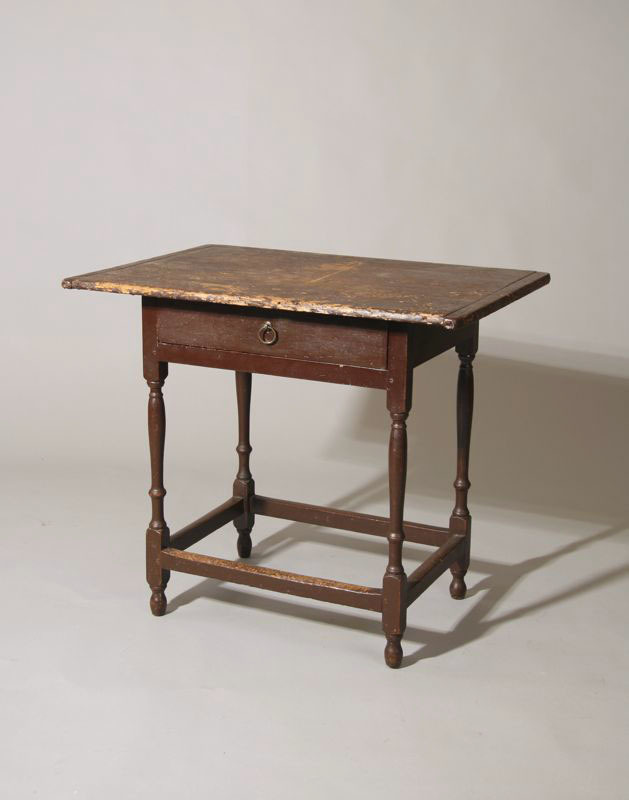 A very fine country Queen Anne drop leaf table with a terrific scrubbed top. 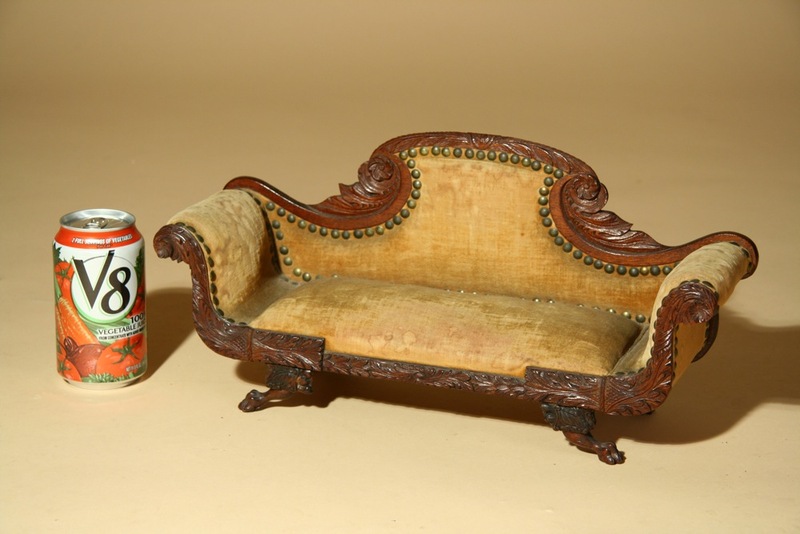 Retains original thin red paint on base. Great style and proportion--and with no repair or restoration. 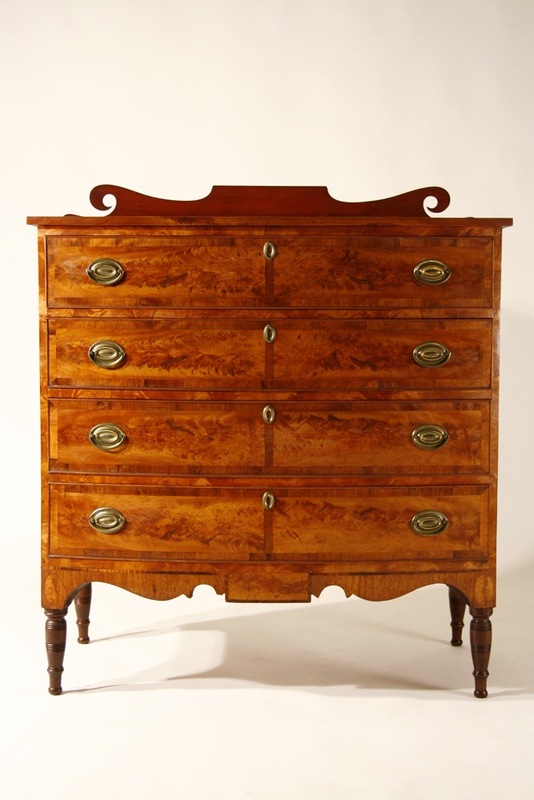 Tiger maple and chestnut; eastern CT or RI origin, third quarter, 18th century. Top 46 1/2" x 45 1'2", 27" ht. 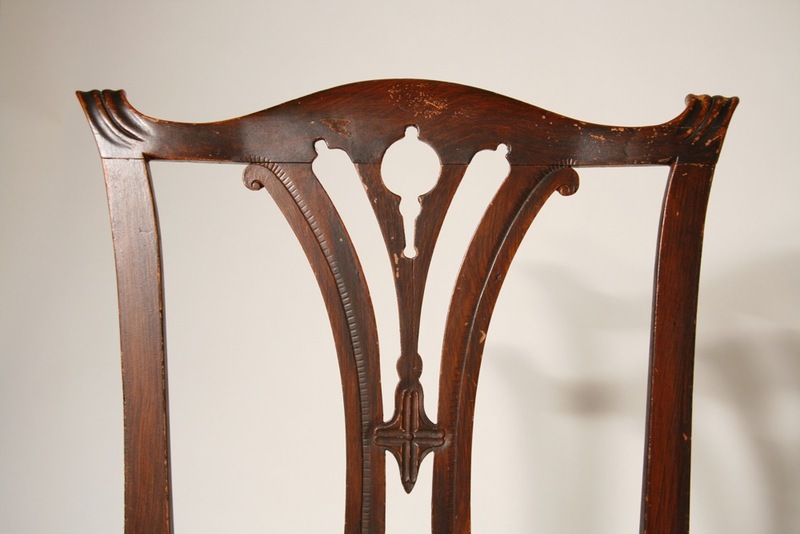 An exceptional New Hampshire Chippendale corner chair with shaped crest and arms, pierced splats with central heart, deeply-carved and shaped skirt, molded stretchers and molded legs. Walnut throughout in what appears to be its original surface. 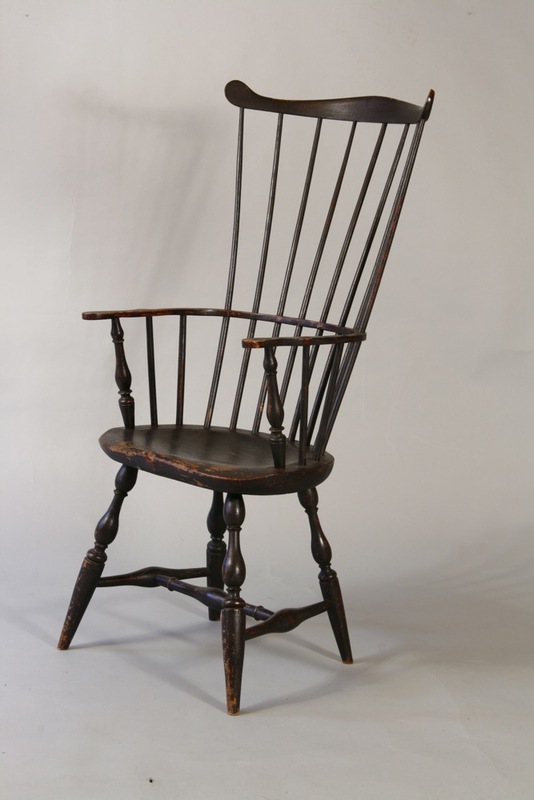 Small in scale and boldly proportioned, this is the finest chair of its type that I have seen- a classic piece of New Hampshire furniture. Southeastern NH, c.1790-1800. 32 1/2" ht, 17 1/2" seat ht. There is an old glued crack in the right (facing) arm and the rush seat is modern. 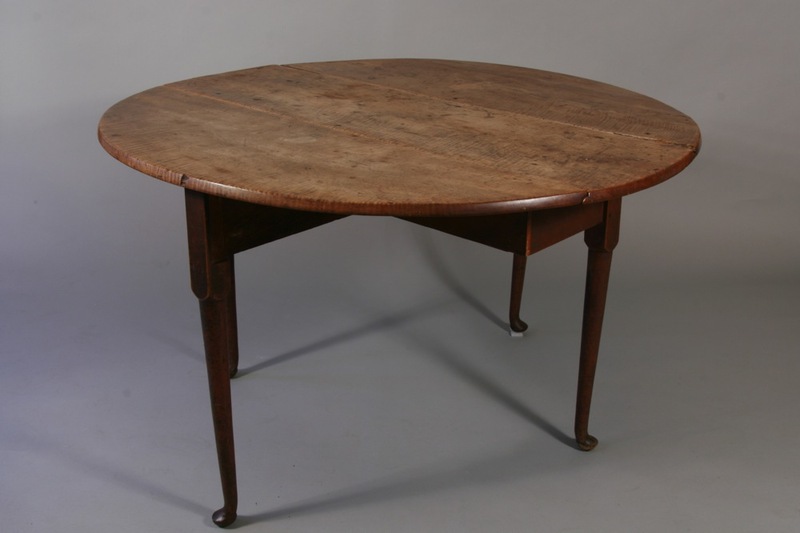 A very fine country Queen Anne tea table with scrubbed oval top, molded-edge frame, and double-splayed legs ending in 'hocked' pad feet. Perfectly proportioned, with no repair or restoration. Originally painted a deep red, then grained, it now has a thin coat of brown/red paint. Birch, 3rd quarter 18th century. Probably northeastern MA or NH. Top 23" x 34 1/2", ht. 26". 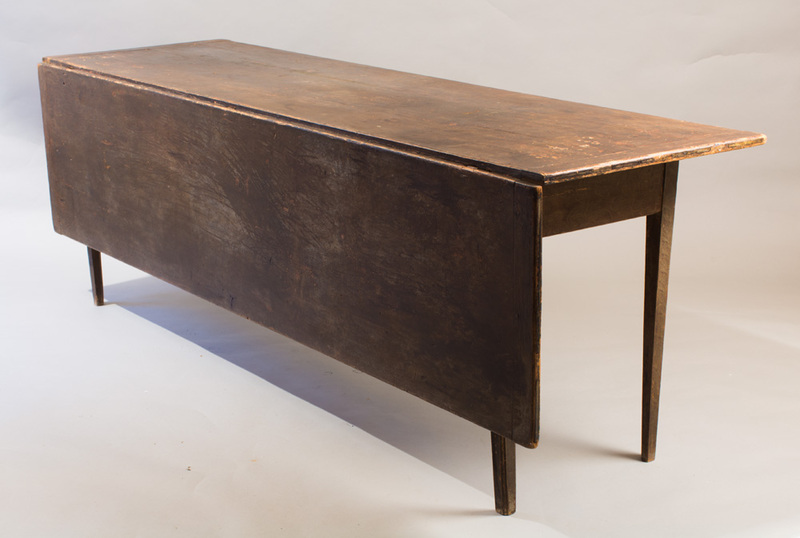 I purchased this table at the Roger Bacon sale in 1982, and it has been in two private collections since that time. Re-purchased from the collectors to whom I had sold it in 1997, this remains the finest sausage-turned corner chair that I have owned. 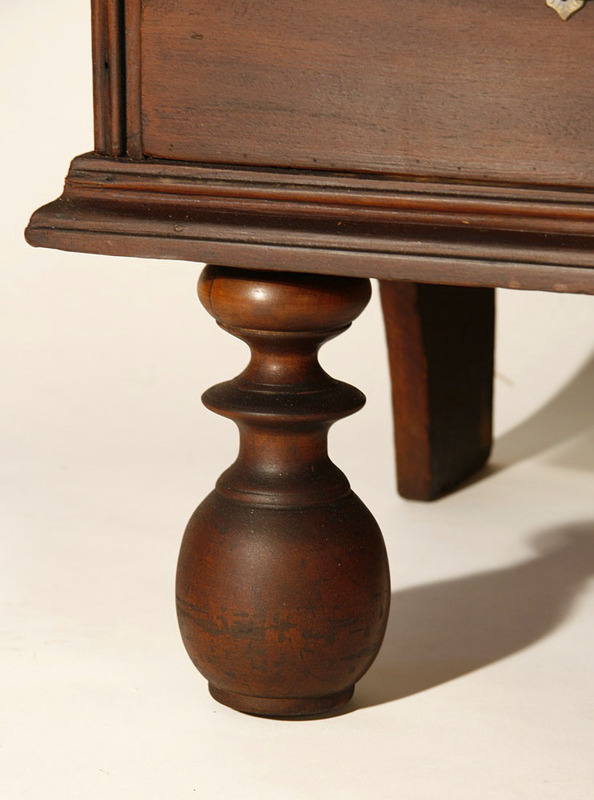 Great proportions, bold turnings, full feet-- and the finest original surface and condition. 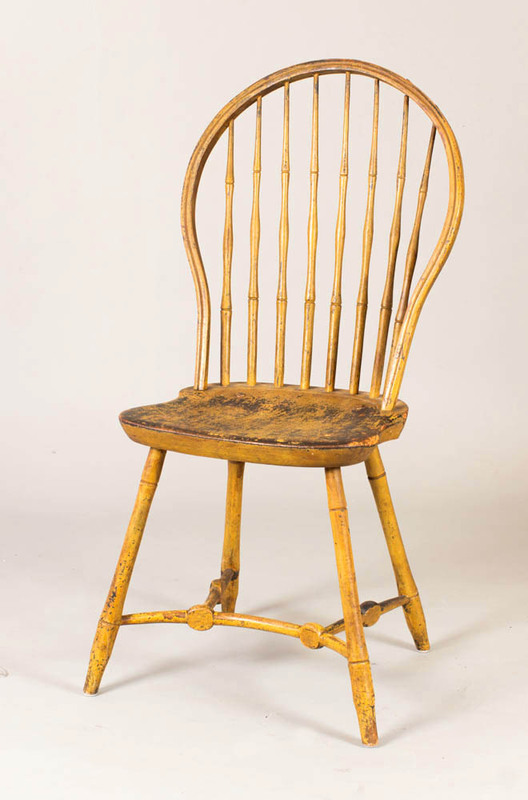 Maple and ash, probably eastern MA, c.1720-40. 32" ht., 17 3/4" seat ht. 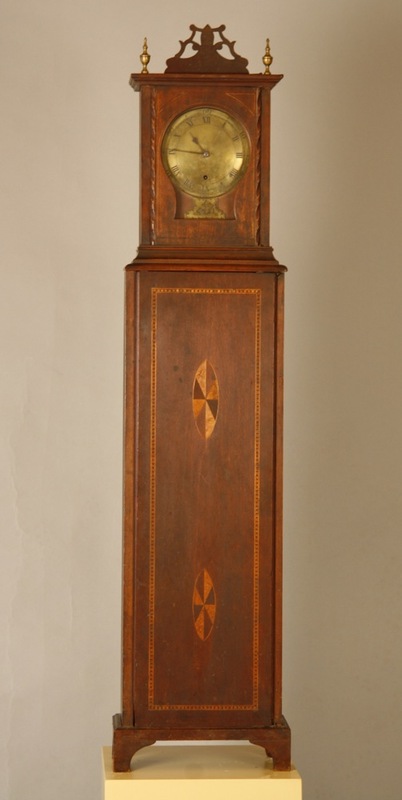 A remarkable country Federal tall clock with wooden works. This tour de force of country cabinetry includes a 'blocked ' base, inset turned and spiral carved decorative elements recessed into panels beside the case and hood door, applied carved ovals on the hood, and a scrolled top to the hood which is both serpentined and carved along its front edge. An individualistic architectural statement in what appears to be original thin brown stain with black highlights. Butternut, poplar, and red pine case in worn, 'as found' condition. CT origin, c.1825. 85" ht. The finest tavern tale that I have owned. Maple and pine, with perfect proportions, great turnings, splayed base, full feet-and great surface quality. MA or CT, c.1730. 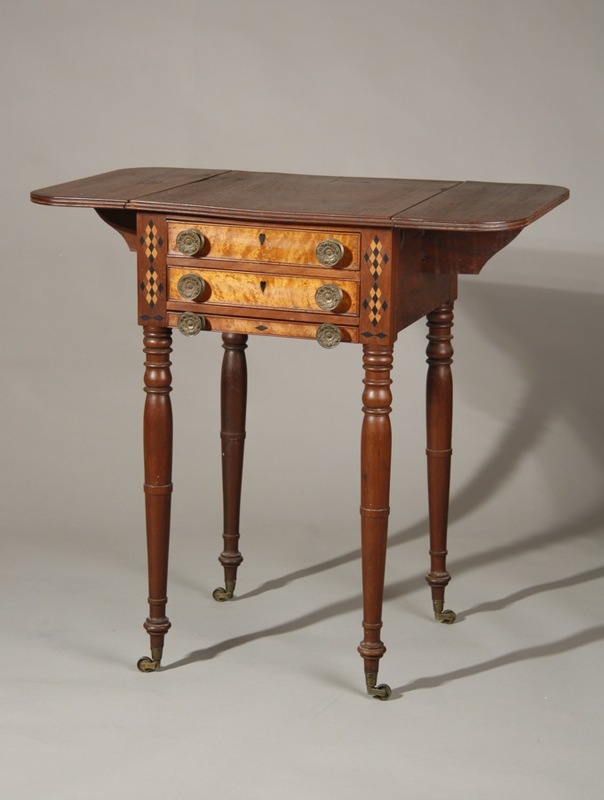 An exceptional Rhode Island gateleg table with superb turnings, original drawer and full feet. Oversized-53" x 60 3/4", 29" ht, and in an old dark varnish surface. The top board and one leaf are old, probably 19th century restorations. Just re-purchased from the collectors to whom I had sold in the 1980's, and pictured in Antiques and Fine Arts, Summer, 2013. A very rare grandmother or 'dwarf' clock purchased directly from the Dyer famly in 1989--and just re-purchased from the collector to whom I sold it at that time. Having a rare kidney-shaped iron dial with original floral decoration, and in a pine case retaining old black paint with gold striping. Works probably by J. Bailey. Full family history provided. So. Shore, MA origin, c.1815. 56" to top of finial.3. 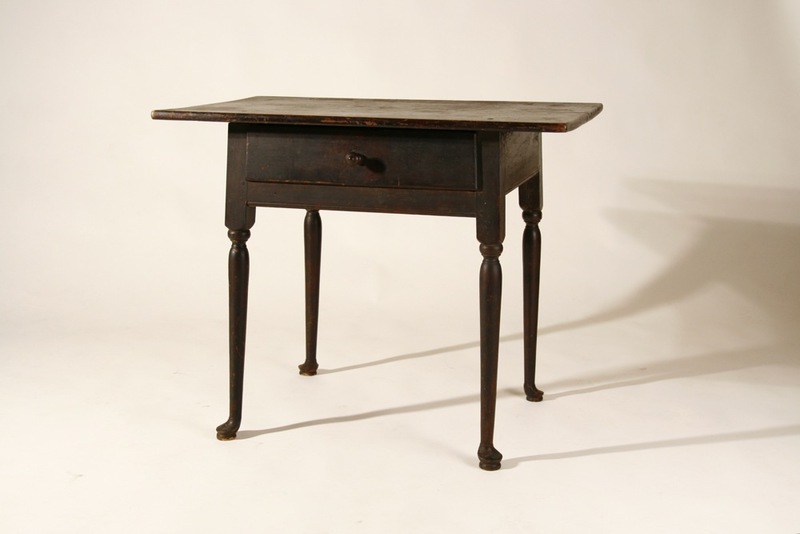 A rare and important Rhode Island 'gateleg' table with exceptionally well-turned legs and stretchers, in a large size, and in 'as descended' condition with great surface- a dramatic scrubbed top and old black paint over an original thin brown on the base. 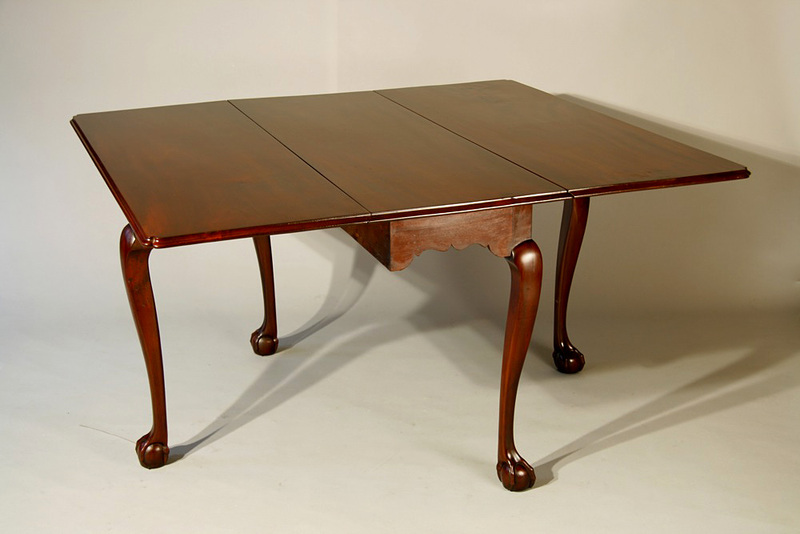 Tables of this quality rarely appear on the market, and this example has been in a private collection since 1983. Maple, with oak and pine secondary woods. Top 50 3/4" x 57", ht.28 1/4". 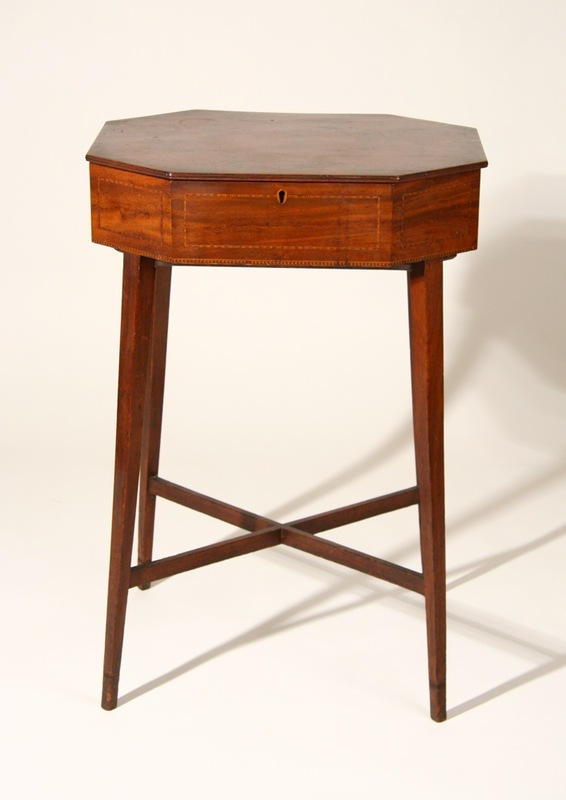 An exceptional Boston sewing stand with octagonal top, two fitted drawers in case, turned legs, a 'tamboured' sewing bag, and standing on its original casters. 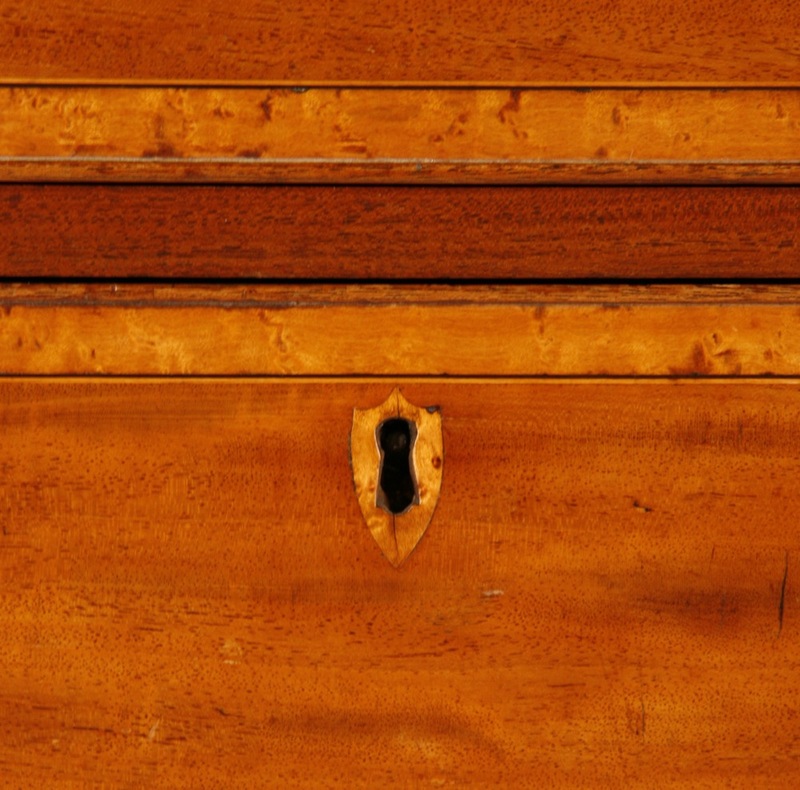 The top and sides of the case, and the drawer fronts are veneered with spectacular bird's-eye maple. 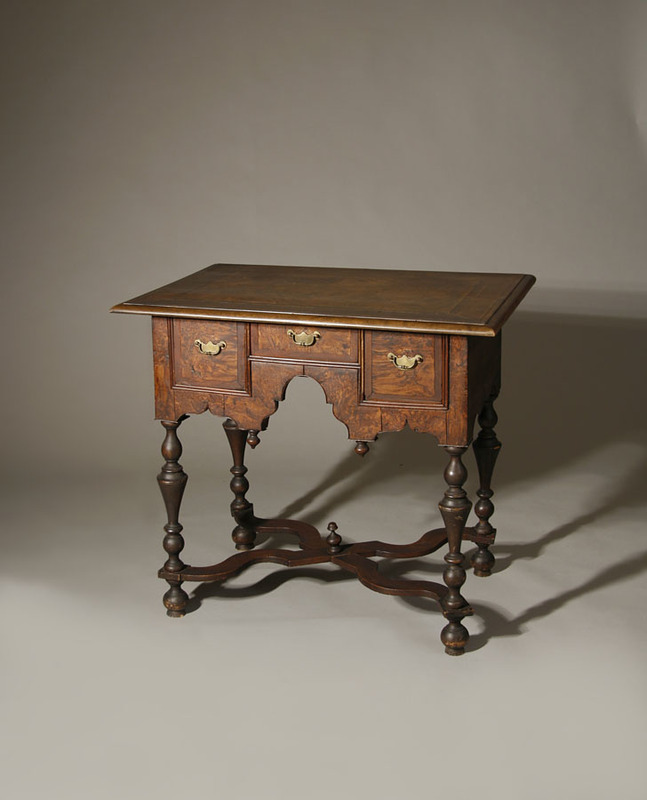 With patterned veneer on the cookie-cornered top, leafage-carved posts at the case, tiger maple legs, and a fully-carved wooden sewing bag-also of bird's-eye maple, and knobs which appear to be ebony, this stand has all of the 'bells and whistles'. 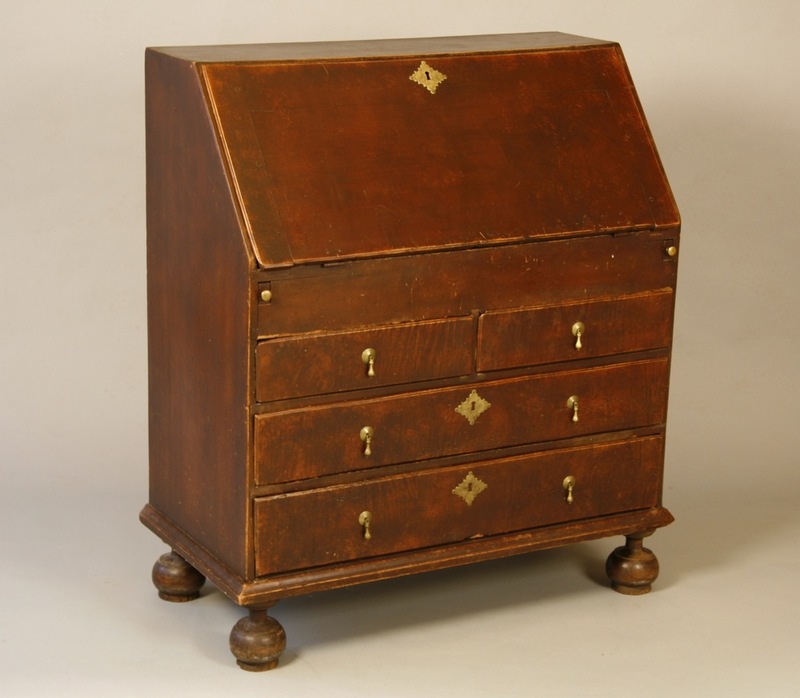 Beautifully designed and constructed, with mahogany secondary woods in the drawers, the top drawer filled as a desk with adjustable writing surface, the lower drawer divided into five compartments. The table comes with numerous sewing implements that were found in the sewing 'bag'. Boston, c. 1800-1805. 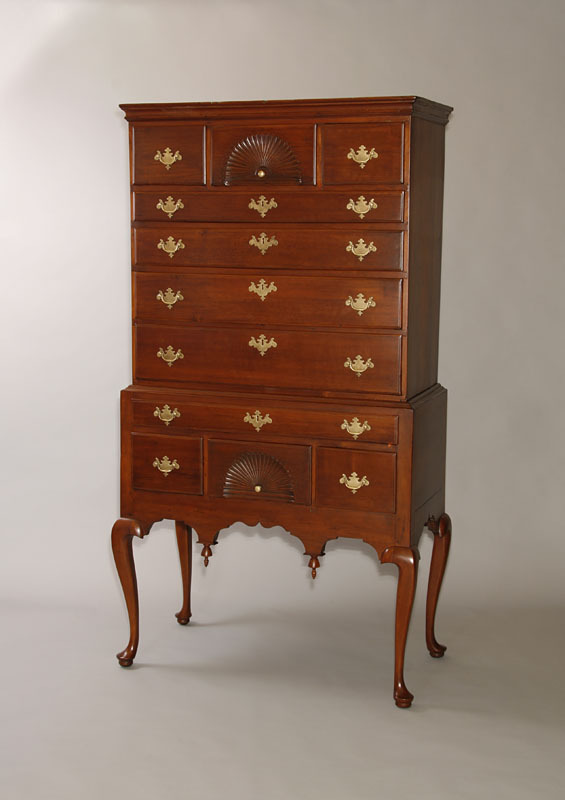 A Dunlap School Queen Anne chest on chest , or 'New Hampshire highboy', with fine proportions, and with deeply-carved fans in both top and bottom sections. Nicely-developed skirt and particularly delicate legs and feet. Birch, south-central NH, last quarter 18th century. Remarkably good structural condition (one knee return restored), and retaining its original brasses. 38 1/2" lower case, 77" ht. 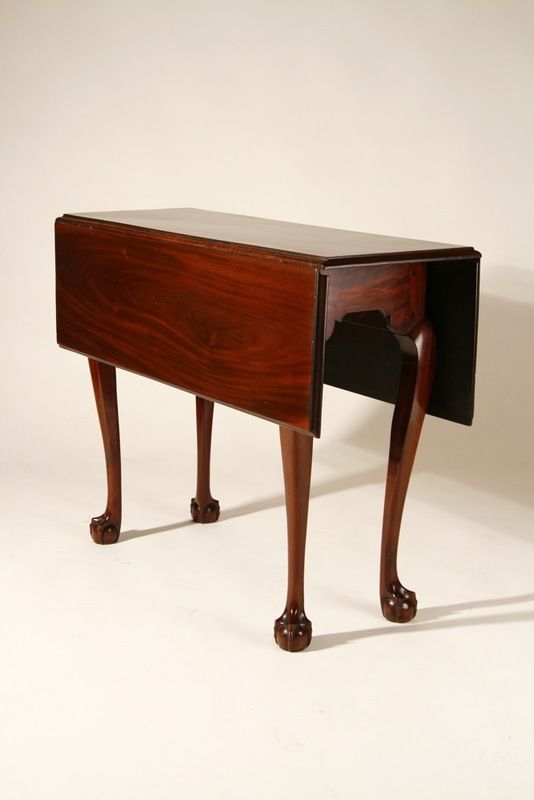 An exceptional Hepplewhite card table with rectangular top, two drawers in the facade, and with five tapering legs. 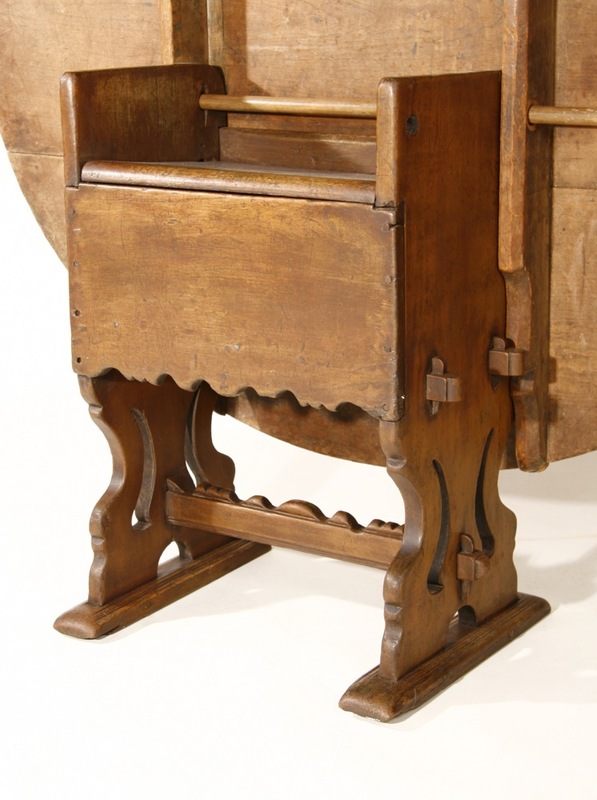 Made of cherry, with pine secondary wood, and retaining an old or original finish with orignal brasses. Rutland-Middlebury area of Vermont, c.1810. The finest of perhaps a a half dozen known examples, it has survived in remarkable condition. The edges of both the fixed and fly leafs are inlaid with mahogany diamonds-cut separately-and set within a maple strip that is then outlined with string inlay. This same pattern is followed across the frame below the drawers. 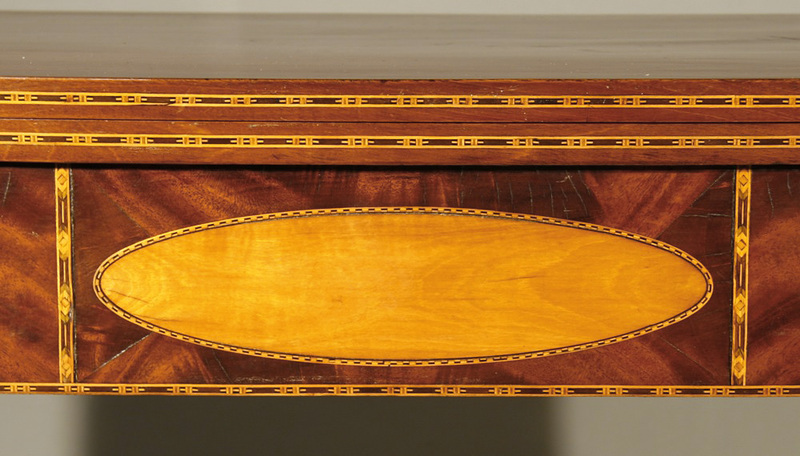 The drawers are cross-banded with mahogany and then with inset line inlay curved at the corners. 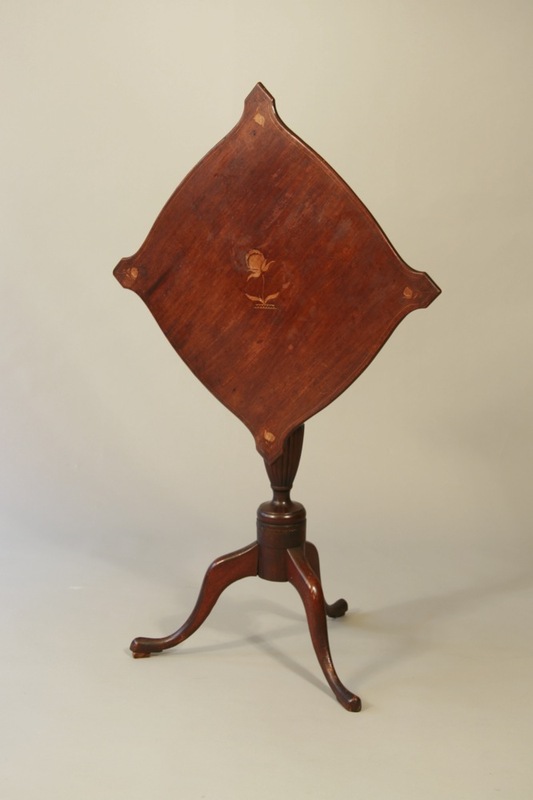 There are oval panels of mahogany set at the leg plinths and then 1/2 ovals inlaid just below the case. 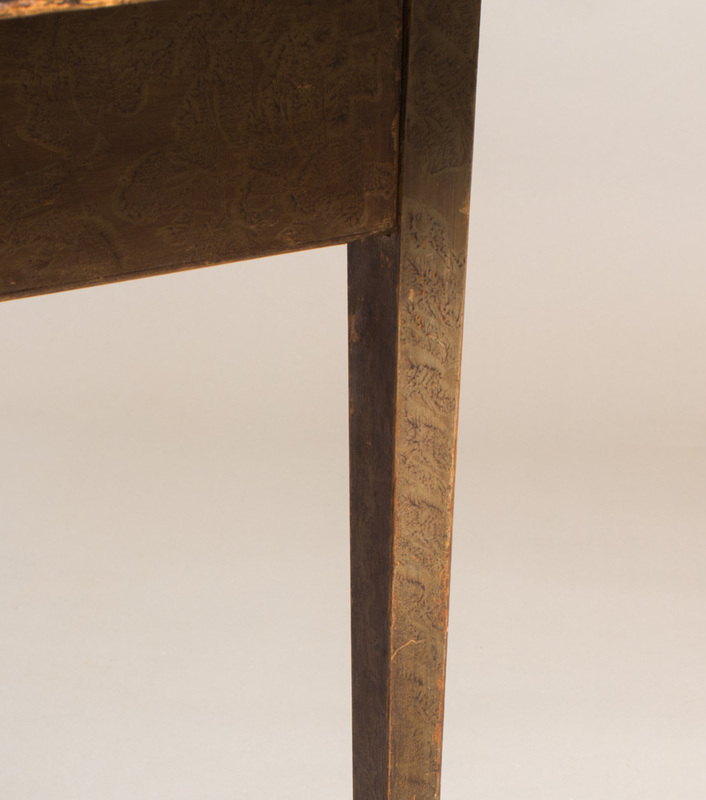 The legs are line-inlaid and cuffed with contrasting inlay. 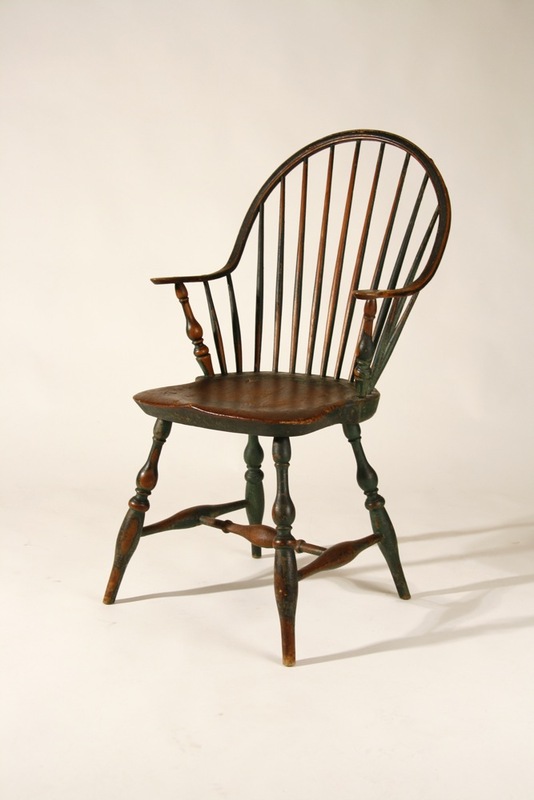 As described by Zorgy in The Best the Country Affords, Vermont Furniture 1765-1850, this design "creates one of the truly innovative Vermont designs of the neoclasical era". This example is 'the best of the best'. See Zorgy, p.40 for other examples and text. 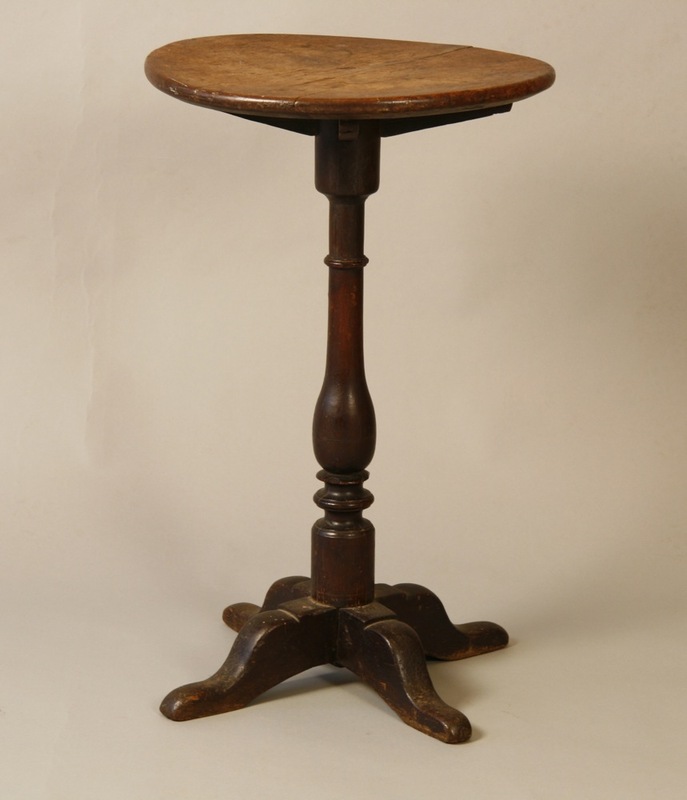 A very fine candlestand with tilting, serpentined top with squared corners, reeded urn-carved post, and tall cabriole legs. Made of mahogany, with birch cleats and block. Old, or original finish, with screws through cleats the only repair. South Shore, MA or Nantucket, c.1801-1816. 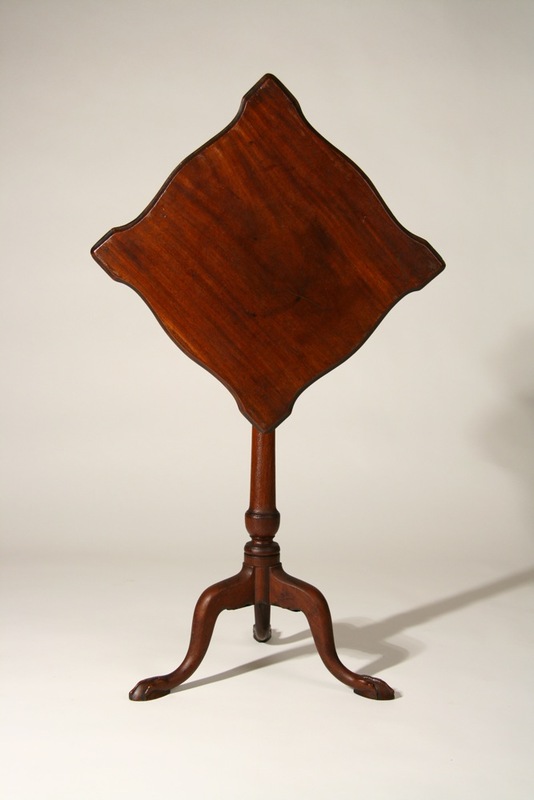 One of perhaps a dozen stands of this type known, this is the only example made of mahogany and the only one with inlaid roses at the center of the top and in each corner. 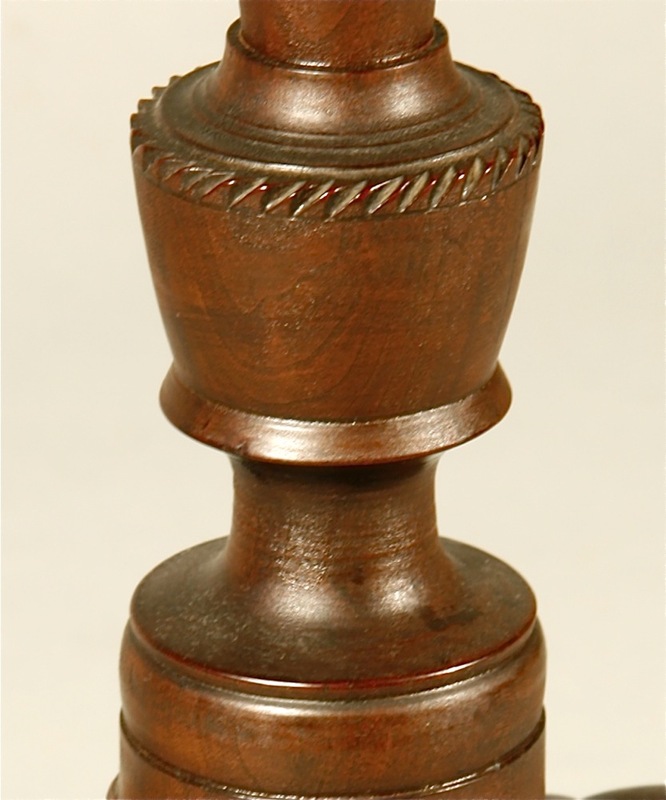 In addition, the reeded shaft and checkerboard inlay on the post below the urn are known on only this example. This is the finest of any example currently known. Stands similar to this example are described and shown as plate 52 and plate 75.2 in Harbor and Home, Furniture of Southeastern MA, 1710-1850 by Jobe, Sullivan, and O'Brien. 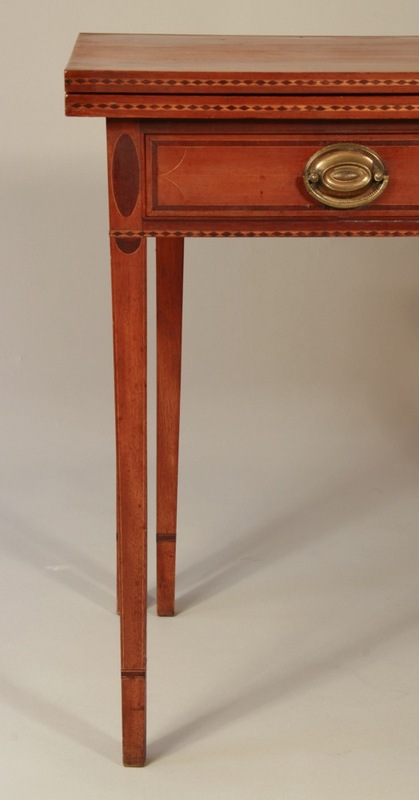 Based on identical inlay in signed examples of case work shown, this stand is attributed to Heman Ellis. 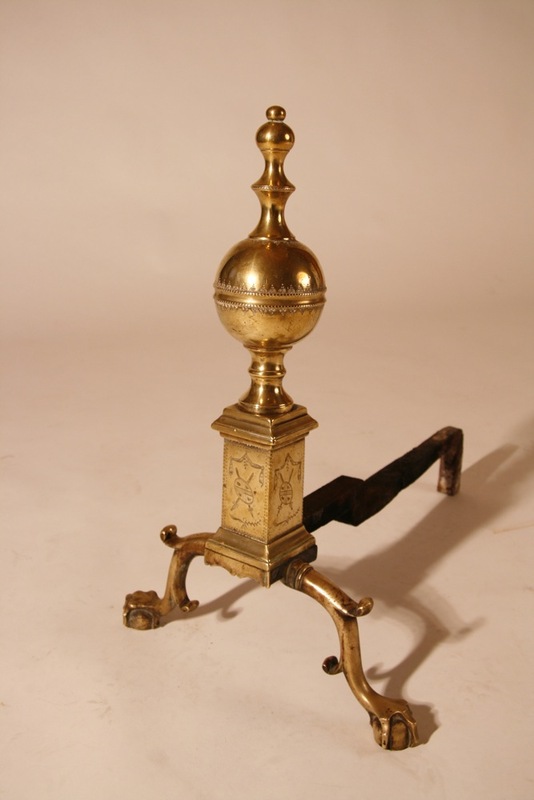 A rare and folky candlestand with molded edge top, ball-turned shaft and with scrolled legs terminating in defined bird's heads. Cherry, in old red paint over a decorated surface with gilded highlights. From an old PA collection. Probably PA, c.1800-1820. Top 13" x 14", 29 1/2" ht. An exceptional William and Mary tall clock in undisturbed surface, 'as descended' condition-with full sarcophagus top and original finials. 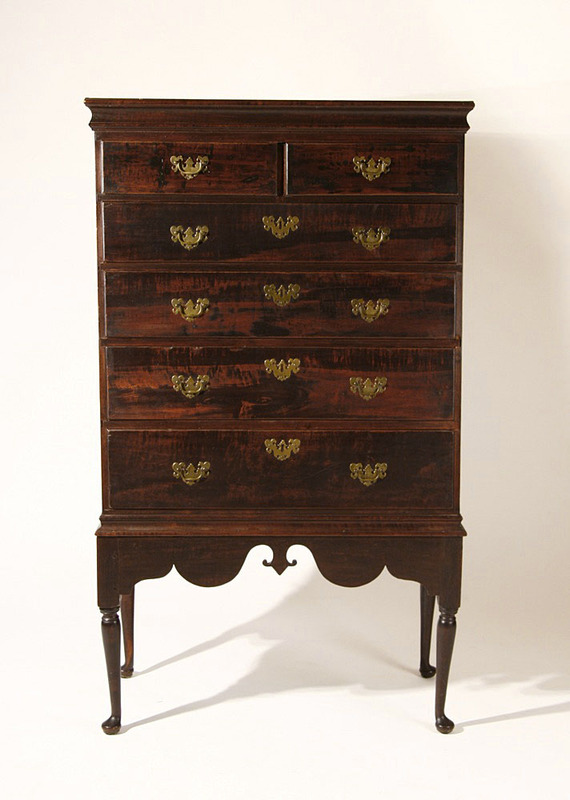 Made and signed by Jonas Fitch, Pepperell, MA c.1770. Only about a dozen tall clocks by Fitch are known-and this is the most fully-developed case of any of his early examples. A remarkable survival! Cherry, with pine secondary wood. 98"ht. 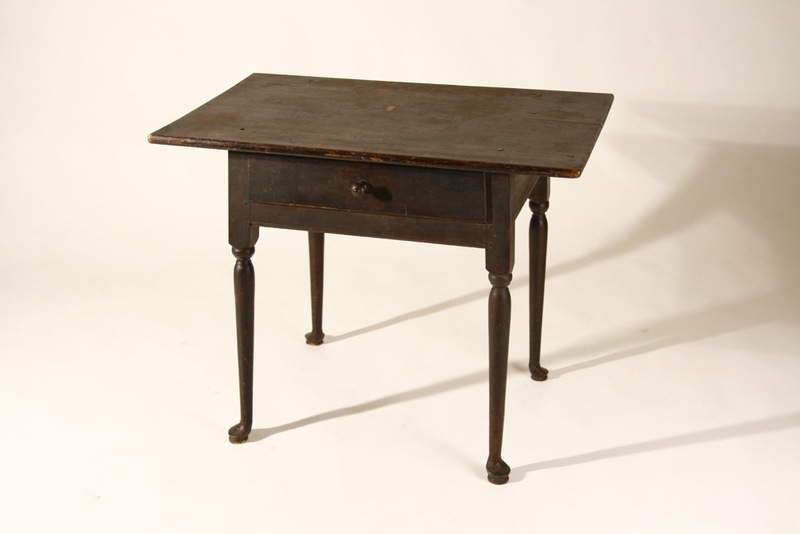 A very fine William & Mary gate leg table with the finest turned legs and stretchers, original hinges with leather washers and rose-headed nails, original knob and drawer, and retaining its original brownish-red stained surface. Top 48" x 59", ht. 28 1/2". Cherry, with oak and poplar secondary woods. Probably eastern CT, c.1720-30. 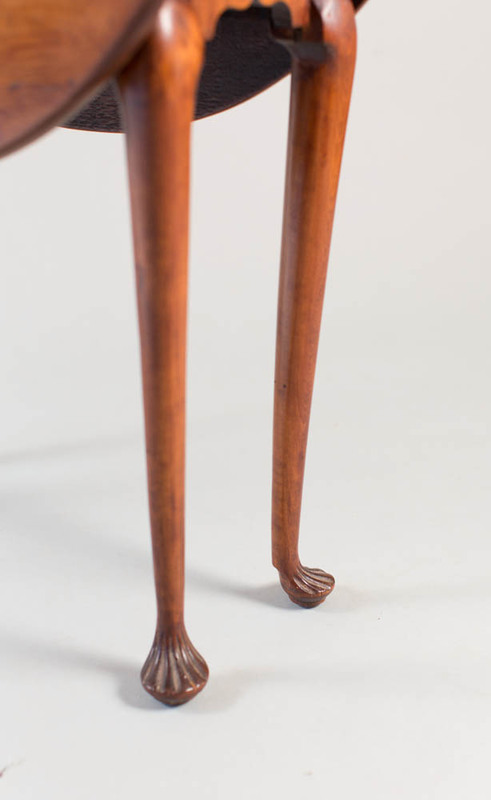 This exceptional table, with a deeply-ovaled top, and crisp and bold vase and ring turned legs and stretchers-with full feet, has survived in remarkable condition. Other than two 'butterflies' attached under the two board leaves it has had no repair or restoration--in nearly 300 years! 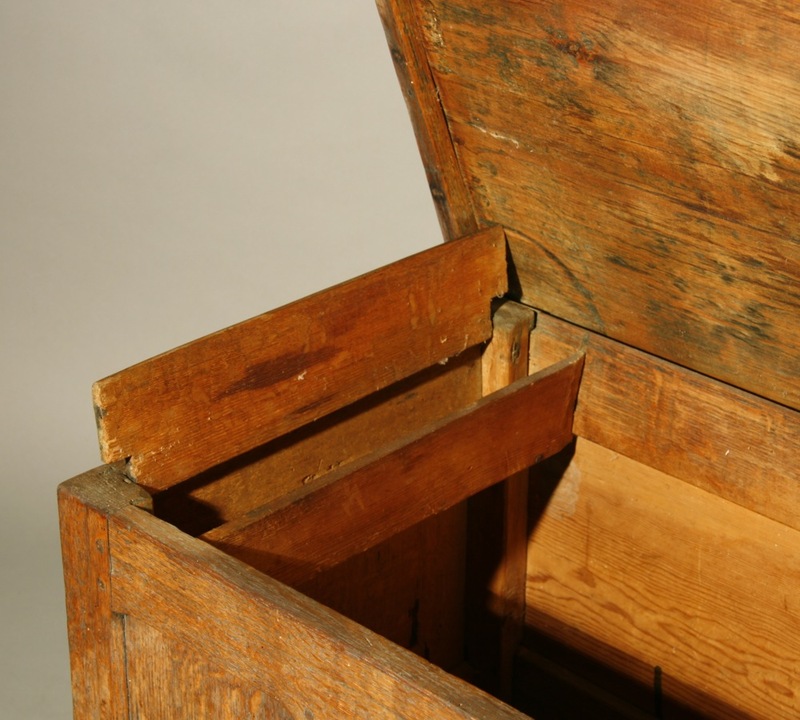 There is a shrinkage crack in one leaf and a drawer divider was added in the 19th century. 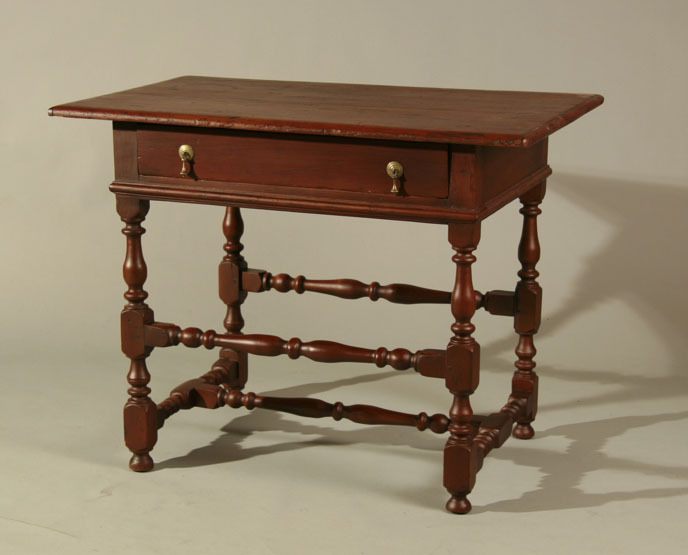 Large gate leg tables are rare, and have always been considered a 'foundation stone' in any great collection of early American furniture. 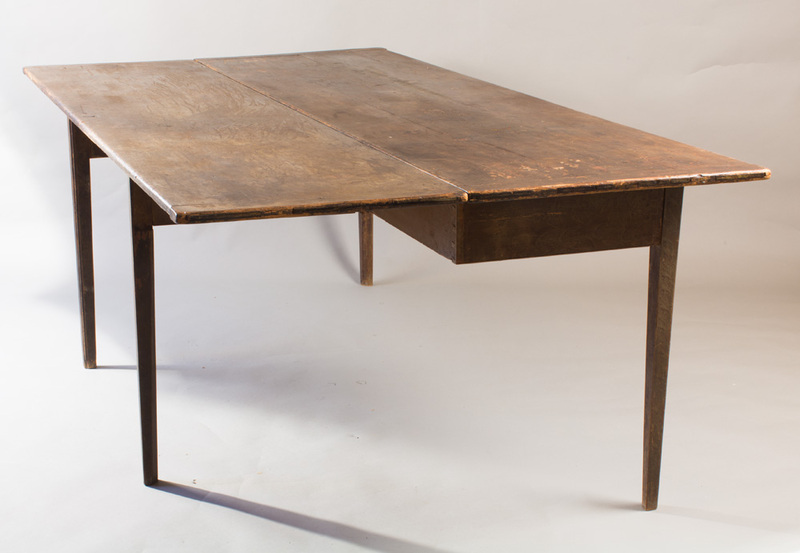 This table's combination of form, condition, and surface is unrivaled in my experience. 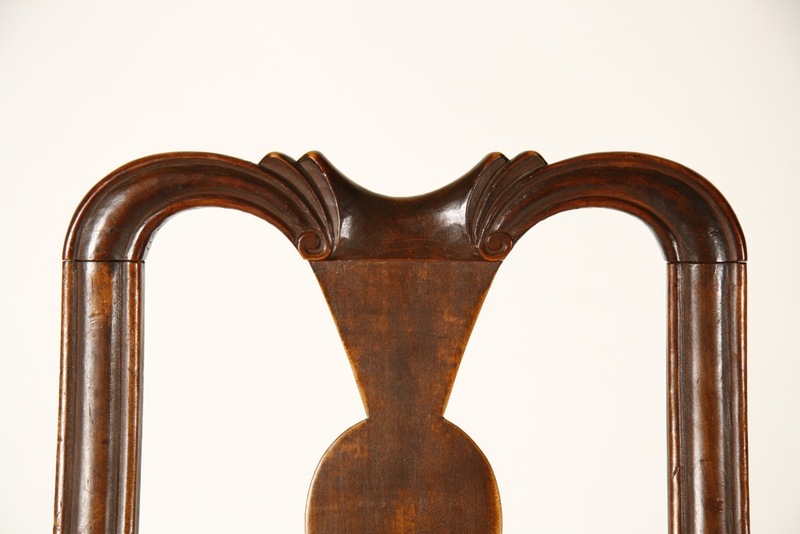 A very fine Boston area, c.1760-75, Queen Anne chair with a particularly fine splat creating a 'parrot's beak' back. 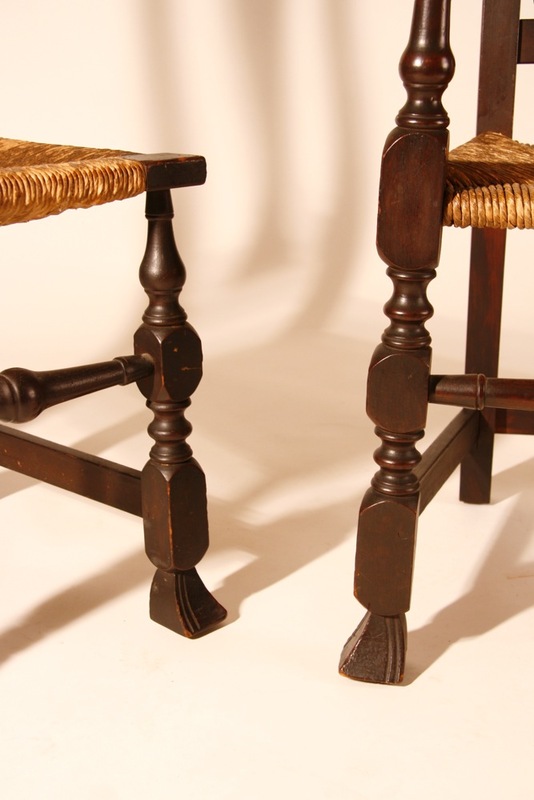 Molded stiles, balloon seat, bold cabriole legs ending in pad feet. Walnut, in an old, probably original, surface. Original maple seat frame. No repair or restoration. 40" ht. 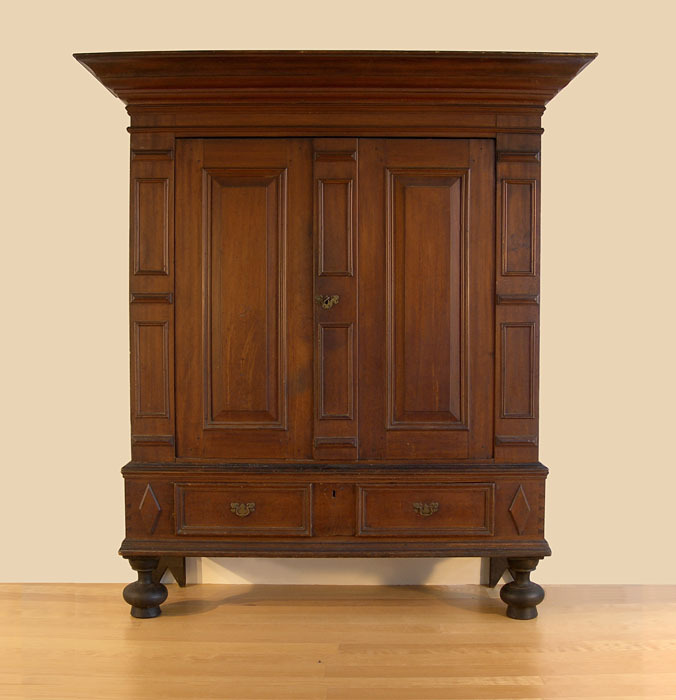 A very fine gumwood kast with bold cornice molding, paneled doors, applied ornament on case, and original bulbous feet. Small in size, beautifully scaled, and retaining a great old, or original, surface and original brasses. Hempstead, LI area, c.1750-70. Very minor repair. See American Kasten, p.63, for nearly identical example. Case width 55 1/2", crown width 68", ht. 76". 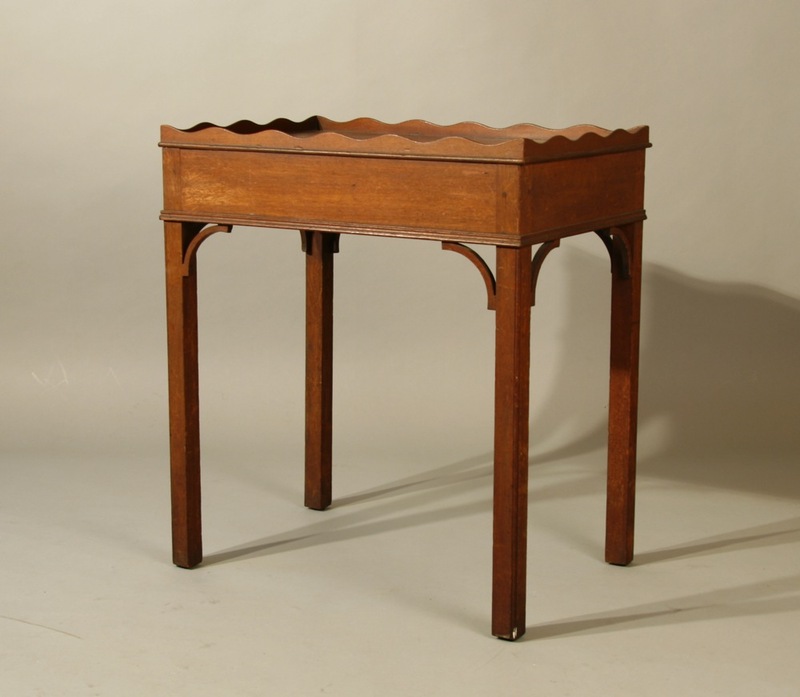 A rare 18th century carved box with bands of sheath molding on the front and rear of the top, an applied notched front fascia to the top, notched corners to the case, and original cotter-pin hinges. 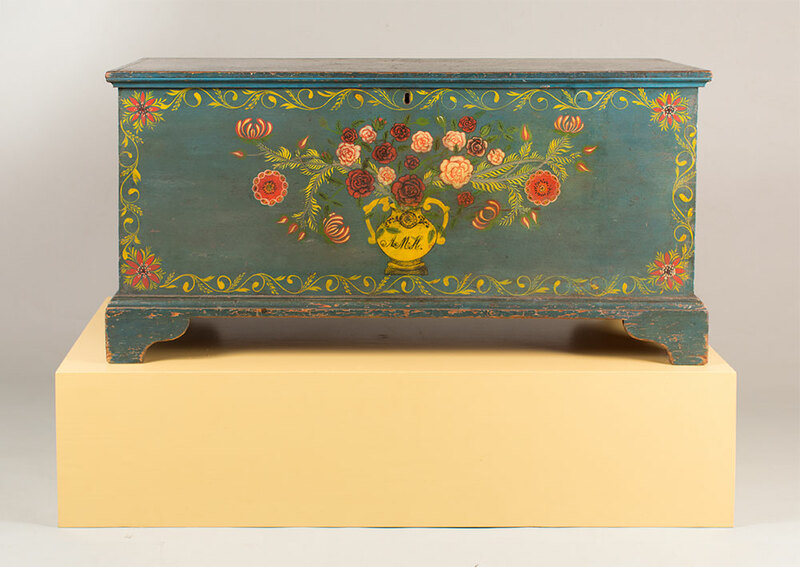 Made of walnut, and in original surface, this box is most noteworthy for its fully-carved front with two varieties of flowers--in original yellow and green-- connected by undulating snake-like vines, all on a fully-punched background. 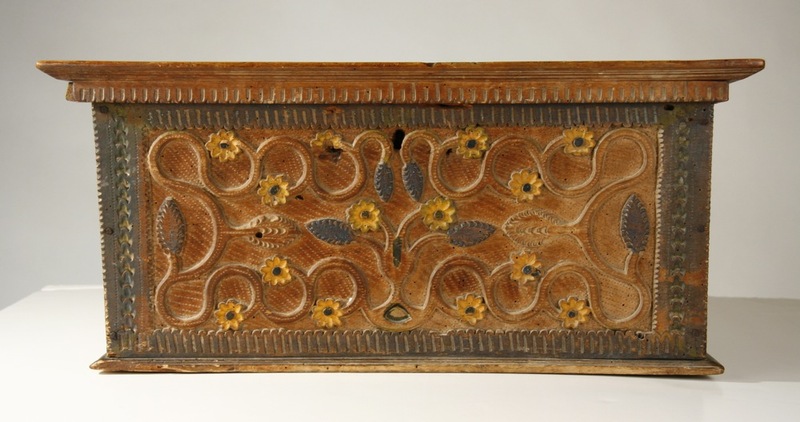 The origin of this box is unknown, but it is thought to be central European. Case 10 1/2" x 21 3/4", 11 1/2" ht. 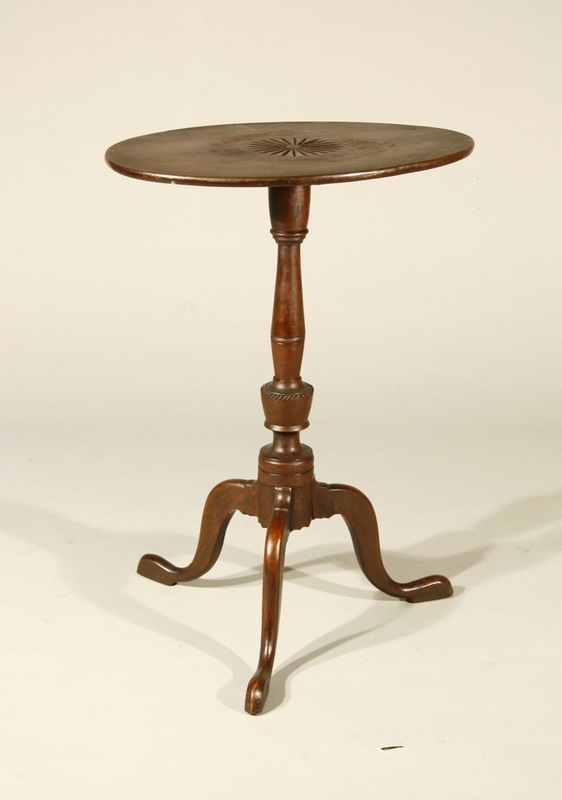 A country Queen Anne candlestand with thin oval top, urn-shaped shaft, and tall, graceful cabriole legs. The center of the top is carved with a sunburst and the top of the urn is chip-carved. Cherry, in an old dark finish. Probably CT River Valley origin, last quarter, 18th c. From the Wm. Hubbard collection. Top 20" x 14 1/2", 27 1/2" ht. 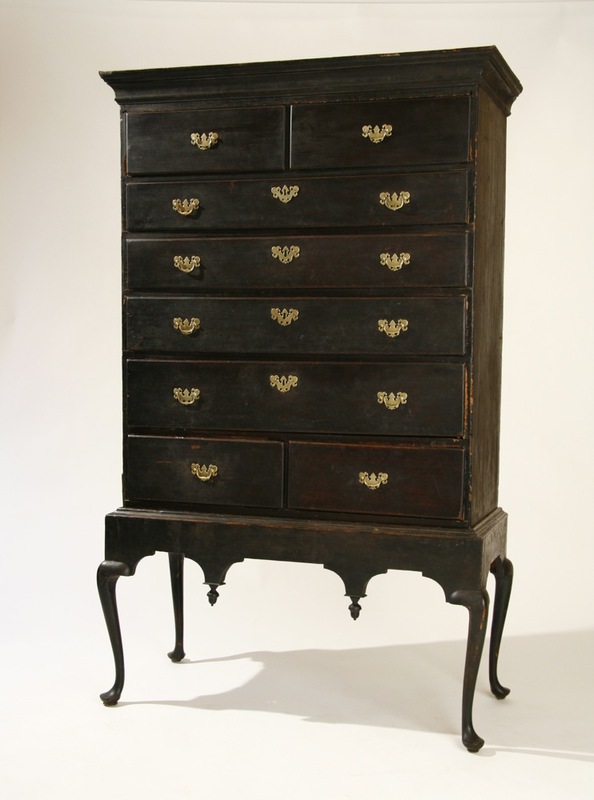 A rare Boston dressing chest. Exceptional design and carving, and in old surface with original brasses. 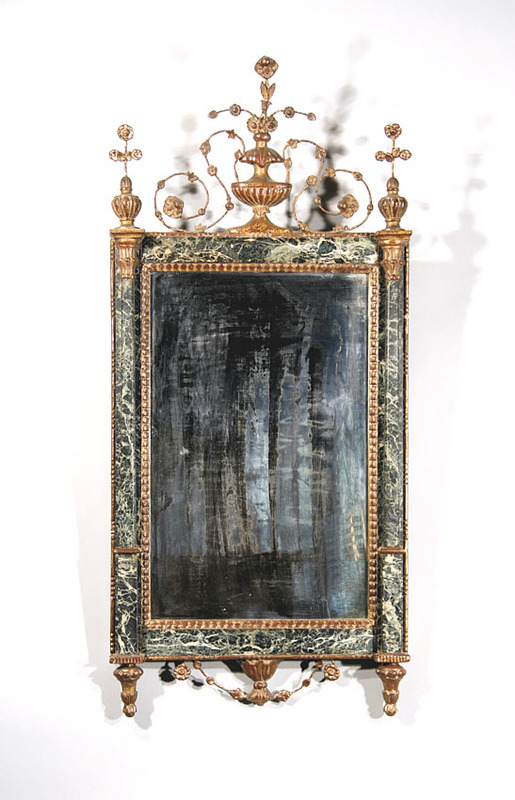 Attributed to Thomas Seymour, while working as foreman of John Barker's, Boston Furniture Co., 1818-1819. Attribution by Robert Mussey. 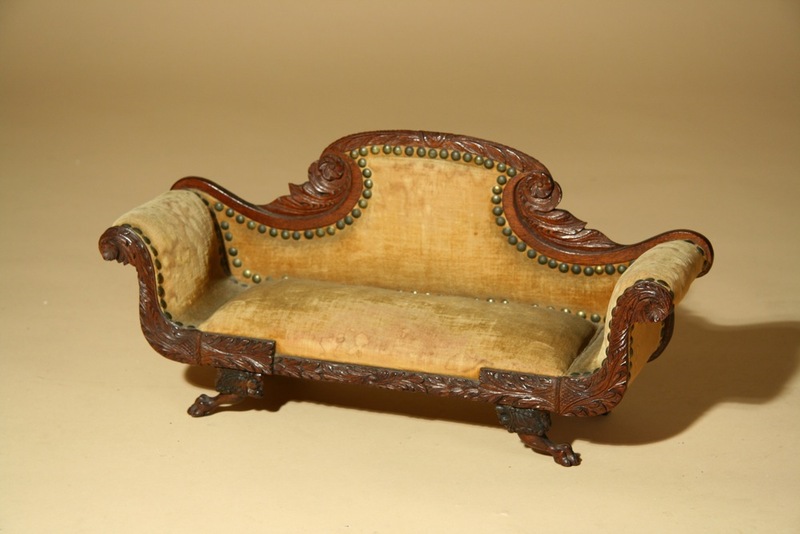 Mahogany, with choice mahogany and mahogany veneers, impeccable construction, and carving probably by Thomas Wigthman. Case width 39”, height 76.5”. 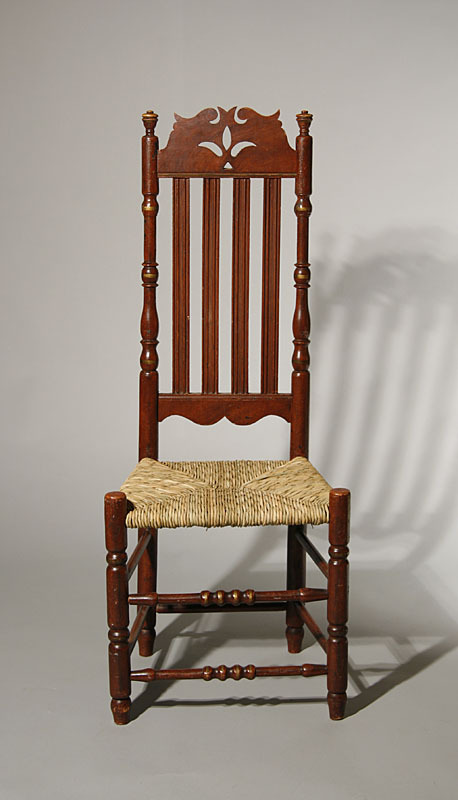 A dramatic fanback Windsor sidechair with superb turnings and exceptional splay to back and legs--set off by the narrow, heavily-chamfered seat. 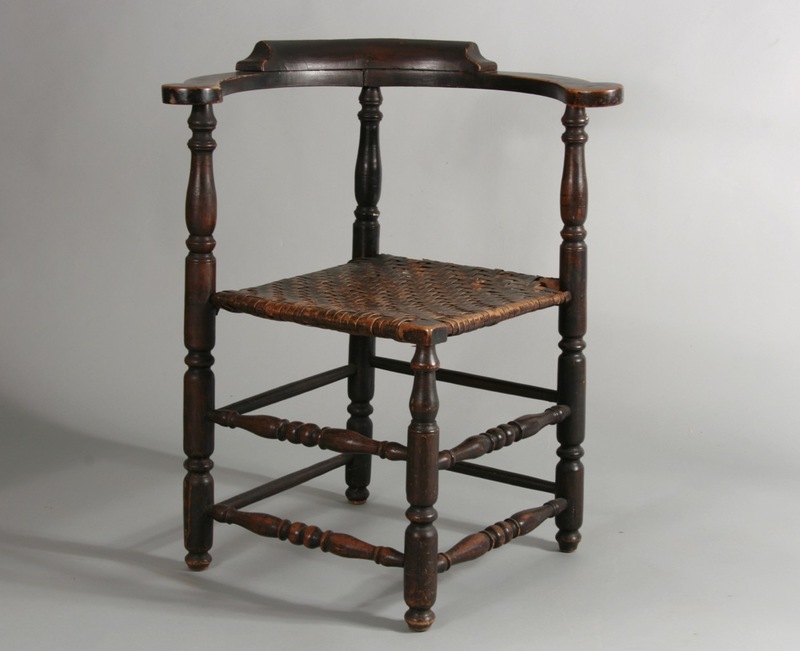 Maple and ash, with pine seat in 19th century, heavily crackled varnish or shellac. CT origin, 1775-1785. 38" ht, 18" to pommel of seat. Seat is 14 3/4" wide, splay of front legs is 24 3/4". 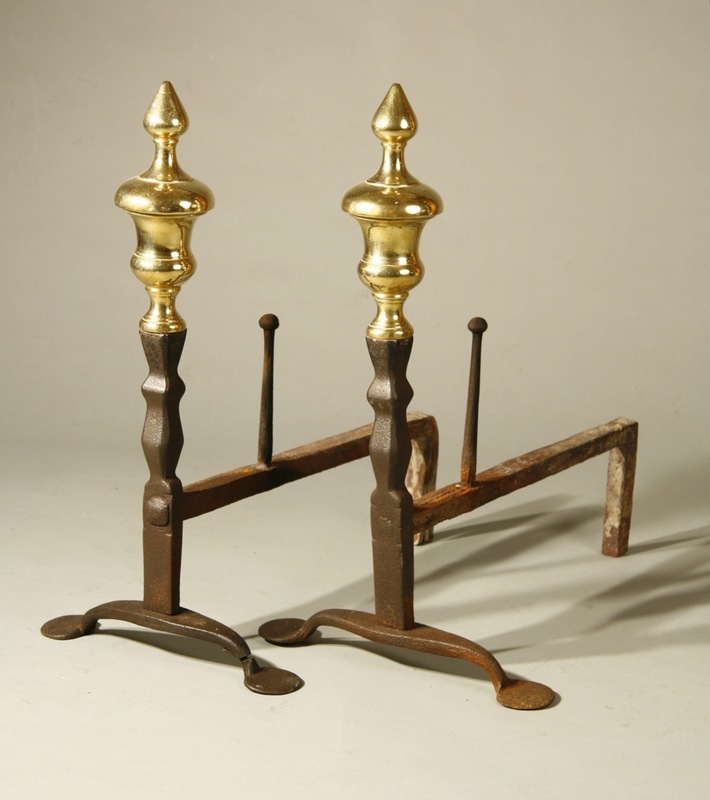 A rare and unusual pair of early to mid-18th century brass and iron andirons with large penny feet, shaped shafts terminating in great bulbous finials with flame tops. Probably English, possibly low countries. 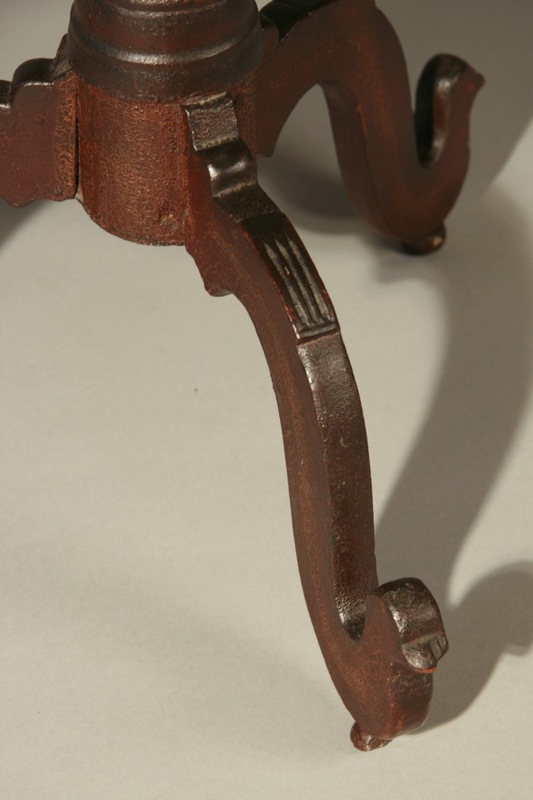 There is an old, hand-wrought repair to the bridge of one andiron. 23" ht. 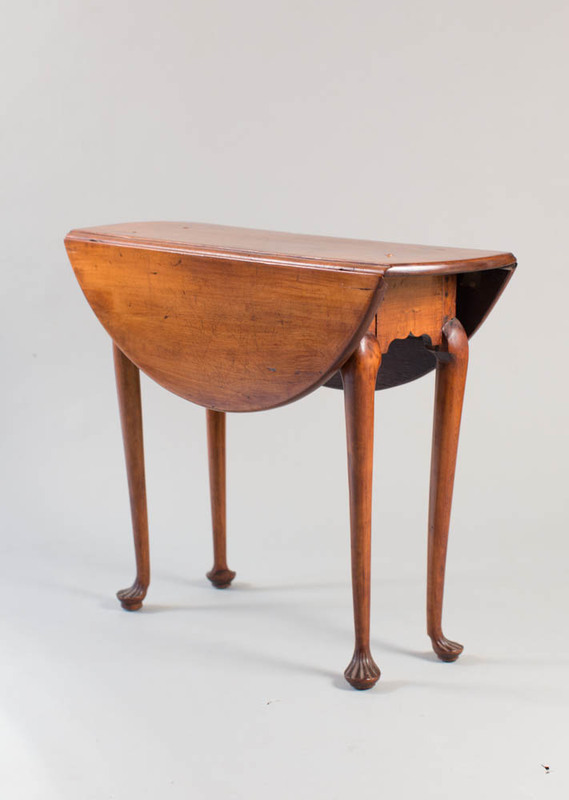 A very rare, probably unique, transitional tea table with tray-molded top, sharply-creased knees turning into elegant fluted trumpet legs. Sycamore and birch, central CT origin, c.1740. I first purchased this table in the early 1980's, and advertised it in The Magazine Antiques in July,1983 and have re-purchased it twice since that time. Top 21 1/2" x 31 1/2", ht. 27 1/2". 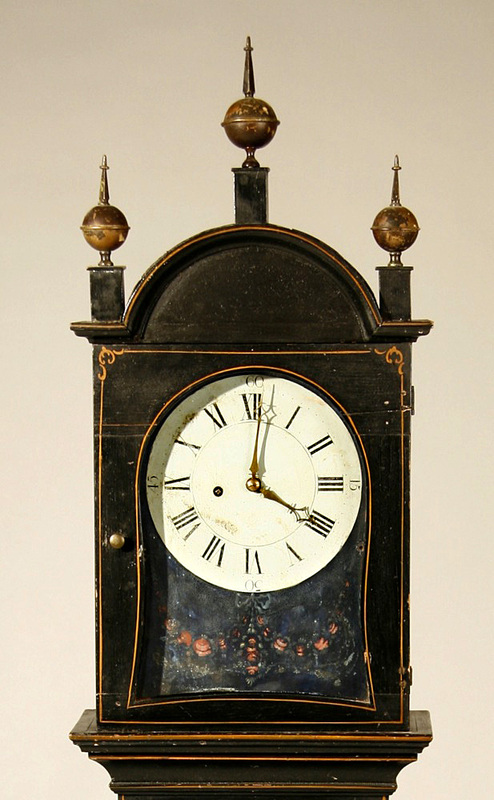 A rare, perhaps unique, lyre clock--with alarm feature, made and signed by Joseph Dyer, working in Middlebury, VT, c.1825-30. 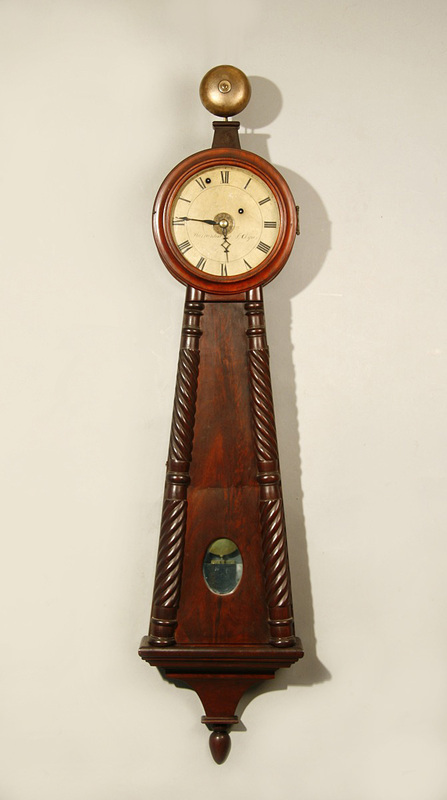 The mahogany case, with round dial, flared center section with applied split columns, and pedimented base is in a rich old surface which appears to be original. 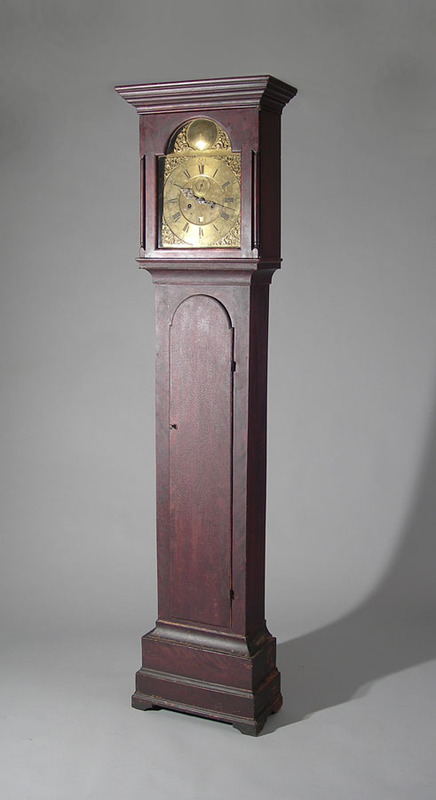 Dyer was an apprentice of Lemuel Curtis in Concord, MA, then worked with John Sawin, with whom he patented the lyre clock, based on the Willard's movement design. Mahogany and pine, 51"overall ht. 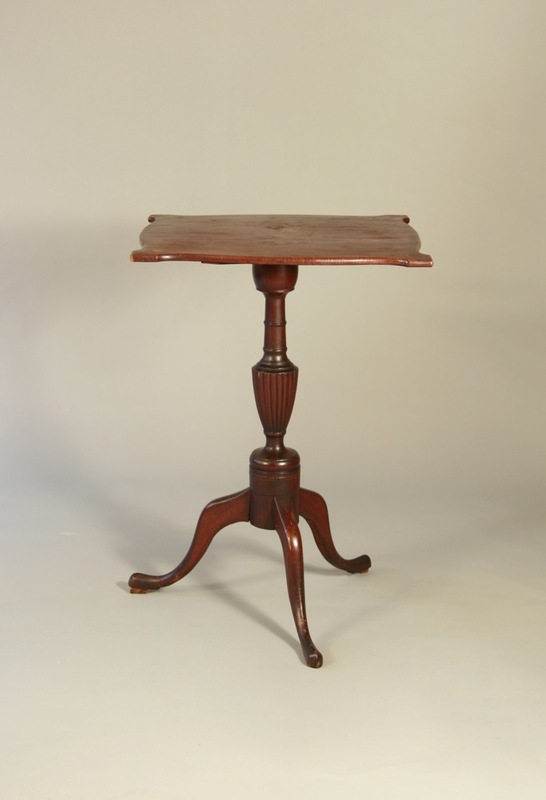 A very fine Queen Anne drop leaf table in a rare small size. Walnut, with pine secondary wood in a deep, rich old surface. 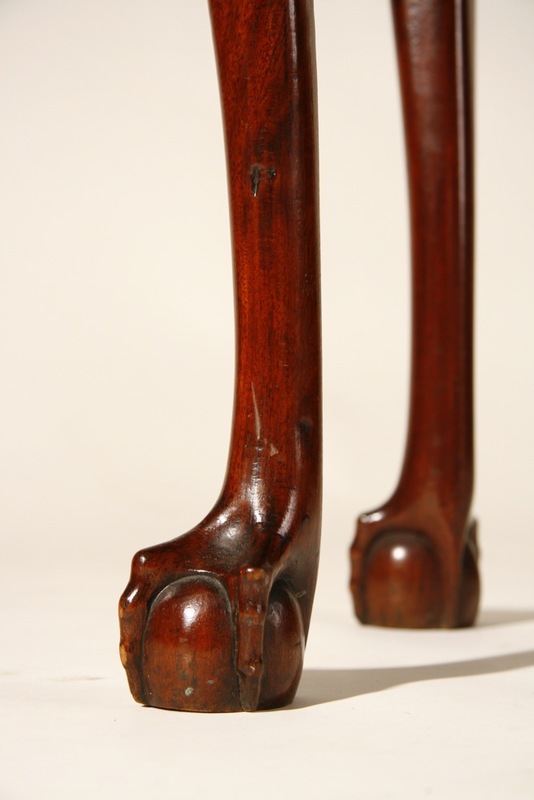 The carving of the legs and feet is exceptional. 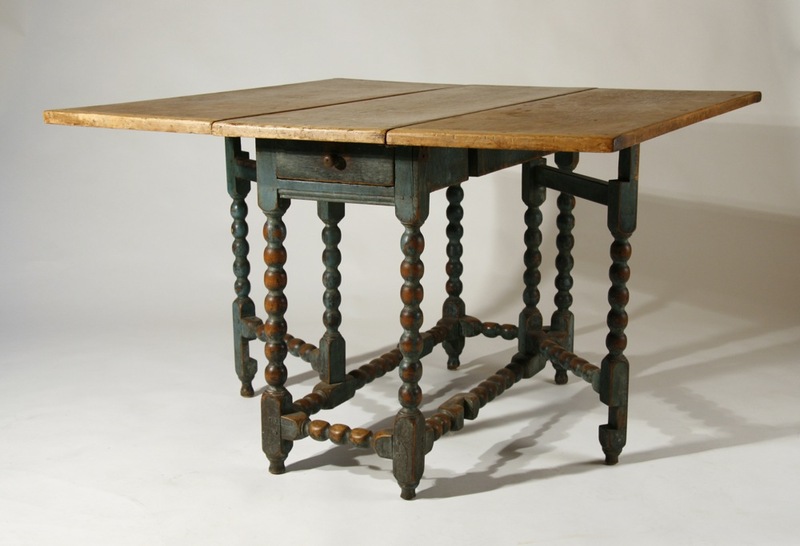 Retains its original stamped hinges "TO", and original hand wrought screws and forged nails. Probably Boston, c.1750-60. Top 29 1/2" x 27 3/4", 10 1/2" wide when closed. Ht. 27". 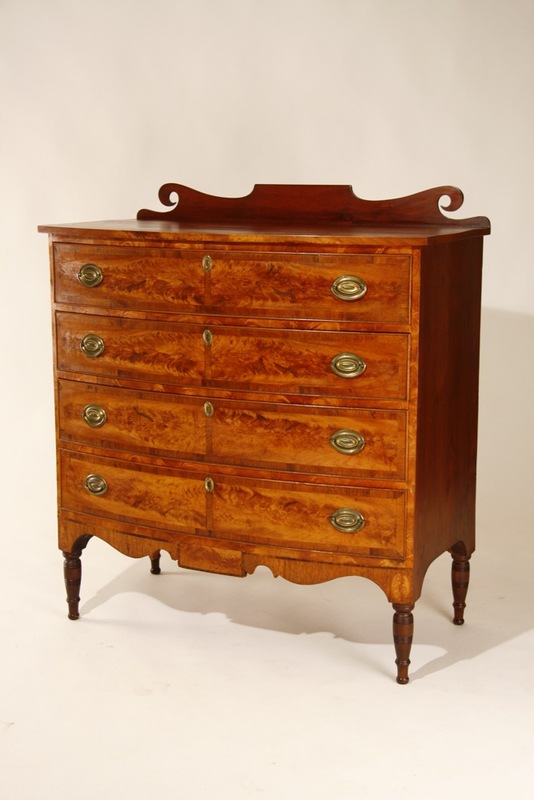 A fine Queen Anne high chest with split drawer top, fan-carved center drawer above a triple-arcaded skirt. Graceful cabriole legs ending in platformed pad feet. Maple, with pine secondary wood; and retaining its original drops and 11 of its 14 original brasses. 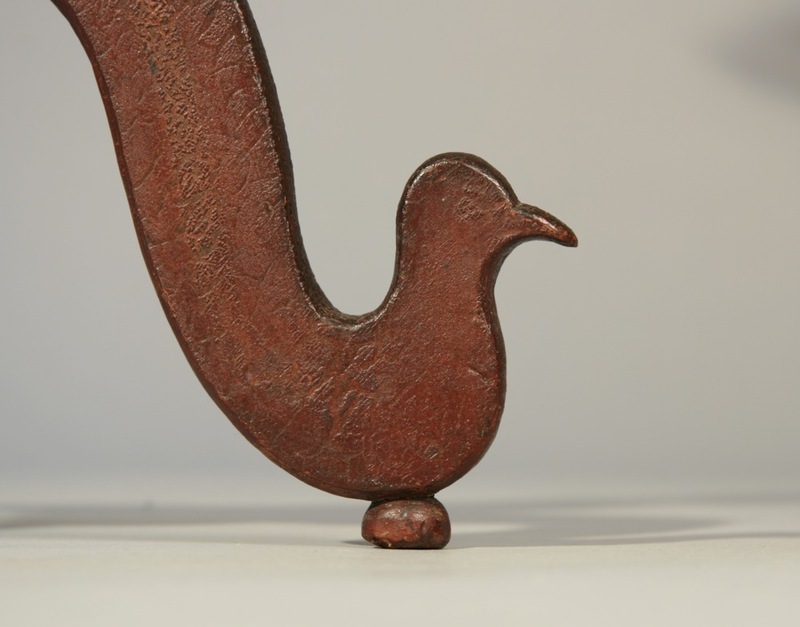 From a family in West Newbury, MA and probably made there, c.1760. Exceptional condition, with only some minor drawer lip and knee return repair. 73 1/4" H, top case 36 7/8" w, base 39 1/8", depth 19 3/4". 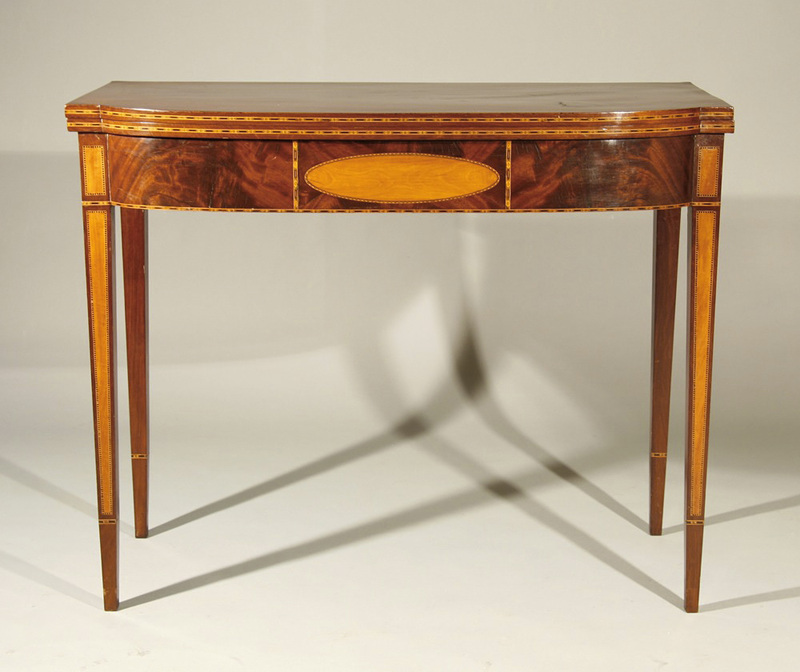 A very fine Hepplewhite mahogany card table with multiple, complex inlays. 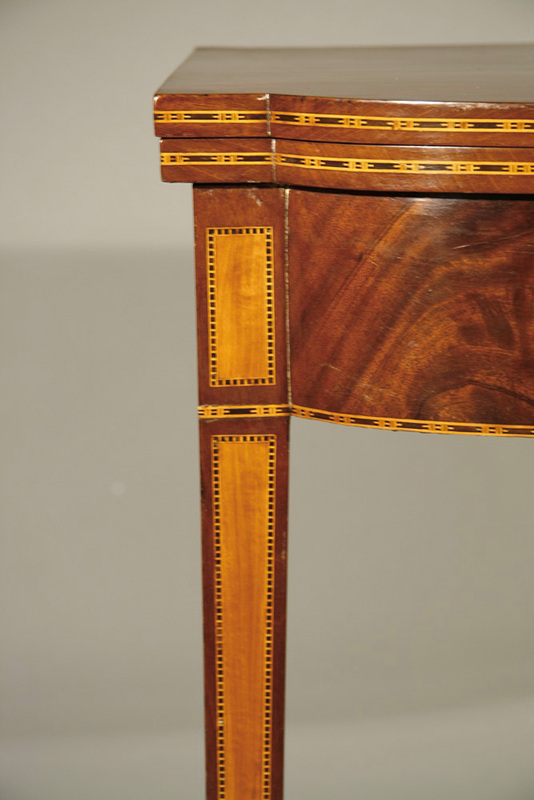 Matched crotch-grained mahogany panels surround an elongated satinwood oval, and both the leg plinths and facades are inlaid with satinwood panels- a rare feature. From the Moody family of Portland, ME. Probably Boston area, c.1795-1800. 36" x 17 1/2" x 29 1/2" ht. 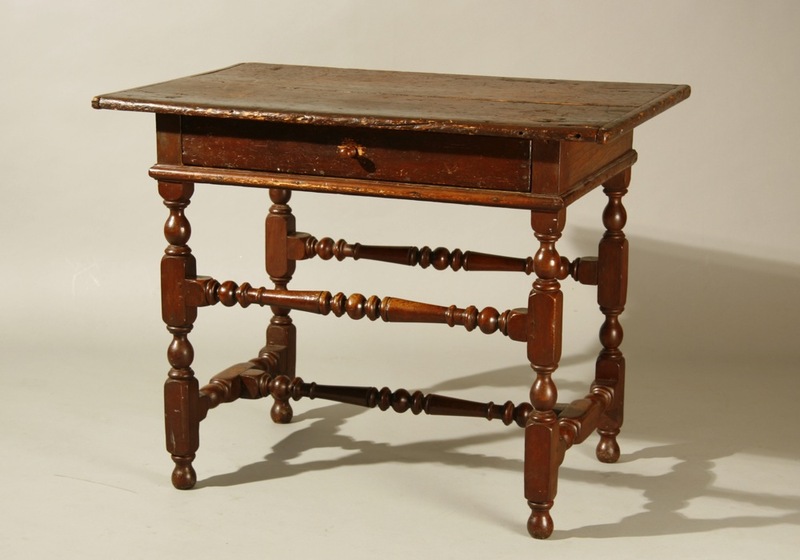 A fine country Queen Anne tea table with a one-board top, flared drawer with original wooden knob, double-splayed base, turned Queen Anne legs ending in 'stockinged' pad feet. Cherry throughout in great 'as found' painted surface. Probably CT, c.1740-60. At some point in its history about 2" was clipped off the back edge of the top and I have had that piece restored. Top 20" x 32", ht. 26 1/2". 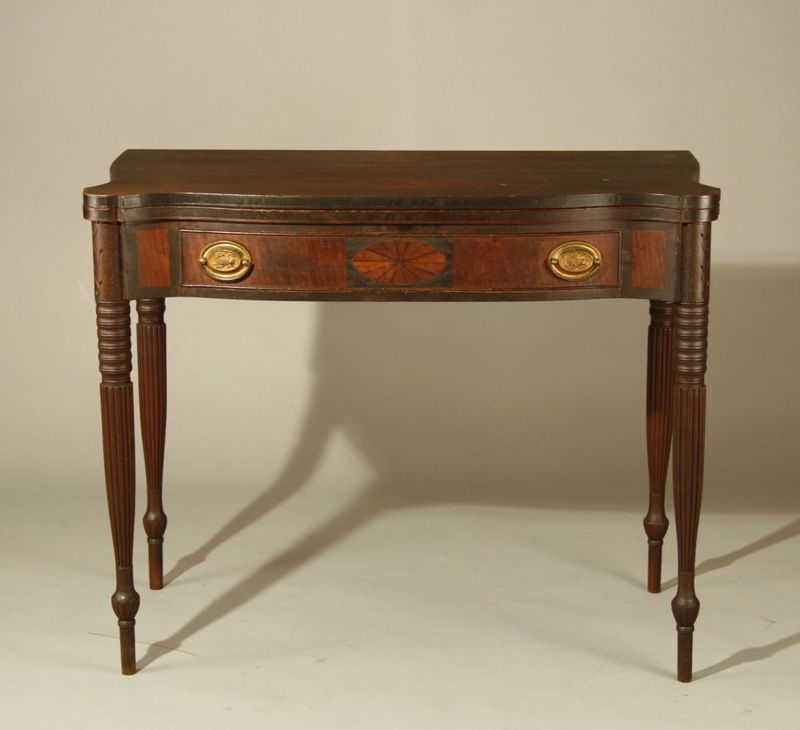 A very fine Sheraton card table with serpentined top and carved and reeded legs. The edge of the top is inlaid, the freize is banded with tiger maple veneer, then veneered with flame birch panels and centered by a rectangular panel composed of six specific bands of inlay-the largest being lunettes with 'burnished' edges. There is some very minor patching to the edges of the veneer and there is an old strip at the rear of the top where the hinges must have broken out. Exceptional color, design, and condition. North Shore, MA, c.1800-1810. 37" width, 29 1/4" ht. 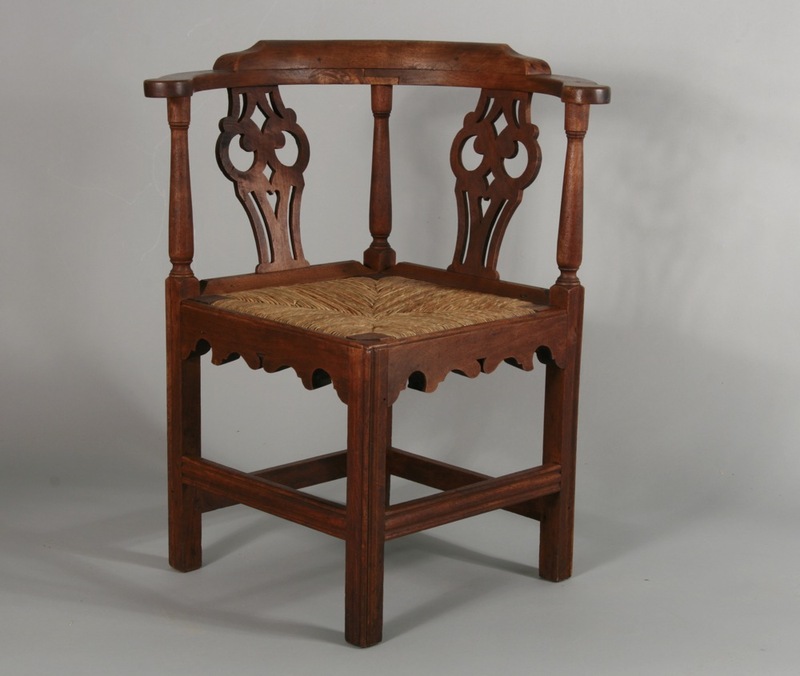 A very fine Queen Anne armchair with tall carved and molded back, block and vase- turned legs and Spanish feet. Maple and ash, c.1740-60. In old or original brown paint over a thin red wash/sealer. In as descended condition, with remains of original rush seat. 45 1/2" ht. Provenance: Purchased at an auction in Greenfield, Ma in the 1950's for $50.00. Old paper on botom of seat read " Given to Anna M. Smith by Martha (widow of Great Uncle Enoch Whittier) 1772". Descended snce 1950's in collection of William Hubbard, sunderland, MA. Firebucket from Robert Laird's Brewery, Green Street, Newburyport. 1822. One of the most dramatic scenes on a firebucket that I have ever seen. 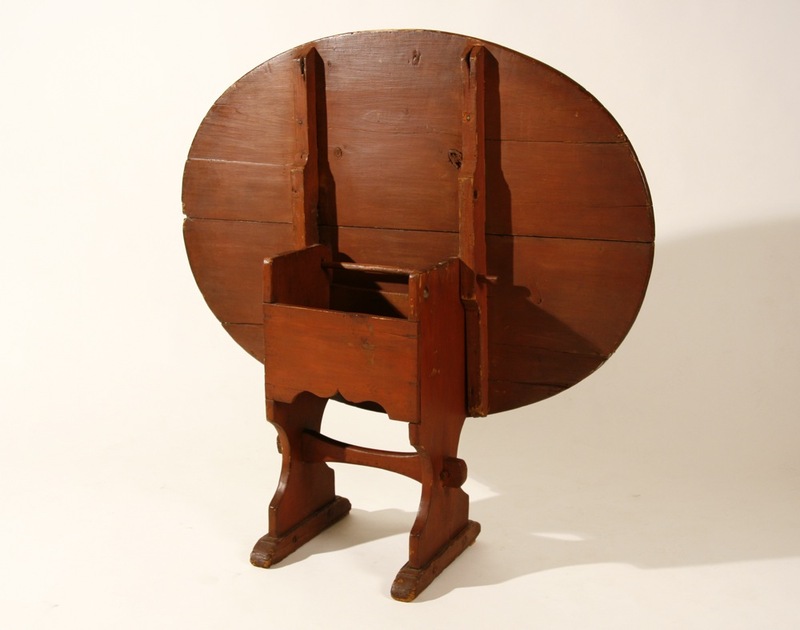 An exceptionally rare 'high-low' stretcher table. In old red paint, with original top and side-hung drawer. Frame 20" x 30", 29 1/2" ht. 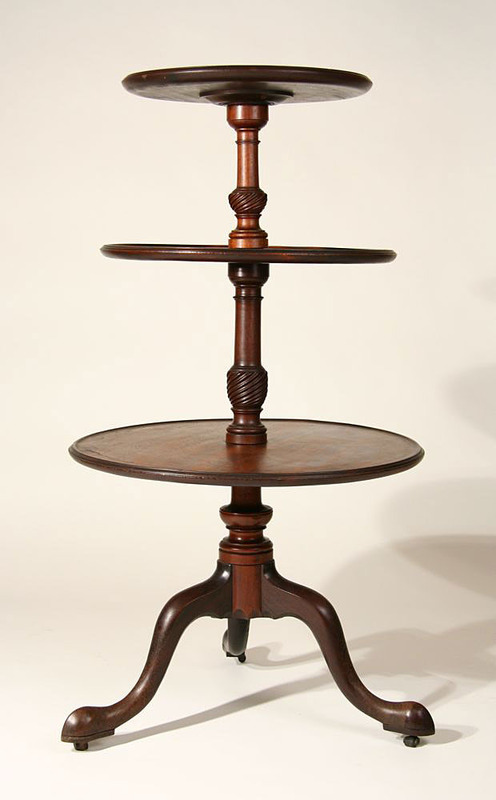 An unusual and very dramatic New Hampshire candlestand. 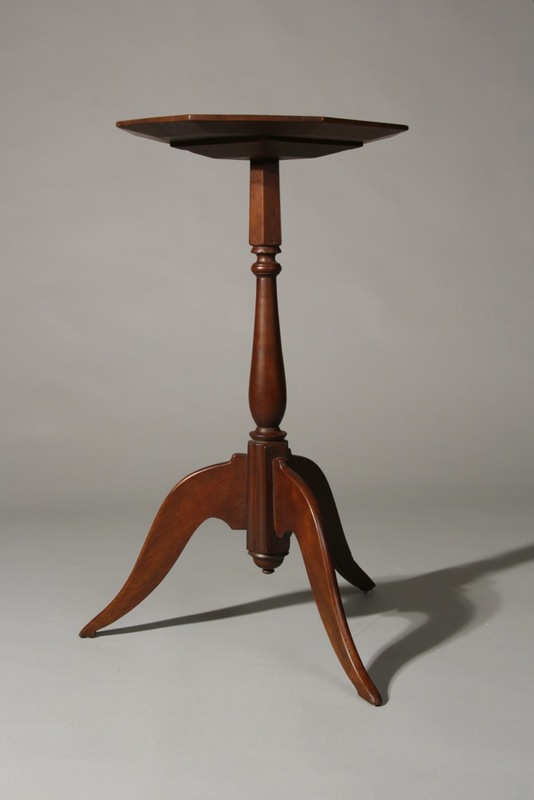 Heavily- chamfered octagonal top; delicate, crisply-turned shaft-which is hexagonal at the top, with an elongated vase-shaped center section, then terminating in a fluted hexagonal section at its base between the deeply-scrolled legs. Dunlap School, c.1800. Cherry, in a very pleasing surface, with slight traces of original red on underside of legs. 26 3/4"ht. 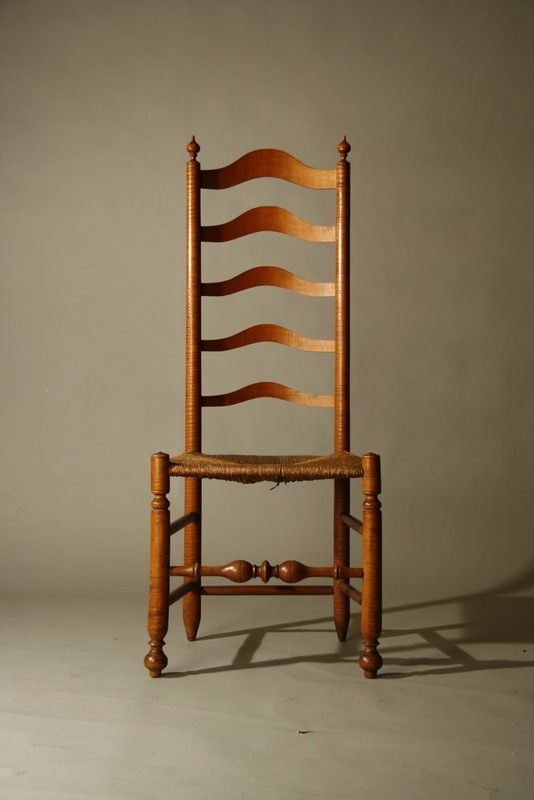 The finest slat back sidechair that I have owned. Retaining nearly all of its original 'Spanish' brown paint. The quality of the chair is self-evident. 45" ht, with a 16" seat ht. Southeastern MA or possibly CT, c.1720. 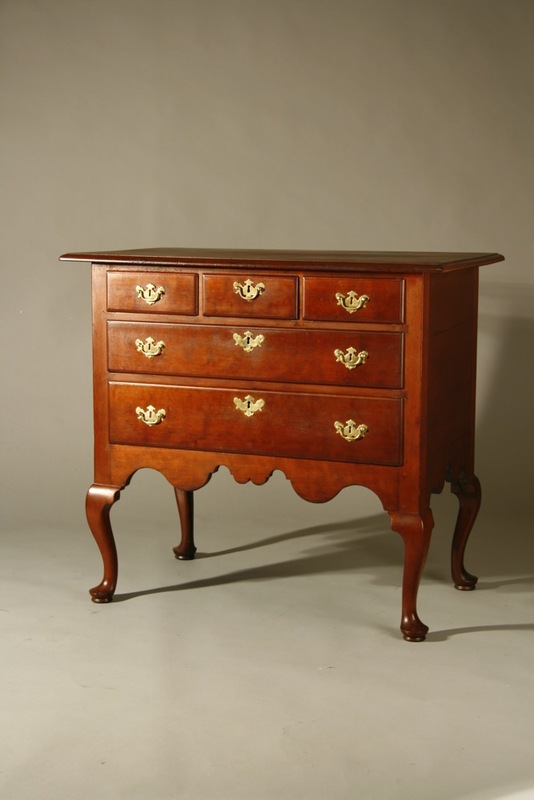 With a deeply-coved cornice molding, fluted quarter columns with lamb's-tongue stops, deeply-carved shell in the skirt, and cabriole legs ending in well-articulated ball and claw feet--and all in strong tiger maple, this transitional high chest is a wonderful example of the country cabinetmaker's art. 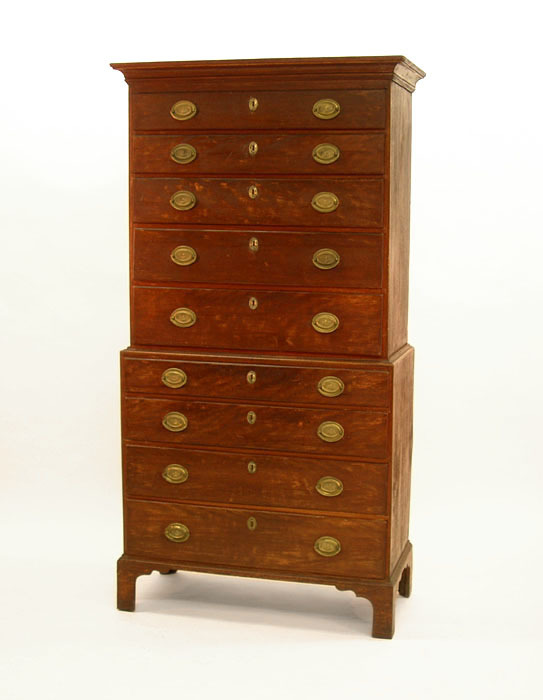 Exceptional structural condition-with only two drawer lip repairs and one old replaced knee return. Top case 36", lower case 39 1/2", ht. 70 1/2". 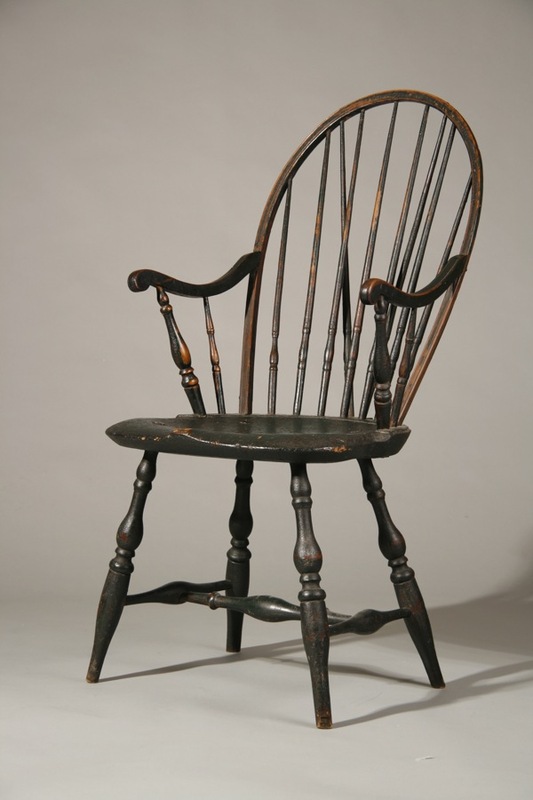 Made in NH or MA, c.1785, it is pictured in The Magazine Antiques, August 1964, and I purchased it from the family who acquired it at that time. 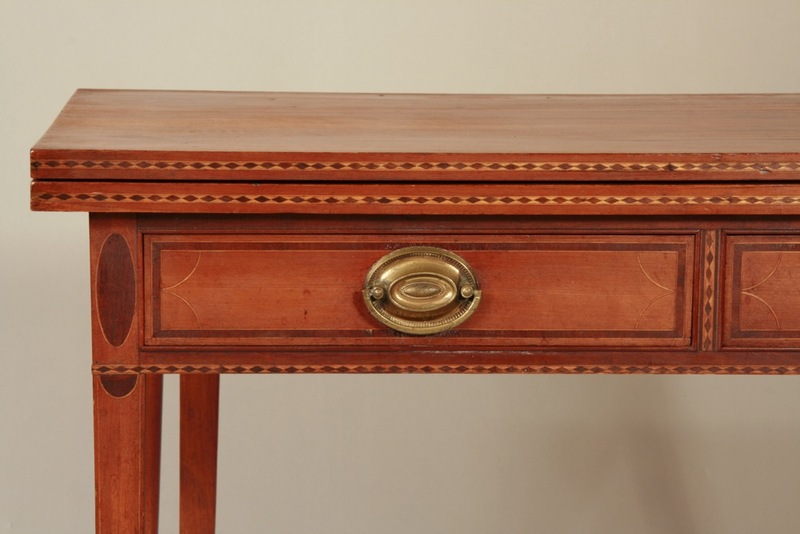 Perfectly proportioned, with a rich old color and original pierced brasses, this high chest is clear proof that a skilled cabinetmaker with a strong sense of aesthetics could create a rural masterpiece--with no applied decoration. The double crown molding, the spatial relationship of the top to the base, the complex shape of the skirt, and the graceful cabriole legs combine to make a complete statement. No bells and whistles--and none needed. In figured maple with pine secondary wood. Southeastern NH, c.1780. Top case 36", lower case 38 1/4", 73 1/2" ht. 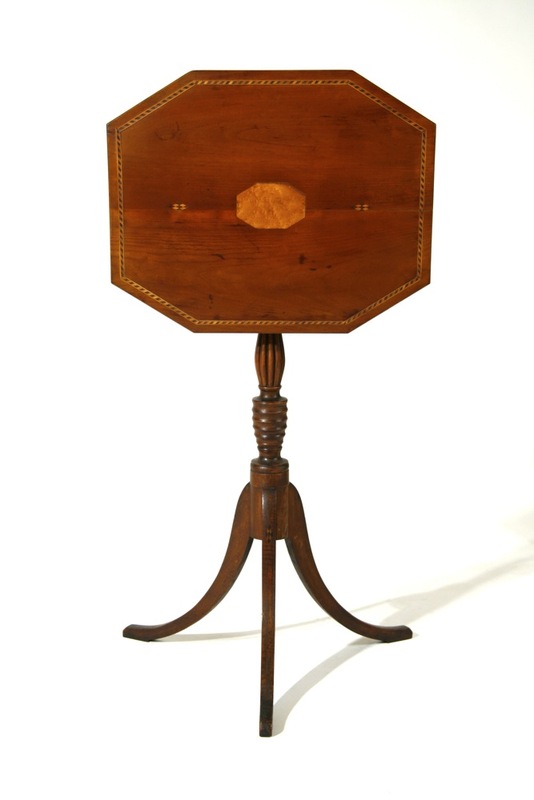 An exceptionally rare Chippendale 'China table'. 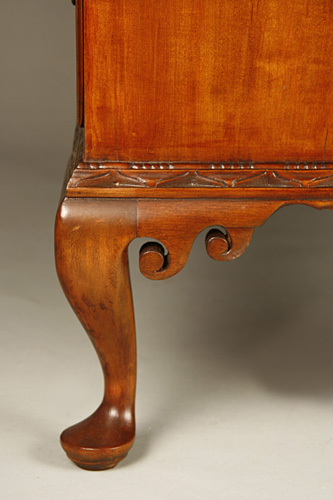 Mahogany, with scrolled fret inset into grooves on top, molded apron, corner brackets, and squared legs with a bead on the outside edge. Superb original surface. 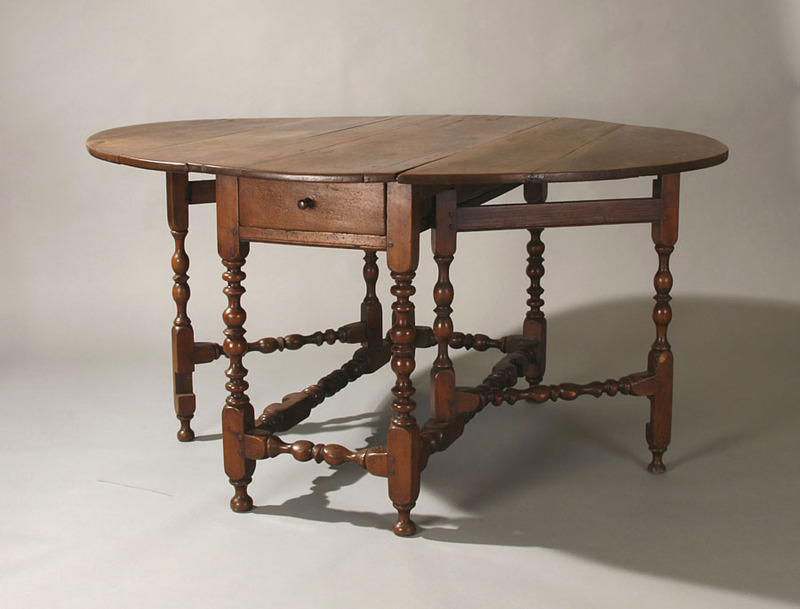 This table was found in south-central NH many years ago, and is clearly a less complex example of the seven known similar pieces made in Portsmouth 1760-1780. 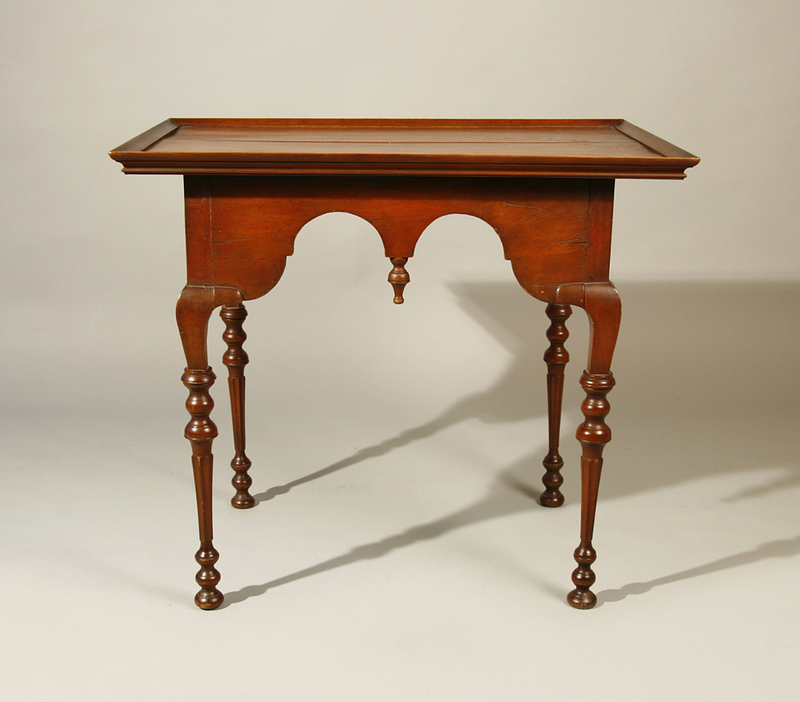 Perfectly proportioned and designed, this little table is a classic of New Hampshire taste and cabinetmaking. 25 1/2" x 17 1/2"; 29" to top of scrolled fret. See Portsmouth Furniture, Jobe et al, pages 223-228 for examples of form; 182-184, 223-226, 232-233, 269-270 for comparable fret, and 328-330 for identical corner brackets. One of the finest four slat armchairs that I have owned in many years. The posts are just under 2" in diameter-- and the quality of the turning of the finials, posts and stretchers is exceptional. 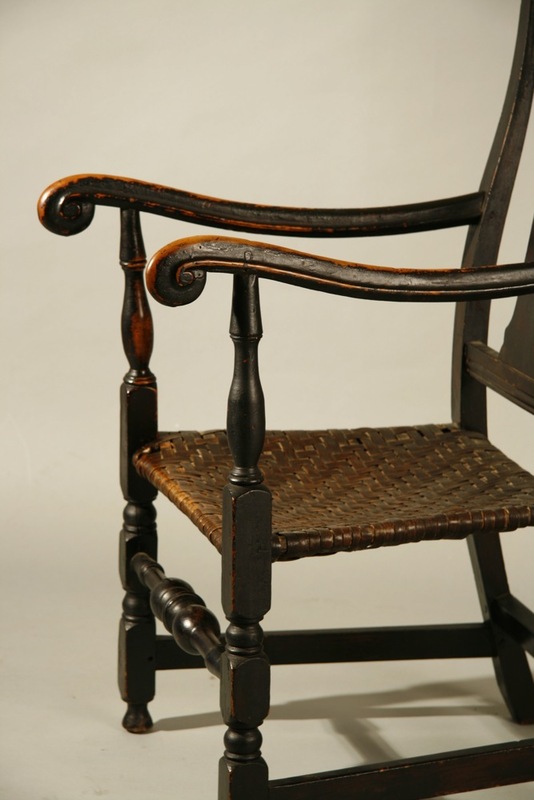 Made of maple and ash, c.1740-50, probably in CT--and retaining a superb dry first surface of thin brown paint, and probably its original splint seat. 46" ht, 16" seat ht. 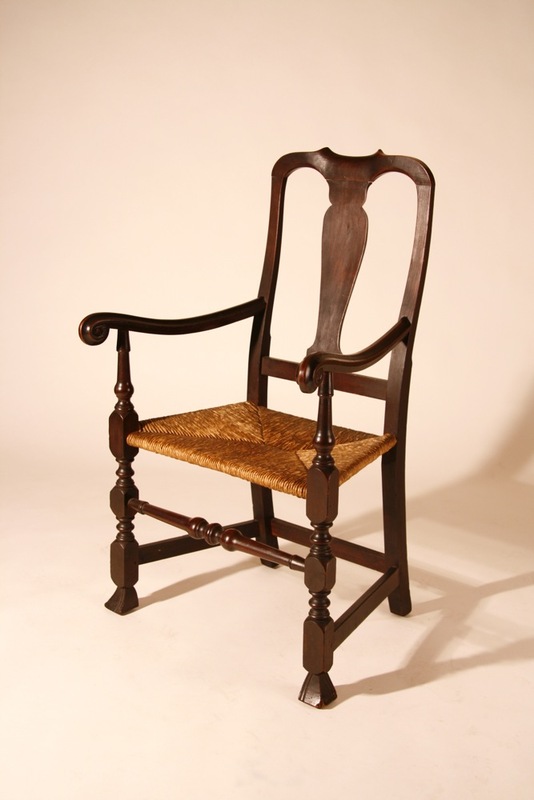 A fine New Hampshire country Queen Anne armchair with shaped crest rail, scrolled arms with carved terminals, block and vase turned front legs, large vase and ring turned front stretcher. 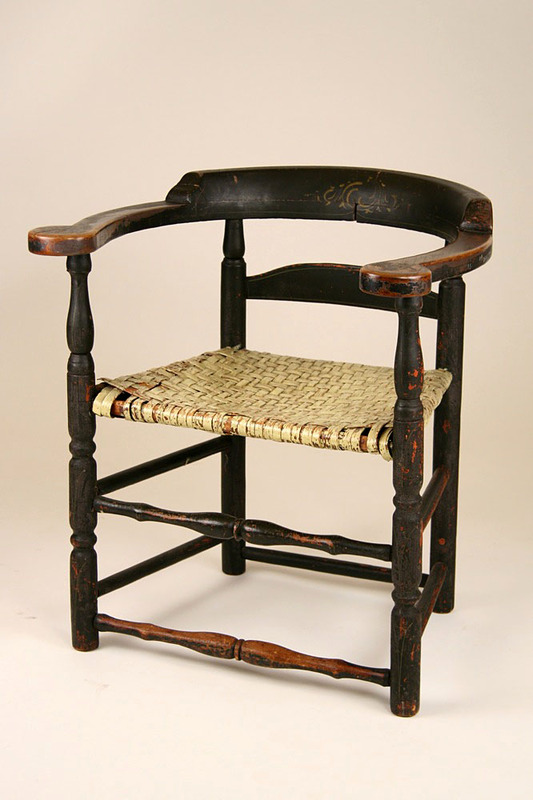 Made of maple c.1760-80, and in old black paint over an original thin red wash. Great surface quality- and retaining its original splint seat. 40" ht., 15" seat ht. 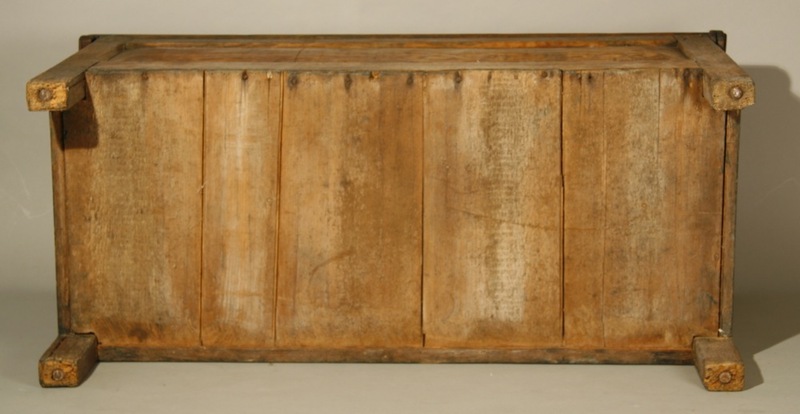 A rare 17th century chest with four panel front and double-paneled ends in near perfect condition. Just re-purchased from the collectors to whom I had sold it in 1984. Completely original structural condition-top, wooden hinges, interior till, back, and floorboards. In a very dry old surface-showing traces of an original blue/gray. Boston/North Shore origin, last quarter 17th century. Red oak, with white and red pine secondary woods. In an unusually small size for the period-43" x 19" x 24" ht. A classic New Hampshire Chippendale tall clock with fully-carved pinwheels at center of bonnet and molded, applied bracket base. The dial is painted with flowers at the top and in the corners. There is no restoration to the birch and maple case, which is in an old refinish. Concord, NH area, c.1800-1810. 90" to top of center finial, 86" to top of crest. There has been some old touch-up to the numbers on the dial and to the gilded outlines in the corners. 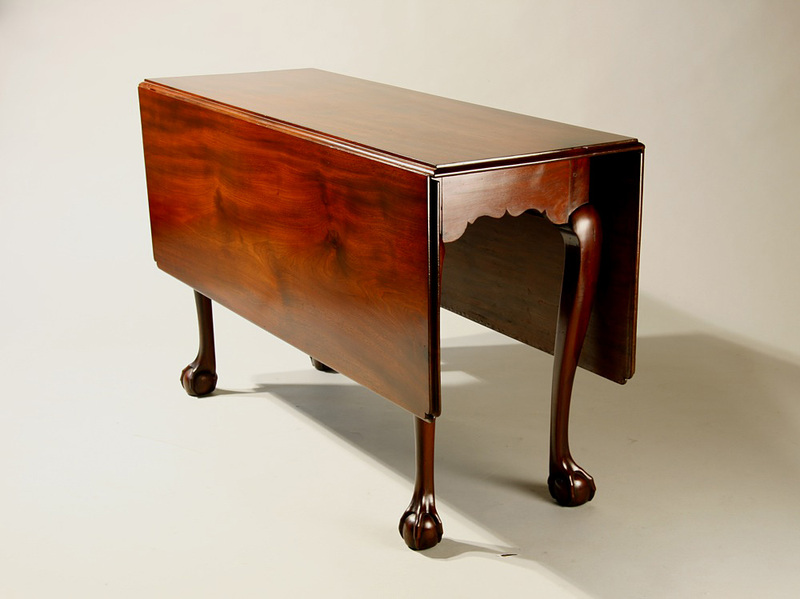 An exceptional Chippendale drop leaf table made of the finest mahogany-- with a complex shaped skirt, and graceful cabriole legs ending in large, well-carved, ball and claw feet. The deeply-molded edge to the top with invected corners is a very rare feature and significantly elevates this example from the norm. Top 47" x 50 1/2"; 28" ht. North Shore, MA, probably Salem or Marblehead, c.1770. 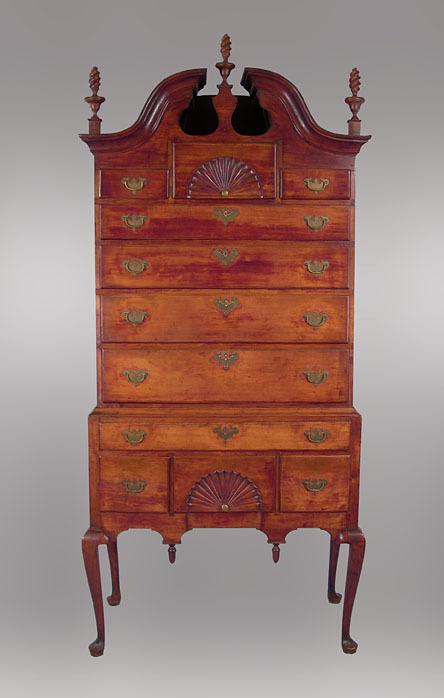 A fine example of one of the rarest forms of 18th century American furniture. 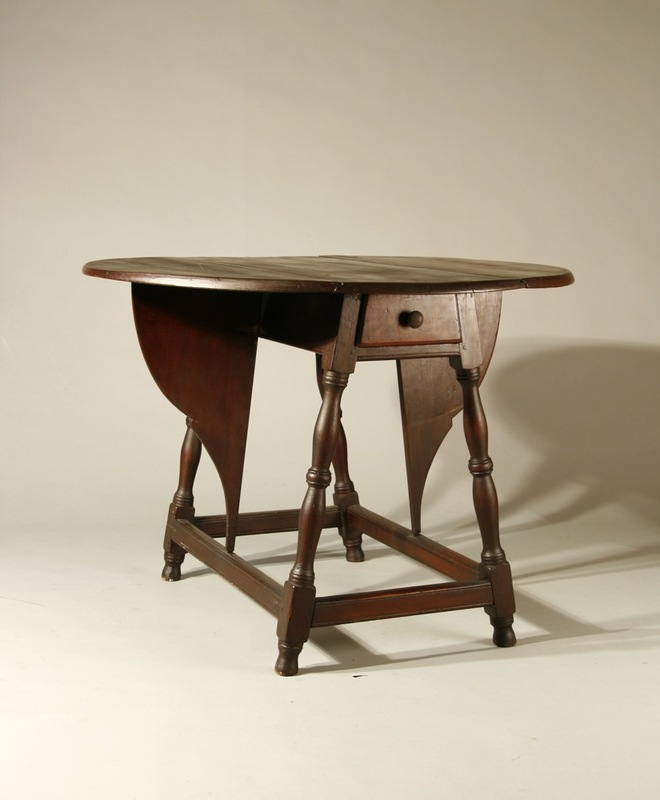 With an oval top, splayed base with vase and reel turned legs, and elaborate leaf supports, this 'butterfly' table, in a old 19th century surface, and retaining its original top, leaf suppports, hinges, drawer, and feet is one of only four that I have owned in over 40 years. 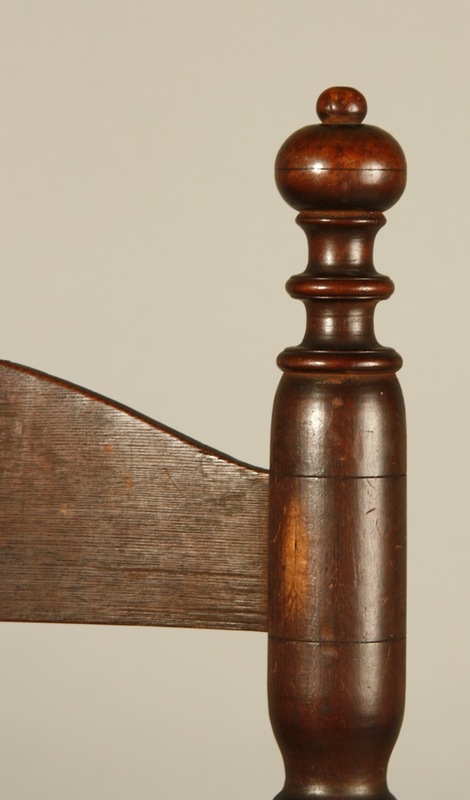 Made of cherry, with pine secondary wood, probably in central CT, third quarter 18th century. Top 38 1/2" x 38"; 28"ht. 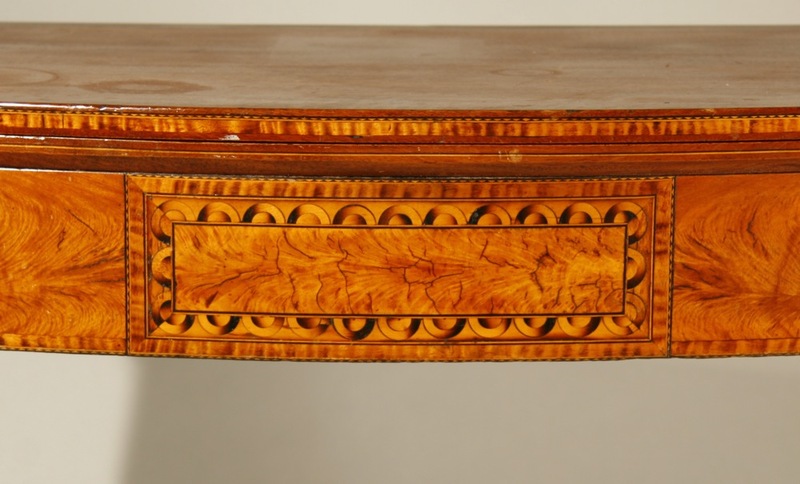 Although the edge of the top of this table was re-shaped at some time in the 19th century, the rarity of the form-and its otherwise pristine condition- make it a significant addition to any collection of early New England furniture. 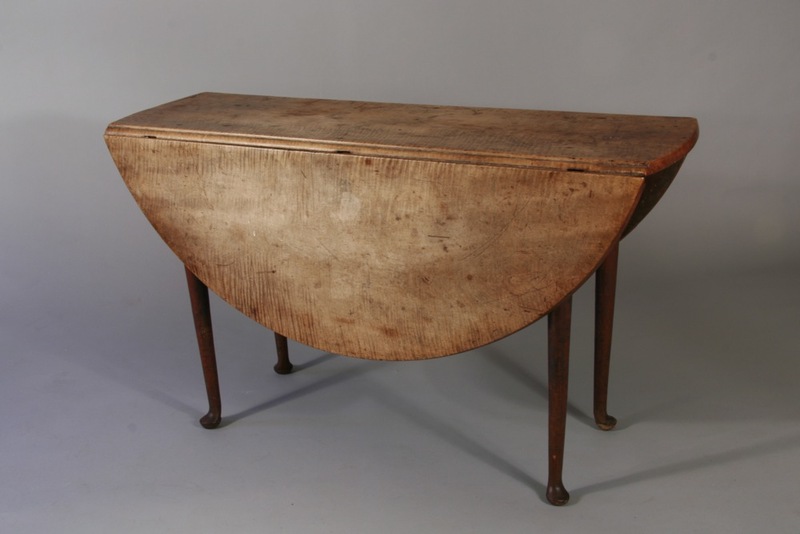 A very fine William and Mary table with oval top, splayed, vase and ring turned legs, stretcher-base and full feet. 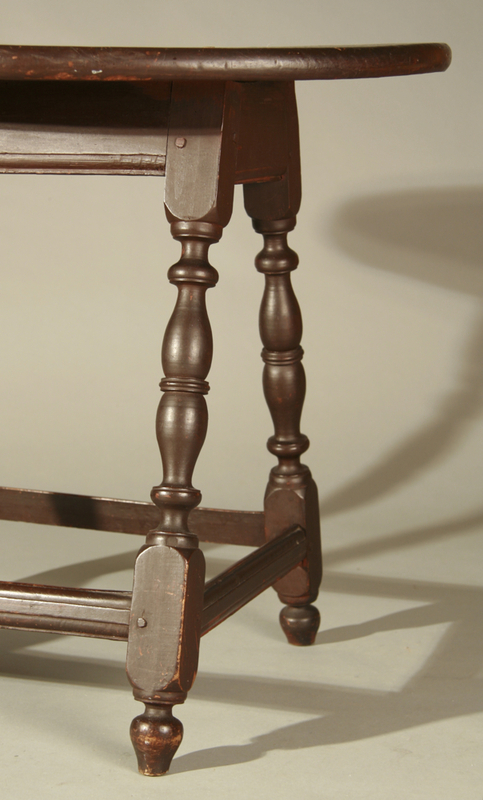 Maple, in an old 19th century 'Spanish' brown paint. 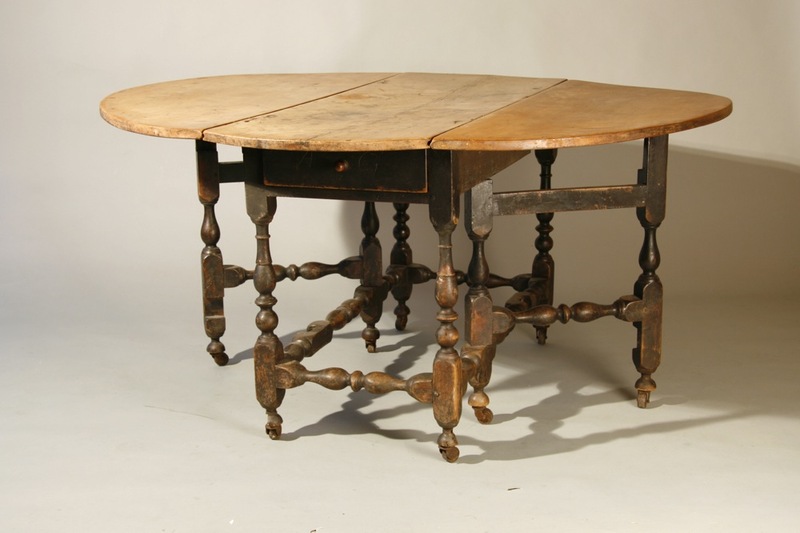 Tables from this period -with this delicacy- are characteristic of the best work done in southeastern NH, 1720-1745. Maple throughout, the top is 23 1/2" x 29", 25 1/4" ht. Shown in my advertisement in Antiques and Fine Arts, Summer 2012. 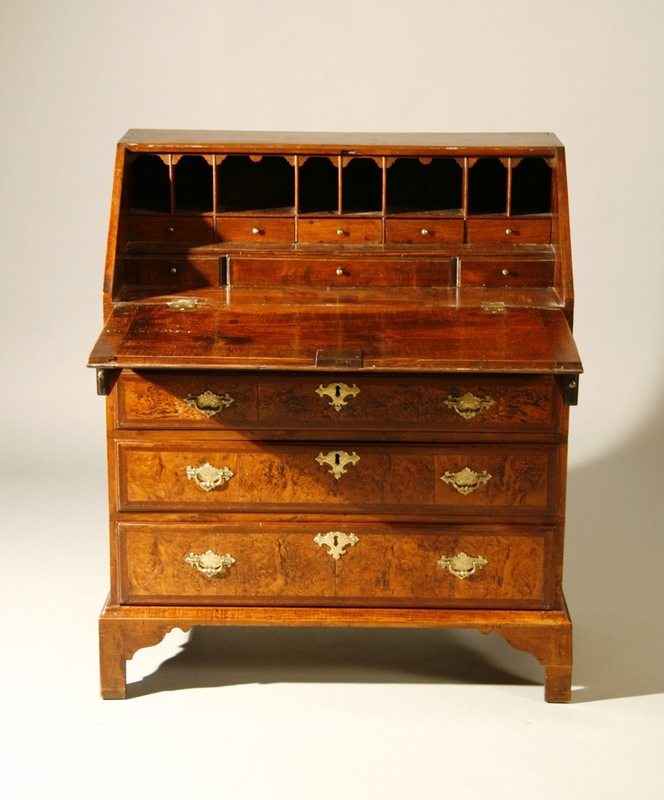 A very rare, perhaps unique, Queen Anne fall front desk with veneered lid and drawer fronts. Made of maple, with the burl walnut panels on the lid and drawers cross-banded with walnut veneer. 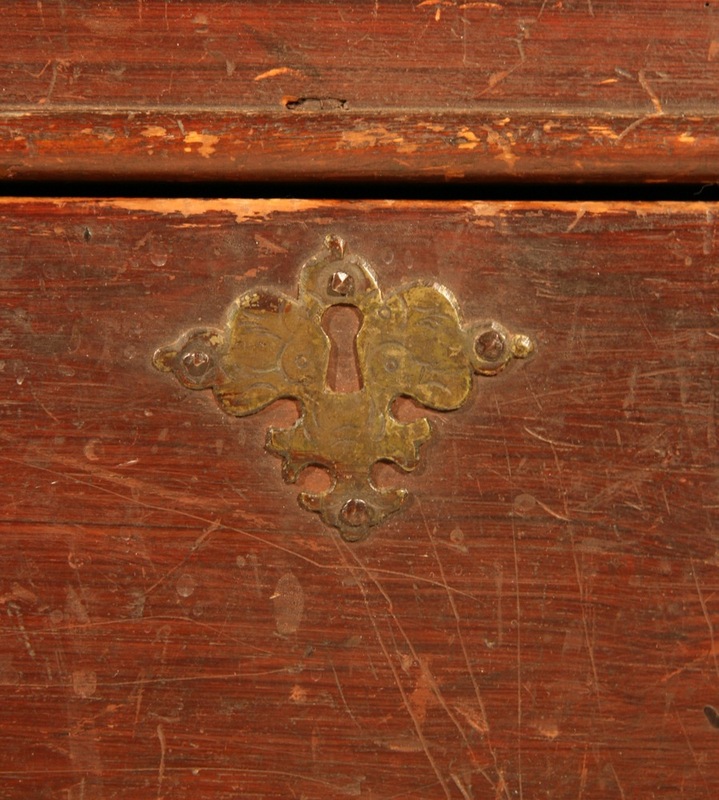 The engraved brasses are period and in the original holes in the drawers. Pine secondary wood. In exceptional condititon, with only restoration to one hinge and several glue blocks under the bracket base. Boston area, c.1735-45. Only 30 1/2" case width, 37" ht, 15 1/2" depth. 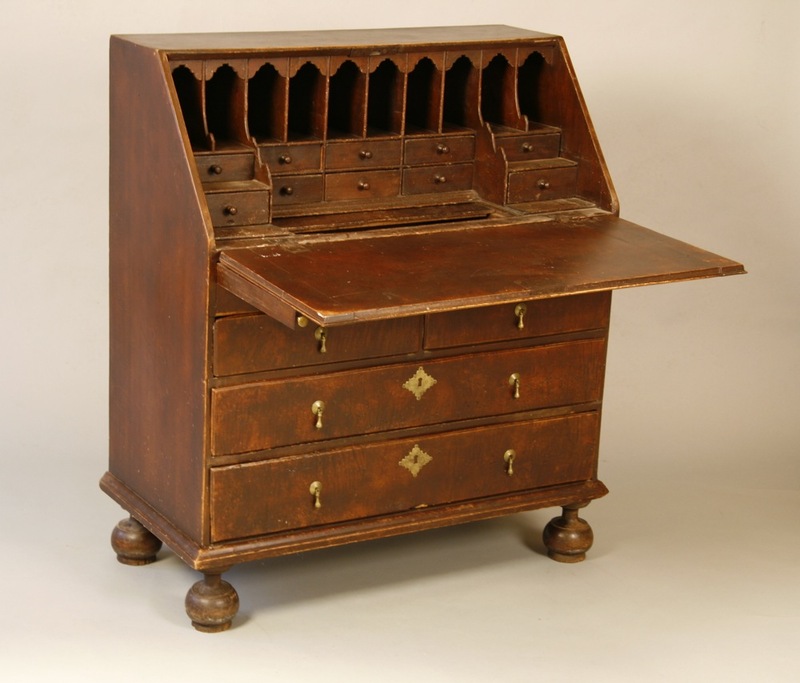 This desk must have been made for a favored child in a wealthy family. It is first pictured in The Magazine Antiques, February, 1946, when owned by Katrina Kipper, a dealer with shops in Boston and Accord, MA. I advertised this piece in The Magazine Antiques in 1983 and sold it at that time. I re-purchased it in January of this year from the same collectors. It remains the only veneered desk of this size known. 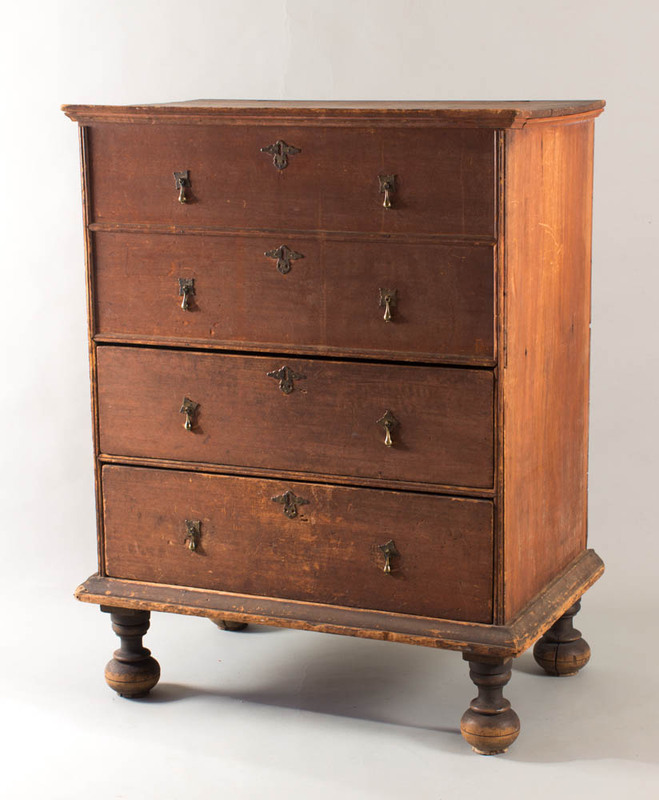 A rare, perhaps unique, Queen Anne chest with drawer on four short cabriole legs ending in pad feet. Small in size, with double-arch molding on the case, a shaped skirt, original brasses, and a great old salmon painted surface. 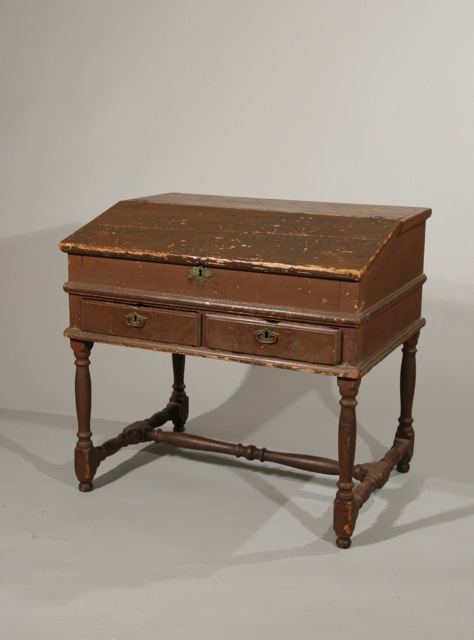 There is an old label on the back which reads "A chest on legs with drawer, acquired 1926, origin, Hull, MA, dealer A. Berry, Junior." 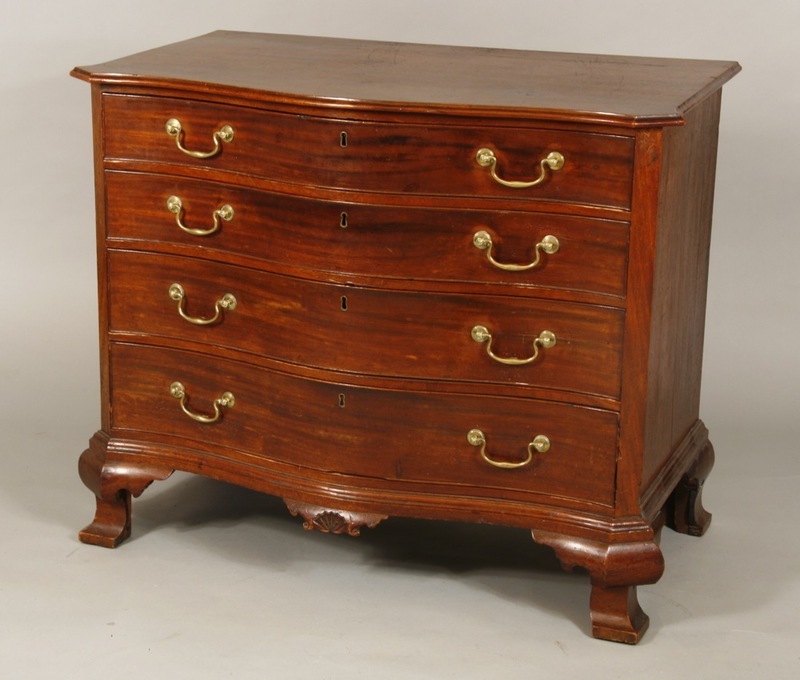 This chest first re-appeared in a sale in 1999, where it brought over fifty thousand dollars. 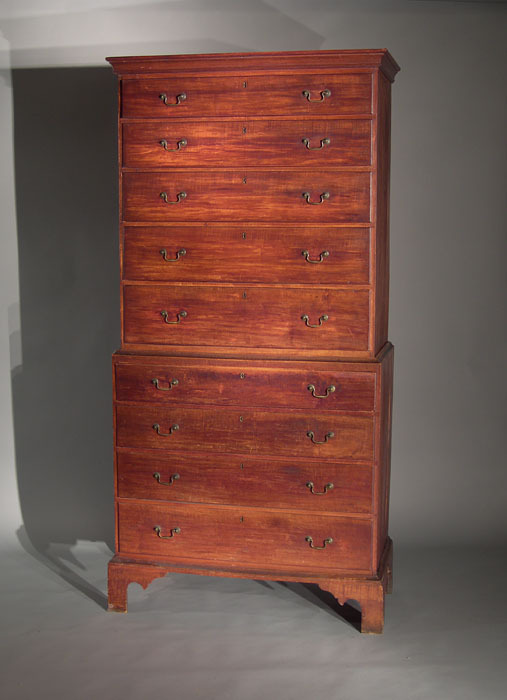 Made of red and white pine, probably on the south shore of MA, c.1740. 35 1/2" case width, 16 1/2" deepth, 40 1/2" ht. 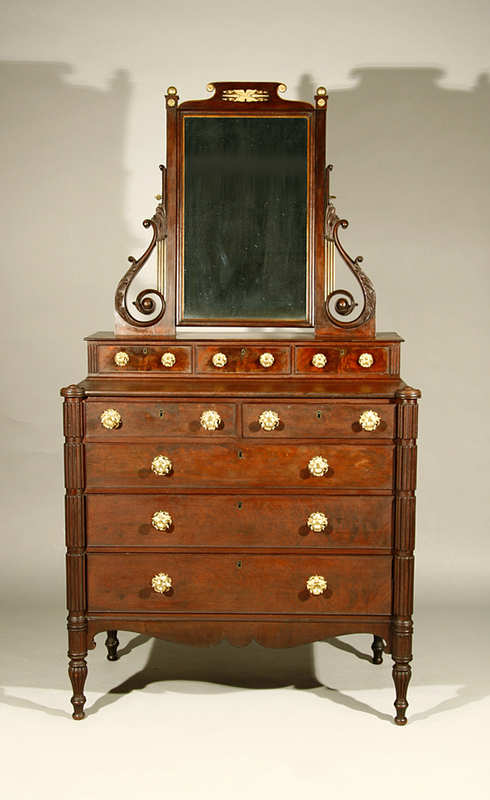 A rare, probably unique, Queen Anne dressing table attributed to the Willard group of cabinetmakers from Wethersfield, and with probable descent in the Buck family. 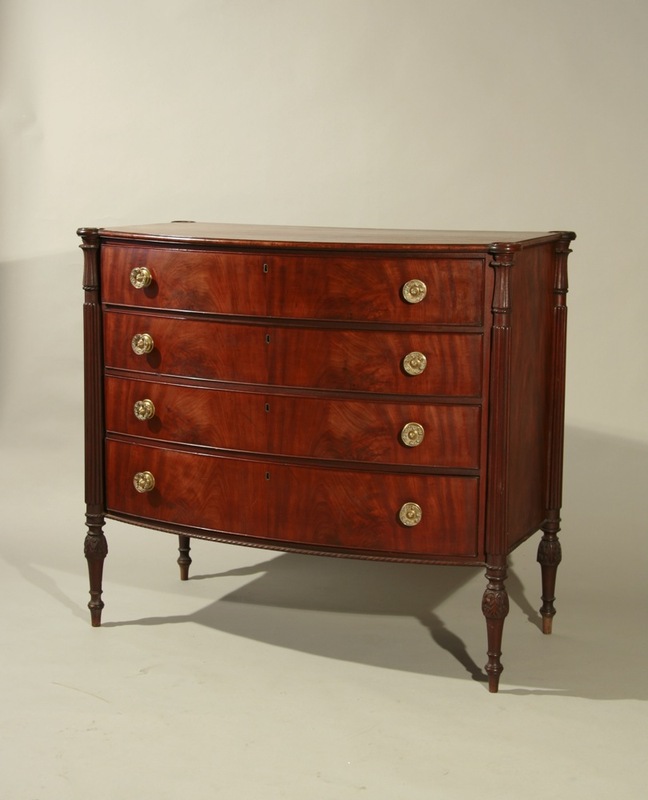 This piece is particularly noteworthy for its diminutive size, the use of three-rather than two banks of drawers, and its classic Wethersfield skirt. 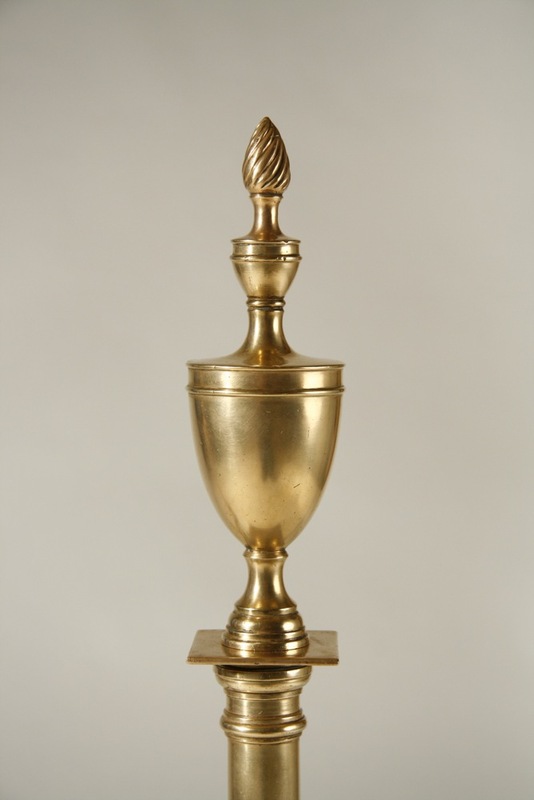 Made of cherry, with pine secondary wood, it retains a fine old finish and all but one of its original brasses. It is pictured and fully described on p.82 of Connecticut Valley Furniture, by Kugelman and Lionetti. Case width 29 1/2", 17 3/4" deep, 30 1/2" ht. ; width of top 34". 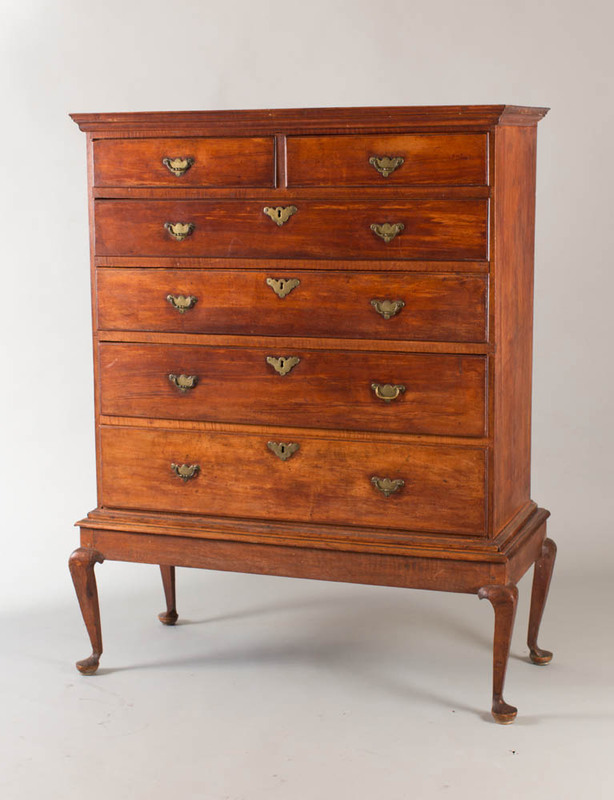 An exceptional Queen Anne period two drawer blanket chest with false drawers cut from the solid, shaped base with dovetailed skirt and center drop. The case made of strong tiger maple and retaining its original 'Spanish' brown paint. Very few examples in tiger maple are known. Great form and surface quality--and retains all but two of its original brasses. Pine secondary wood. CT. River Valley, c. 1750-60. 36 1/2" wide, 17 1/2" deep, 44 1/2" ht. 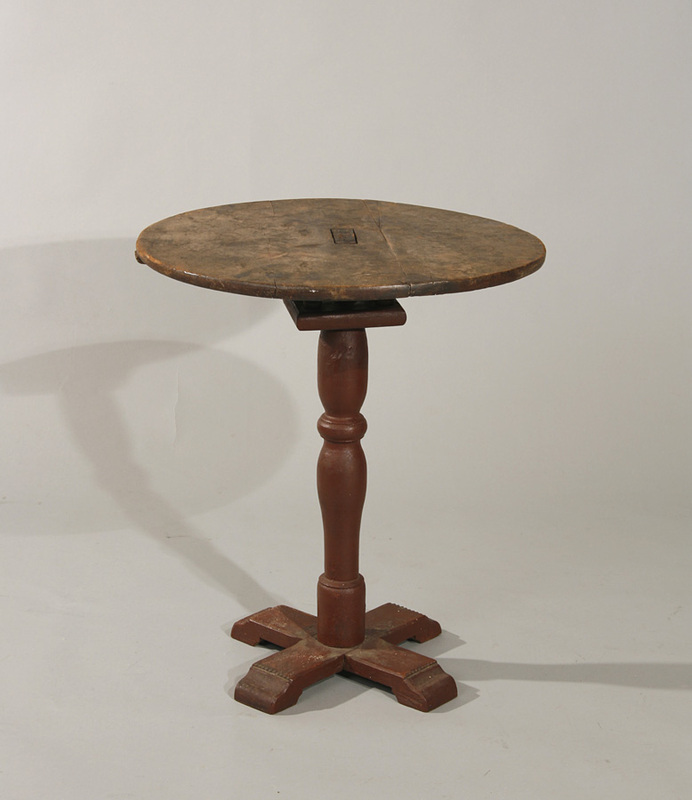 A very rare small tavern table with great scrubbed top and original red-painted base, 'inverted' turnings, and full feet. 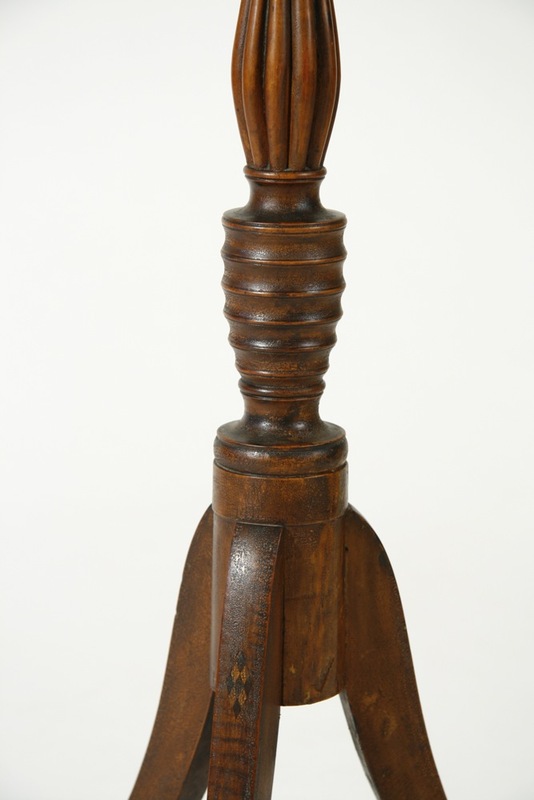 Made of cherry, with a pine top, c.1710. The base is 12" x 18", the top 16" x 28", ht.23". I have owned only a handful of tables with this type of turning orientation. Found in south-central MA, near the RI border and probably made there. 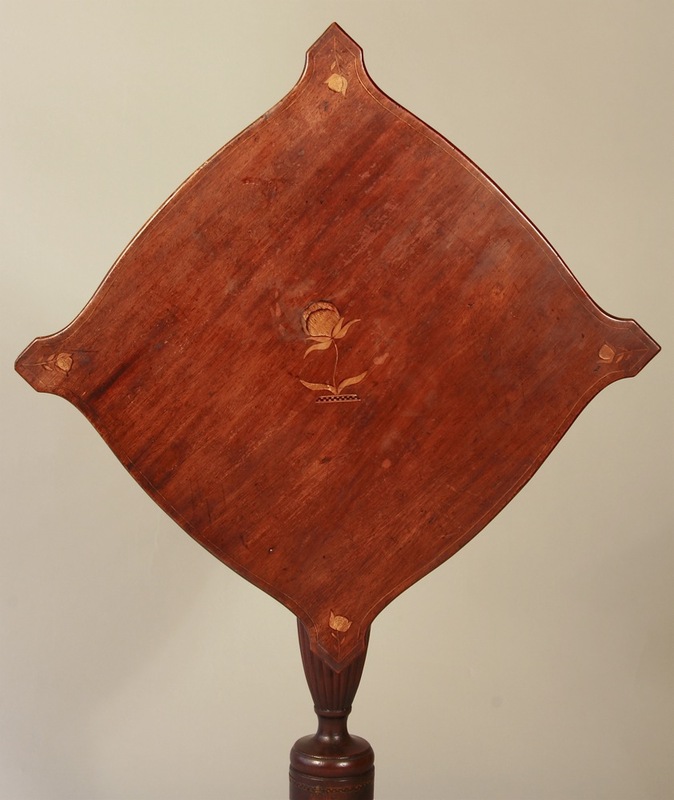 An exceptional Sheraton server or card table with carved, paneled, and inlaid decorative details--in remarkable original condition and with the finest surface quality. 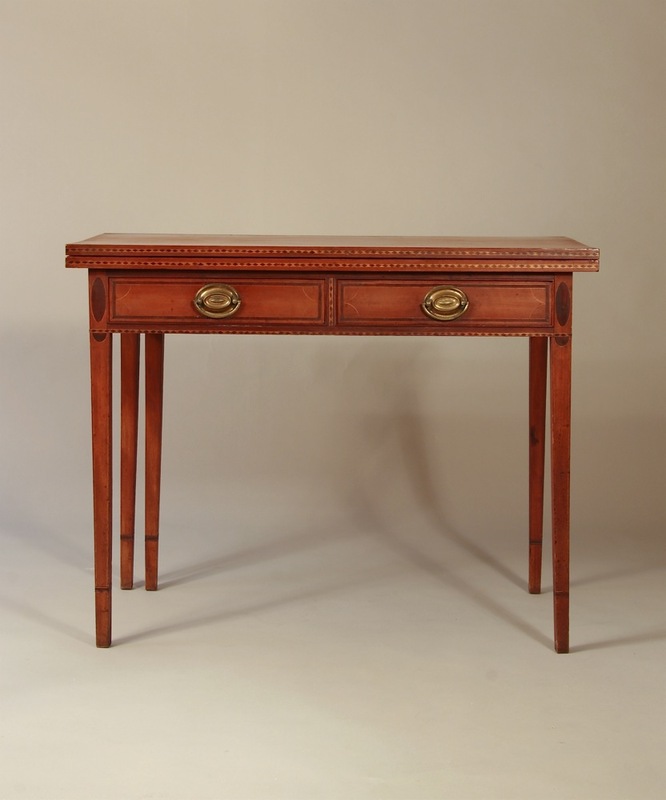 The case and legs are cherry, the edge of the top is inset with a strip of mahogany, the frame is crossbanded with mahogany and paneled with tiger maple, and the drawer front is centered by a bird's-eye maple paterae set within a rectangular mahogany panel. The front legs at the case are punch-decorated and carved with vines. 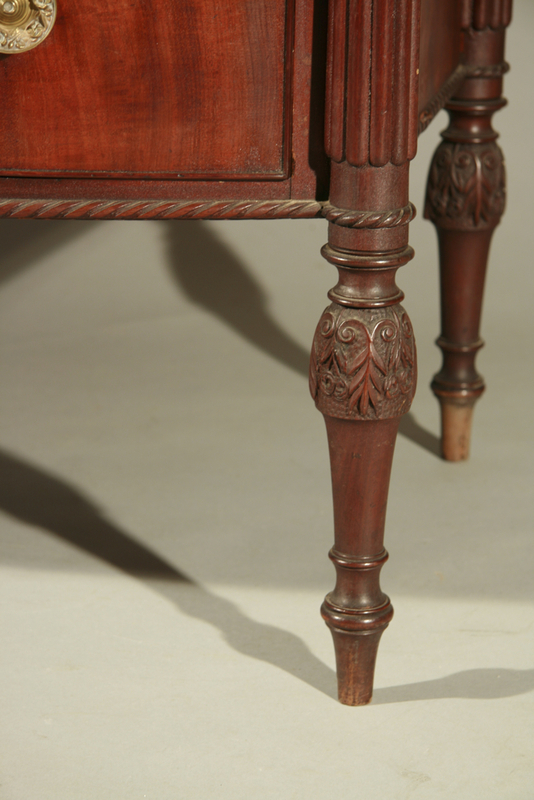 Below the turned and reeded section of each leg is a fully-carved 'cuff' above the bulbous foot. 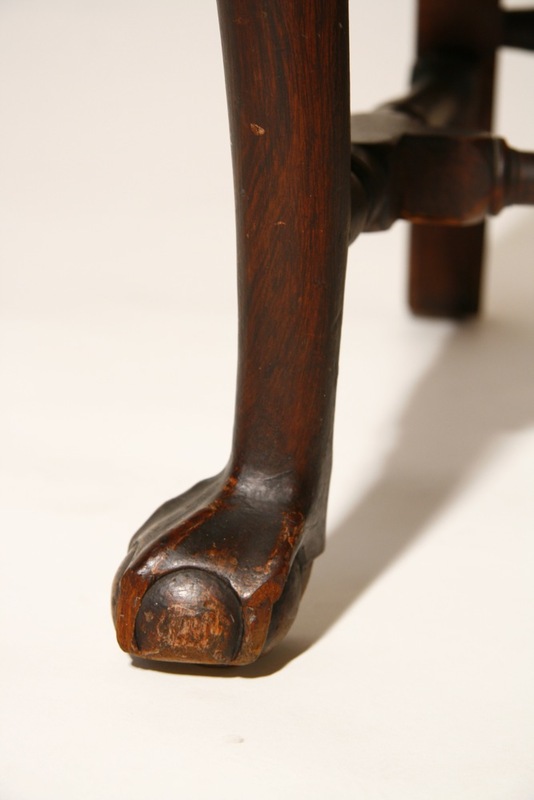 The plinths of the rear legs are incised with angled carving. The table retains it rare original recumbant lion brasses. Found in Manchester, VT, and probably made in that area, c.1810. 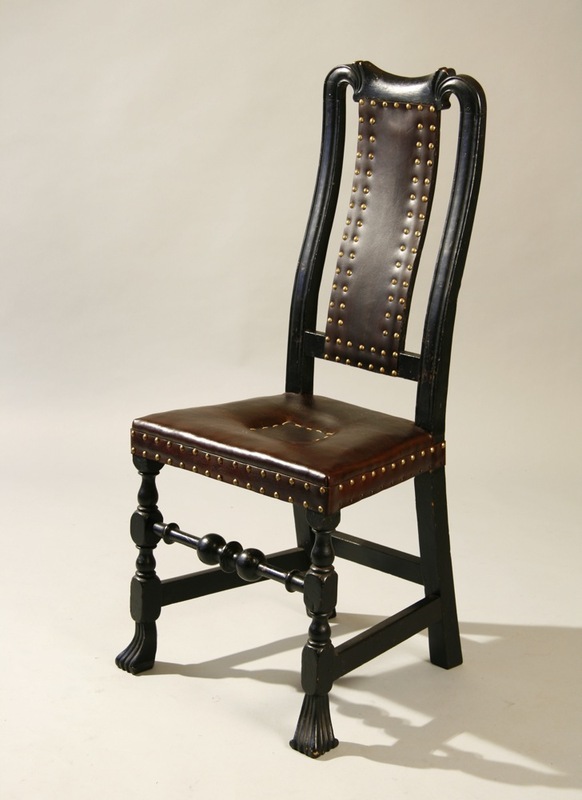 An exceptional five stat side chair, with the finest proportions, toolwork, and choice of woods. Maple and tiger maple in original surface and condition-and with an old, perhaps original, seat. Philadelphia area, c.1740-60. 45 1/2" ht. A rare, probably unique, tape loom-- over three hundred years old-- in remarkable 'as found' condition. The wear to the legs attests to its long and continuous use. 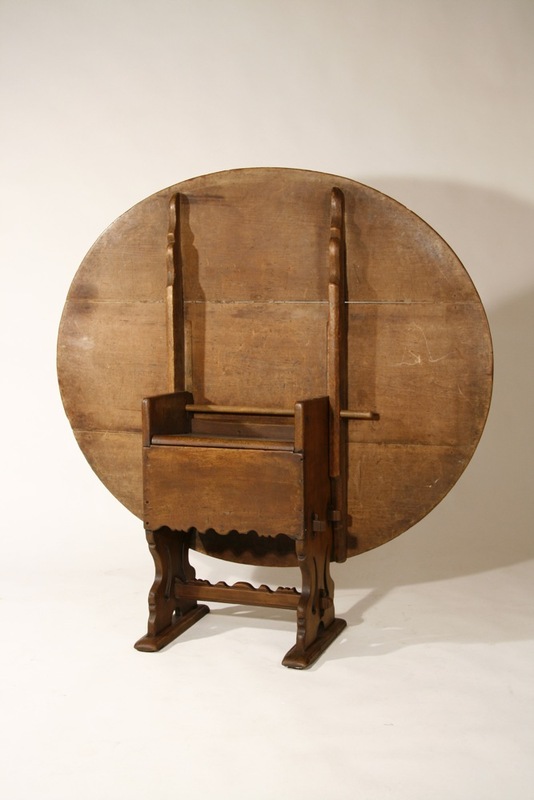 Found in the attic of the Appleton family farm in Ipswich, MA nearly 25 years ago ( the Appleton's have been in Ipswich since the mid-17th century), there is only one other piece of comparable age and style--the stand for a baptismal bowl from the Gerrish family of Salem used in the First Church of Salem. That stand was given to the Essex Institute in 1873, where it remains today. 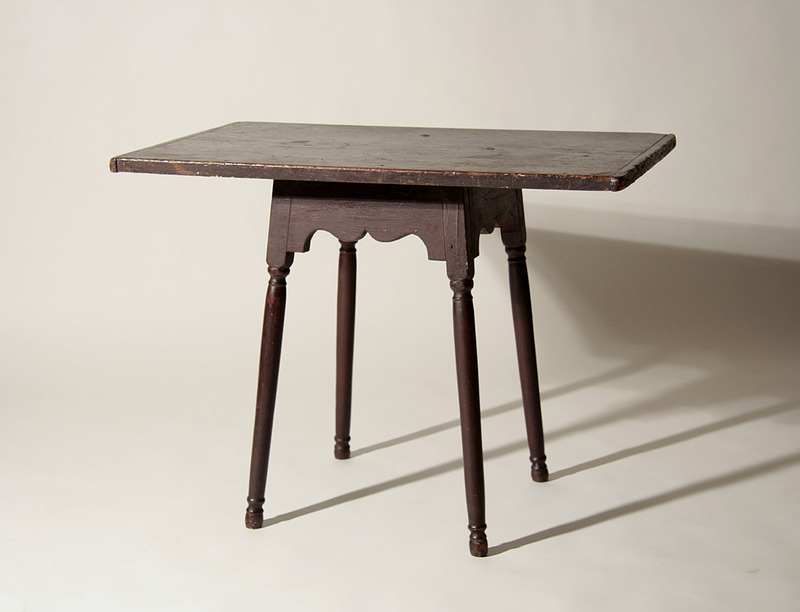 Made of maple and ash, in original mustard paint under centuries of use and dirt. 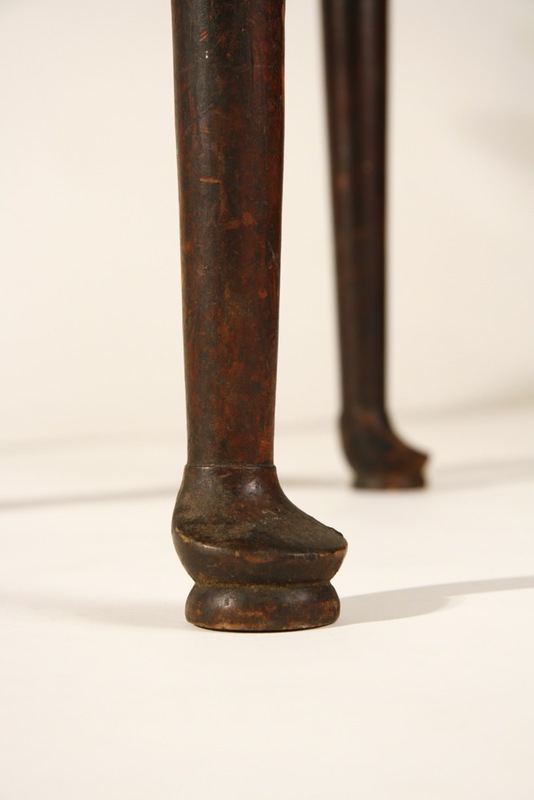 One leg was broken out at the post centuries ago and is slightly shorter than the other two. Essex County, MA, c.1690, 41 1/4" ht, 11 1/2" wide. 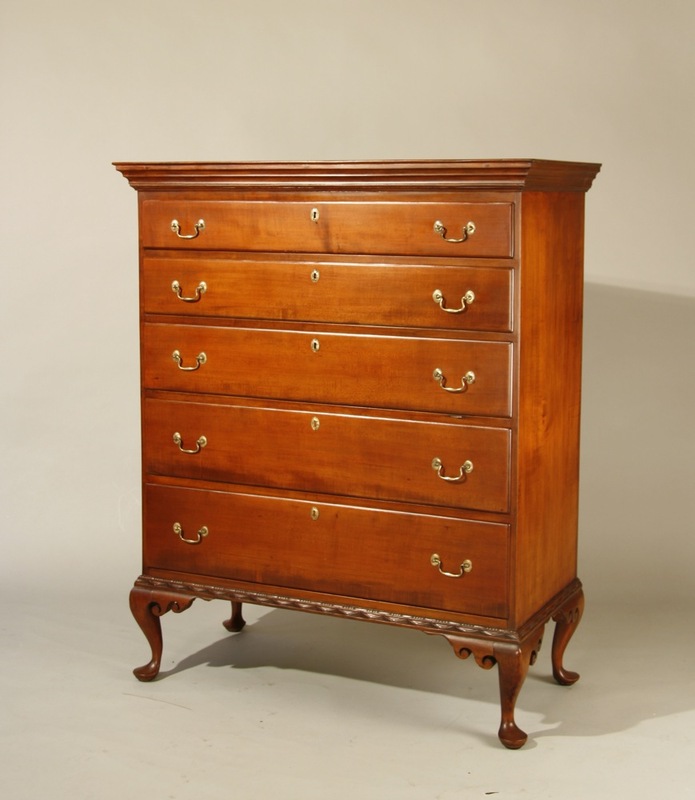 A rare and fine Queen Anne chest with bold cornice molding, five graduated drawers, classic Dunlap 'egg and dart' base molding, double-scrolled knee returns and short cabriole legs. 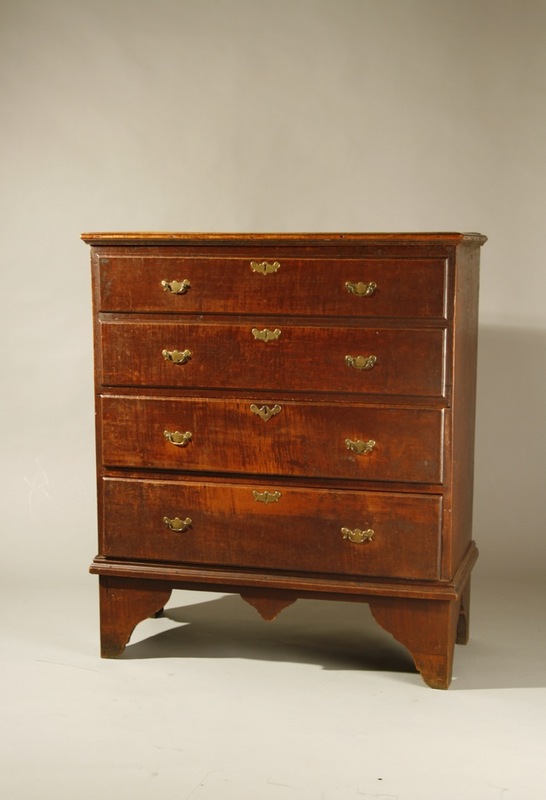 This chest was purchased directly from the Sanborn family of Boscawen and Salisbury, NH. who were direct descendents of Samuel Dunlap (line of descent provided). Also enclosed is the gold brooch of Abigail Cogeswell Sanborn, who was born in 1826 in Boscawen and married in 1850. 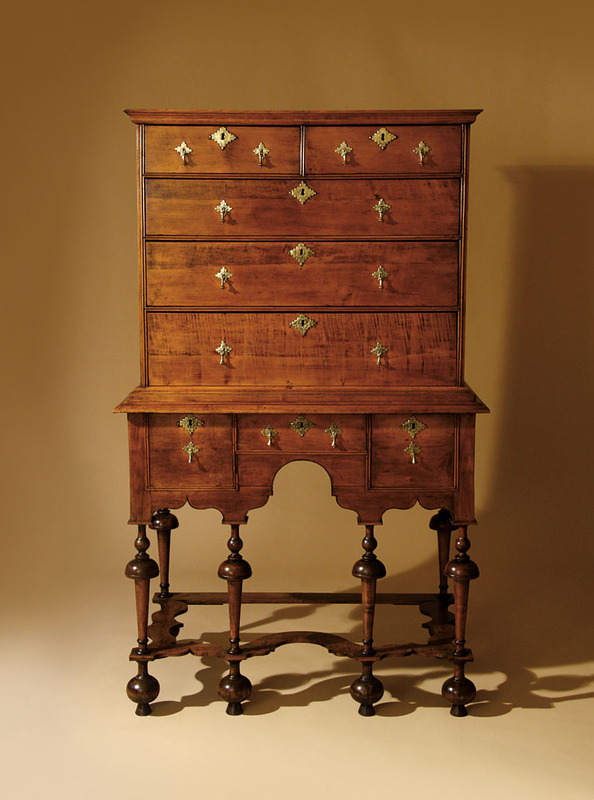 This chest is identical to the example in the Garvin collection at Yale which is signed 'Samuel Dunlap', and pictured in American Case Furniture, by Gerald Ward on p.65 and discussed on pp. 65 & 66. Note the three wooden pins securing the front molding, the comparative size of the backboards, and the light appearance of the top molding at the back-indicating the use of basswood as a molding. 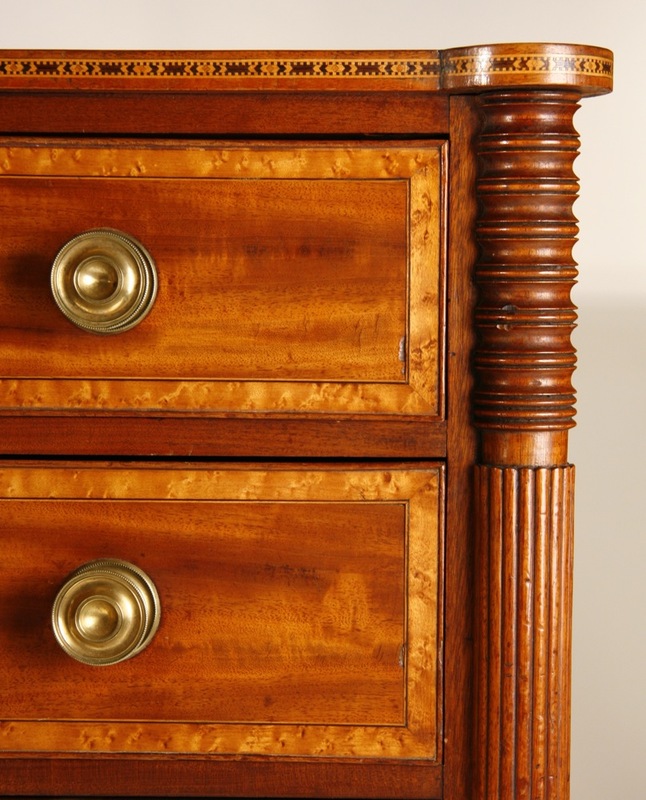 That chest has replaced brasses, but indications of small ovals--such as those on this chest-- which are original on the piece shown here. Maple, with basswood moldings and knee returns, pine secondary wood in drawers and case. 37 1/2" wide, 18" deep, 49 1/2" ht. 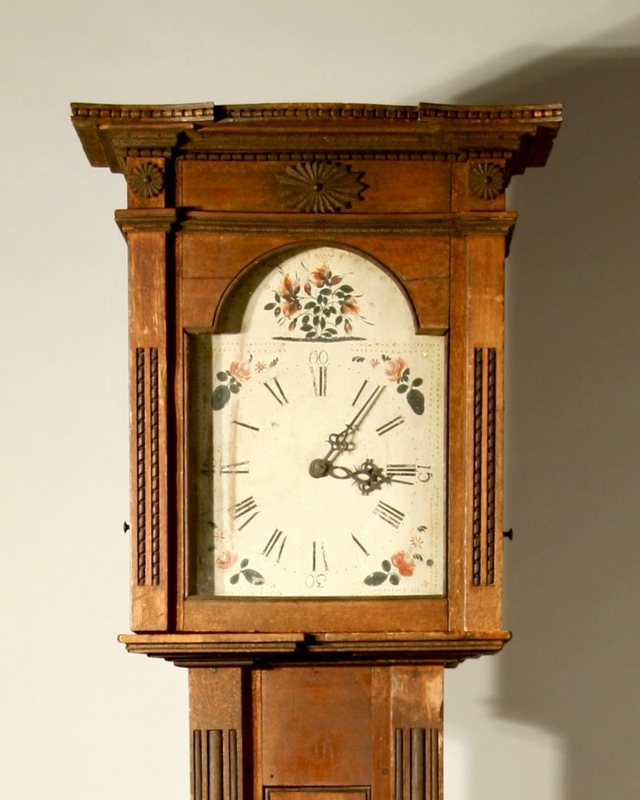 A rare 'grandmother' or 'dwarf' clock made by Jonathan Winslow, working in central MA from about 1795 to 1825. His clocks were first published in The Magazine Antiques, March, 1938. The pine case, probably made by Winslow, is painted and elaborately stenciled. There are only a half dozen of his clocks in this size known, and this example was in the collection of Nina Fletcher Little. It is pictured and discussed in "Little by Little" on page 22. Several of Winslow's clocks are pictured and described in much detail on pages 331-337 in "American Wooden Movement Tall Clocks"by Philip Morris. Worcester, MA area, c.1820-25. Ht. 48", width 10 3/4", 7" deep. 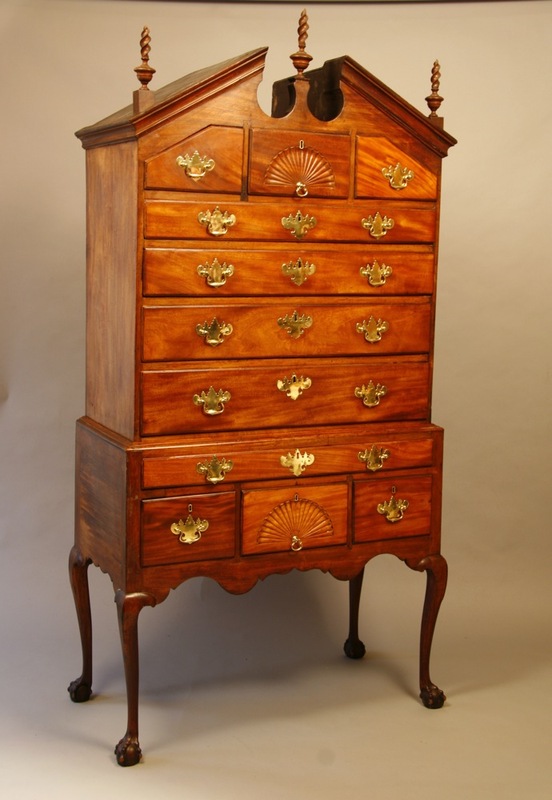 A rare and fine Queen Anne high chest in richly figured tiger maple, with chestnut and poplar secondary woods, and retaining its original brasses. Perfectly proportioned- with extremely fine craftsmanship, the skirt and removable cabriole legs are of the highest quality. 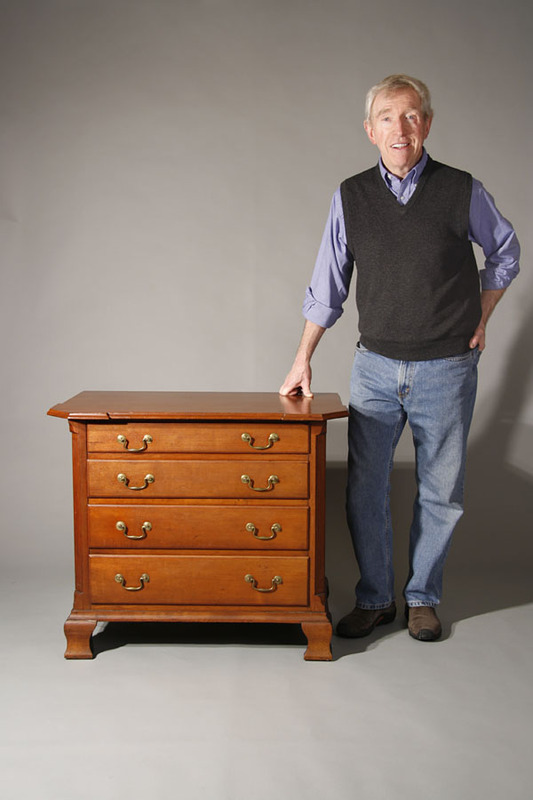 This chest has been in a collection in the Concord, NH area since the 1950's. Attributed to Christopher Townsend, Newport, RI, c.1750. Top case 36", lower case 37 1/2", ht. 68 3/4". 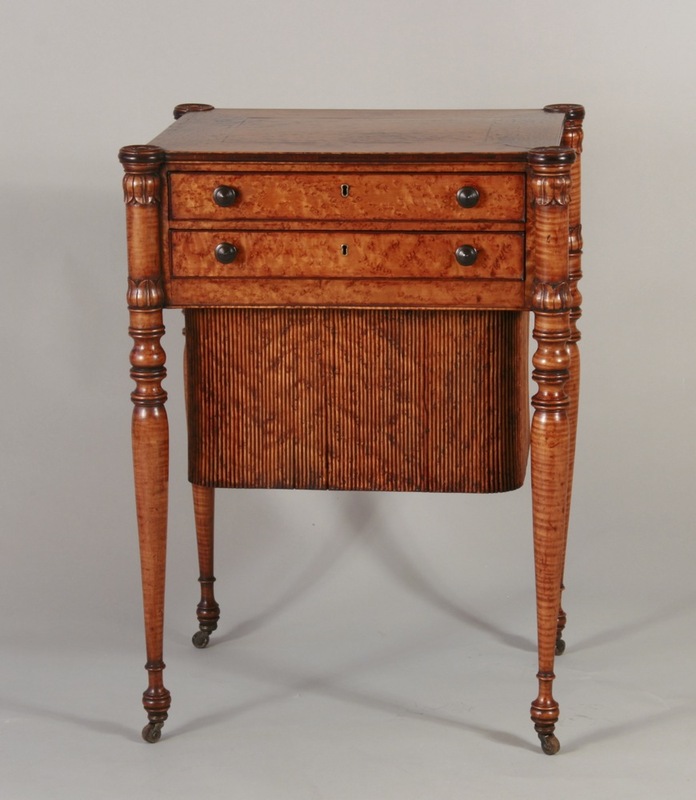 A very rare Queen Anne dressing table with a dramatically -shaped 'scalloped' top, fan-carved center drawer, triple-arcaded and 'blocked' skirt, and with exceptionally fine cabriole legs. 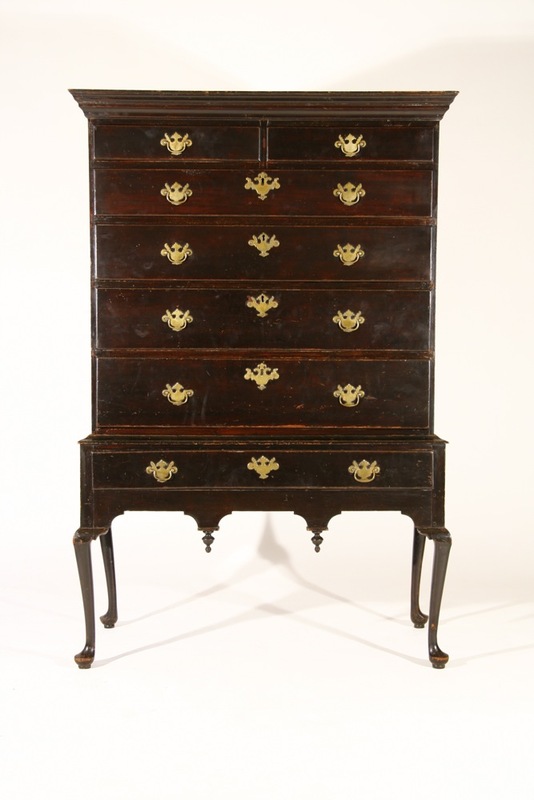 One of the rarest and sought after forms in 18th century American furniture. The most comprehensive article about this furniture is by Michael Brown, in The Magazine Antiques, May 1980. 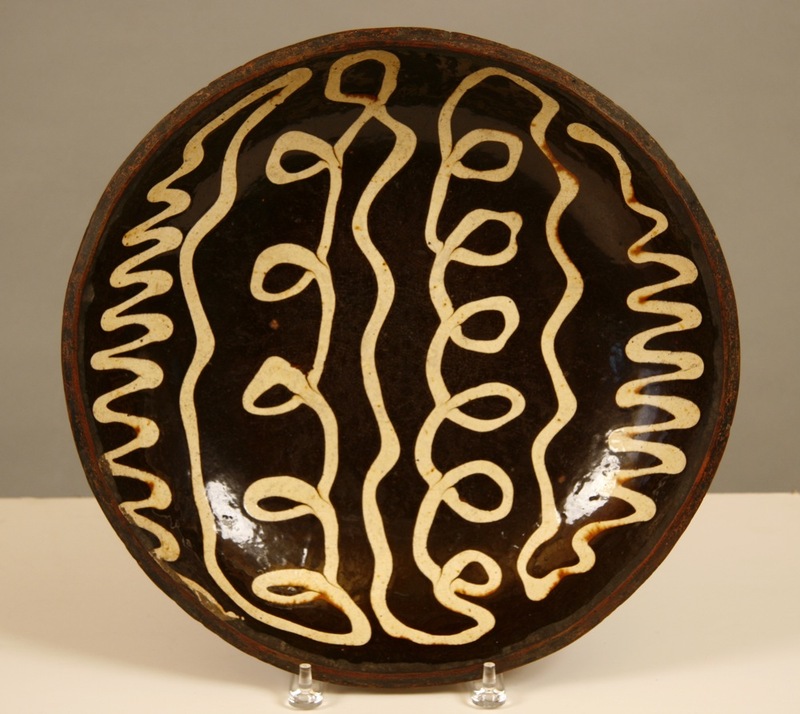 I sold this piece in 1990 and have just re-purchased it. Cherry, with pine secondary wood, in a fine rich old surface. 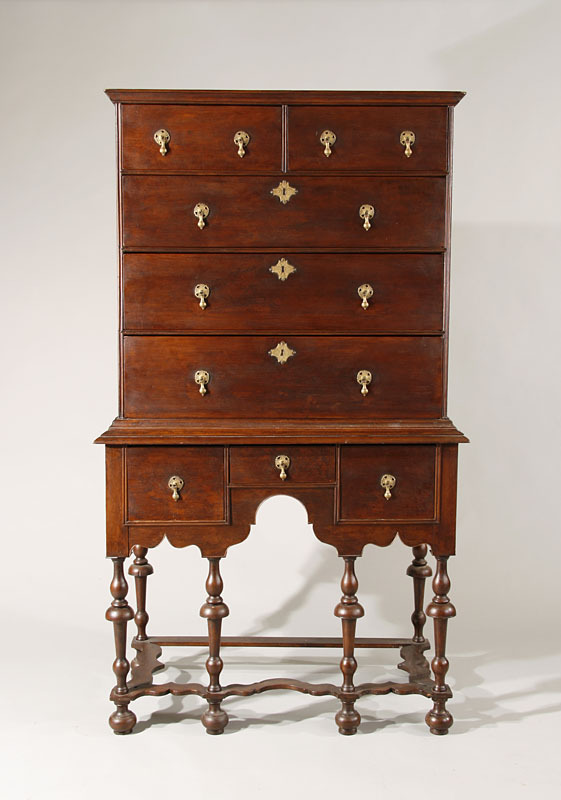 Attributed to the Munn family of cabinetmakers, Deerfield, MA, c.1780-85. Case width 31 1/2", ht. 31 1/2". Top width 36 1/2". 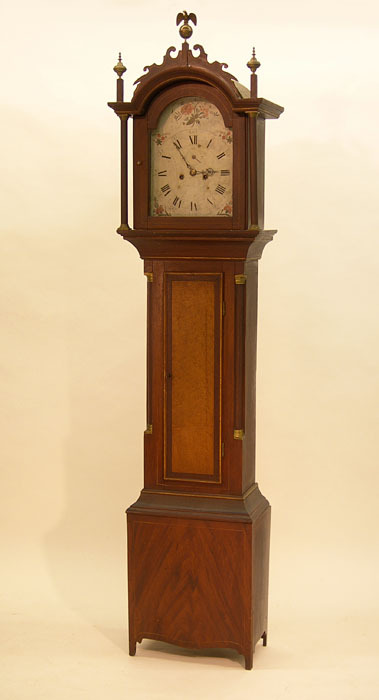 This Federal tall clock, with a fully veneered and inlaid case, exhibits the finest proportion, design, and surface treatment of any clock of its type--and is further enhanced by its signed and numbered dial and a great old 'as descended' surface. 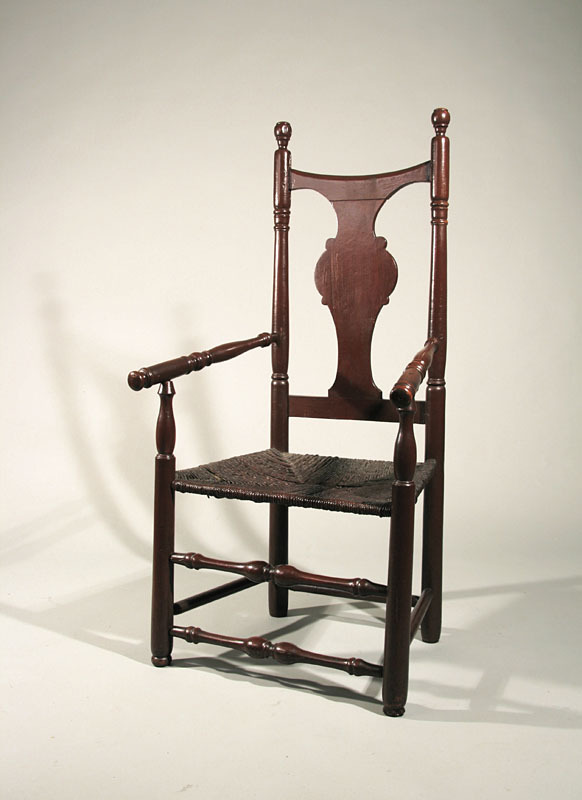 It was part of the furnishings of the Campbell-Whittlesey house of Rochester, NH, property of the Landmark Society of New York and on the National Register of Historic Places(1970). 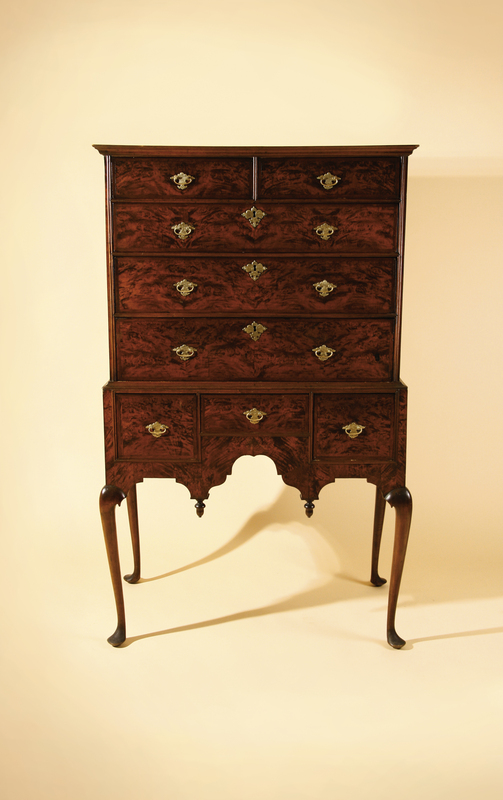 Made of mahogany, with pine secondary wood, and veneered with mahogany. The multple inlays are maple or boxwood. Maximum height 96", width of case 19 1/2", 10" deep. The eight day brass works with moon phase dial were made and signed by Lord & Goddard, working in partnership in Rutland, VT from 1797-1805. There are perhaps a dozen examples known--and this case has no equal. The ends of the crest are inlaid with segmented maple or boxwood, the sides of the case above the door are inlaid with rope-twist, there is a full floral oval inlay centered on the crest above the line-inlaid door, and there are fluted pilasters balancing the hood both front and back. 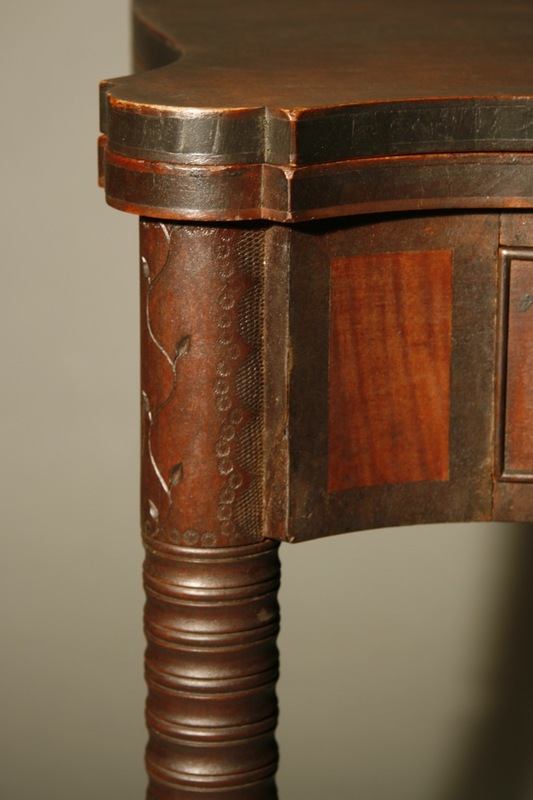 The central section of the case above the door is edged with rope twist inlay, and inset with a horizontal veneer panel with maple quarter fans at its corners. The door is fully veneered with an elongated oval panel running nearly top to bottom--and with an full oval paterae of maple centering that. The sides of the case have quarter columns. 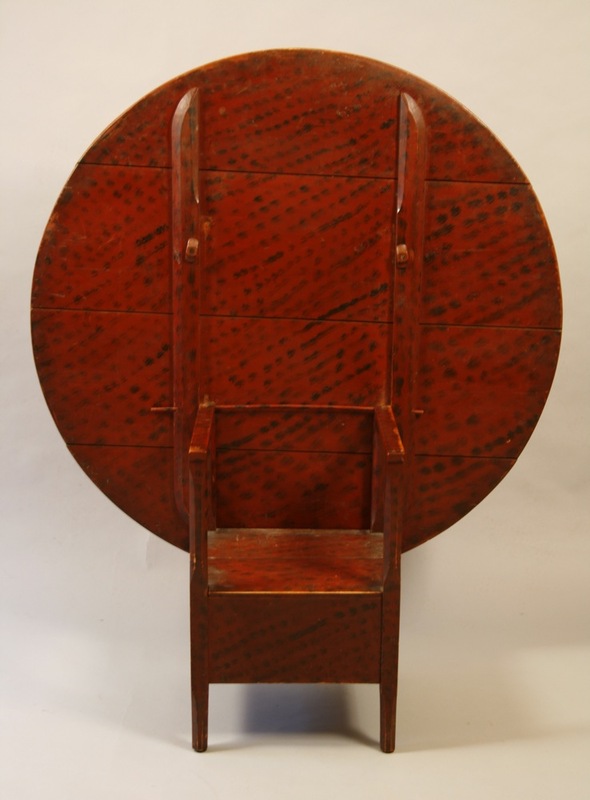 The pattern of ovals within ovals is repeated in the lower section of the case--but here there are two sets of each, side by side, surrounded with book-matched mahogany veneer panels. The case rests on a molded applied bracket base with flaring French feet. 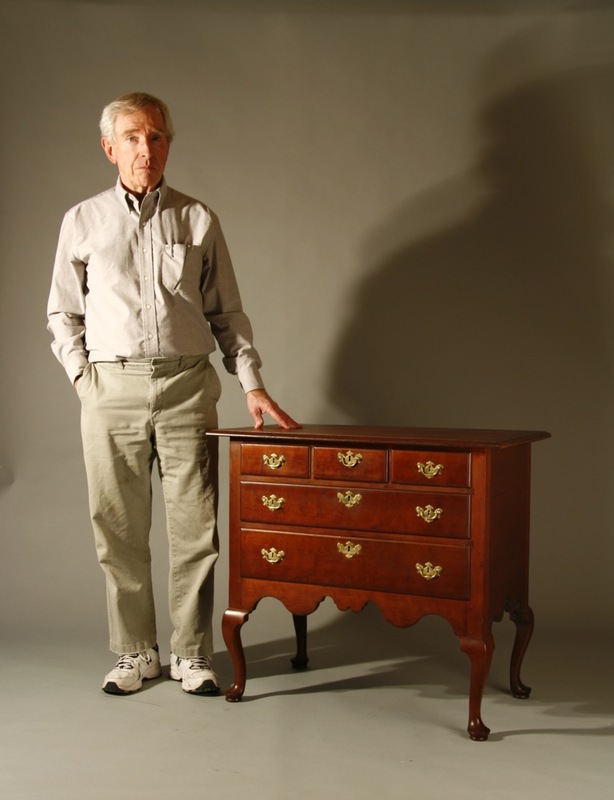 The sophistication of design and surface treatment seen here is evidence of a master cabinetmaker working with skilled clockmakers to provide " the best the country affords" as Kenneth Zorgy's book on Vermont furniture is titled. 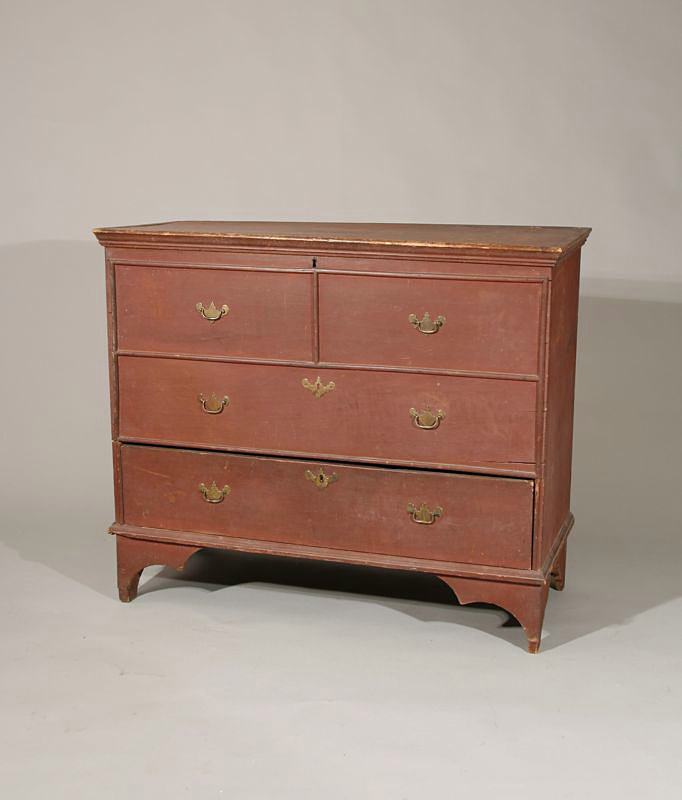 A rare William and Mary two drawer blanket chest with four false drawers, double-arch molding on case, and with great turned feet. Hard pine, with oak framing and maple feet. In a dark stain matching the original, with only a small repair to the applied molding. Probably CT origin, c.1725-40. Case width 37", ht. 45 1/2". The feet are 8" tall. 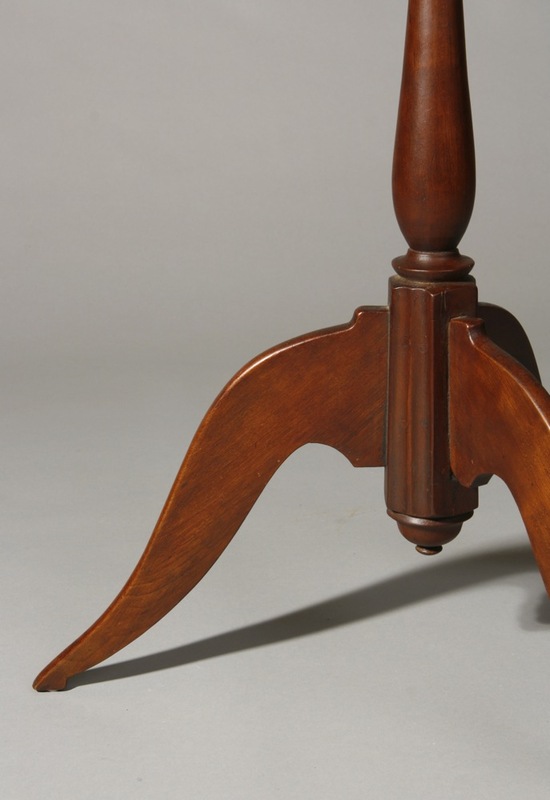 A very rare and fine Federal period candlestand with inlaid tilting top, a superb fluted and reeded shaft, and inlaid sabre legs. Cherry throughout, in old surface. Concord, NH area, c.1815. This stand is pictued in Sack, vol. VI, p.1485. 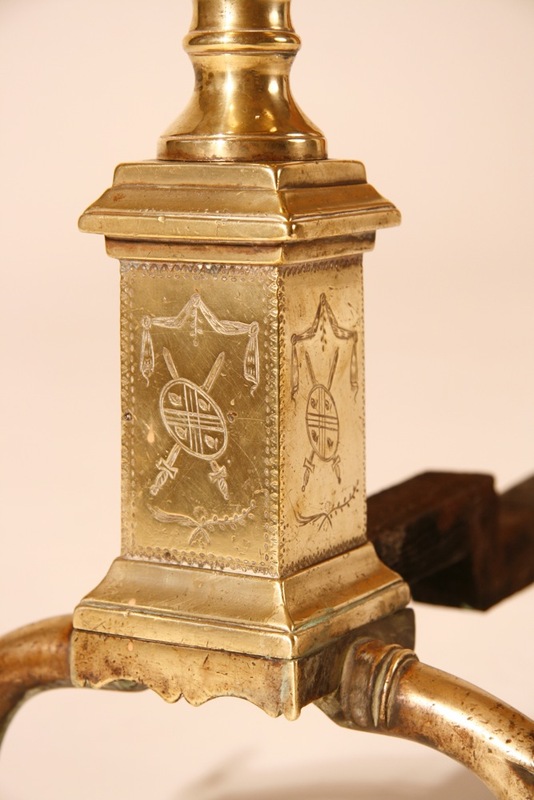 A stand by the same maker with Masonic inlay was owned by General Daniel Hoit of Center Sandwich, NH. Top 14 1/4" x 18 1/2", 27 1/4" ht. 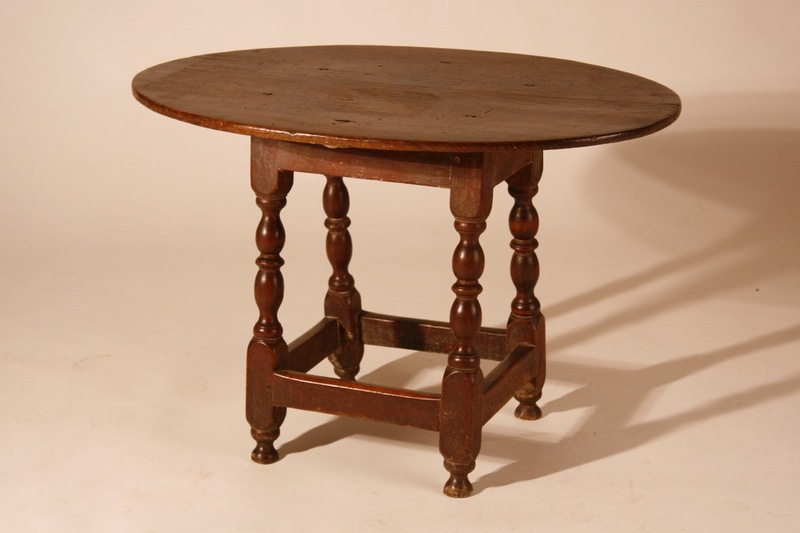 An exceptionally rare American gate-legged table with ball-turned base. Maple, with oak frame. 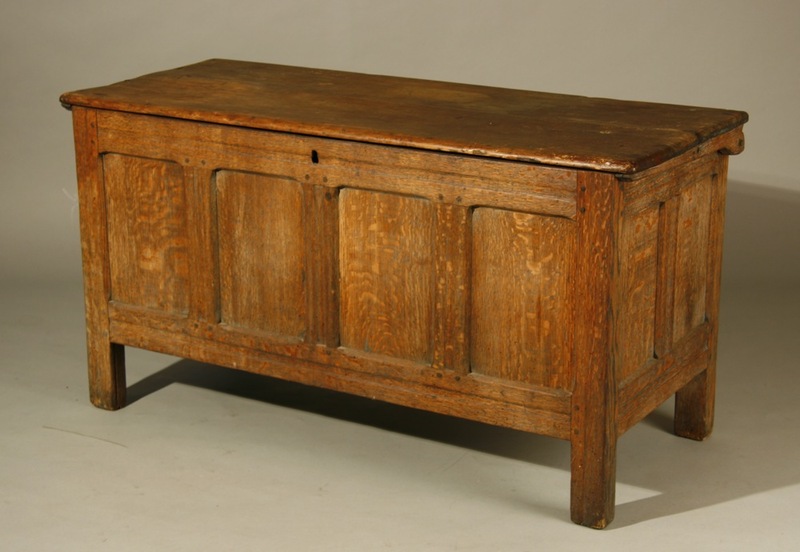 The original drawer, which retains its original knob, has an oak front and back and pine sides. 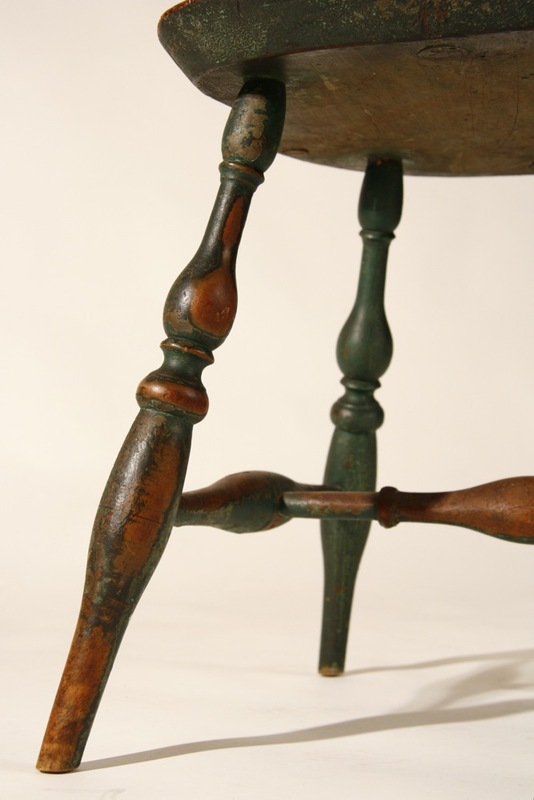 The early 19th century blue/green color of the base, while not original, has great wear and presence. The top is an early to mid-19th century replacement and was on the table at the time the blue paint was added. Probably south shore MA origin, c.1670-1690. Top 43 3/4" x 43 1/2", 27 1/2" ht. Purchased from Roger Bacon in the 1960's and in two collections since that time. A rare Hudson Valley shoe-foot hutch table with oval top, shaped cleats, pierced sides, and intricately cut out skirt and central stretcher. Cherry throughout in great old color. 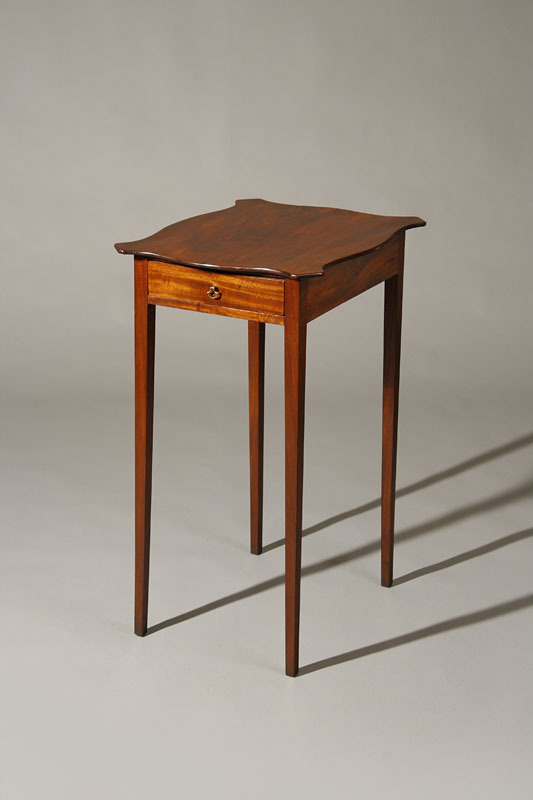 A table by the same maker, in the collection of Winterthur, is shown on p. 167 in Rememberance of Patria. Ulster County, NY, 3rd quarter 18th century. Top 42" x 48", ht. 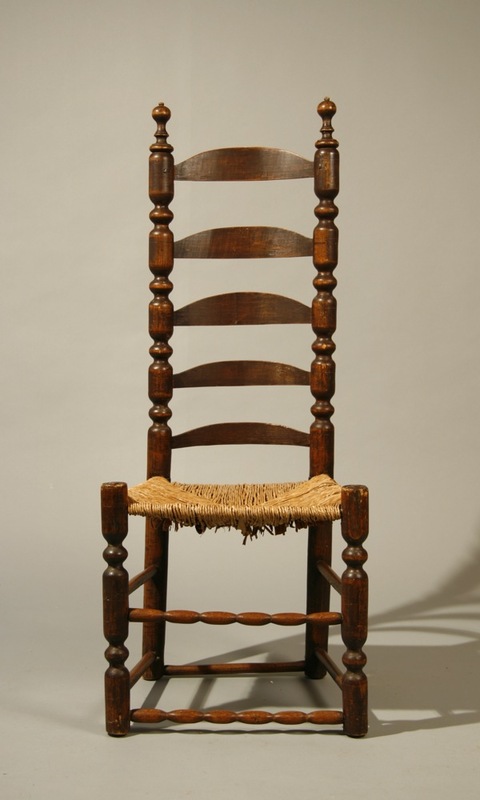 25"..
An exceptionally rare American turned, or 'Carver' chair, c.1690. 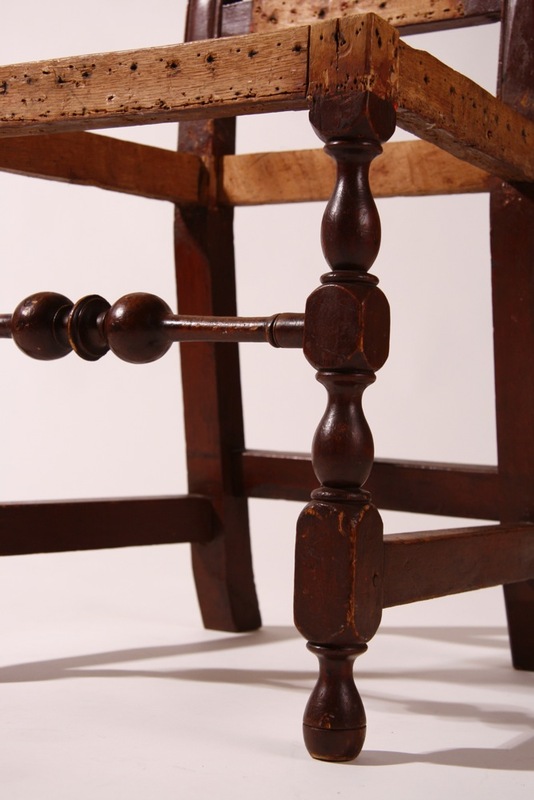 Maple and ash with boldly-turned finials, with two banks of turned spindles, ball-turnings on the back posts, and 'mushroom' handholds on front legs. 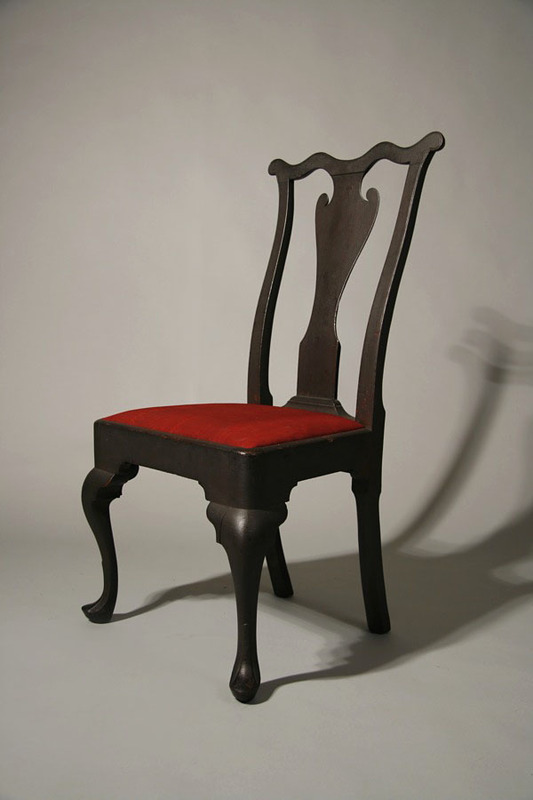 A massive chair with 2 1/2" posts and 45 1/2" tall--in an old 19th century red stain with no repair or restoration. 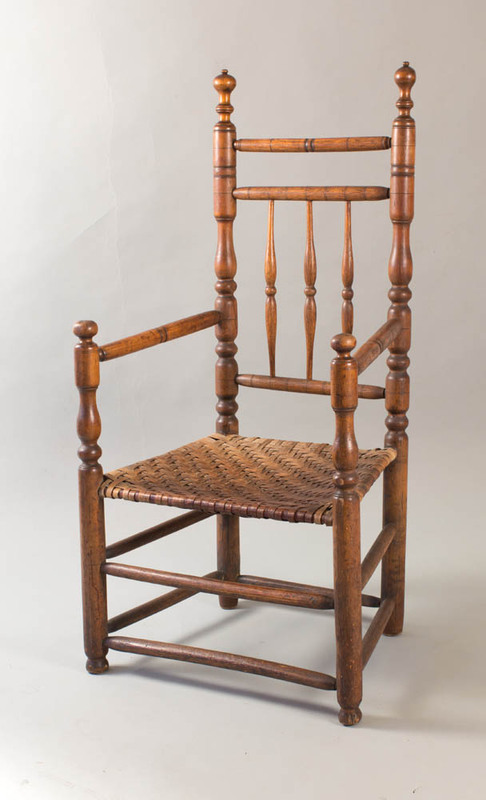 While it lacks the traditional turned elements of North Shore, MA chairs, and the double bank of spindles is associated more often with South Shore MA examples, this chair descended in a family from Lowell,MA until the late 1980's. It is the only turned armchair that I have owned in a least a decade. 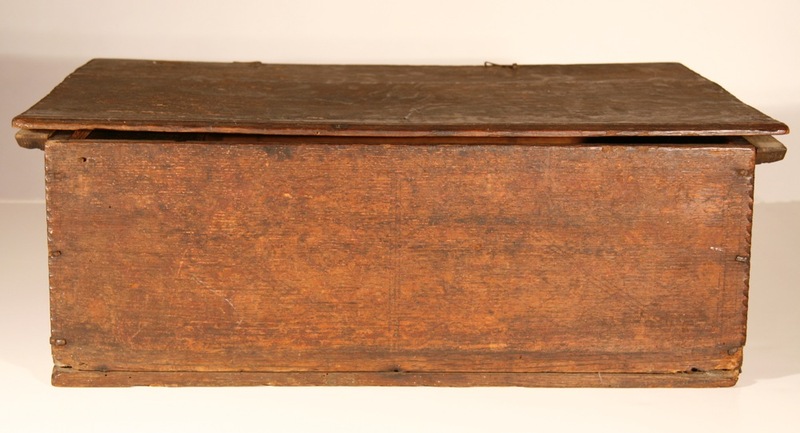 A very rare 17th century document box made entirely of red oak. It retains it's original swirled and dauded painted surface and original cotter pin hinges. The top has a molded front edge, scribed decoration, and is thumb-gouged at the edge of the sides. The entire front is scribed with original cross-hatching and also has a thumb-gouged edge. There is a small lidded oak till inside the box. The base molding is missing--and based on oxidation, has been missing for centuries. Coastal MA or CT, last quarter of the 17th century. 15 1/2" x 20 1/2" x 8" ht. 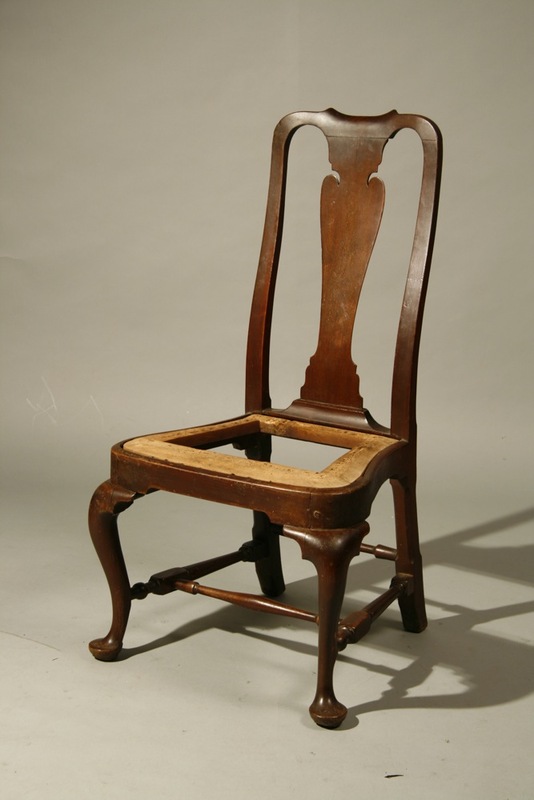 A Queen Anne sidechair with molded back, framed slip seat, shaped front rail, boldly-turnrd front stretcher, and block and turned legs. Maple, in old black paint. No repair or restoration. Portsmouth area, c.1730-45. 42" ht., 17" seat ht. 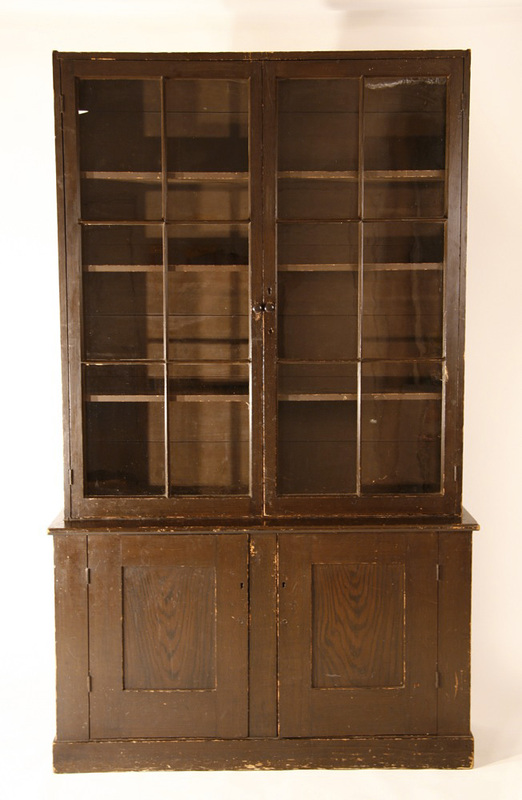 A country bookcase in old grained paint over original green/gray. 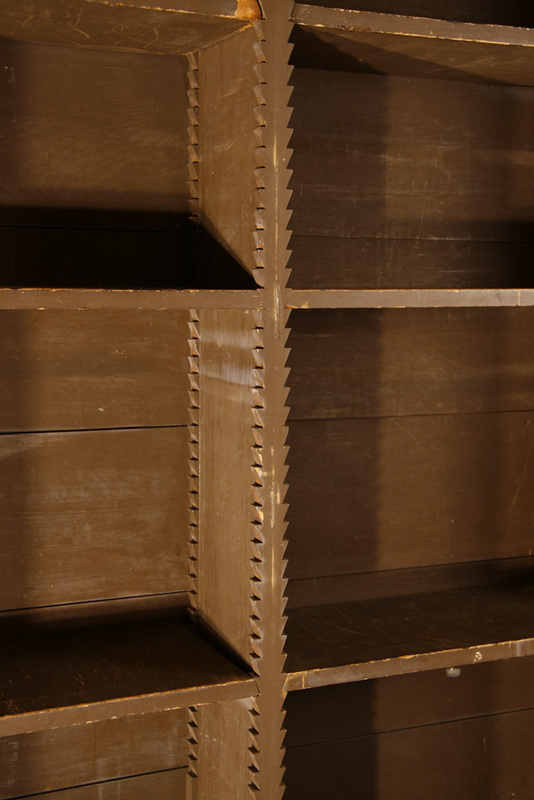 Adjustable shelves with unusual chamfered ends and brackets. Pine throughout- made with square nails and with no circular saw marks on any board--and retaining all original wooden parts ( the locks and knobs are old replacements). The glass appears to be original. Found in Maine and probably made there c.1840. 50" maximum width, 84" ht., 15" maximum depth. 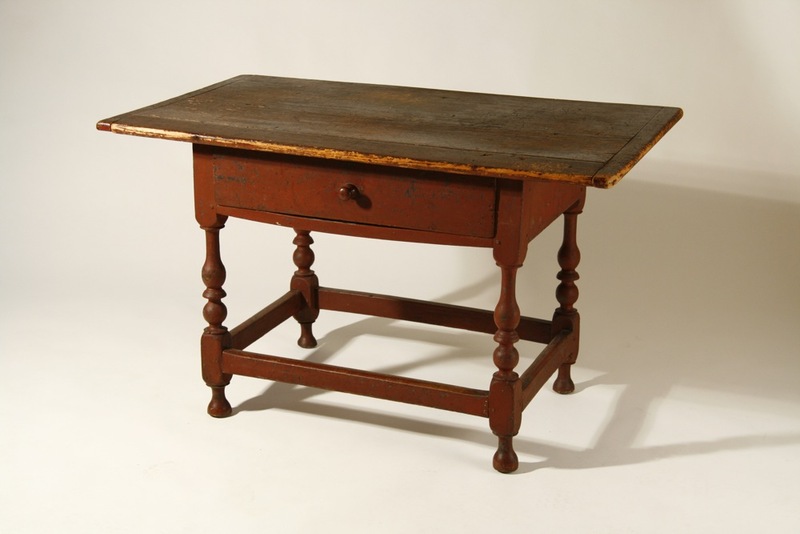 One of the rarest forms of 17th century American furniture( probably fewer than a half dozen have survived), this stretcher table has survived in remarkablely original condition--retaining its original top, drawer, and feet--and is in an old 19th century red paint. 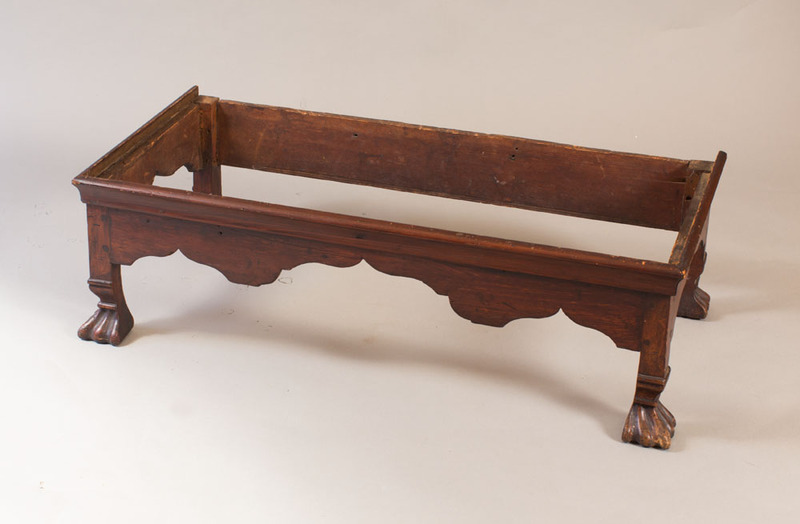 Made of maple and pine, probably in Boston, c.1670-90, it is probably the only example with a scrolled front rail. 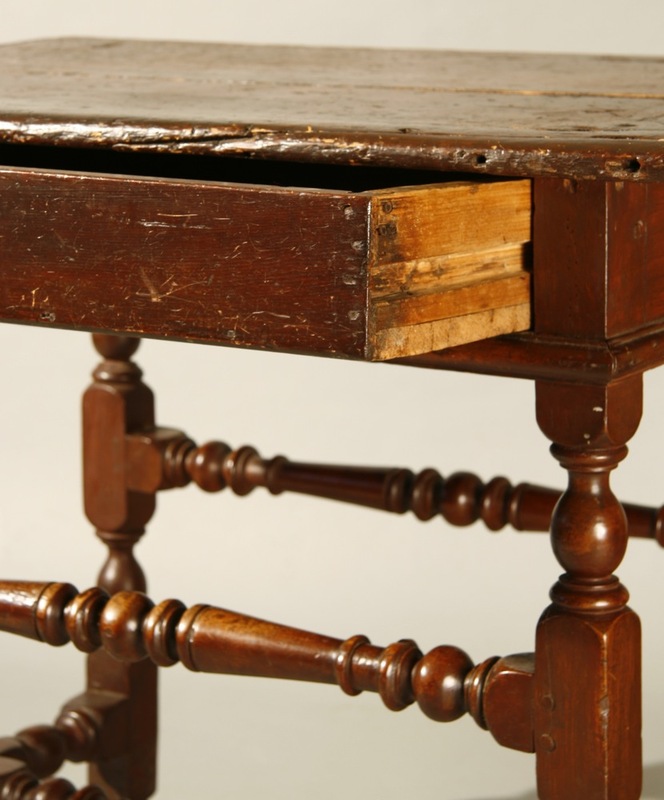 Repairs to the table were done in the 19th century, using square nails, and before the paint was applied. 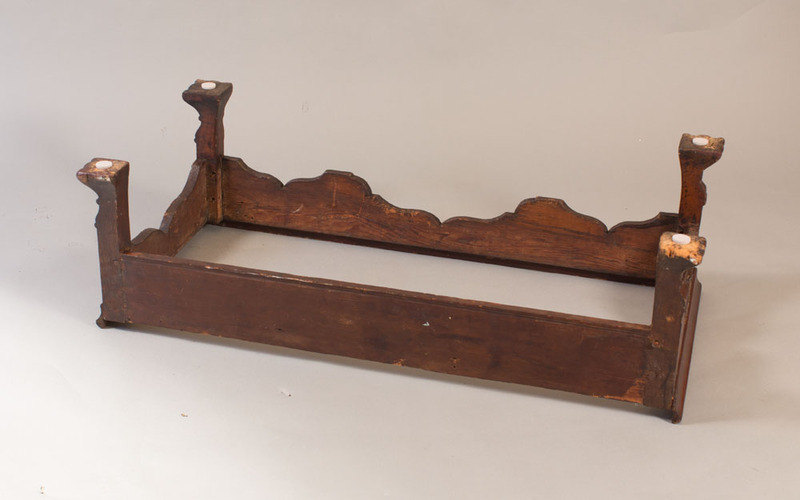 The back edge of the top, the molded breadboard ends, and the runners for the side-hung drawer are the only changes to a piece nearly 350 years old. 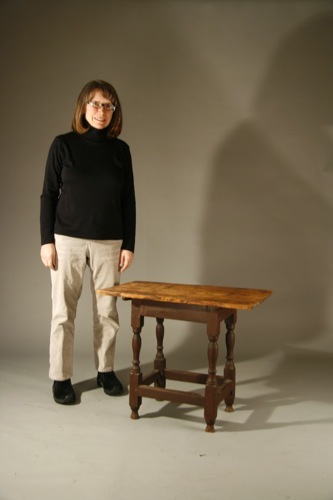 This table was part of the Behrend Collection( many pieces in Nutting's Furniture Treasury)and was donated to The Art Institute of Chicago in 1946. 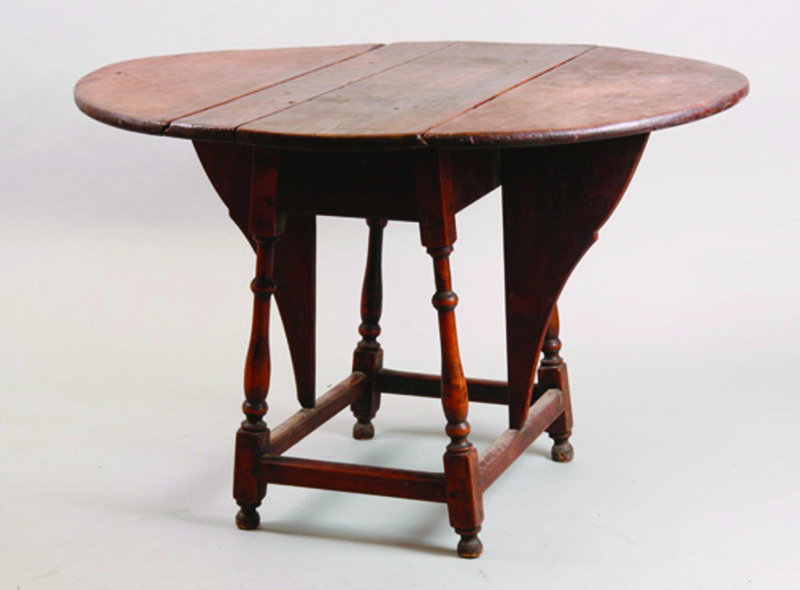 De-accessioned in the 1980's, the table has been in one collection since then. 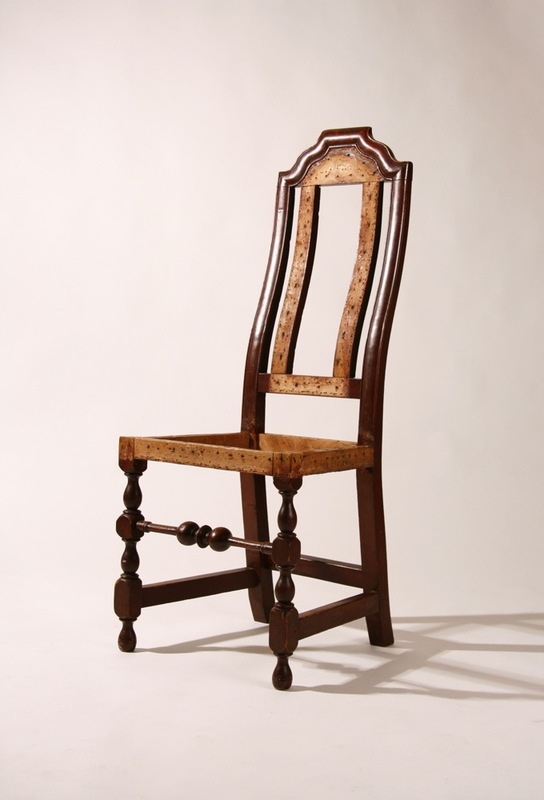 A very fine Windsor continuous-arm chair made of maple and ash. Rhode Island, last quarter 18th century. 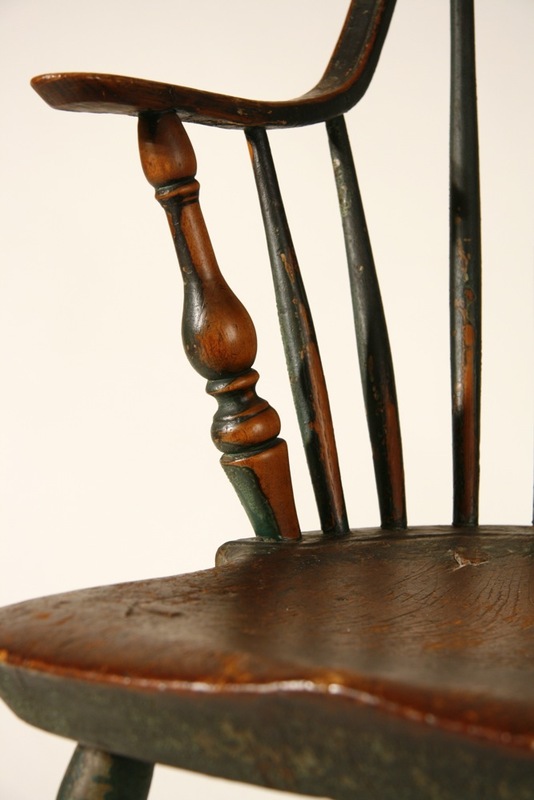 The turnings on the arm supports and legs are as good as any of the type, and the worn surface is the finest of any Windsor chair that I have owned. The tonality of the green-painted surface is remarkable-to say the least! There is an old break at the end of one arm. 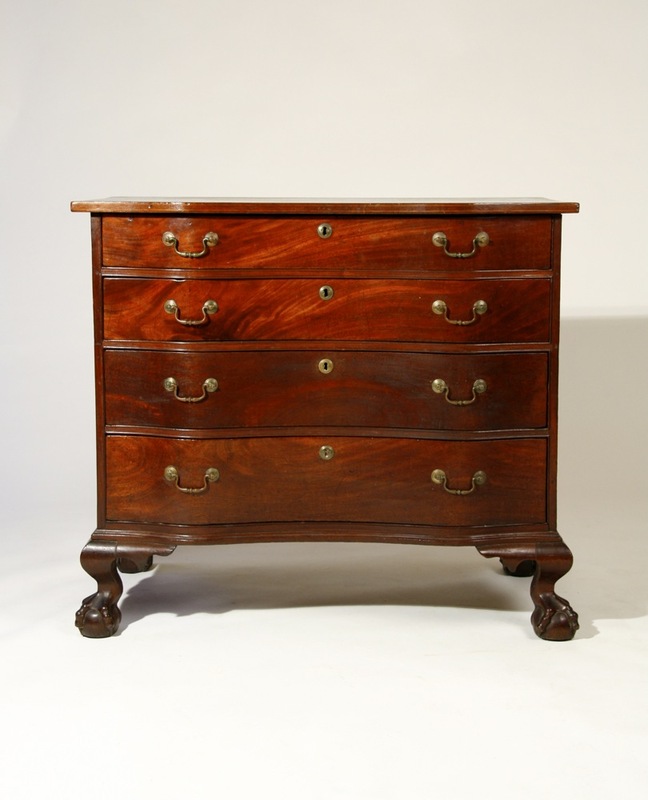 A very fine mahogany reverse serpentine Chippendale chest with inlaid edge top. 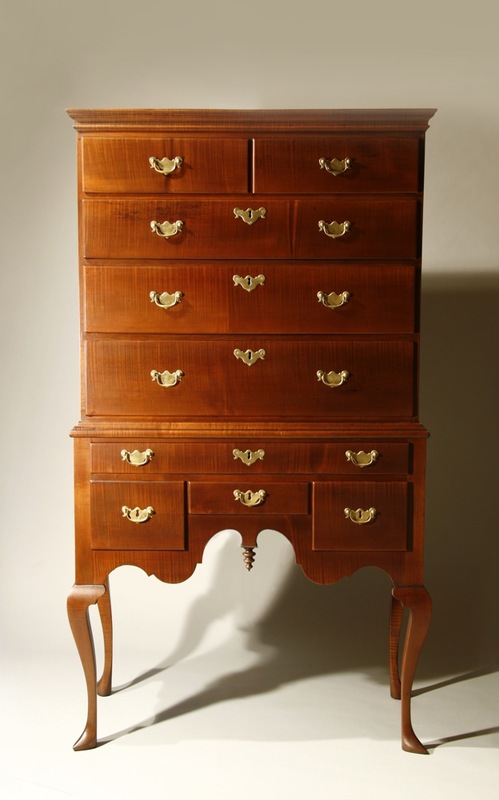 While the chest itself is compact( 35 1/2"), the feet are large and boldly-proportioned--and particularly well-carved. Made with beautifully-grained wood, and retaining its original brasses and a rich old surface. 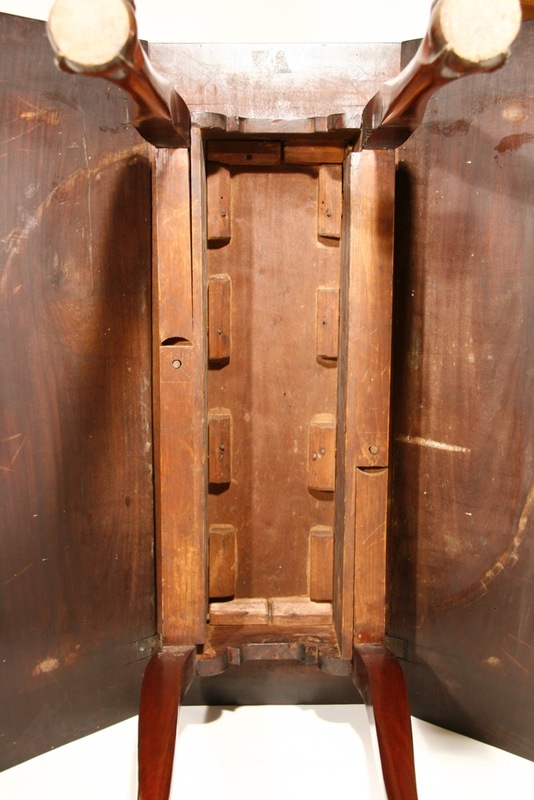 The underside and back of the chest are as 'clean' as the rest of the chest--it has survived in remarkable condition. North Shore, MA. c.1780-85. 33 3/4" ht. 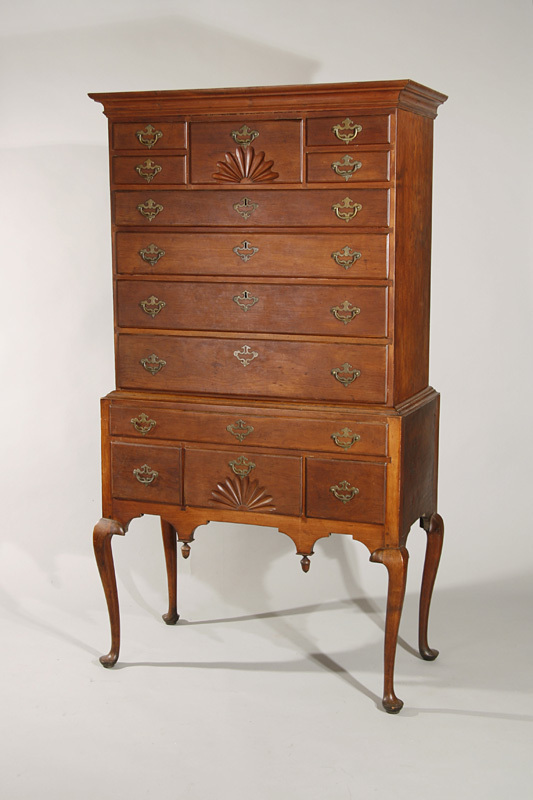 An unusual Queen Anne chest on frame with deeply-molded cornice, six rows of drawers-with double rows at top and bottom. 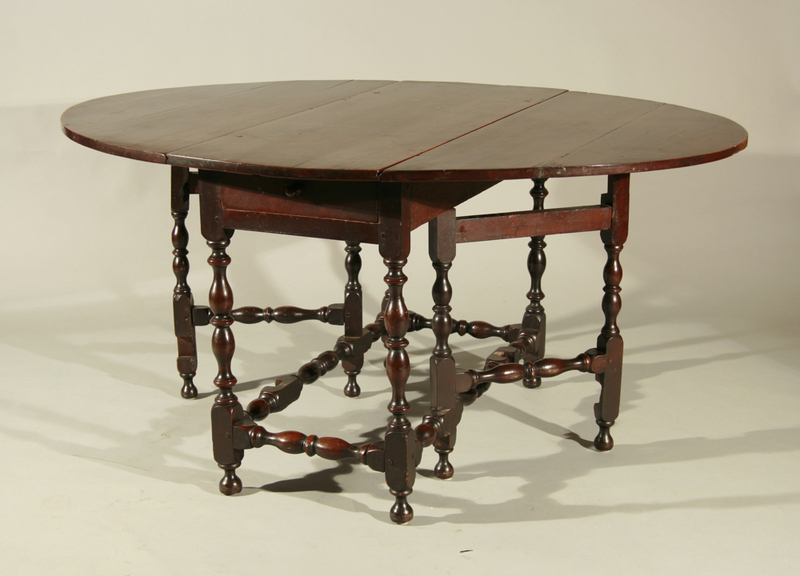 The frame has a fine triple-arcaded skirt and well-shaped cabriole legs. Birch and pine, all in an old brown paint with nearly all of its original brasses. See condition report for repairs. New Hampshire origin, c.1785-1800. 39" case, 69 1/2" ht. 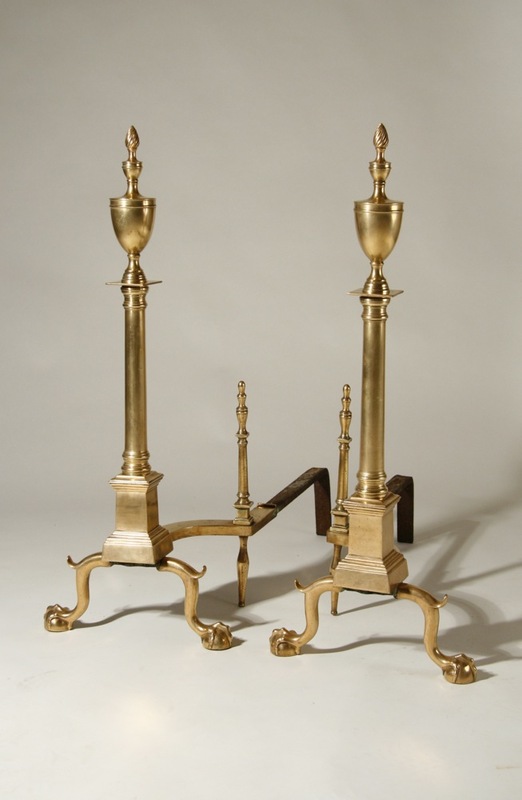 An exceptional pair of 'left and right' Chippendale andirons with twisted flame finials above urn-shaped tops, long columnar shafts, molded, square plinth bases--all above cabriole legs with spurred knees and ending in oversized ball and claw feet. 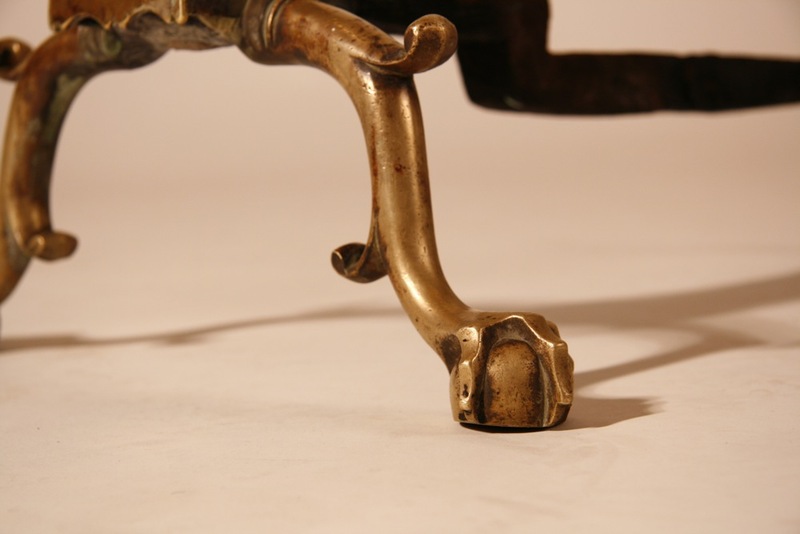 The dogs are brass-encased, and the log stops are cast to follow the fronts. 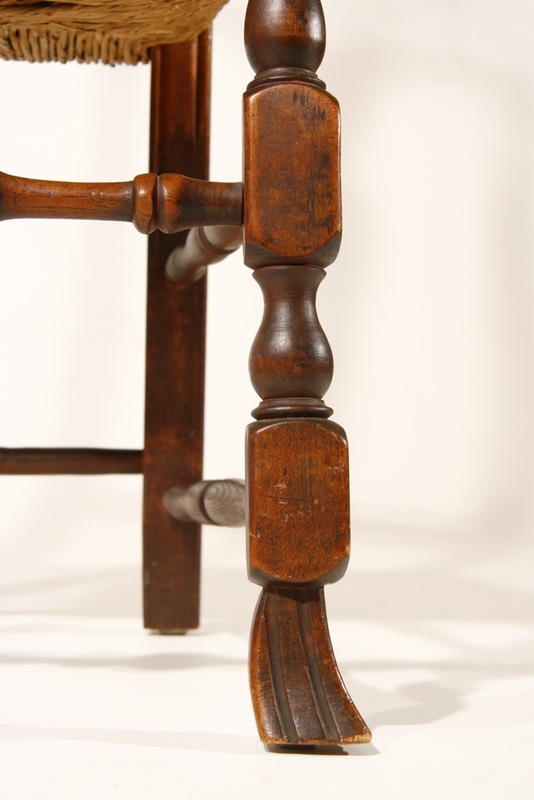 The tallest--32 1/2"-- and finest andirons from this period that I have seen. 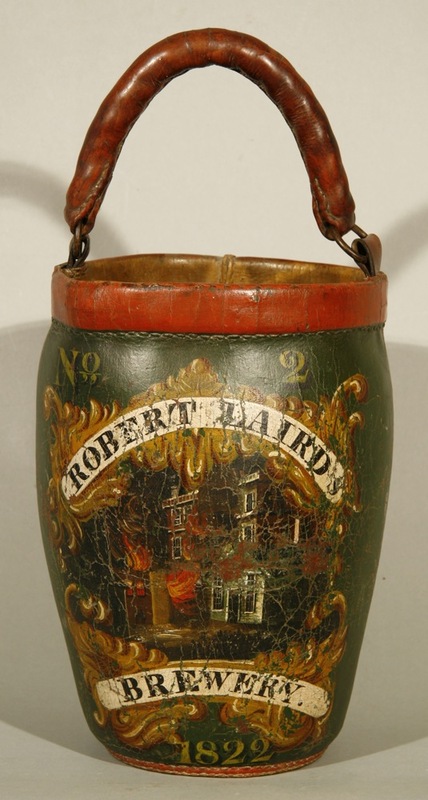 In bell metal, probably Boston, c.1785. 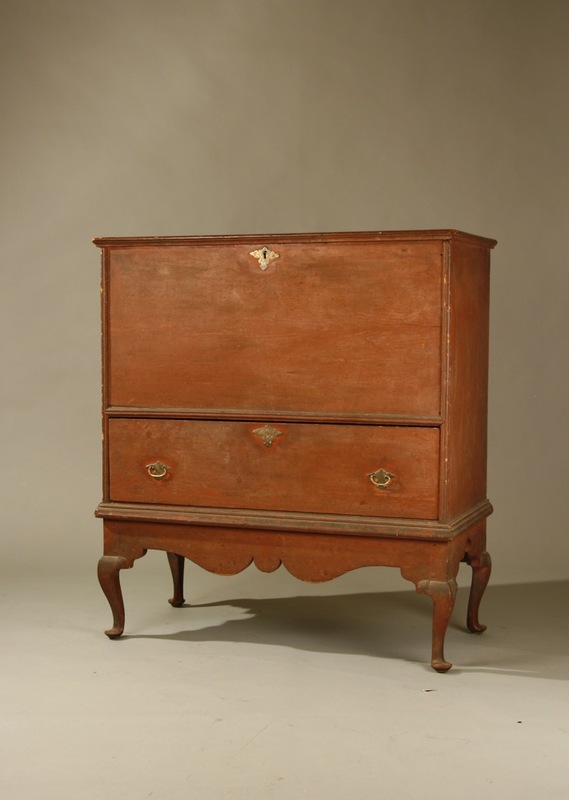 A rare and very fine William and Mary high chest with molded cornice, applied double-arch molding on the case, triple-arcaded skirt--cyma-curved at the sides with a high arch to the center. All above superbly-turned legs with compressed cup turnings, shaped stretchers, and compressed ball feet with flared lower pads. Maple, with poplar and chestnut secondary woods, in original structural condition and retaining its original etched brasses. 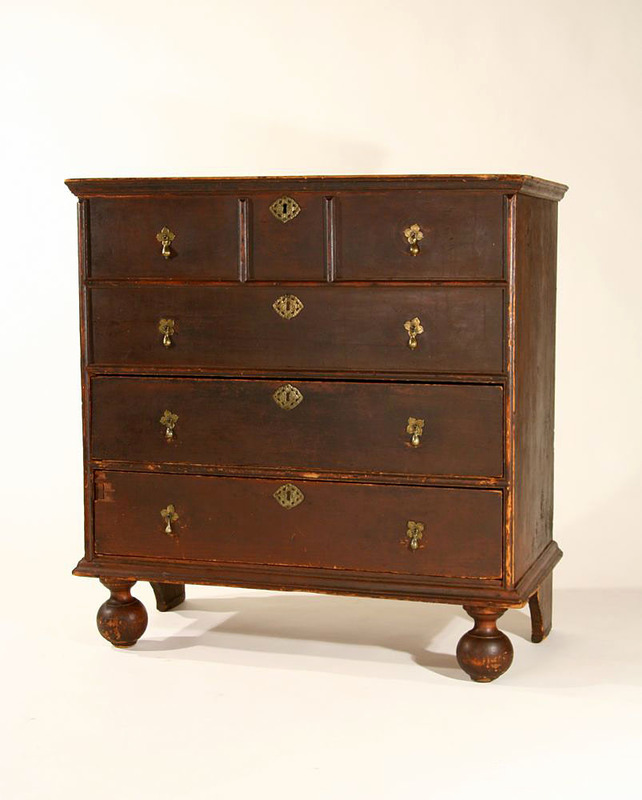 This high chest exhibits classic Rhode Island turned elements and is the finest example that I have seen. Descended directly in the family of William Rogers of Newport, RI (1709-1772) and is now offered for the first time. 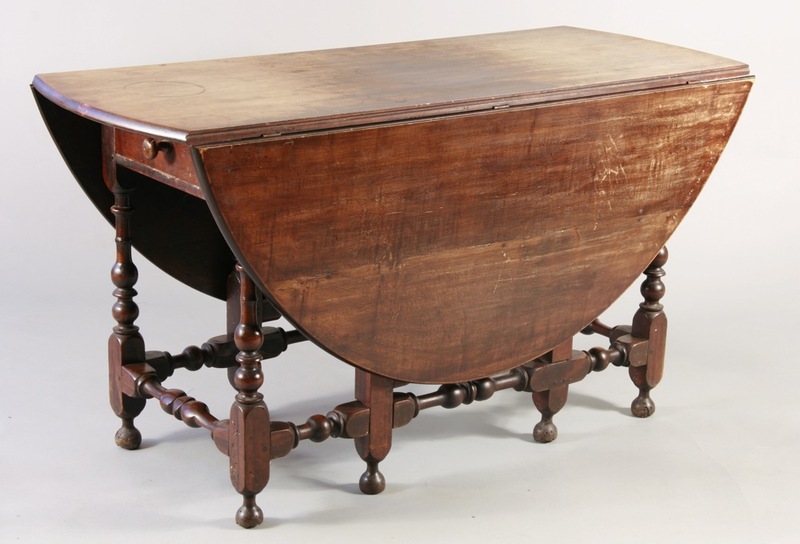 A very rare William and Mary tavern table in an exceptionally small size. The single board oval pine top, 21 3/4" x 31 1/2", is perfectly proportioned over the small splayed base. The frame, with bold vase and ring-turned legs, is made of pine and maple and retains much of its original deep red paint. 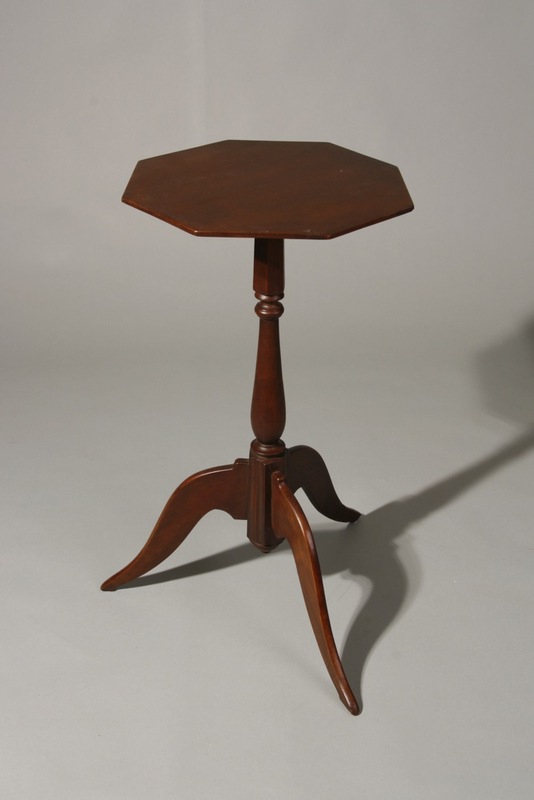 Only 21" high, the table has great presence and scale. A 19th century coat of white paint was removed many years ago. Descended in the Beane family of Kingston and Duxbury, MA. 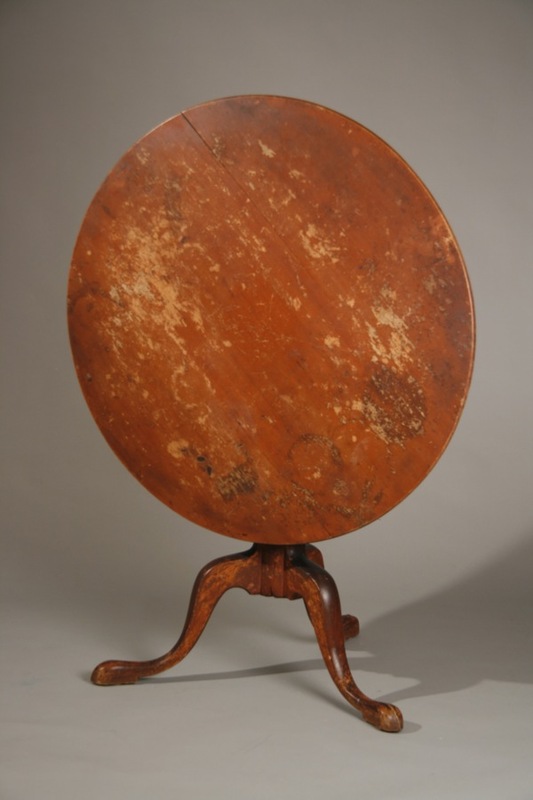 The table was probably made on the South Shore, c.1720-30. Where to begin? 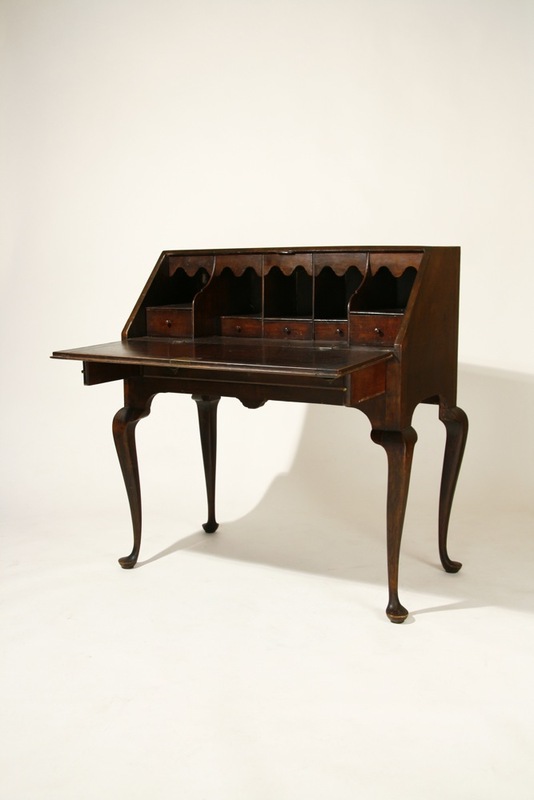 A reverse-serpentined Chippendale desk made of the finest mahogany--with oversized ball and claw feet, perfectly-carved scallop shell center drop, oversized original brasses, blocked and shell-carved interior with three fans, carved flame-topped document drawers, and rare mirrored prospect door. 'As descended' condition, with original surface and great presence. North Shore, MA, probably Salem, c.1775. The finest of its type that I have owned in over 40 years. 41 3/4" width, 44" ht. 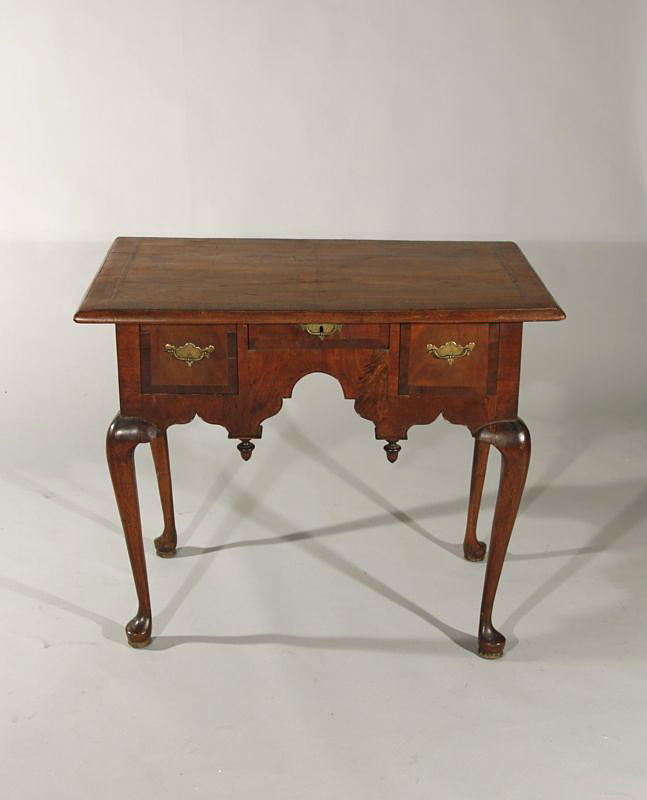 A very rare country Queen Anne desk with full width drawer, shaped skirt, and exceptionally well-carved cabriole legs ending in pad feet. 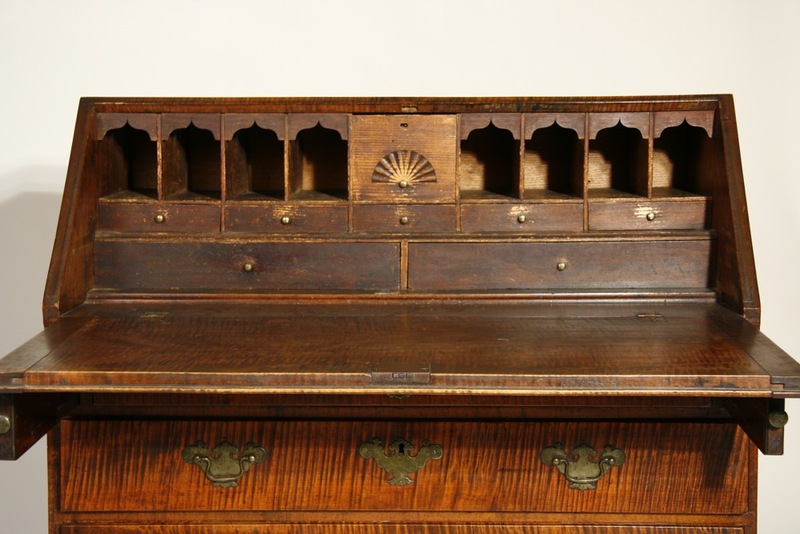 The interior contains five full drawers and five drawers hidden behind scalloped valances. 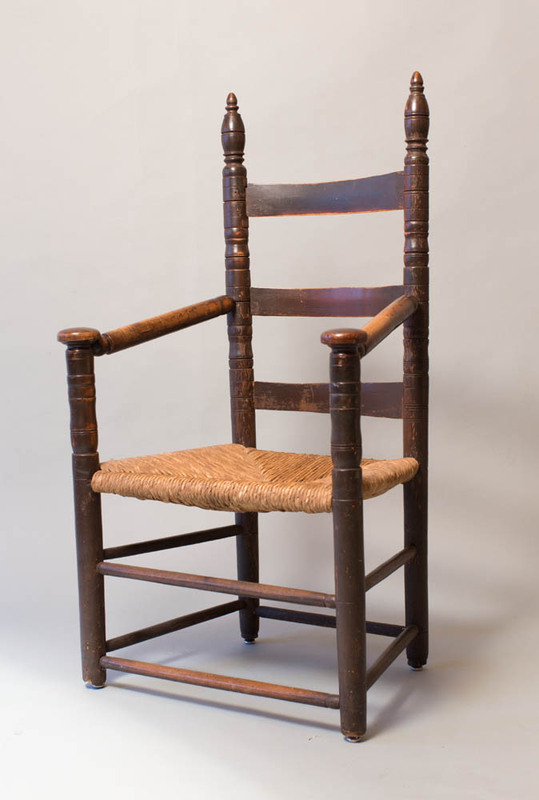 Made of maple and birch, with pine and poplar secondary woods, probably in eastern CT or RI, 1760-75. 37" case width, 29 1/4" writing ht. Just re-acquired from the collector to whom I had sold it in 1990. 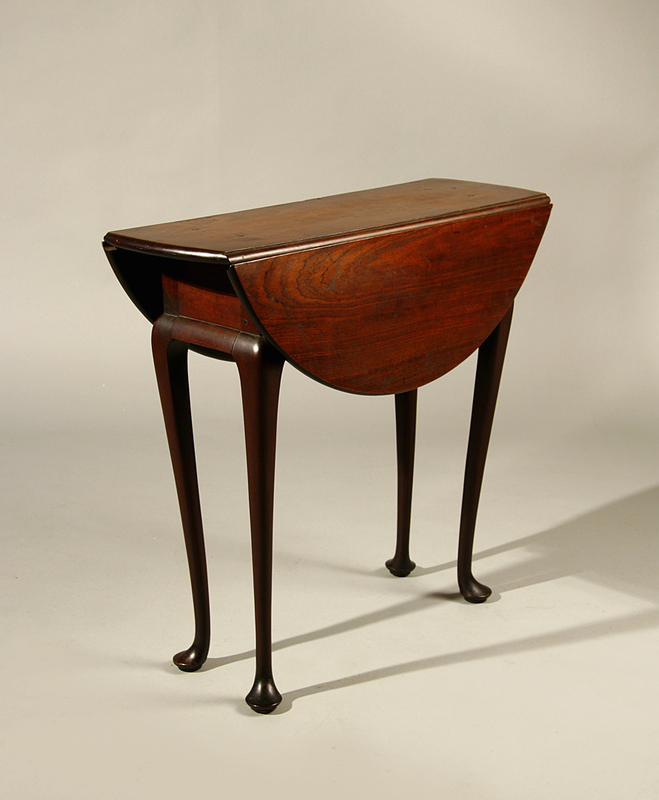 It is the only one piece desk with full-length cabriole legs that I have seen. 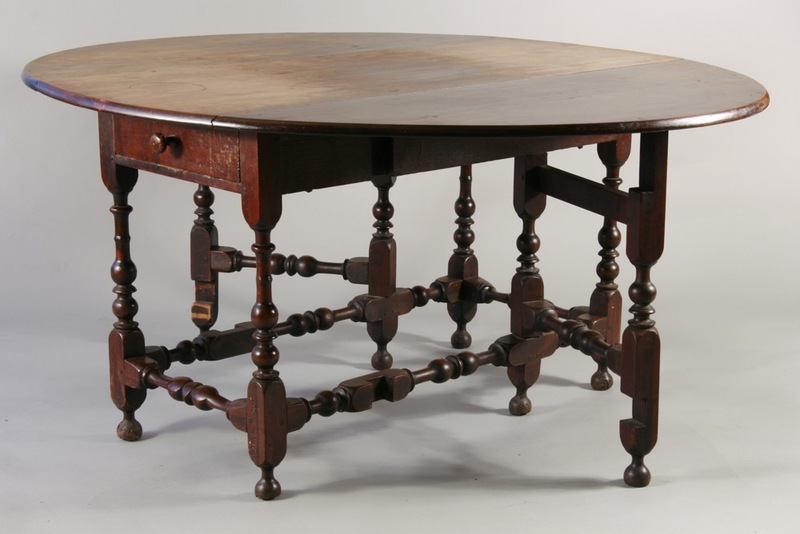 An exceptionally rare William and Mary tavern table from Rhode Island, or possibly the south shore of MA, c,1720-35. Maple, with a scrubbed pine top. Great turnings with much of the feet remaining. In old red paint over an original gray/blue. The front edge of the top was restored in the early 19th century. From the Beane family of Duxbury and Kingston, MA. 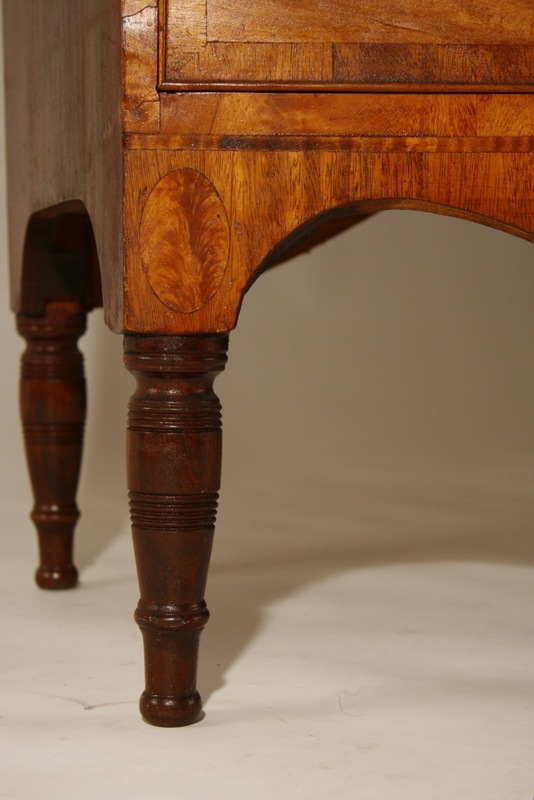 I have seen perhaps only two other tables with turnings of this type and quality in nearly 40 years--neither had the old surface or feet of this example. Top 25 1/4" x 42 3/4", 26" ht. A rare, if not unique, small Hepplewhite server with a concave front, linen and silverware drawers, and a pull-out serving board. 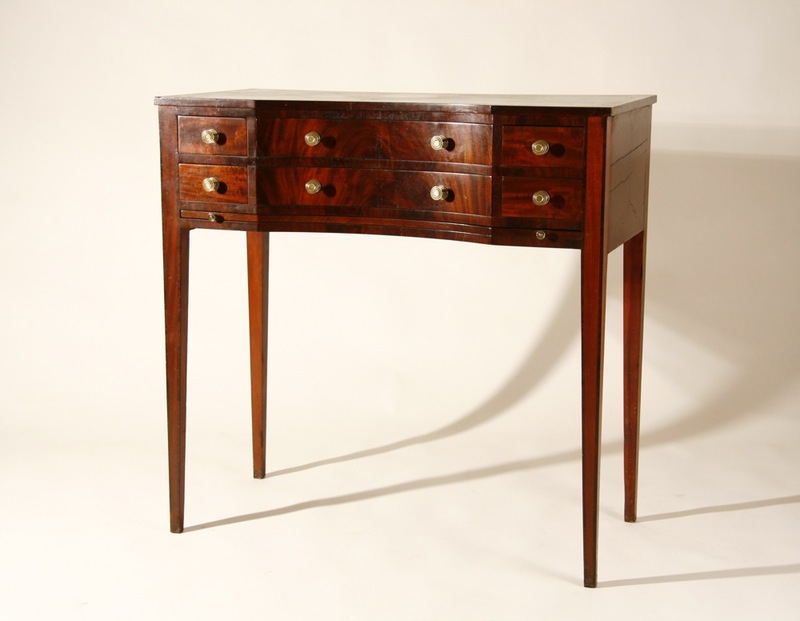 Made of cherry, with mahogany-veneered drawer fronts and inlaid mahogany panels on the legs- all in a fine old surface. The secondary wood is poplar and the quality of the dovetailing is first rate. C. 1810-15. This is the smallest server that I have seen and the only one with a concave front. Clearly a 'special order', this server is only 35 3/4" wide. The top is offset to the rear so that it could be flush with a wall and still accomodate a baseboard. Reportedly from the Cloud Hills Victorian Museum in RI, where it had been since the 1870's . Probably New York origin. Ht. 35 3/4". 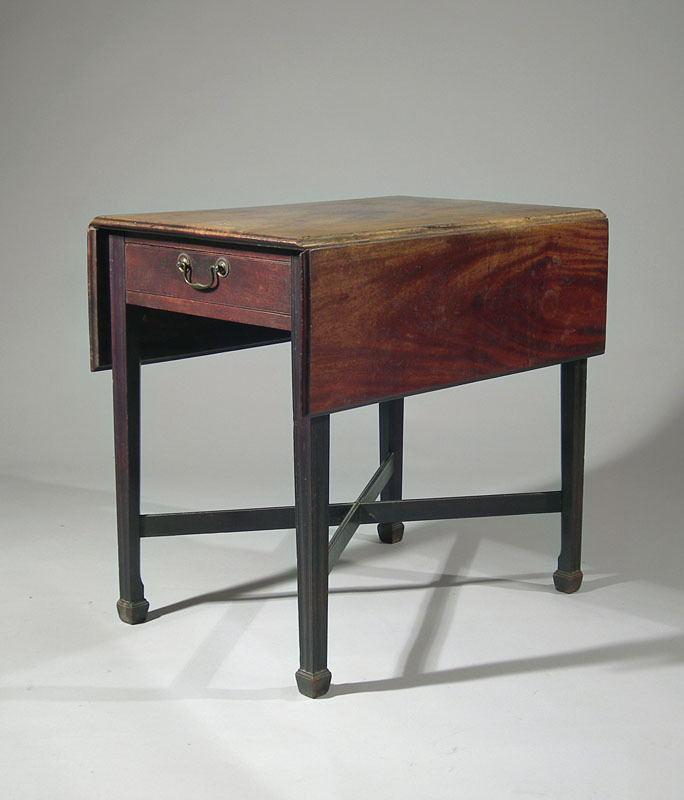 A terrific country Chippendale desk made of richly-figured tiger maple, with a fan-carved pine interior retaining its original brown stain. Oversized original brasses, the best surface, and no repair or restoration. Descended in the Cook family of southeastern MA, and probably made there, c.1785. 36 1/4" wide, 29 1/2" writing ht. 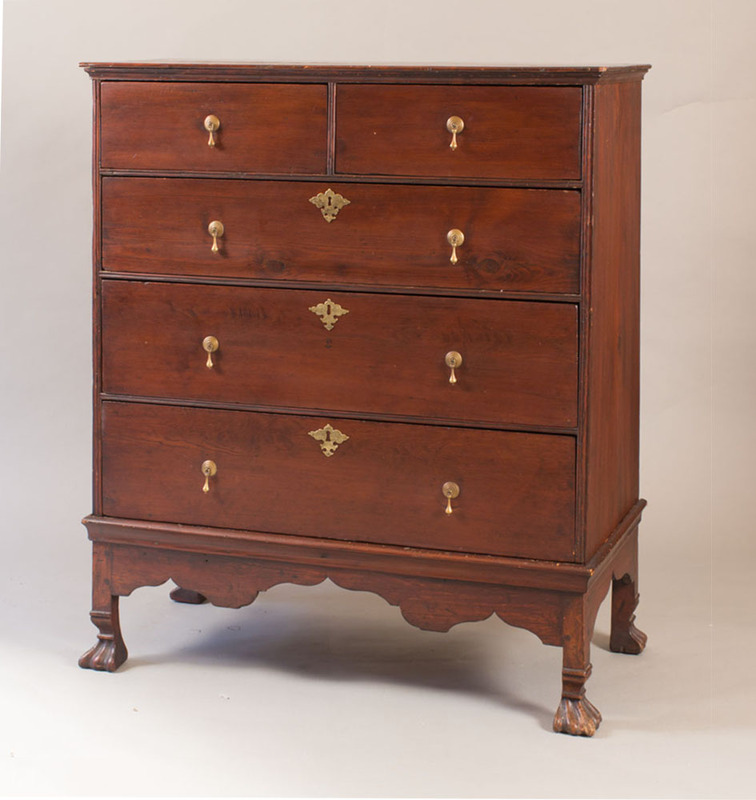 A fine and rare country Queen Anne chest on frame with bold cornice molding, drawers in both the top and frame, triple-arcaded skirt over slender cabriole legs ending in pad feet. 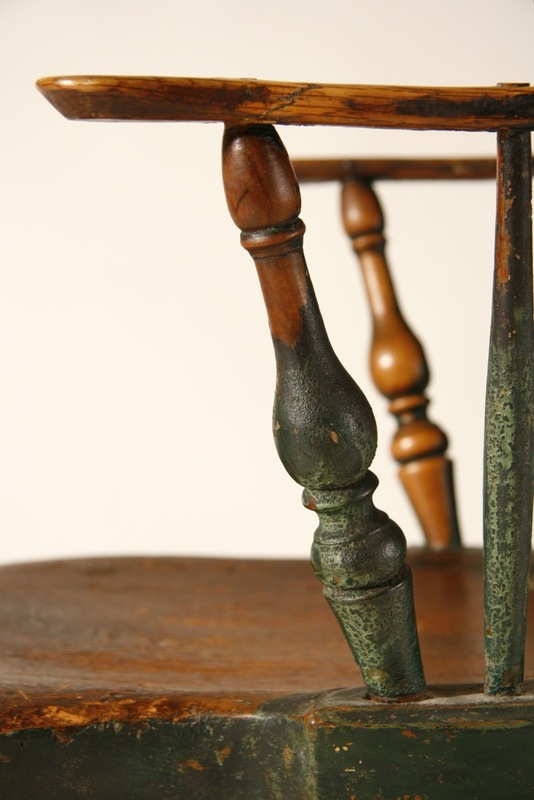 In perfect structural condition-retaining its original brasses, finial drops, and an old brown paint/stain under a later coat of shellac or varnish. Made of maple, with chestnut secondary wood. South Shore, MA origin, c.1750-70. Top case 35 1/2", ht. 59". 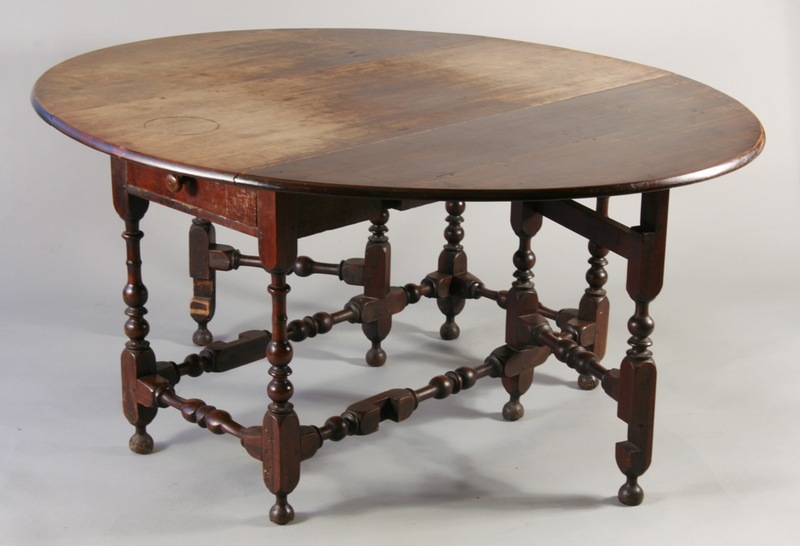 An exceptional country Queen Anne tea table with elaborately-shaped tilting top, urn-carved shaft, and ridged cabriole legs ending in pad feet. Cherry throughout, in original red paint. CT River Valley, c.1790-1800. 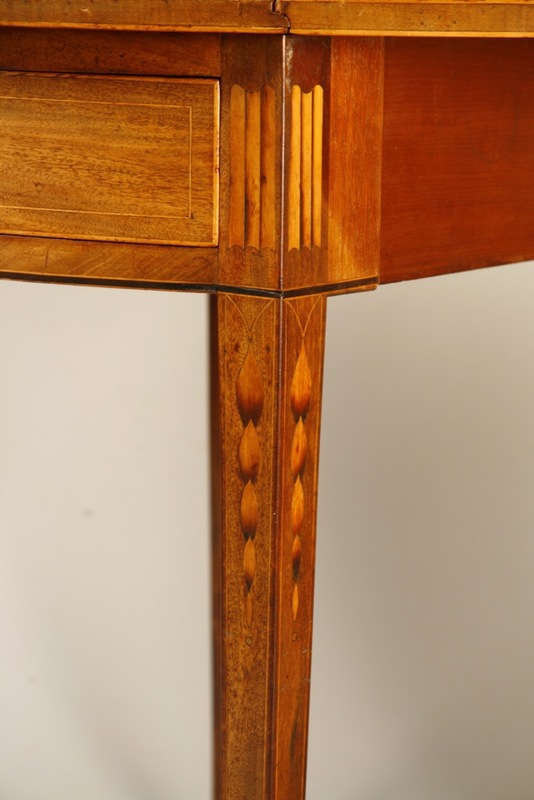 Note construction of top: the cabinet maker joined three 11" cherry boards with shaped cleats at their ends, then shaped the boards to complete the design. 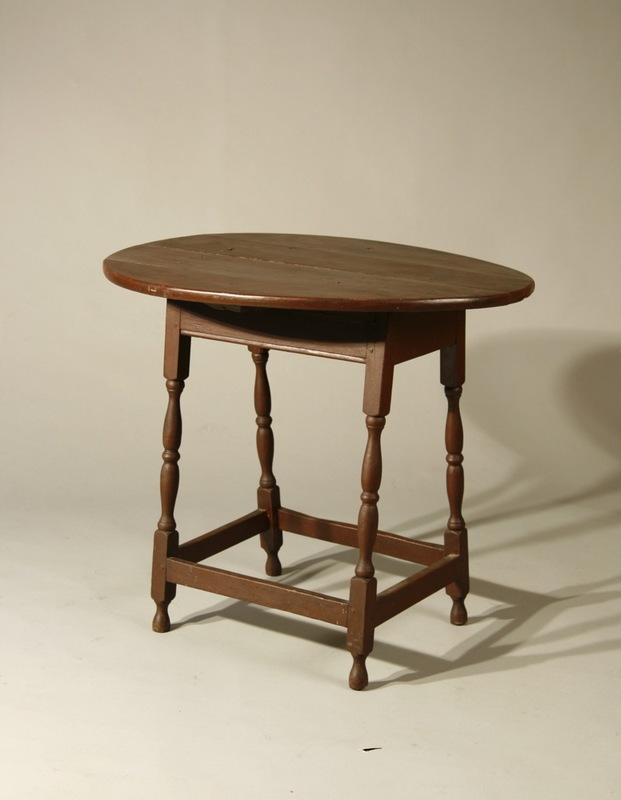 A terrific country table with great surface quality. 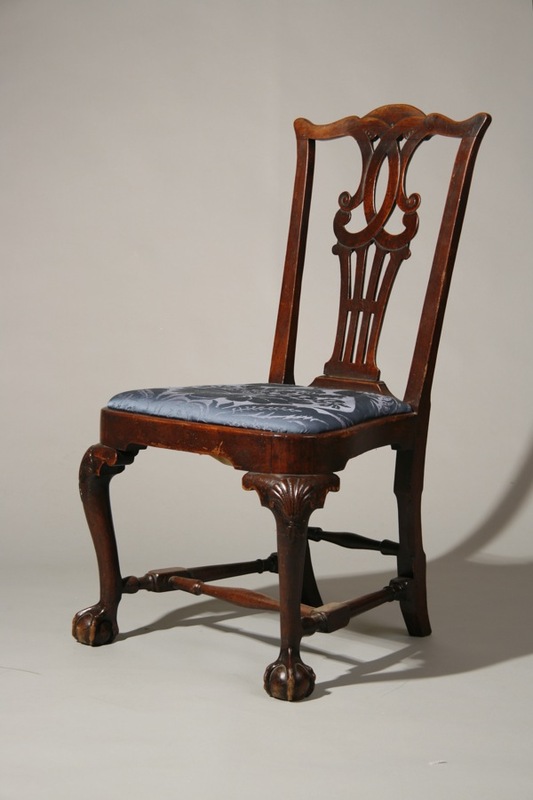 A rural example of a classic Chippendale sidechair. 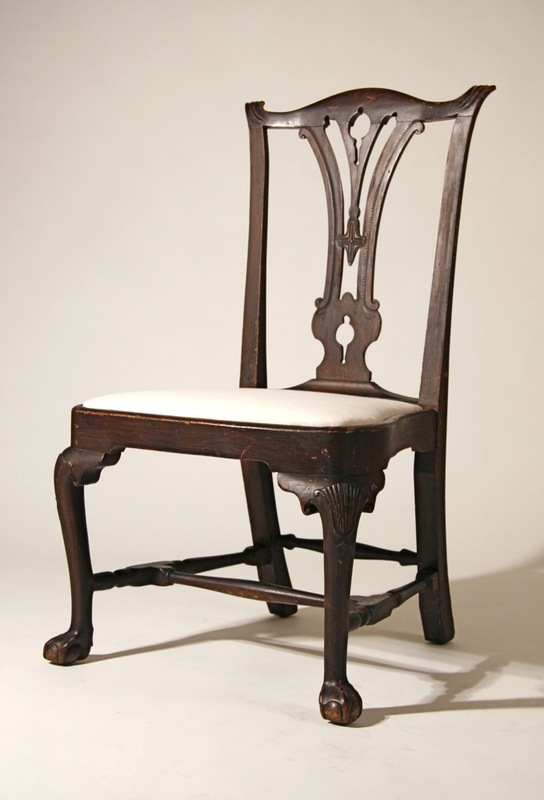 Made of birch, then grain-painted to simulate rosewood, with slightly-elongated carved ears at the ends of the serpentined crest rail, shallow notched carving to the pierced splat, a 'balloon' seat with slightly flattened corners, deeply-pierced knee returns, fully-developed shell-carved knees with fleur-de-lis below the shells, and deeply-webbed ball and claw feet- which project almost horizontally from the ankles. Clearly made by a skilled craftsman, but embellished with his own sense of aesthetics. North or South Shore of MA, c.1770-80. The slip seat and one knee return have been restored. Ht. 37", seat ht. 17". 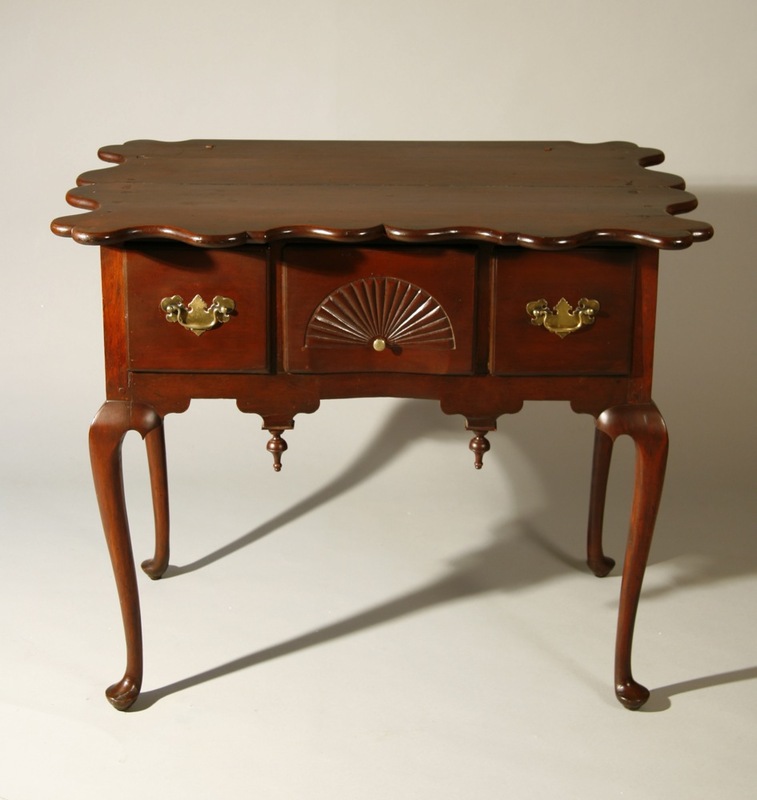 A very fine Sheraton chest with 'cookie-cornered' top and turned and reeded legs. 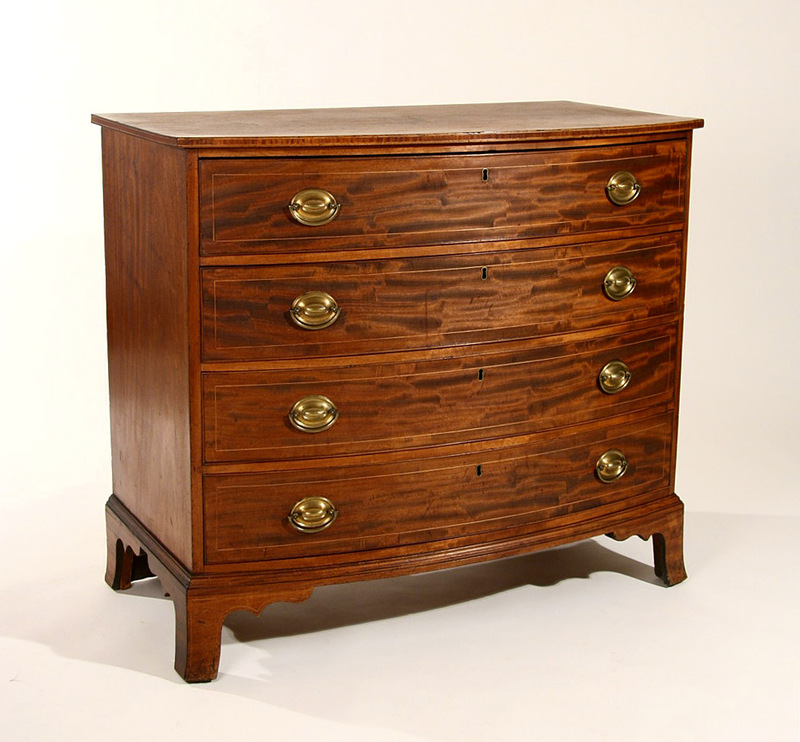 Mahogany, with mahogany veneered top and sides; the drawers are veneered with a swirled grain mahogany, crossbanded with flame birch and with flame birch escutheons. There is intricate inlay around the edge of the top and at the base of the case. Particularly noteworthy is the overall feeling of delicacy created by the diameter of the turned legs and the high lift to the skirt. From a house in North Hampton, NH, but probably Boston area, c.1790-1800. Case 40 1/2", 41" ht. As fine a 'pair' of Hepplewhite card tables as I have seen. Beautifully-proportioned and designed, skillfully-made, and with the best paneled and curly-satinwood inlaid facade. 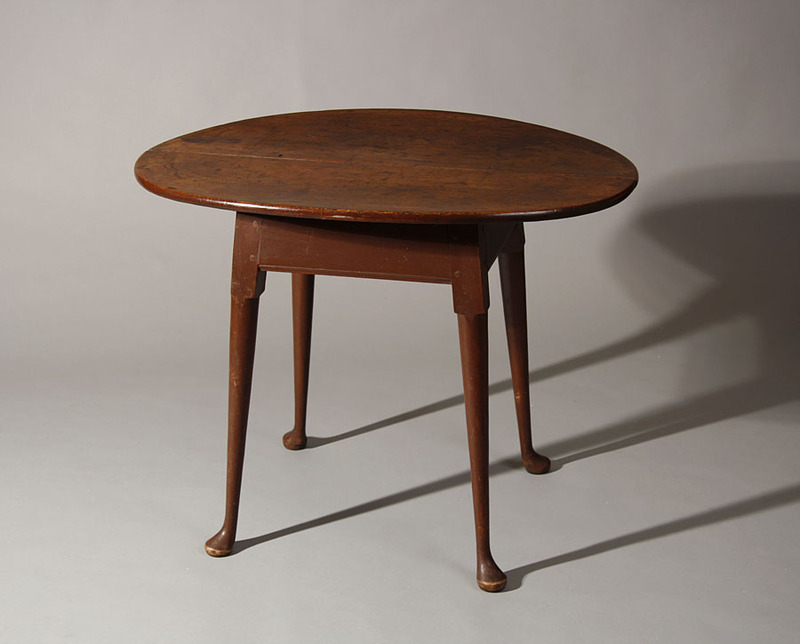 These tables were purchased together in the 1960's and have been in the same New Hampshire collection since that time. Boston, or perhaps Salem, c.1790. 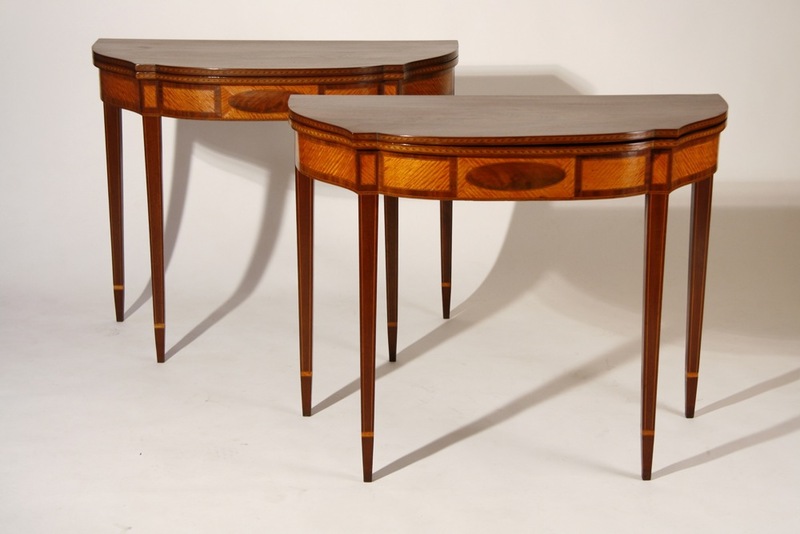 There are subtle differences in the tables, but the veneers used and the templates for the tops are identical, as are the screw pockets and unusual blocking patterns used in their construction. Clearly they originated in the same shop at the same time. A rare opportunity. 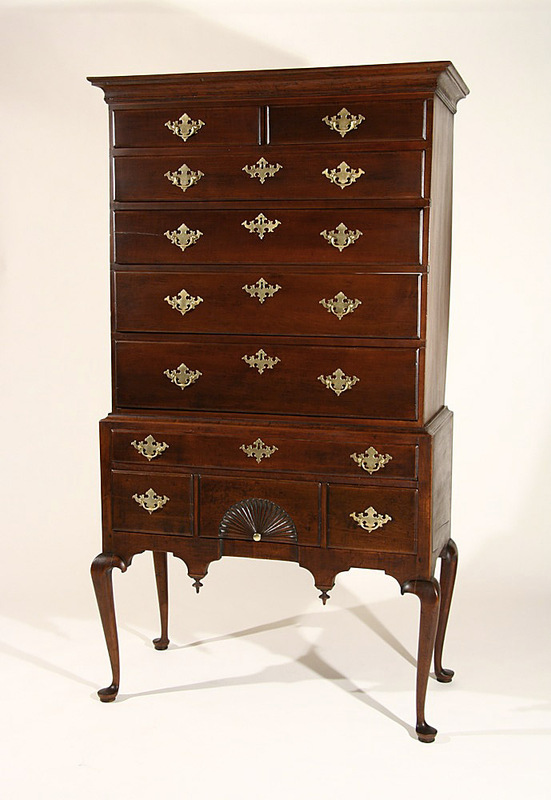 The Benedict family joined chest, south-central Connecticut, c.1690-1710. Oak, with pine and poplar secondary woods--and in original structural condition, retaining its first coat of thin salmon paint with black-painted incised moldings. Found in a Benedict shed in Ridgefield, CT in 1972 and held in two collections since that time. 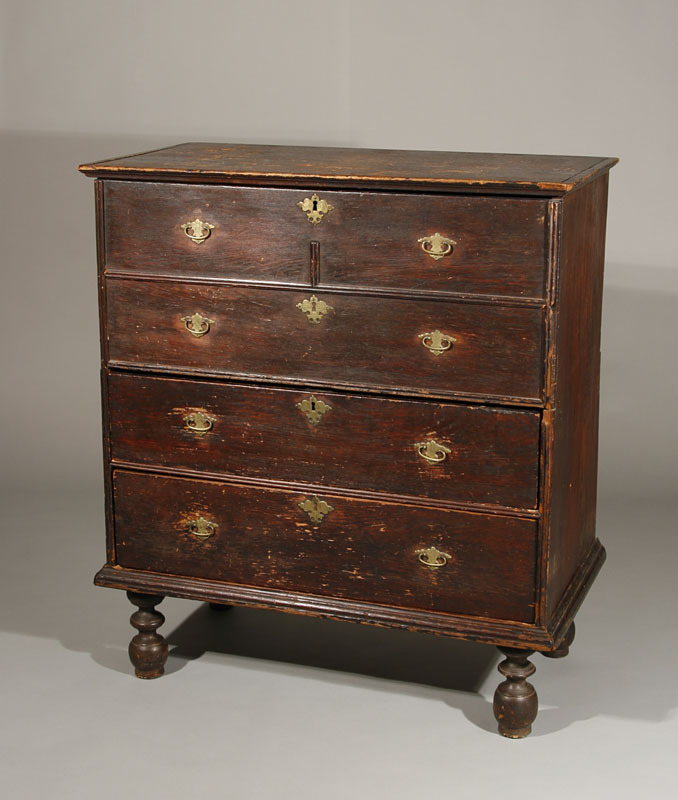 A rare opportunity to acquire a first period chest with undisturbed original surface. Case 51 1/2", ht. 32". 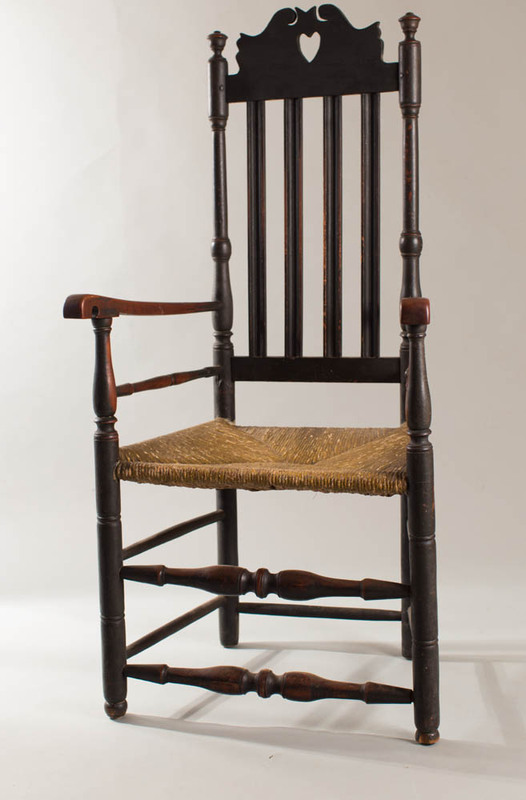 A classic transitional (William and Mary/Queen Anne) sidechair. 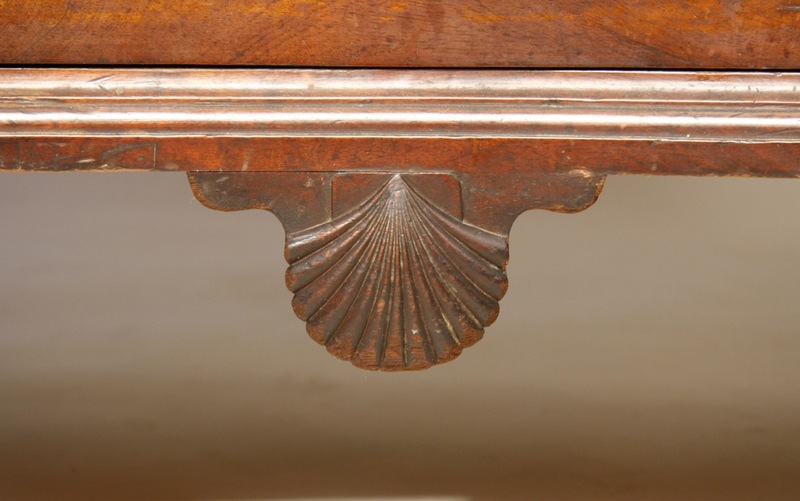 With an exceptionally well-shaped and carved crest rail, slender splat, molded back, sharply-defined block and vase turned legs and tall spanish feet, this is a 'best' of the form. In original Spanish brown paint, with no repair or restoration. 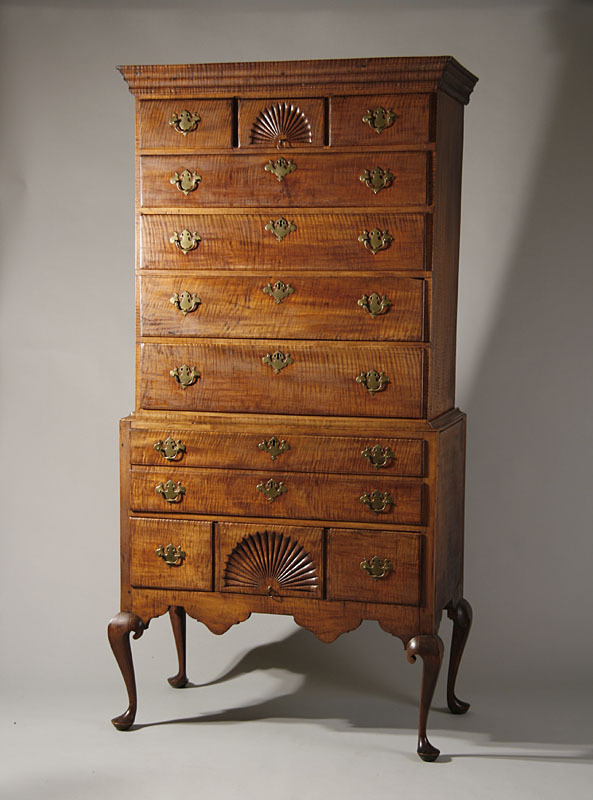 Maple and ash, North Shore, MA, c.1740-50. From a collection formed in the 1950's in Connecticut. 41 1/2" ht., 17 1/2" seat ht. 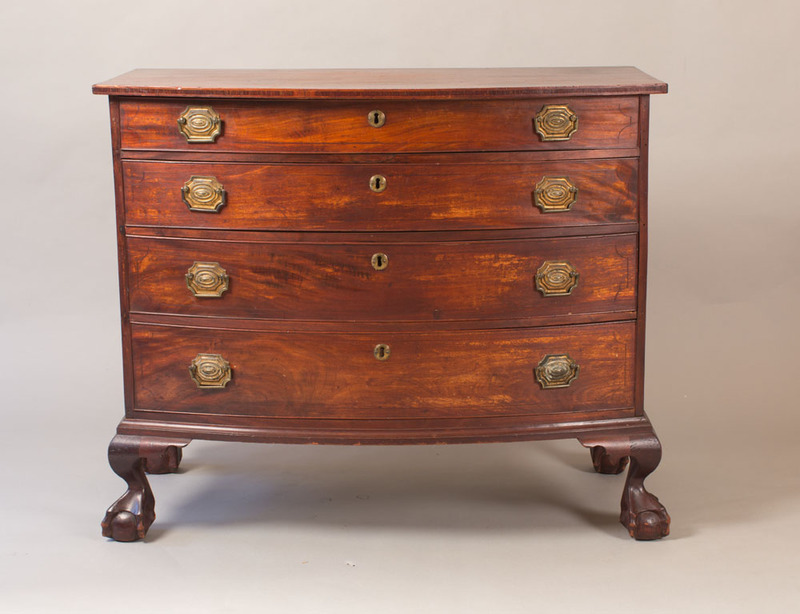 A very fine country Queen Anne chest on frame with deep crown molding, split top drawer, deeply scrolled skirt, and with turned legs ending in pad feet. Made of densely-grained maple-with a rich old surface, and retaining its original brasses. C. 1750-70. 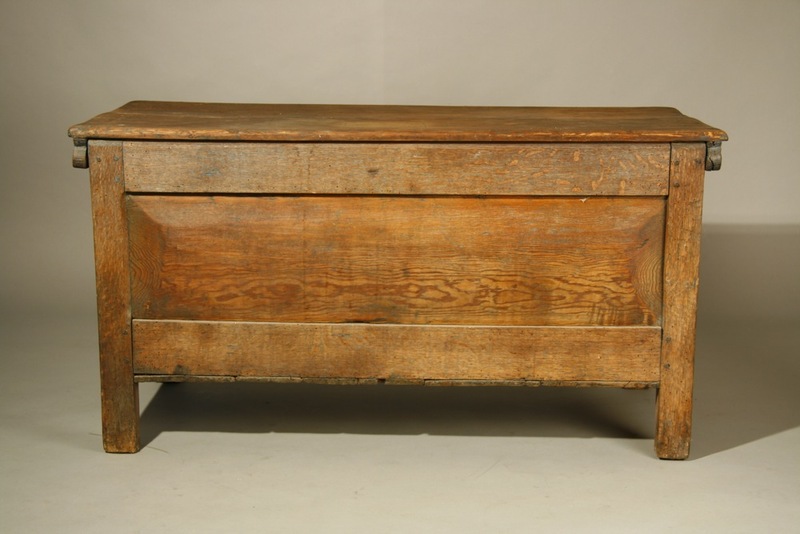 Small in scale, with great surface quality, this chest on frame was purchased directly from family descendents in central MA, and had come down through the family from the New Bedford, MA area. There is some old restoration to the top left drawer. 34" case, 60 3/4" ht. 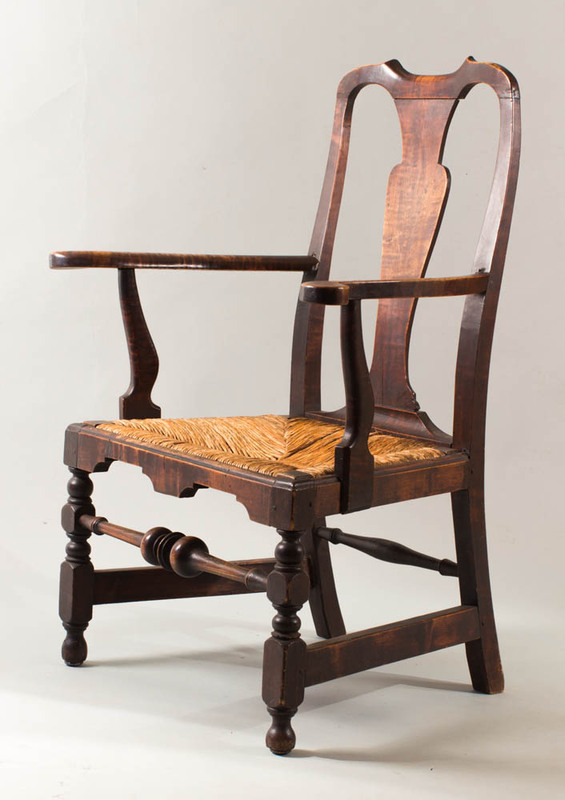 A country Queen Anne armchair with matching sidechair: the armchair with molded, scrolled and carved arms. 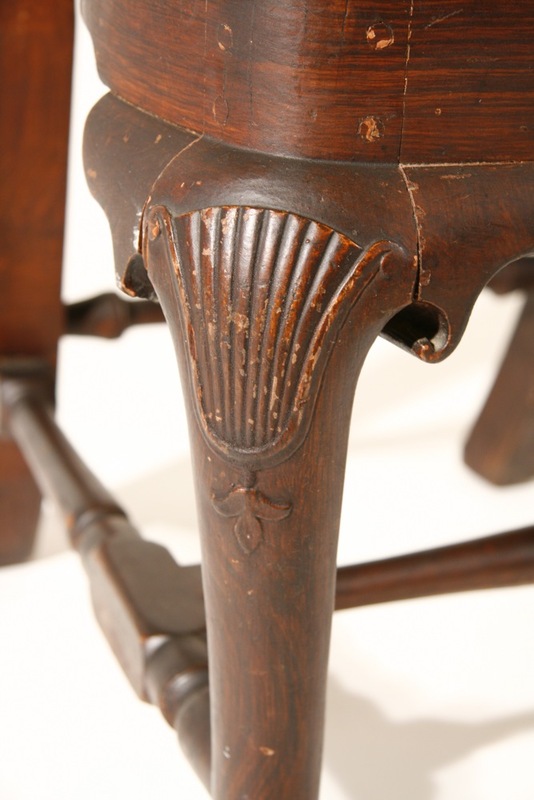 Each chair is cherry in original stained surface with peaked crest rails, unusual faceted block and vase-turned legs, and sharply-carved Spanish feet. Superb original condition. I have seen three other sidechairs, probably from the same set, but none since the late 1980's. CT origin, c.1760. Armchair 41" ht, sidechair 40" ht. 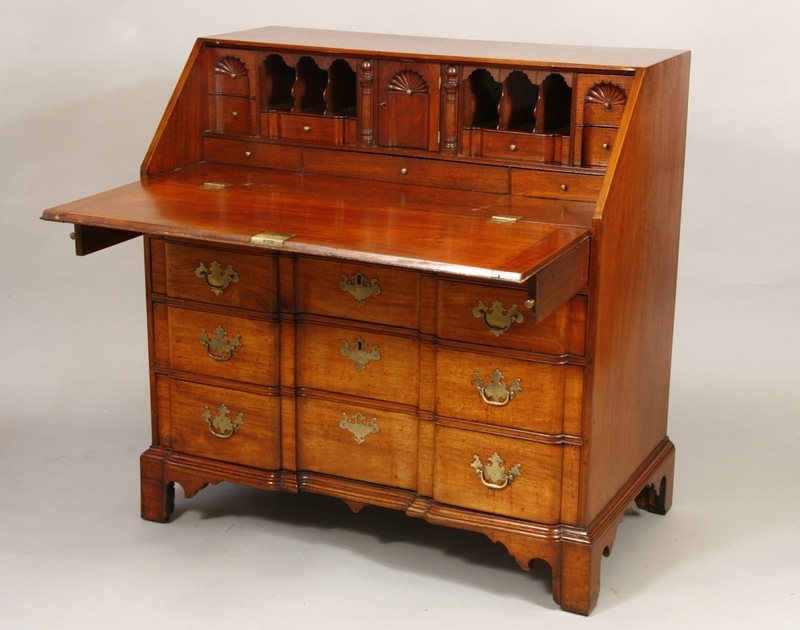 An exceptional New Hampshire Sheraton bureau with original scrolled backboard and with a scrolled skirt centered by a drop panel. Birch, with flame-birch veneered drawer fronts and drawer dividers and drop panel, and with mahogany-crossbanded drawers. Original finish and brasses. Attributed to Joseph Clark of Wolfboro, c.1815. 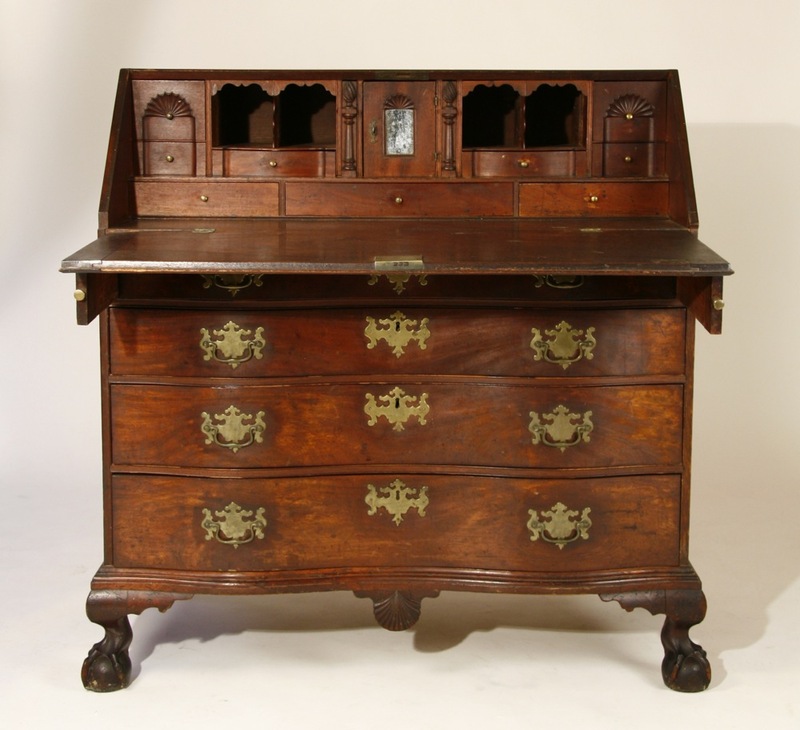 Attribution based on similar scroll board on a secretary and sideboard, and a similar chest in the Wolfboro Historical Society. 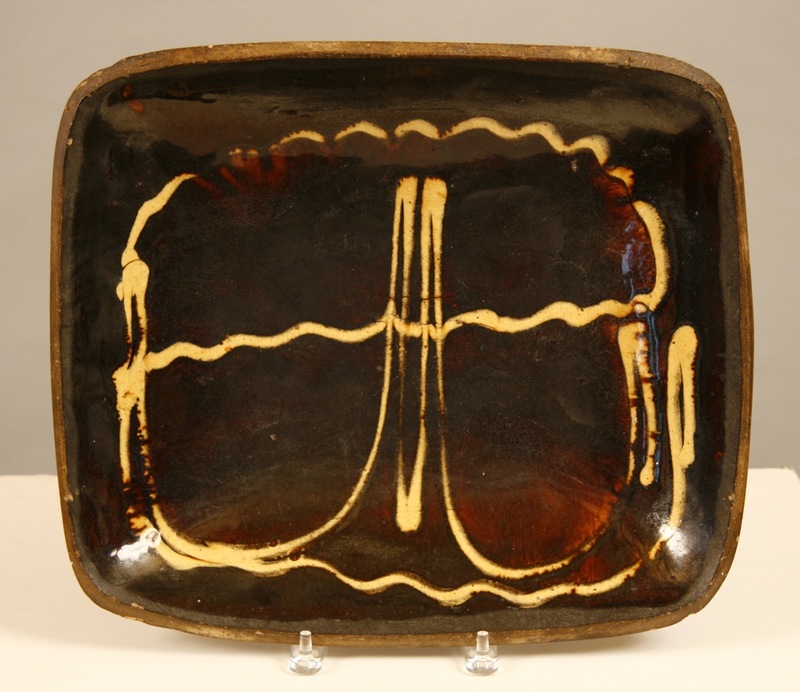 This piece was purchased in Wolfboro from descendents of the original owners. Minor repair to veneer at base. 38" width, 43" ht. 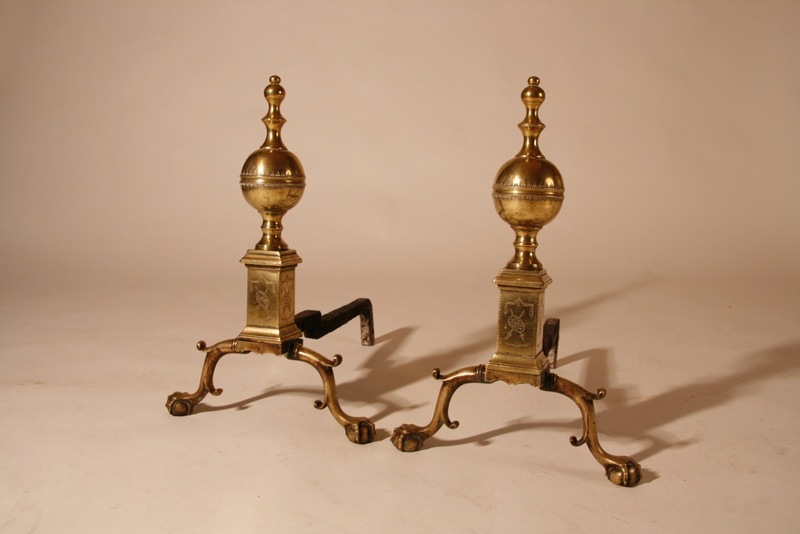 A very rare pair of Chippendale andirons with double-spurred cabriole legs ending in well-defined ball and claw feet, square plinths with scrolled bases under boldly-turned double ball tops. The edges of the bands on the ball are embellished with raised balls, and there are three bands of engraving on the balls as well. The squared plinths are notched on the edges and engraved on three sides with a family crest. New York or Philadelphia, c. 1790. 21" ht, 20" deep. 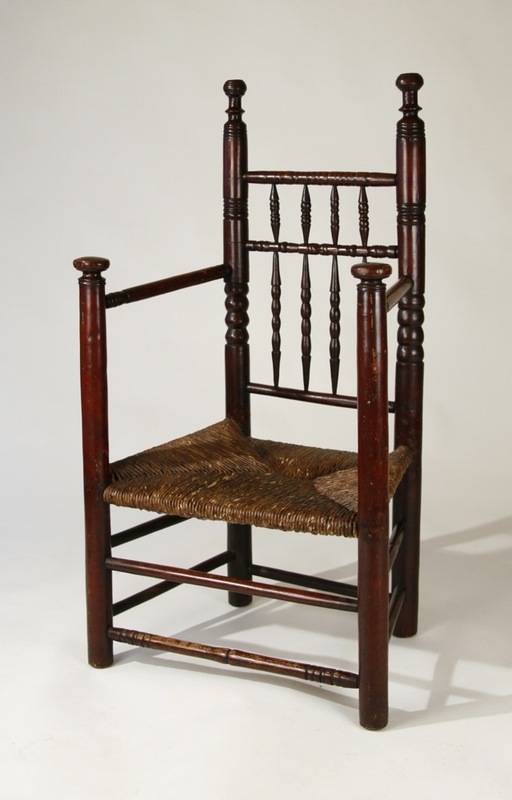 A fine and rare 'crook'd back' chair with scrolled and arched crest. 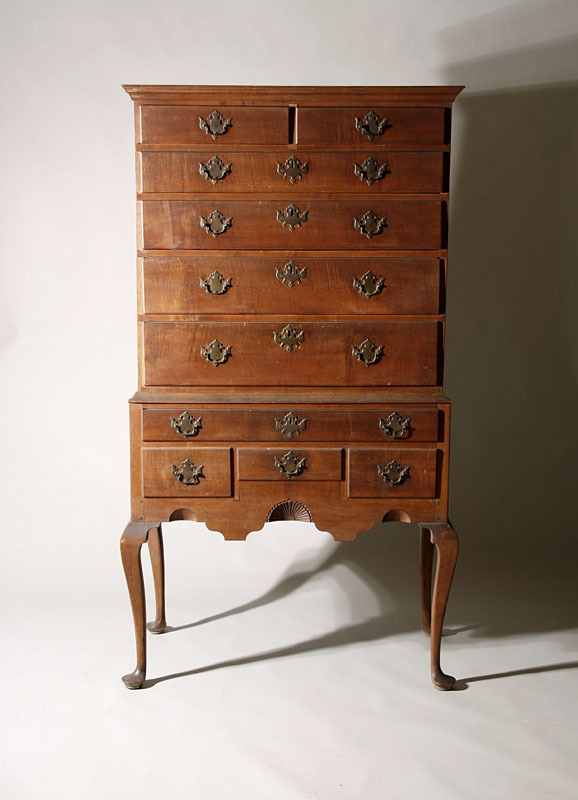 Made of maple, with oak secondary in Boston, c.1720-35. 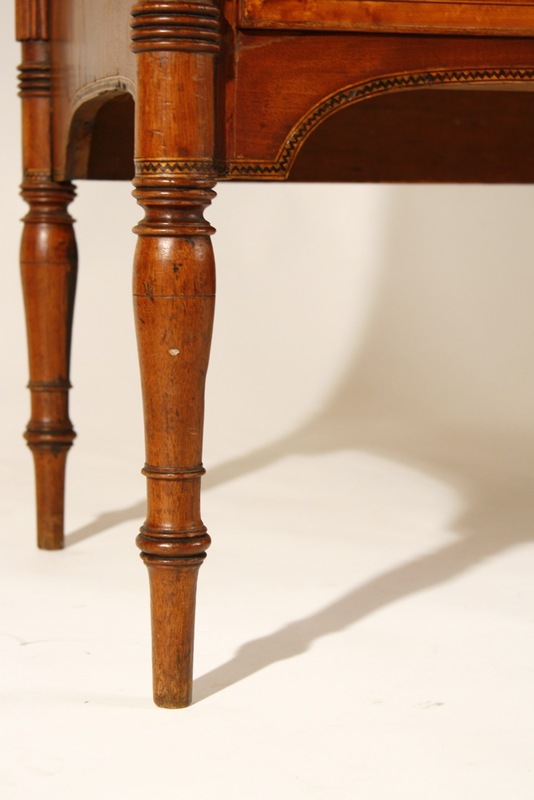 This example is in near perfect original condition, with particularly fine turnings, and retains its original red paint under a later varnish. 441/2" ht, 17 1/2" seat ht. 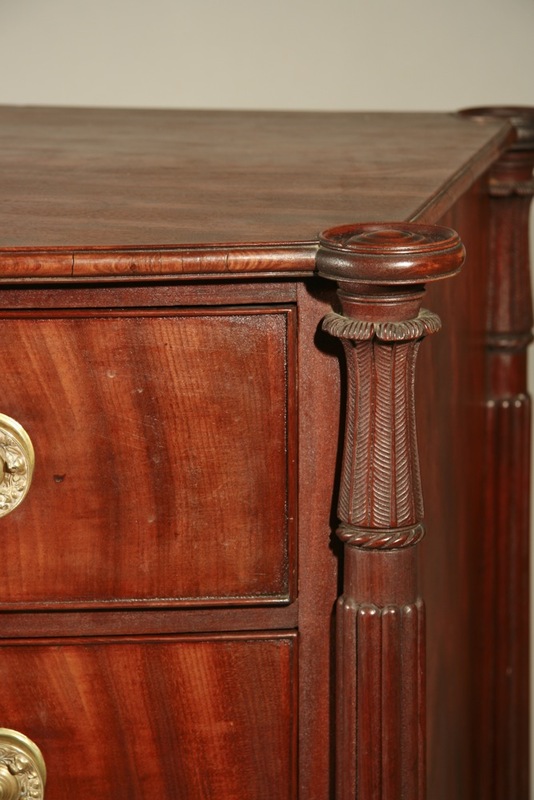 A Chippendale mahogany serpentined front four drawer chest with deeply-molded top, graduated drawers, and large ball and claw feet. 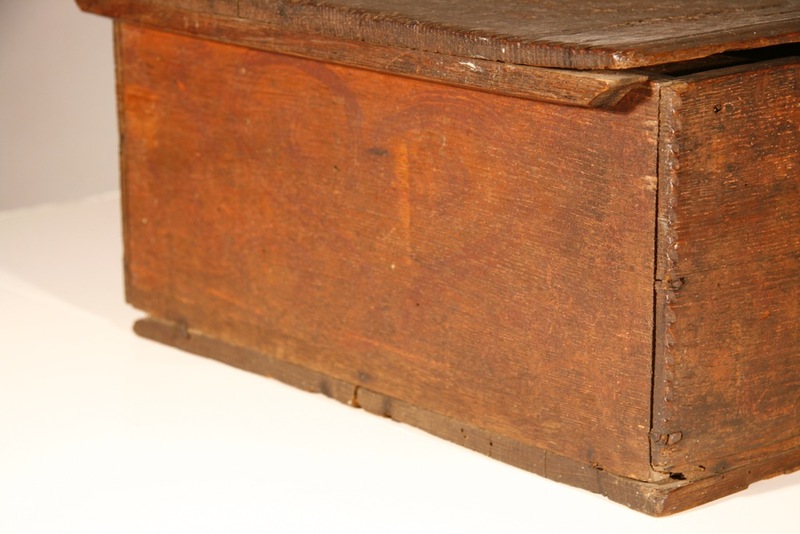 This chest retains all of its original glue blocks, its original brass handles, and-remarkably-its original surface. Purchased after a 15 year courtship from a home on the North Shore. 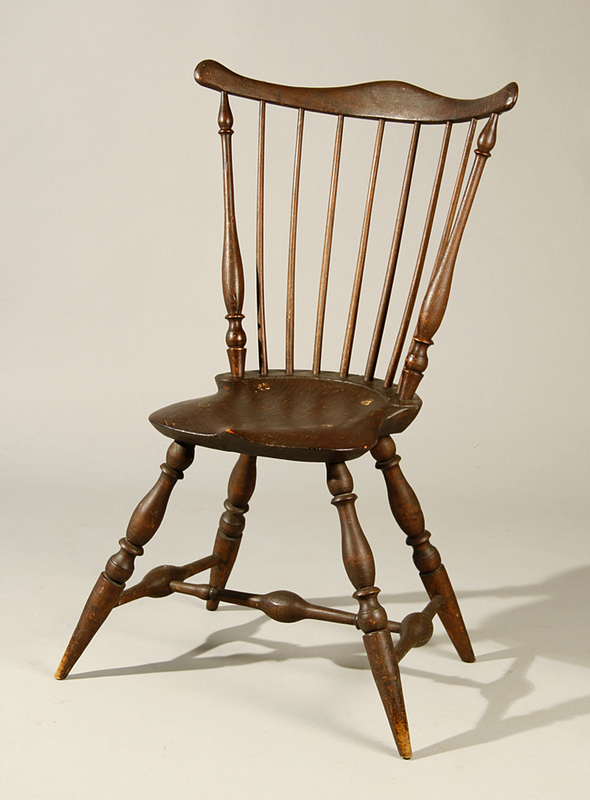 Probably North Shore, but possibly Portsmouth area (note forward-facing rear feet), c.1785-1800. 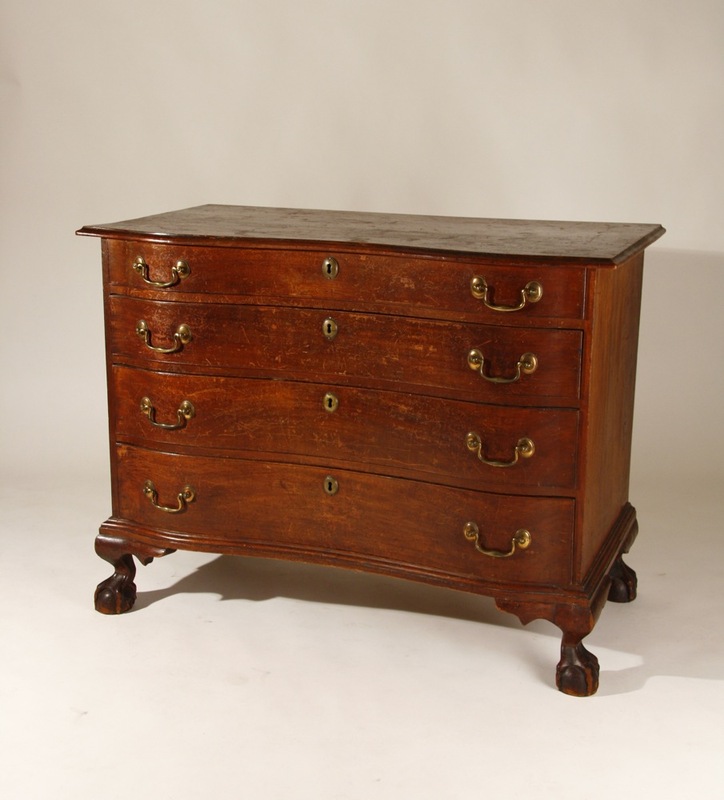 Formal chests in this 'as found' condition are very rare finds. Case 40", ht. 33". 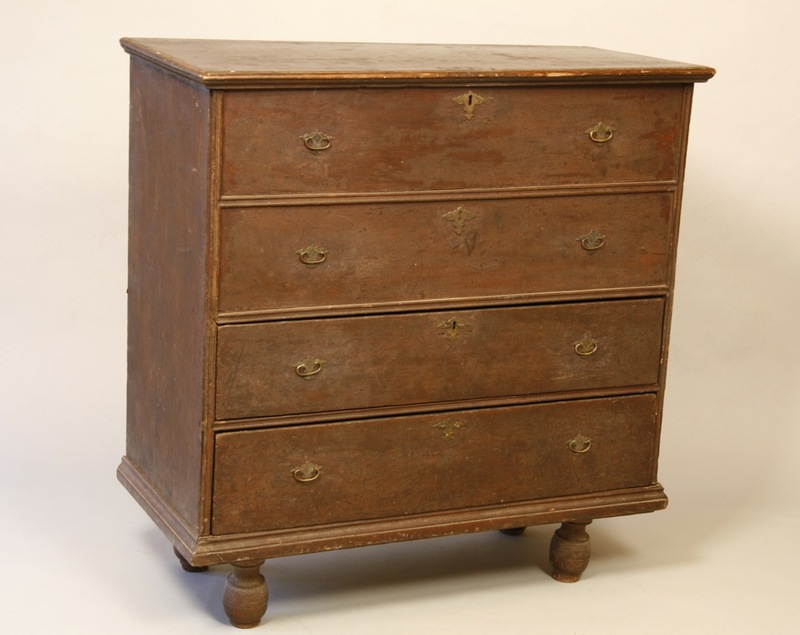 A rare and very fine Dunlap chest on frame. 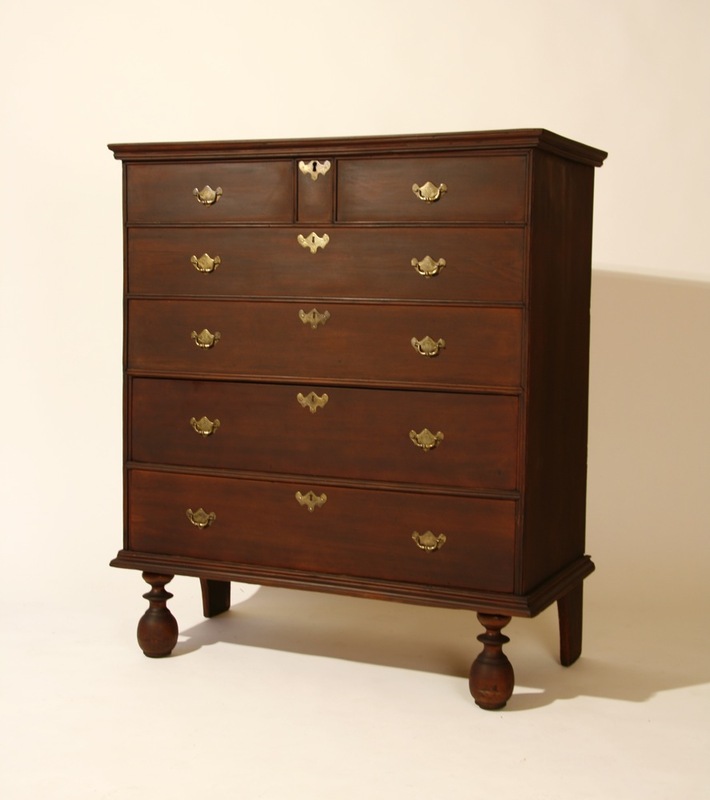 Beautifully proportioned, with tray top, small center drawer, and graduated drawers in upper case. 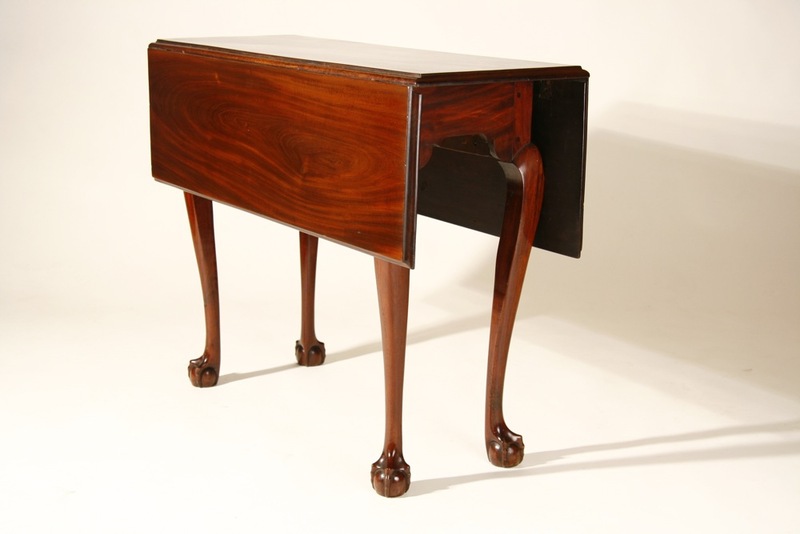 The frame has a classic Dunlap skirt, and the legs and feet are exceptional. Maple, in a dry surface-the remains of the original. Descended directly in the Thorp family of South Weare, NH until 1996. Case width 36 1/4", ht. 60 1/4". A fine William and Mary blanket chest in great old red/brown paint-- retaining its original hinges, lock, etched brasses, and single arch molding. 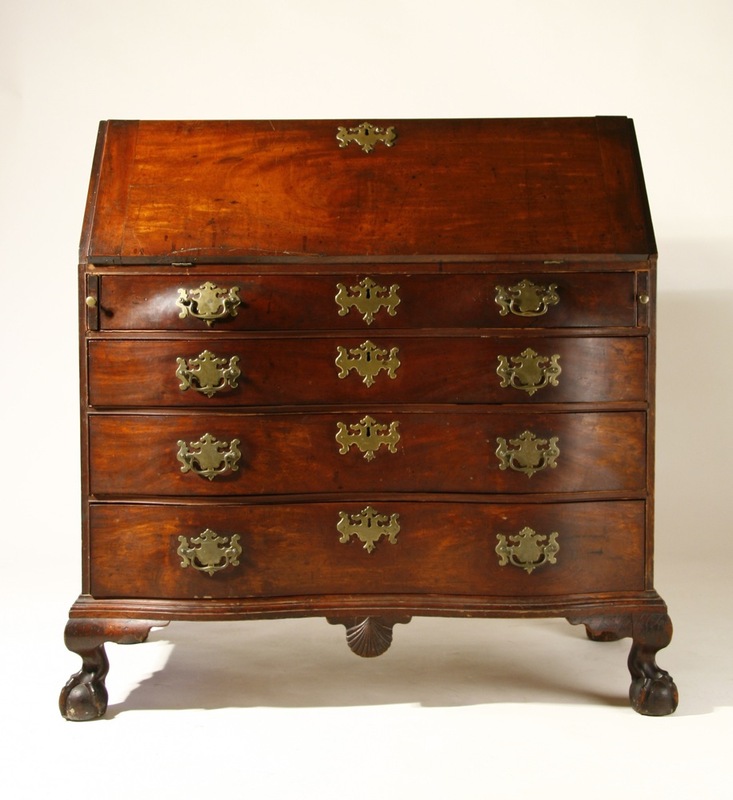 Amazing condition for a chest that is 275 years old! Case 41 1/2", ht. 31 1/2". 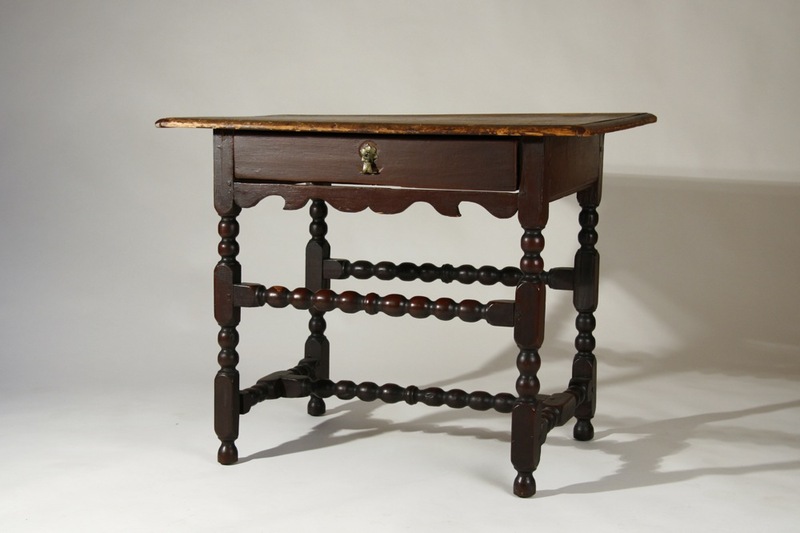 A fine shoe-foot hutch table in a rare small size. 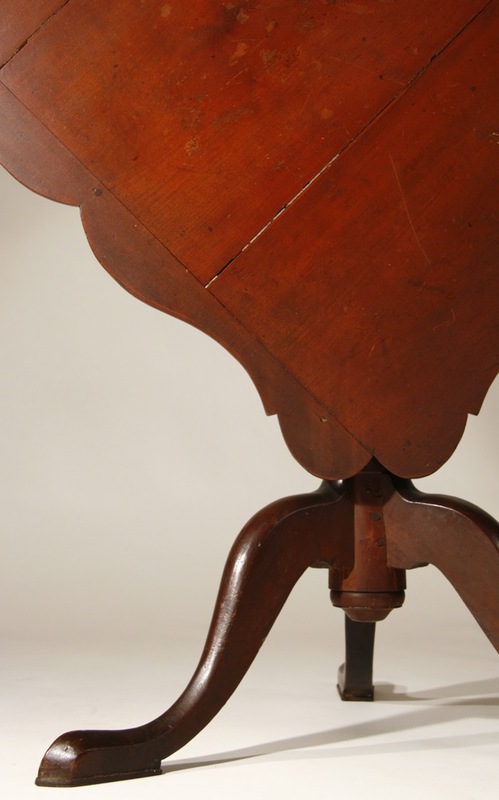 Two board oval top above open well with scalloped lower border, hourglass-shaped sides, stepped shoe feet. 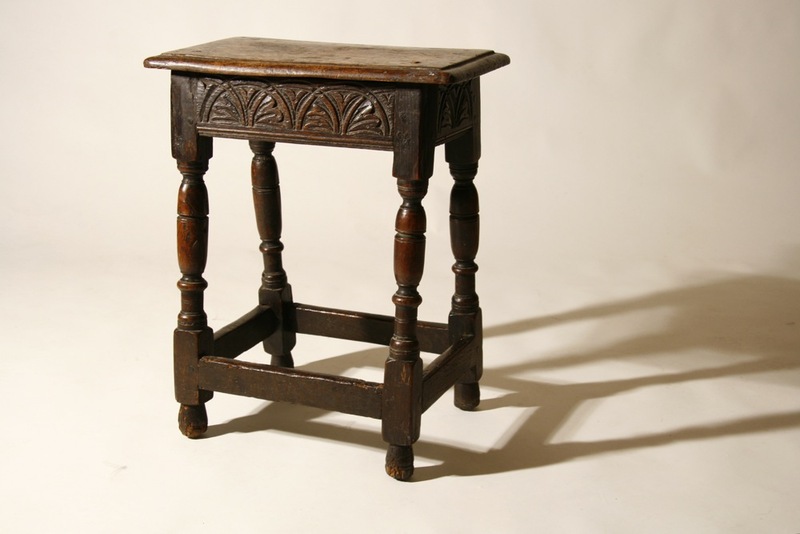 Pine, with oak feet; in an old red painted surface (later coat of shellac removed). Minor repair to skirt, water damage to bottoms of feet. Probably Hudson River Valley, third quarter 18th century. Top 32" x 43 1/2", ht. 26". 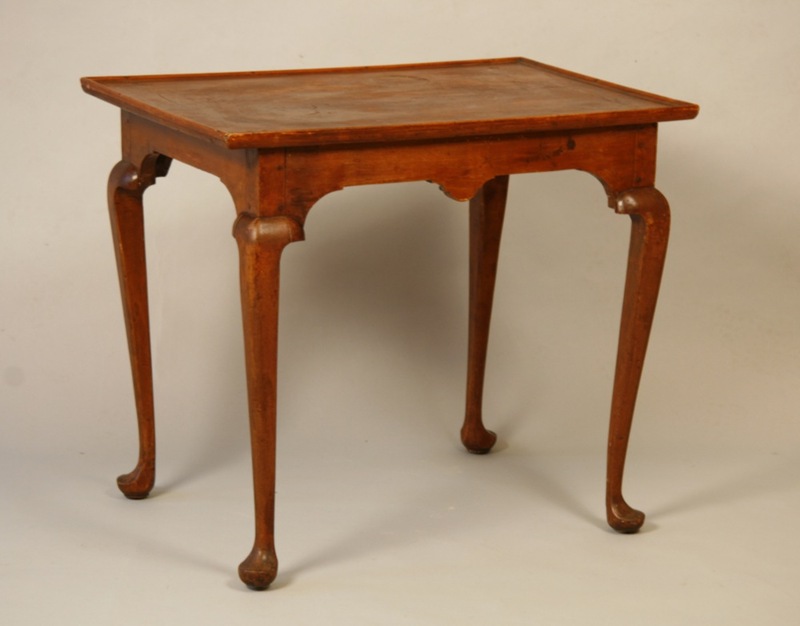 A very rare Chippendale drop leaf breakfast table with a molded-edge top, shaped skirt, cabriole legs, and full ball and claw feet. Made of choice quality mahogany- all three pieces cut from the same board, with pine secondary wood, it retains all of its glue blocks-each secured witha rose-headed nail. 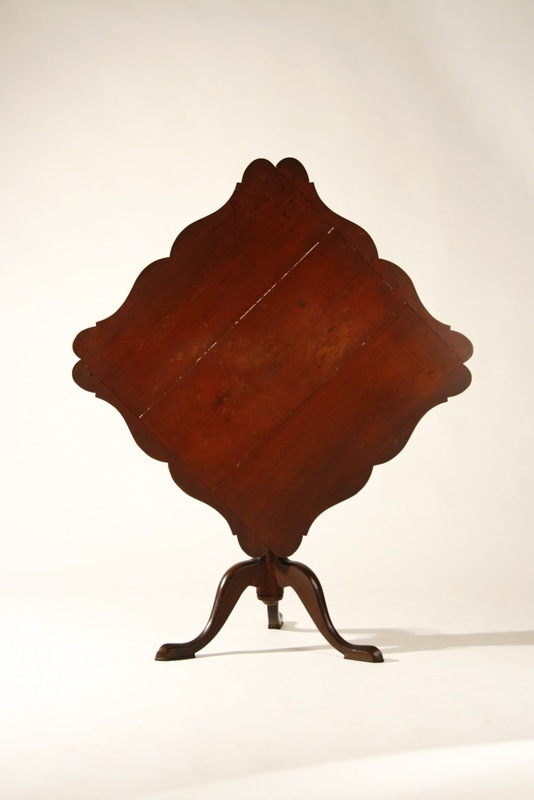 Chippendale tables in this size are very rare, and this table is pictured in Sack, vol. II (1968), p. 561. North Shore or Portsmouth area, c. 1770-80. Top 34 1/4" x 33", ht.26 1/2".